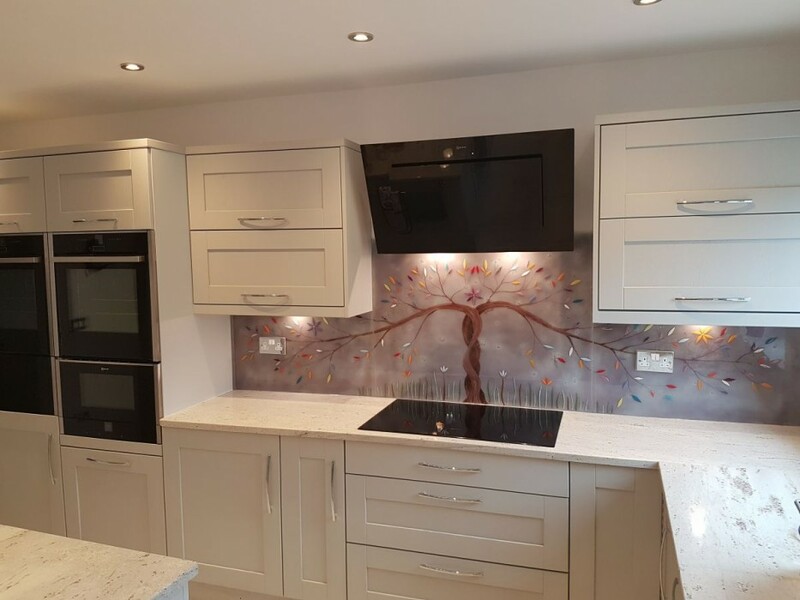 We’re well into 2018 now, and although we’re not sure just where all that time went, we’re confident that the kitchen splashback is still very much a trend that’s alive and well. 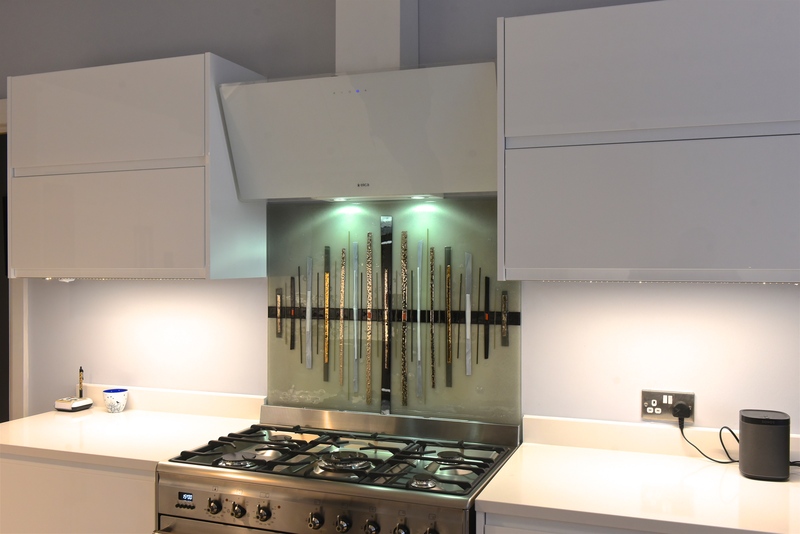 That’s great news for us, but it’s even better news for those homeowners who have yet to put something in all that all important space behind the cooker. 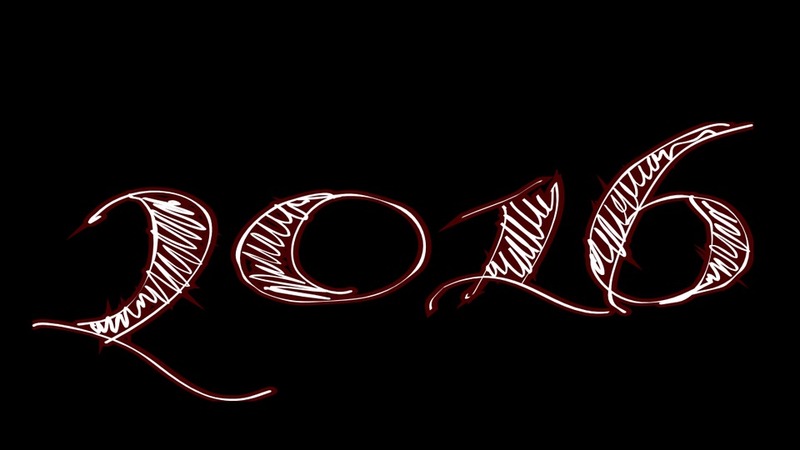 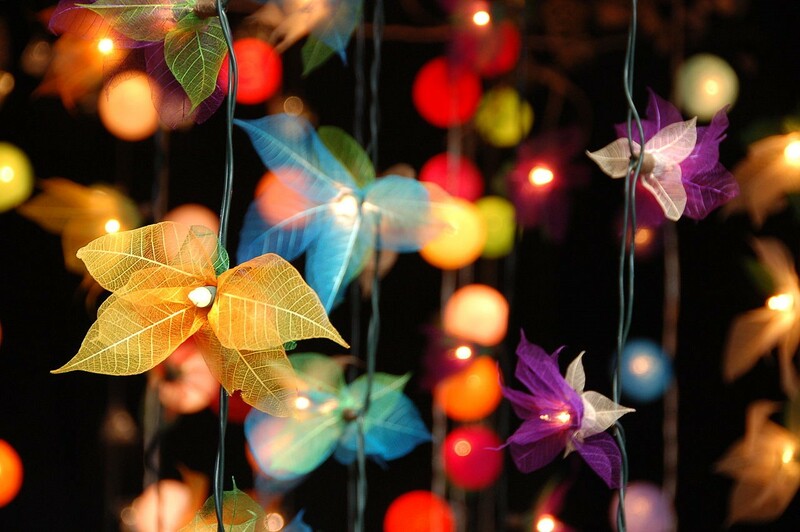 There’s an equally important choice to make, however, and it’s one that we’ve got our own thoughts about. 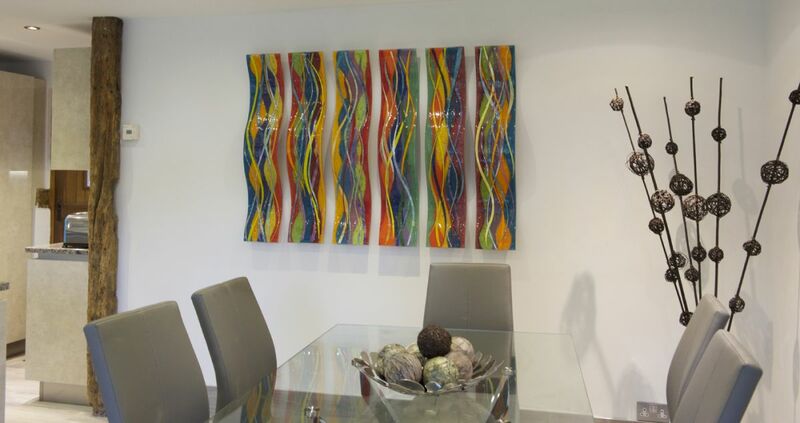 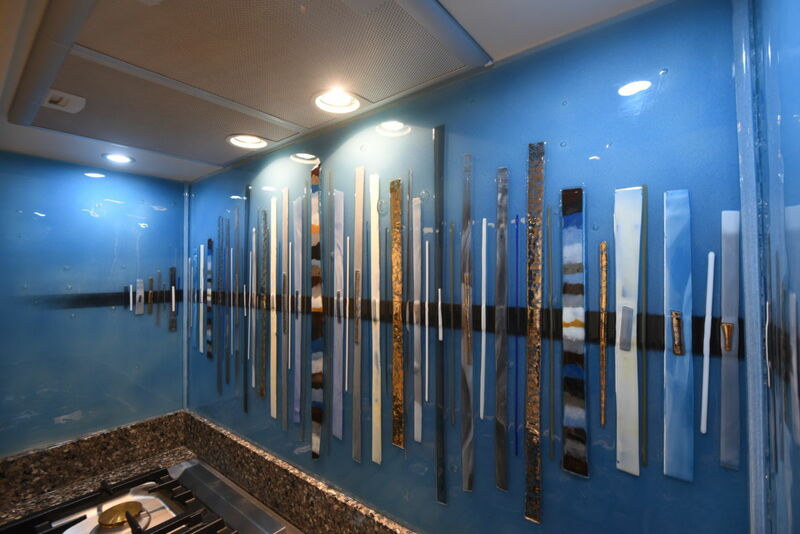 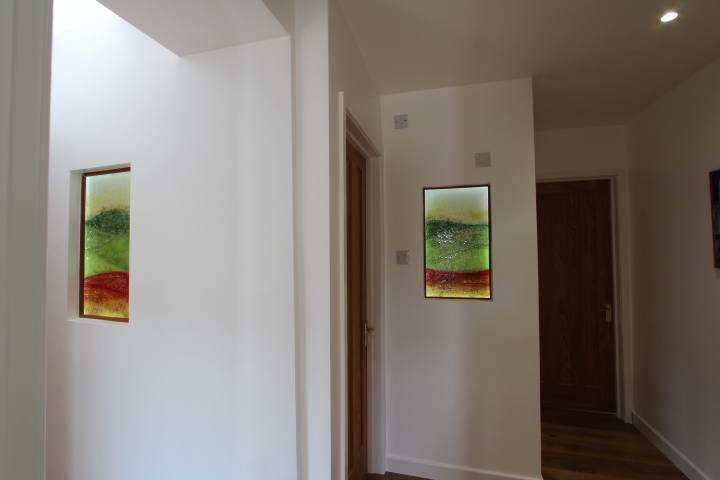 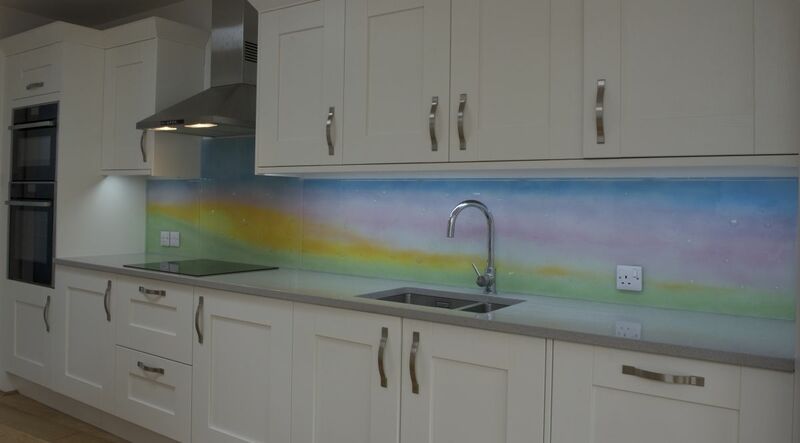 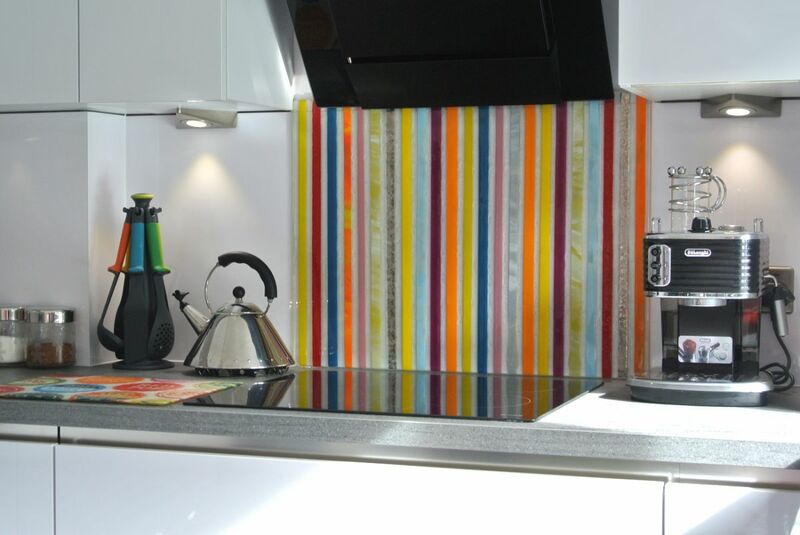 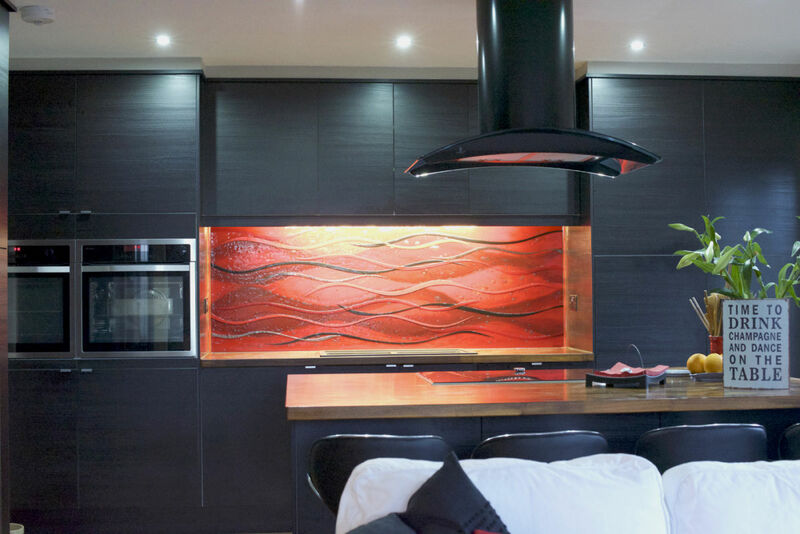 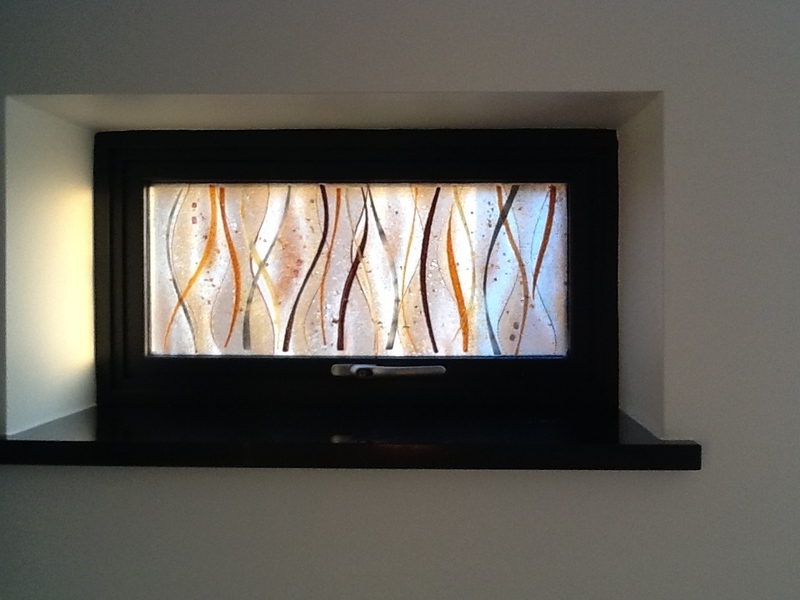 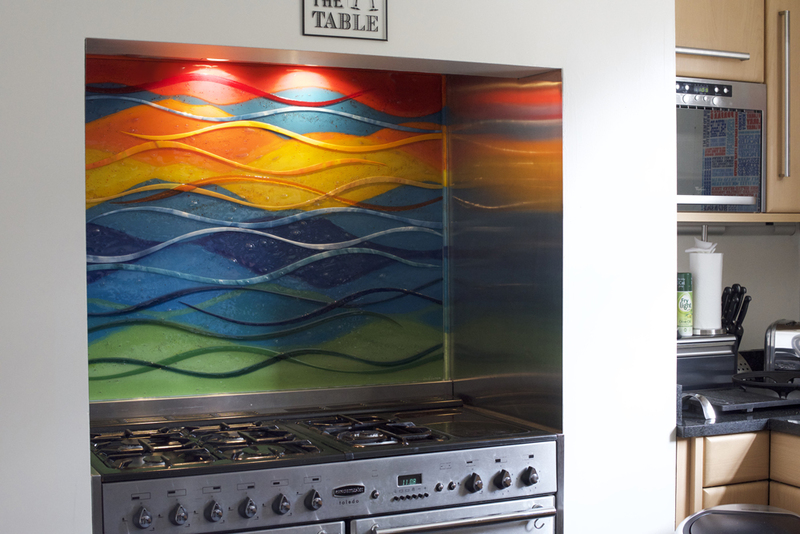 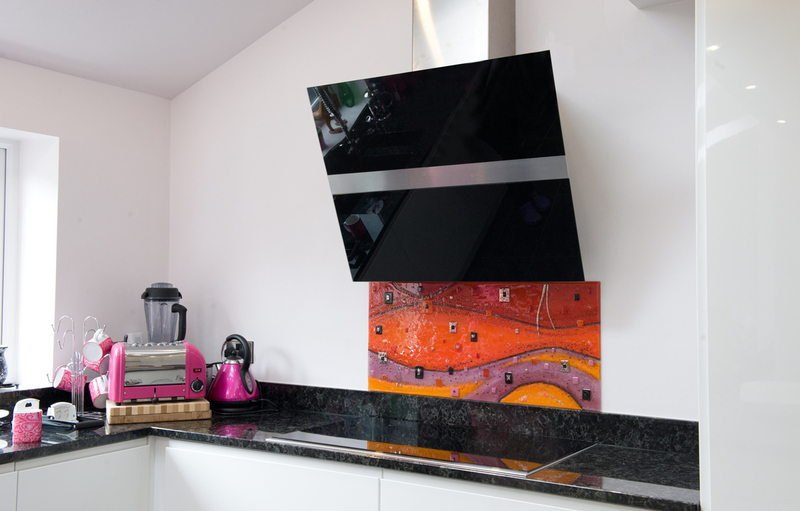 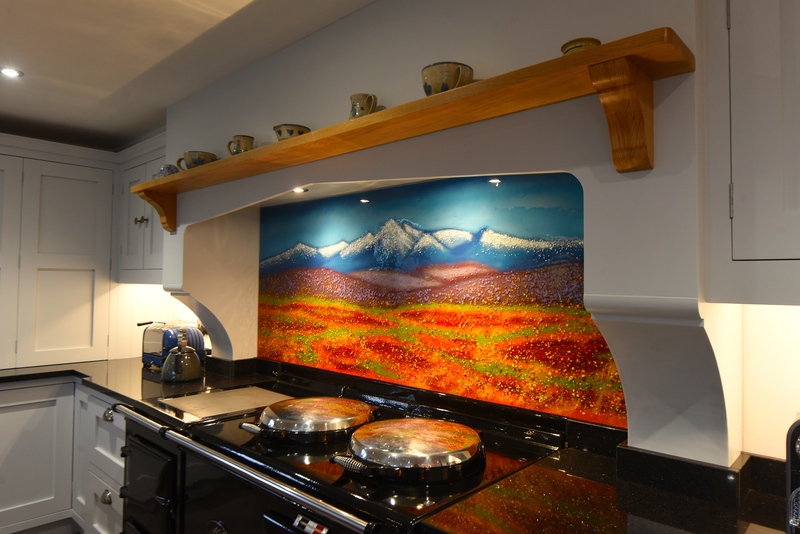 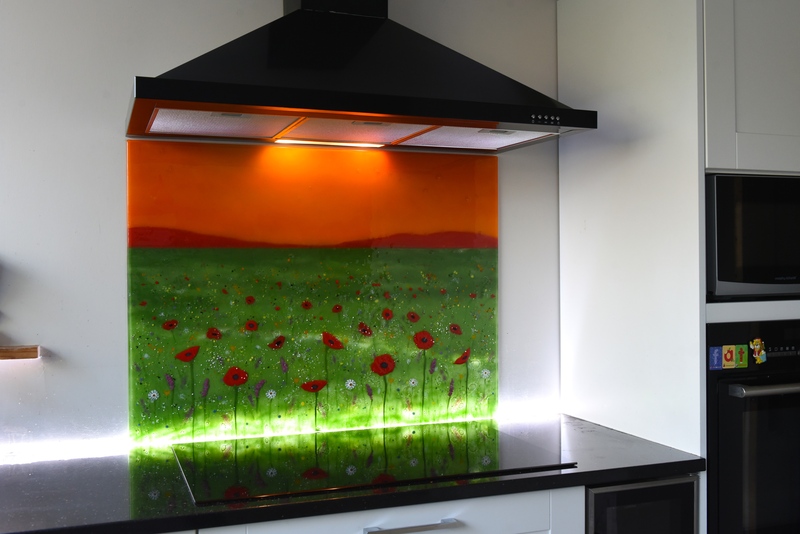 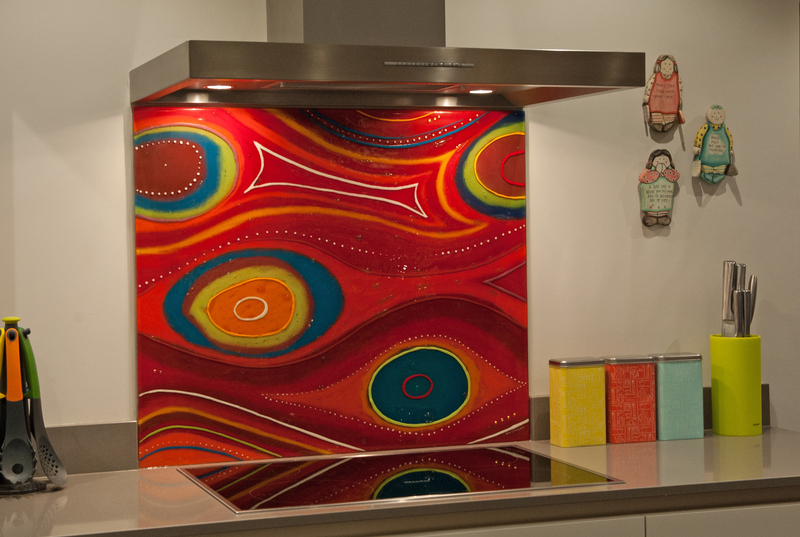 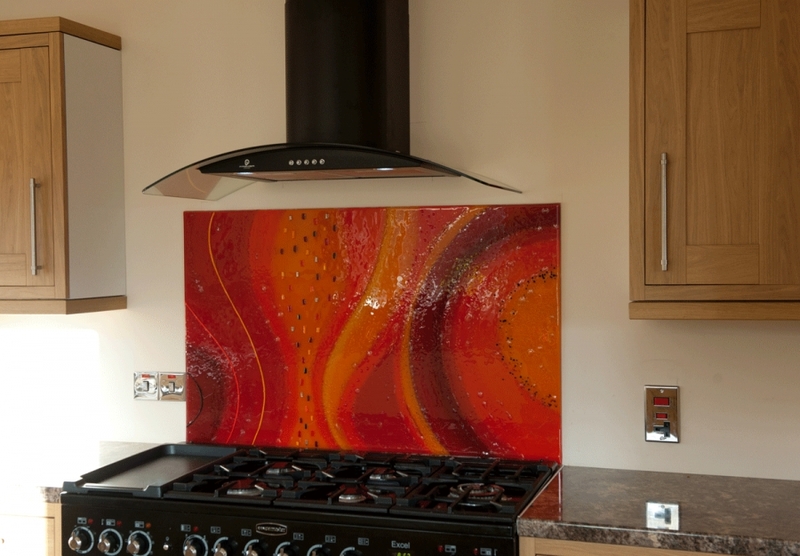 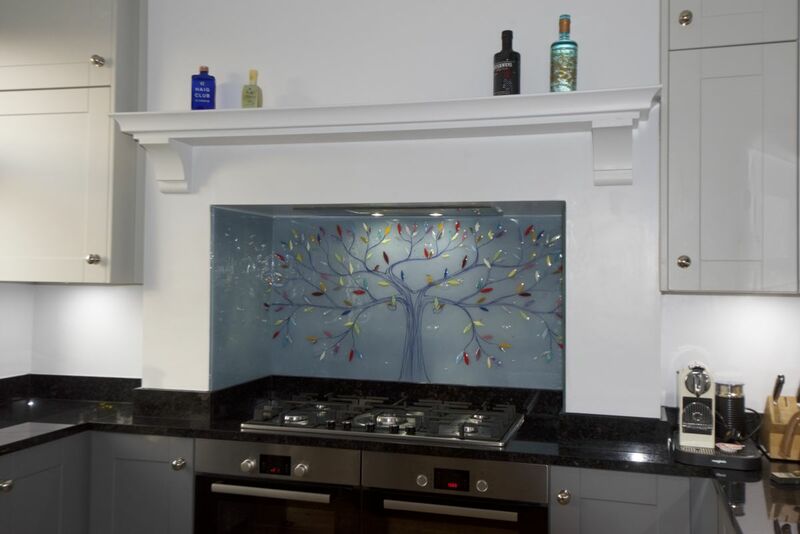 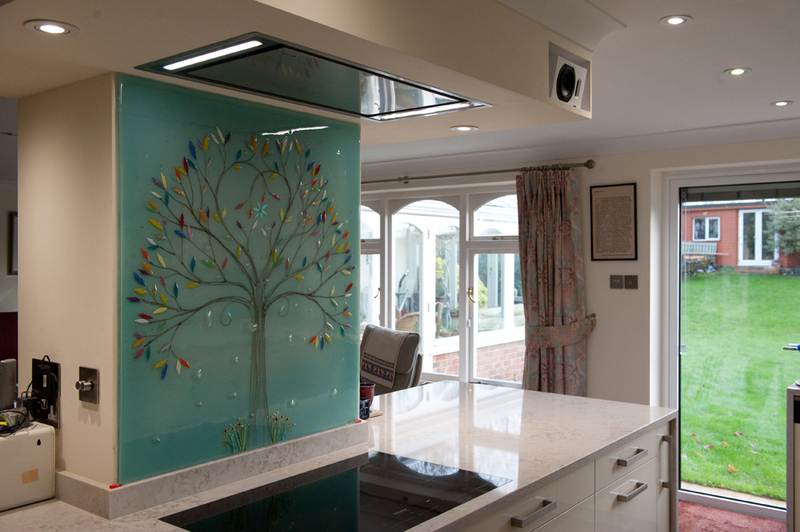 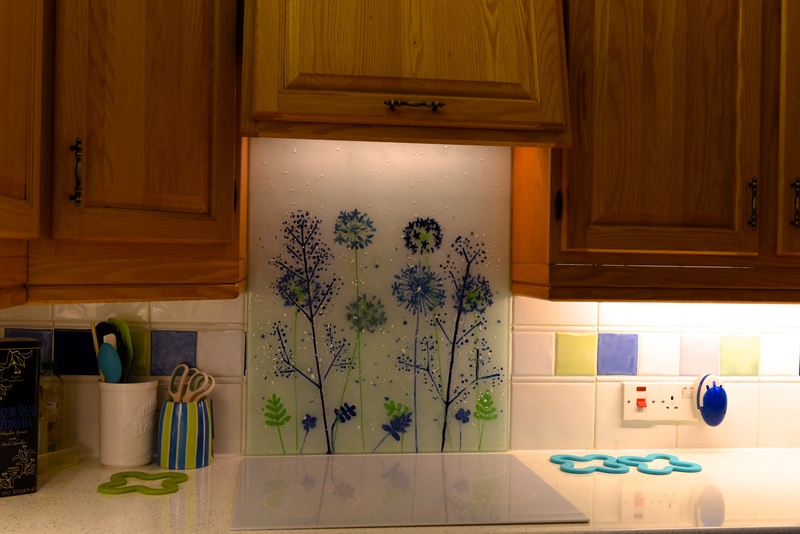 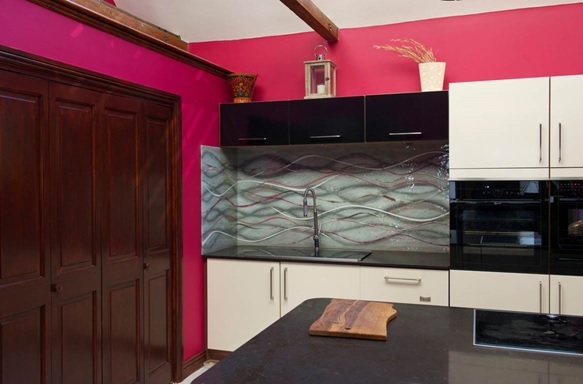 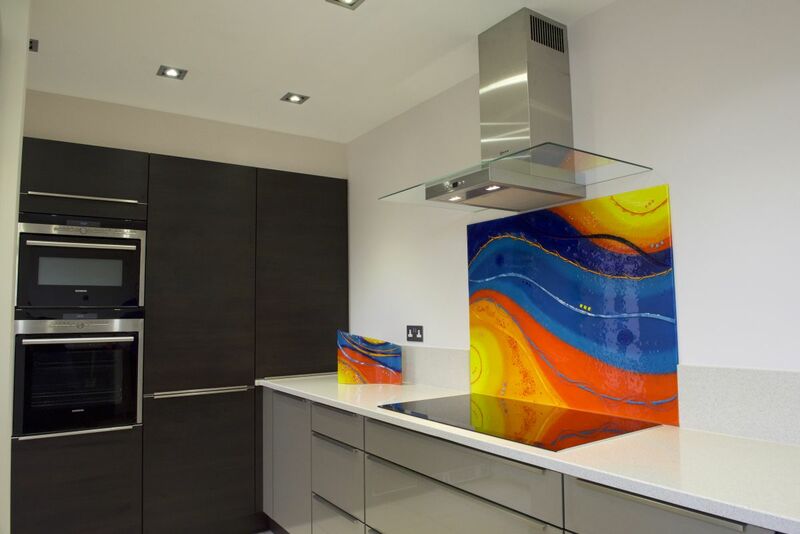 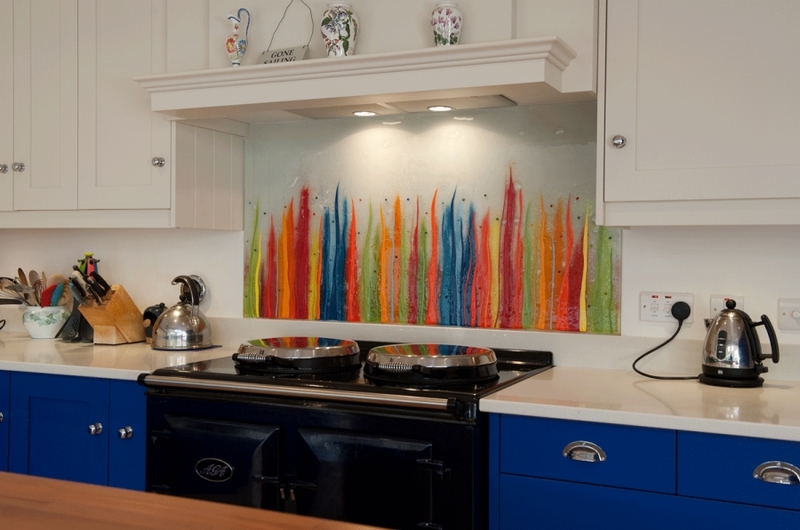 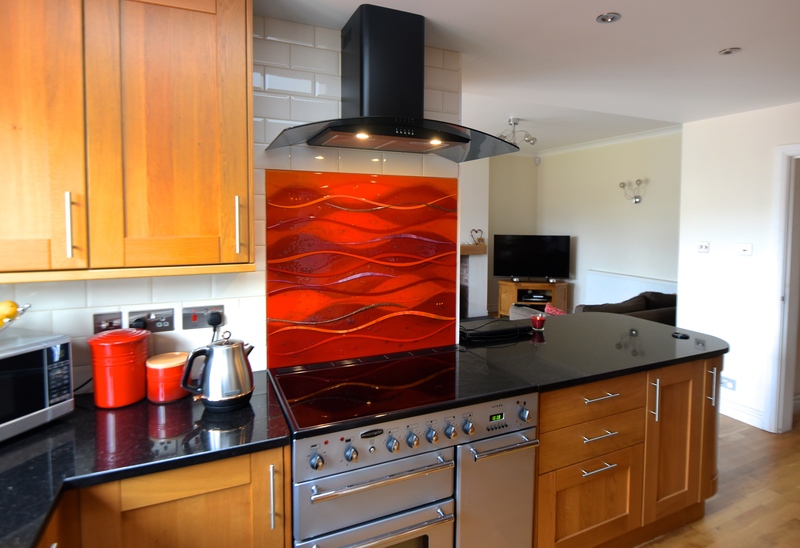 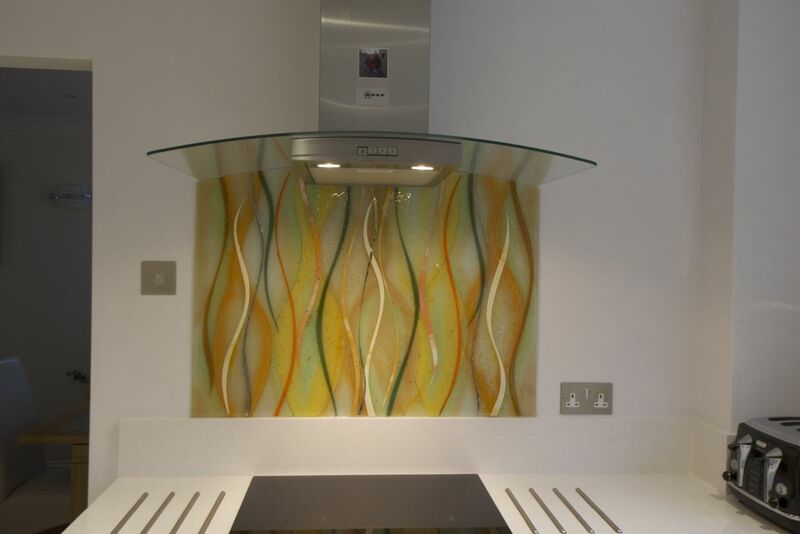 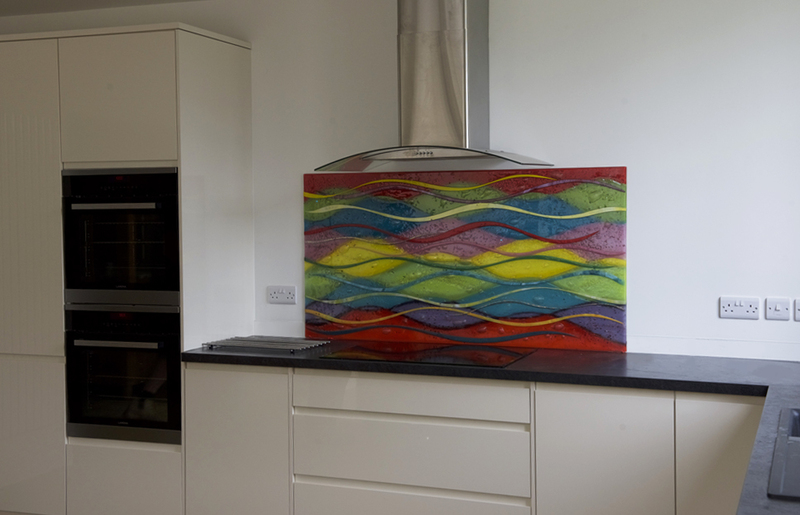 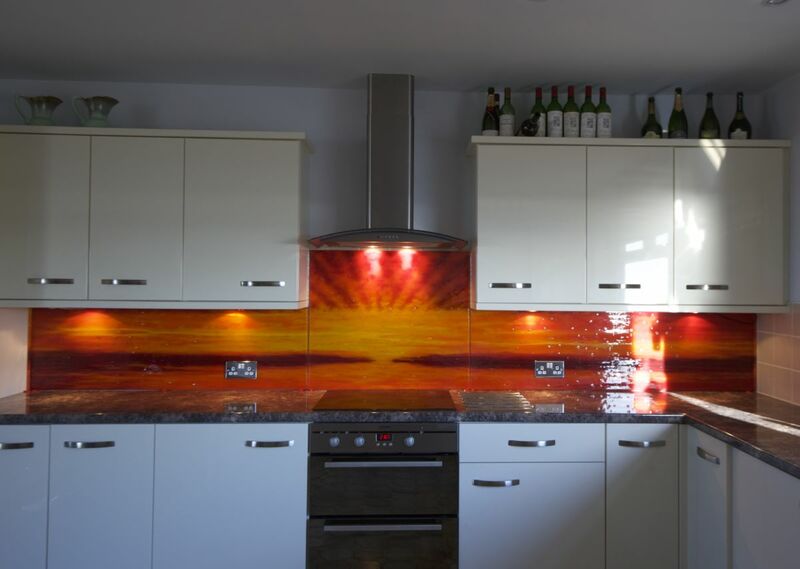 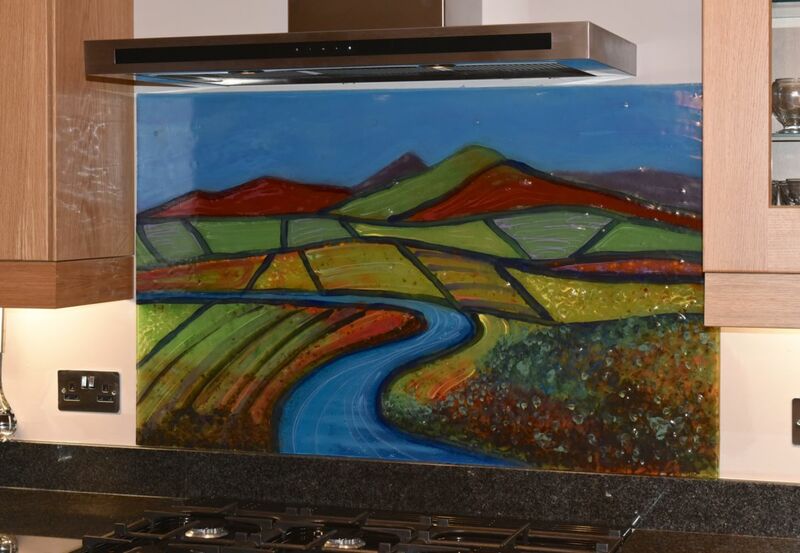 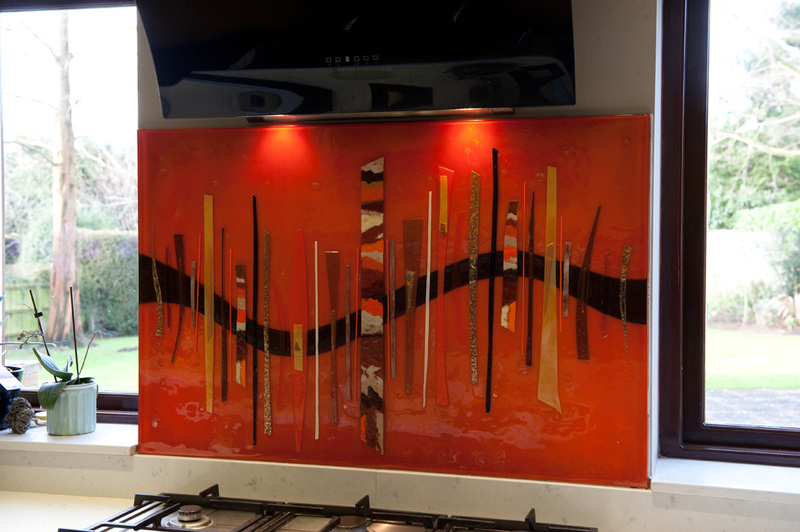 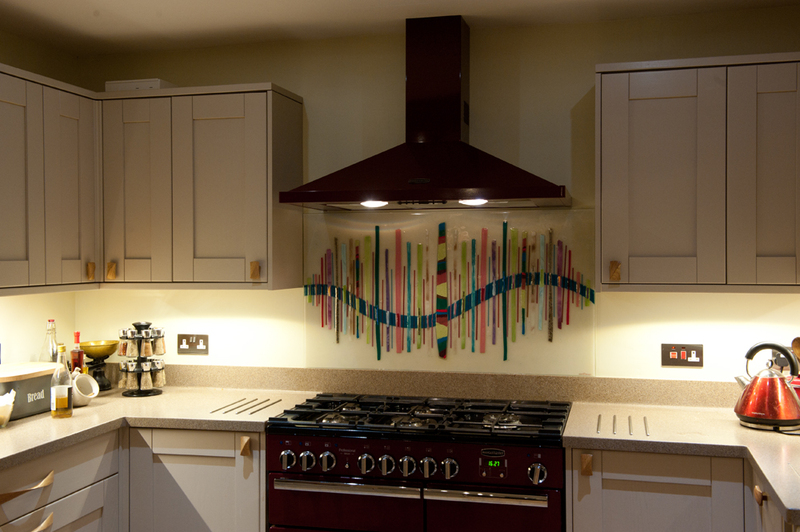 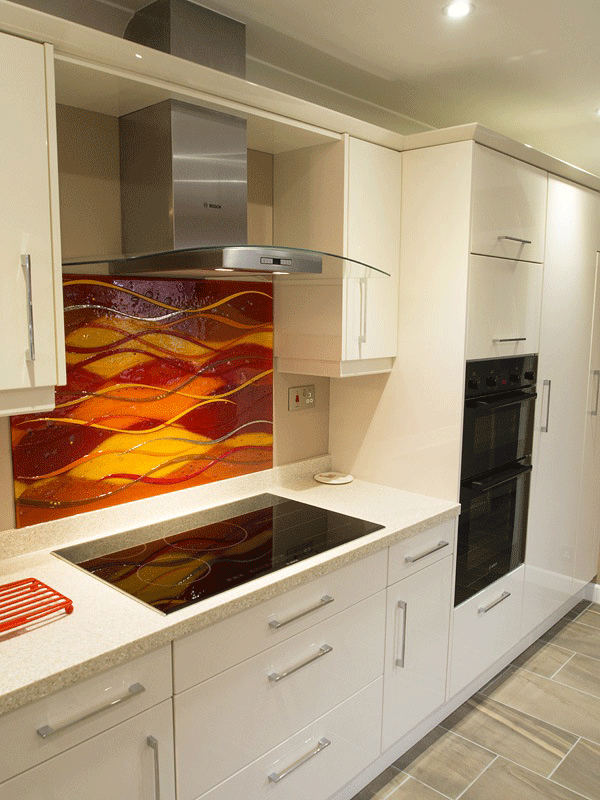 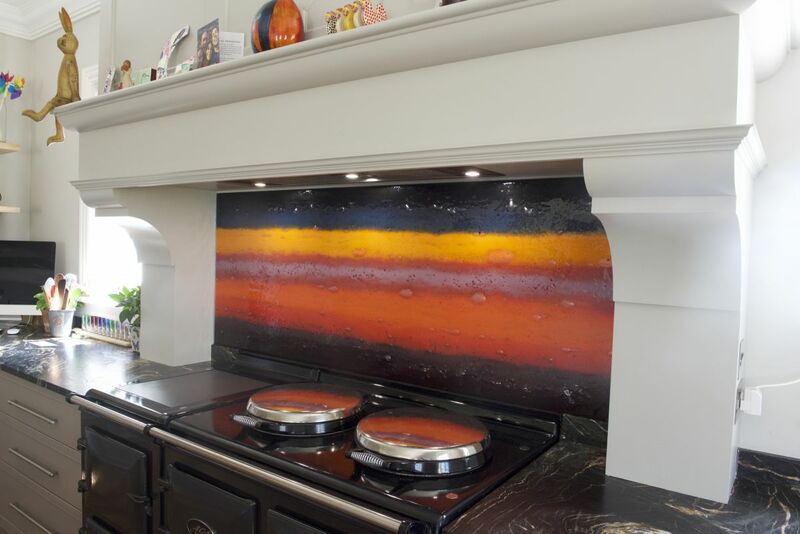 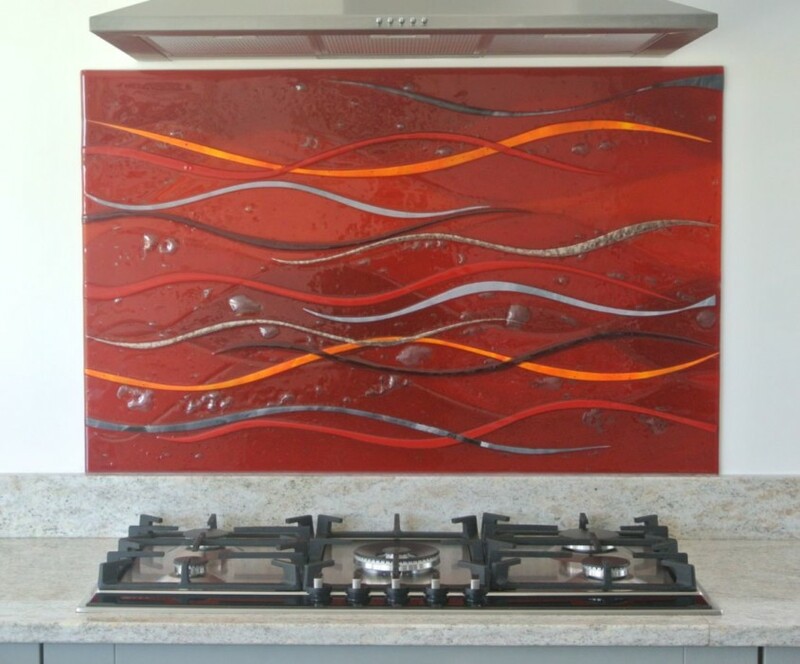 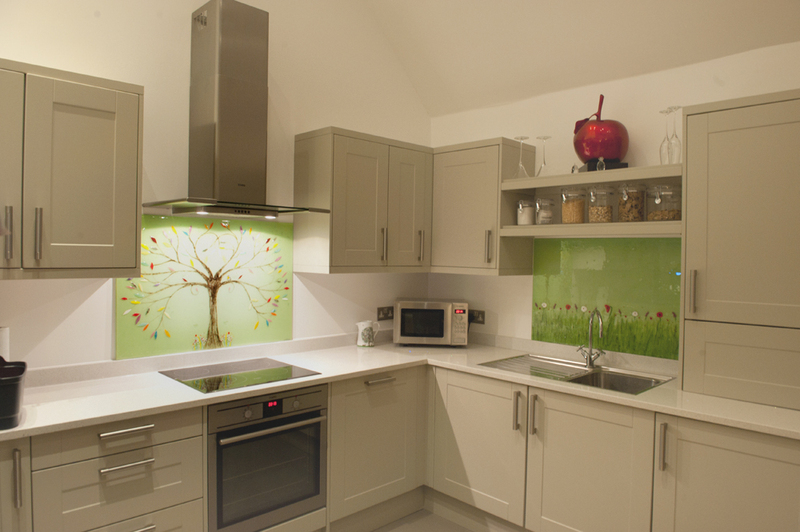 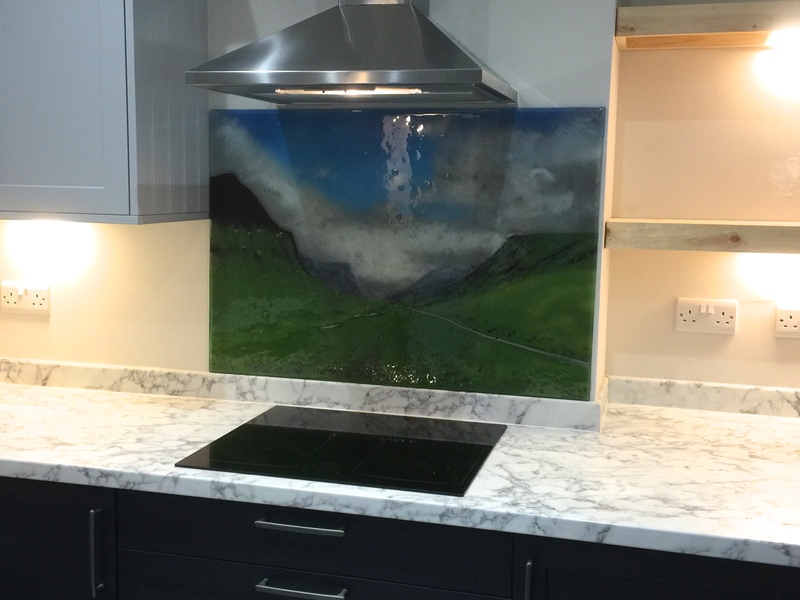 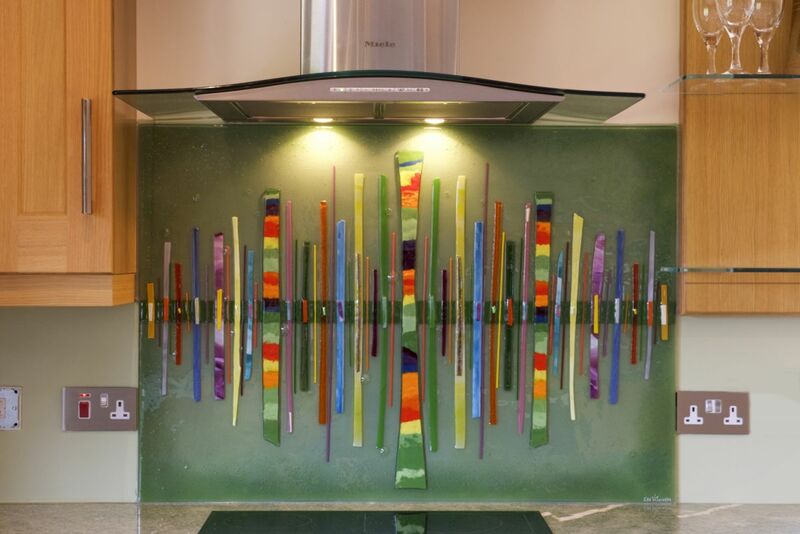 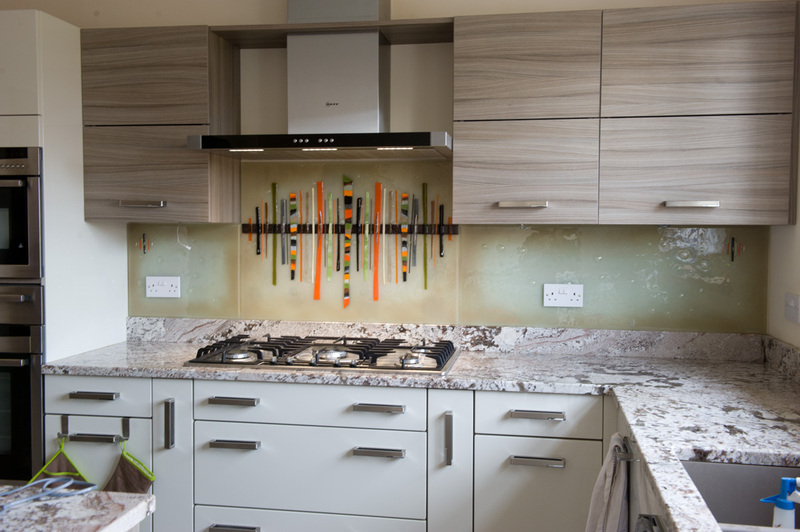 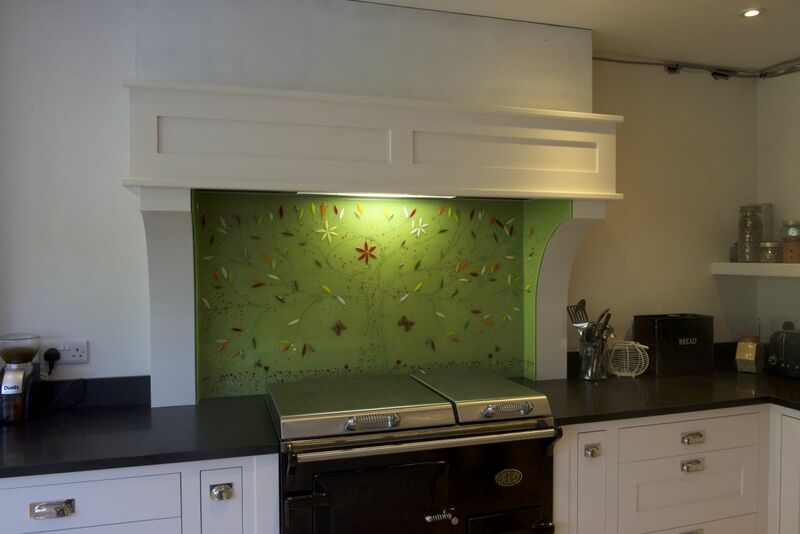 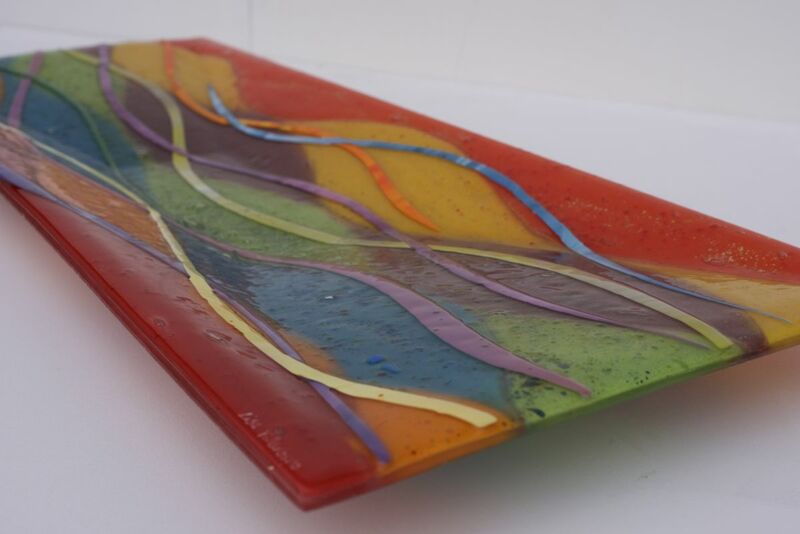 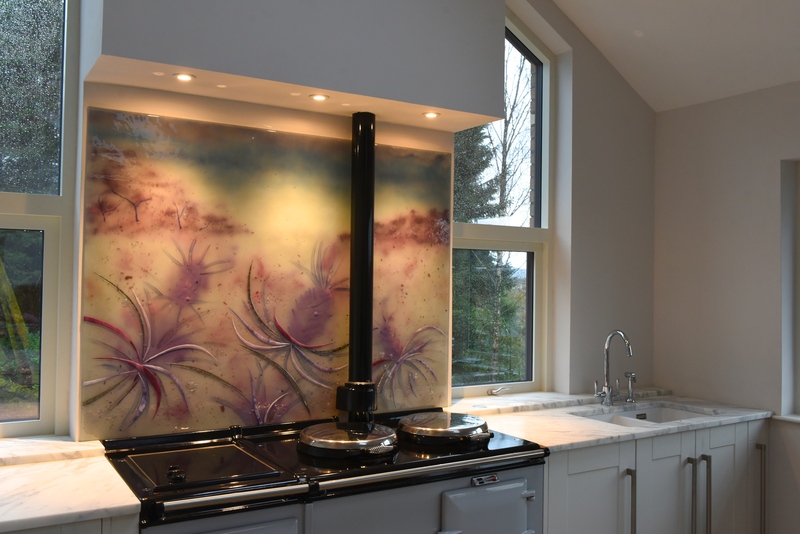 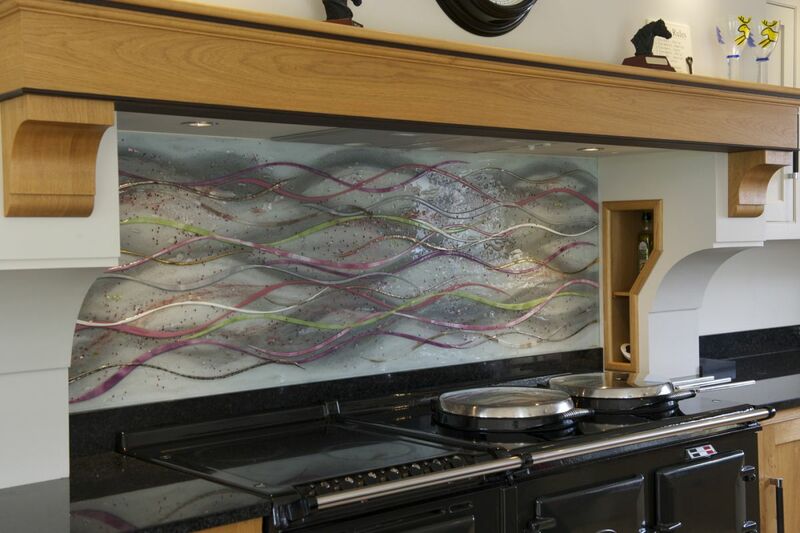 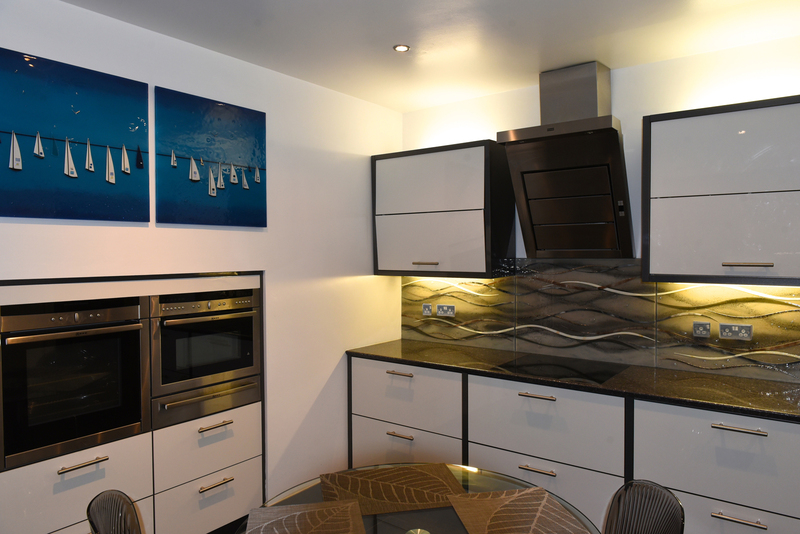 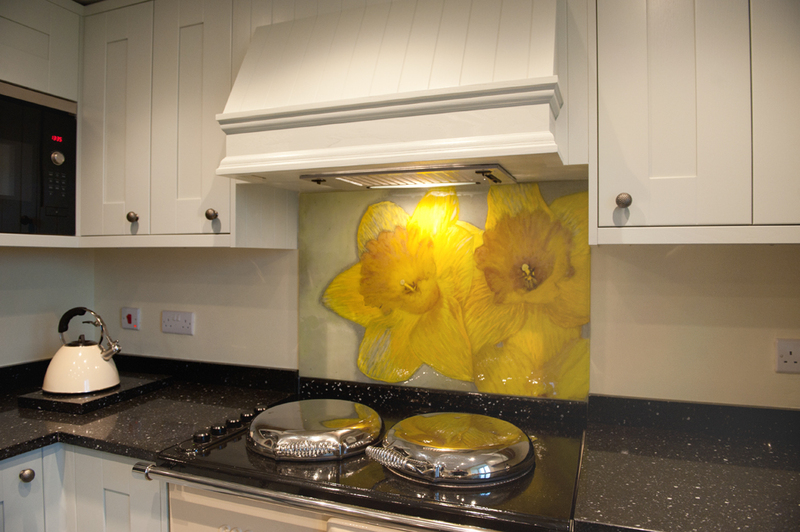 Do you choose one of the many coloured splashbacks on the market today, or something a little different made from fused glass art? 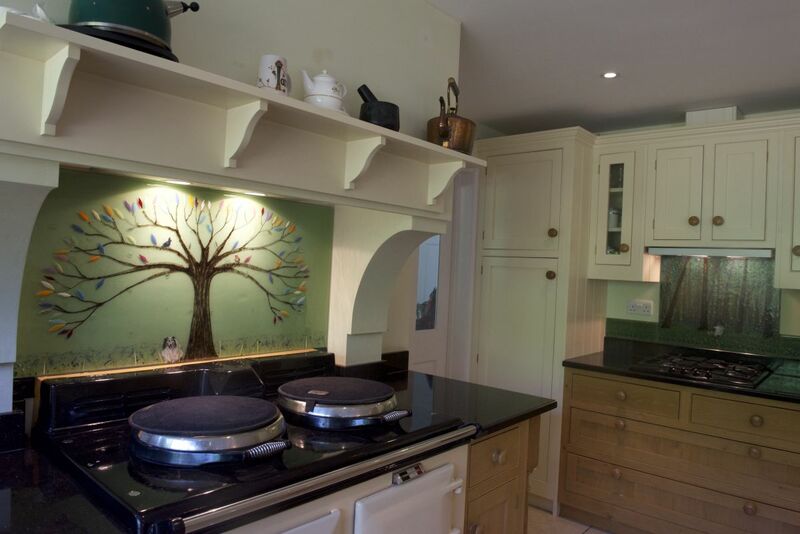 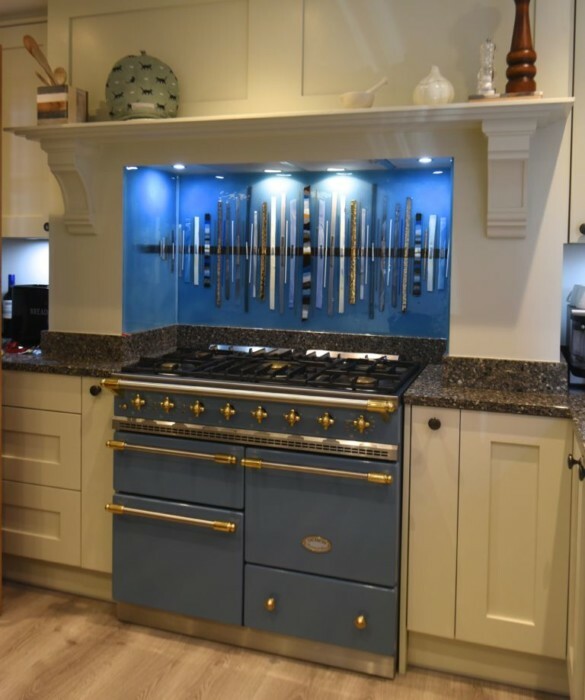 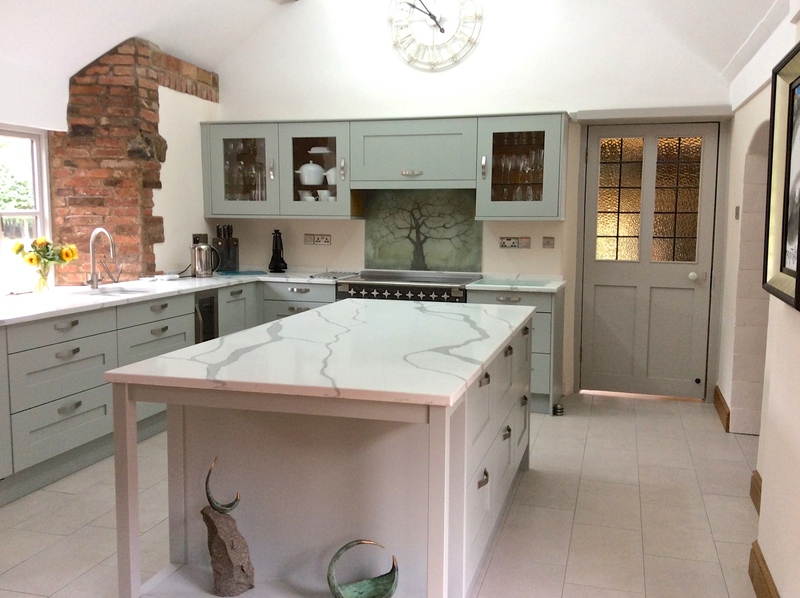 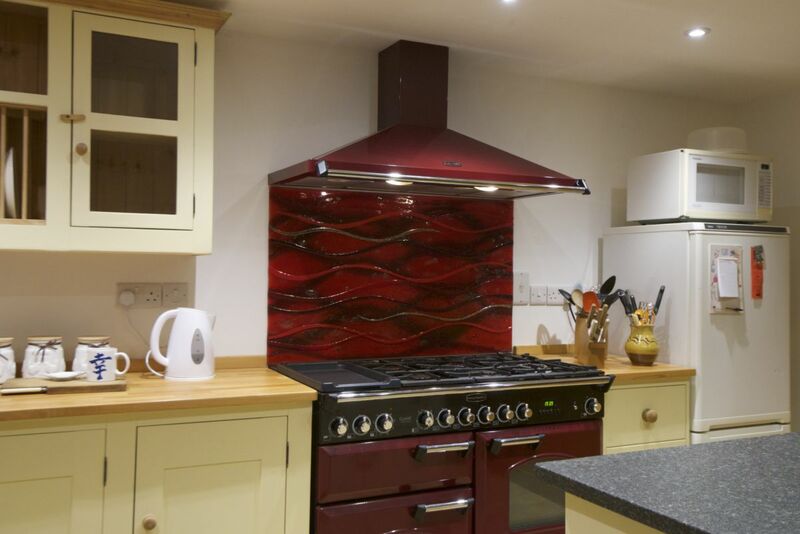 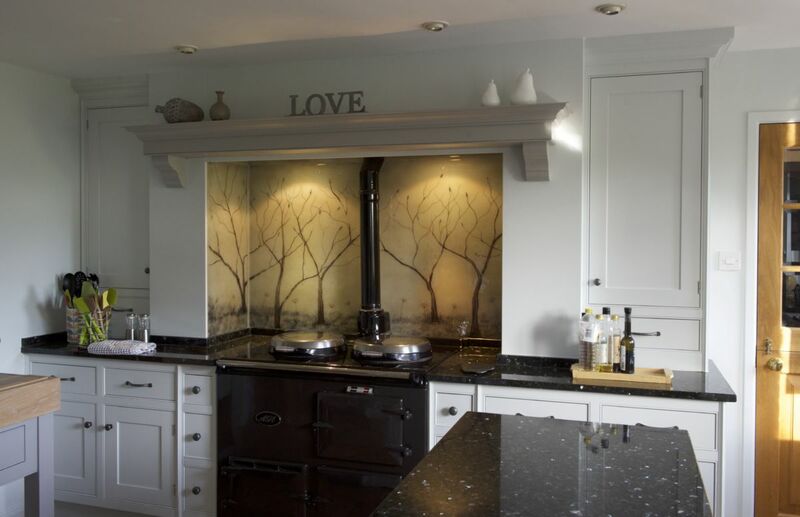 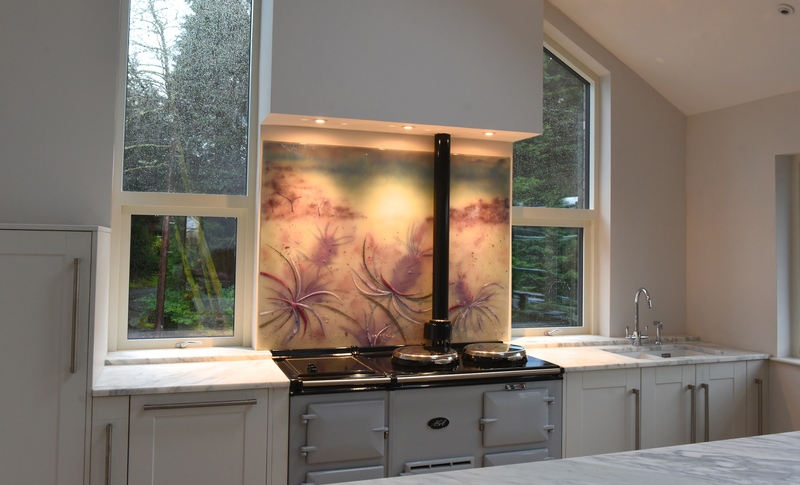 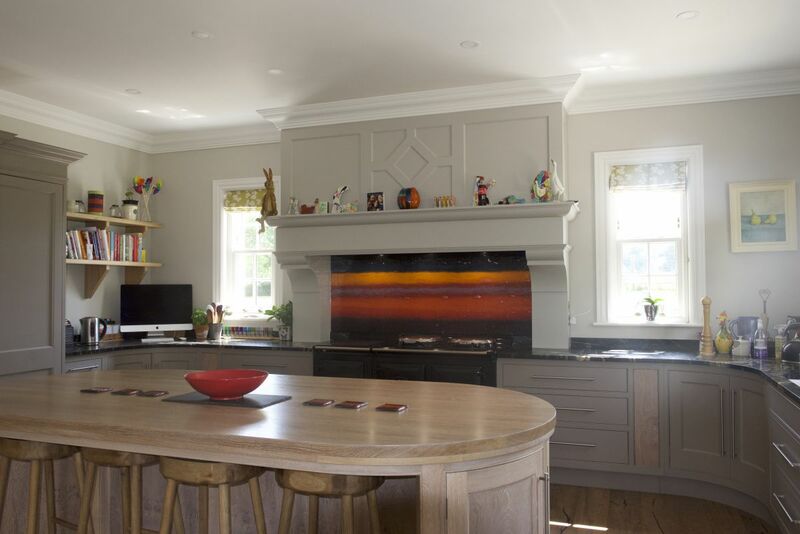 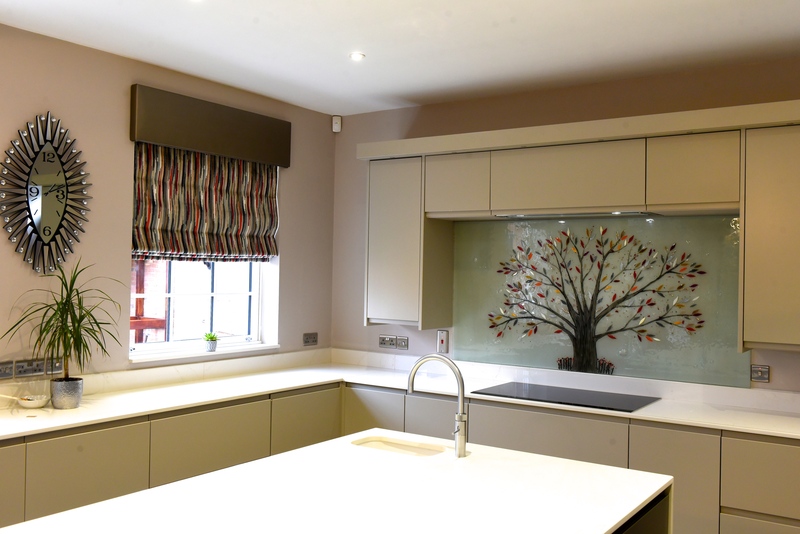 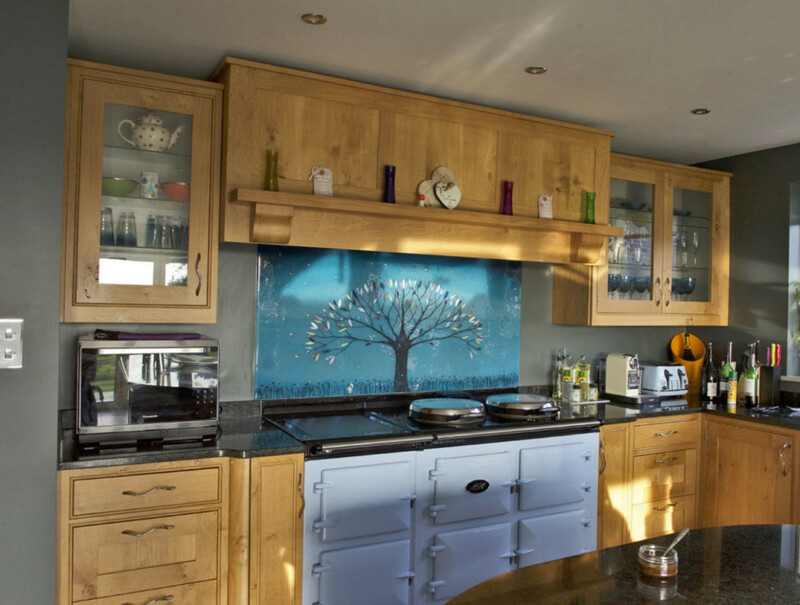 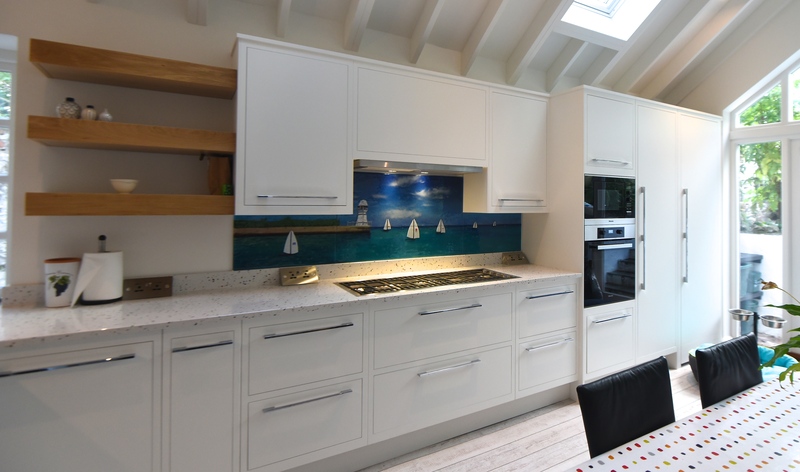 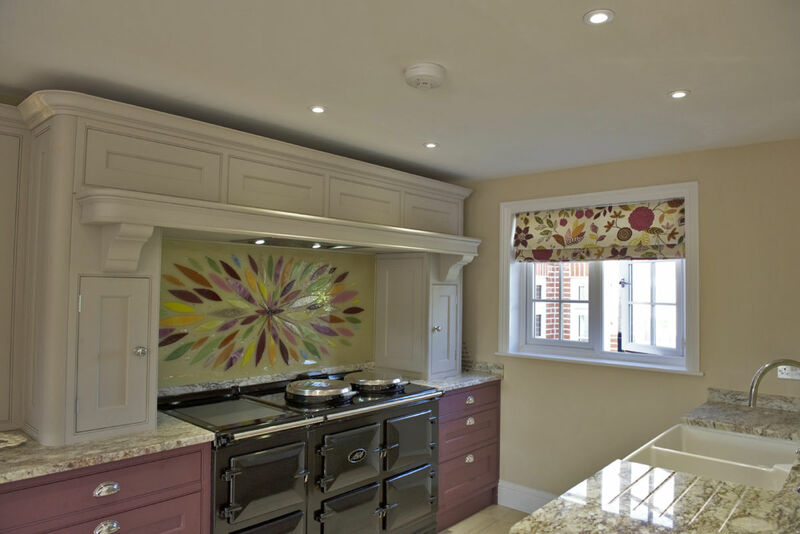 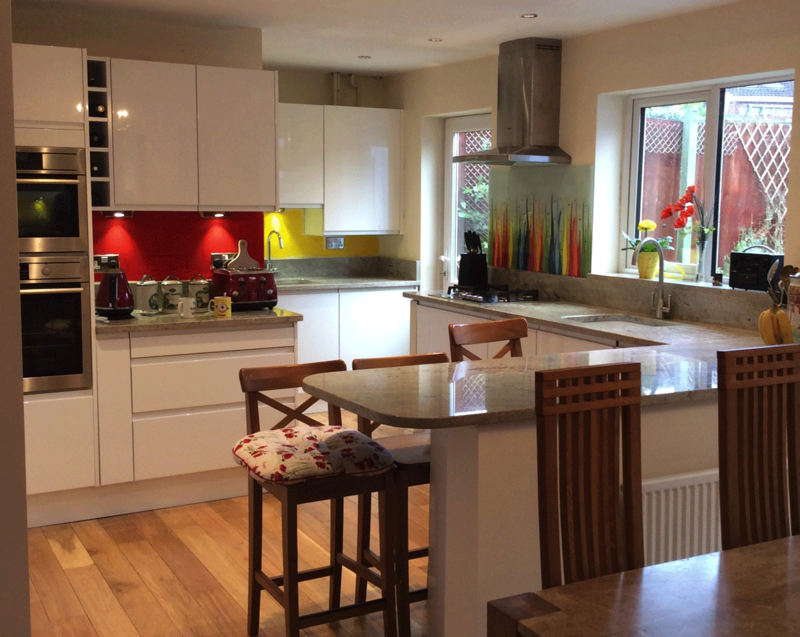 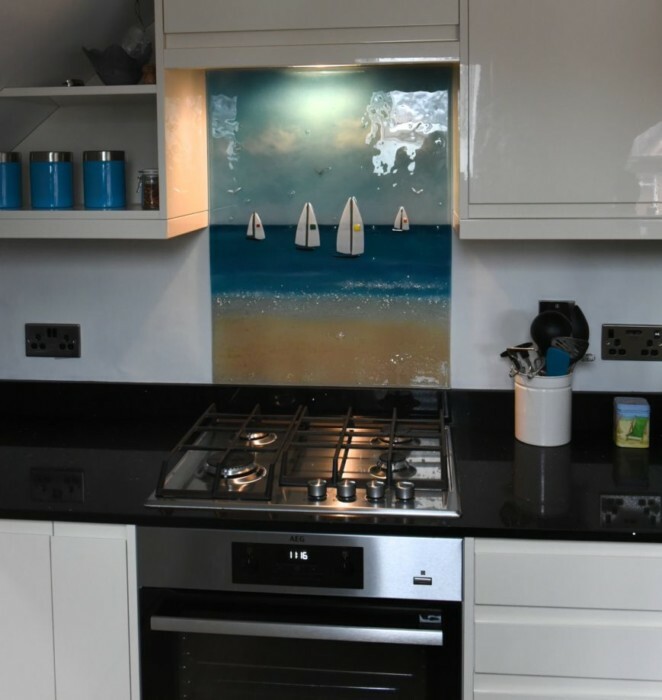 Coloured splashbacks definitely have found their niche over the years and they can look great in a traditional kitchen, especially when used alongside tiles. 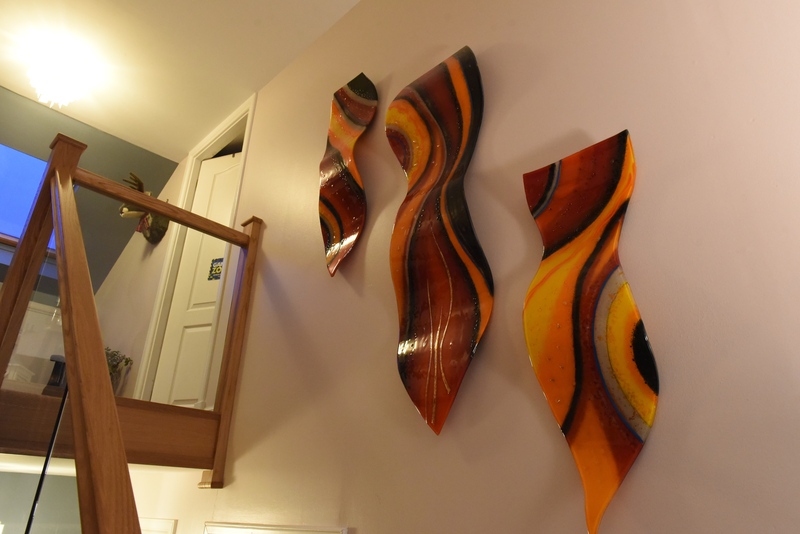 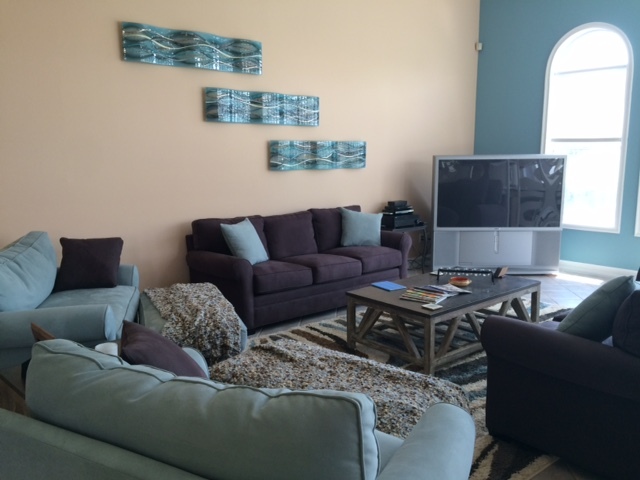 They’re a solid and safe choice, guaranteed to look good in a wide variety of spaces, but they definitely have their limitations. 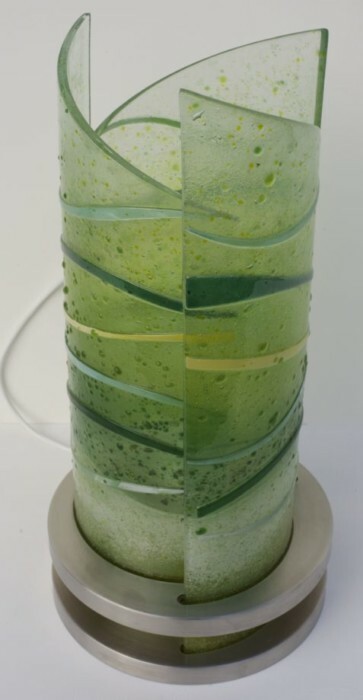 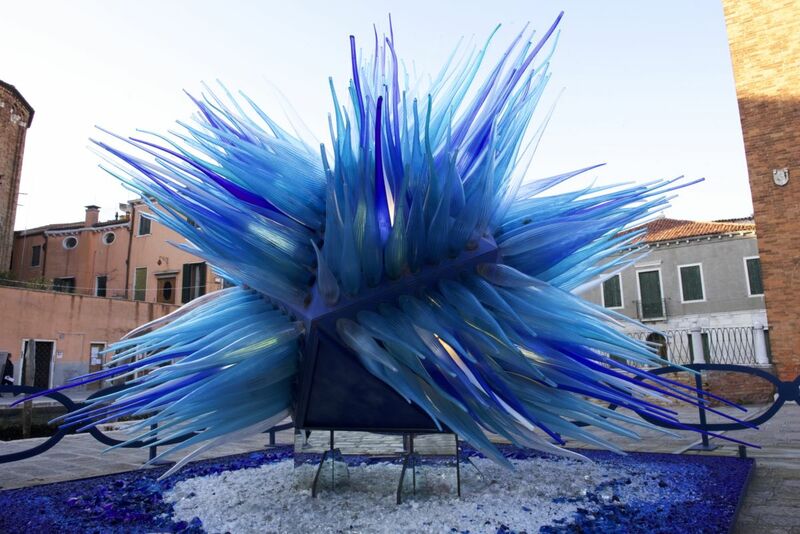 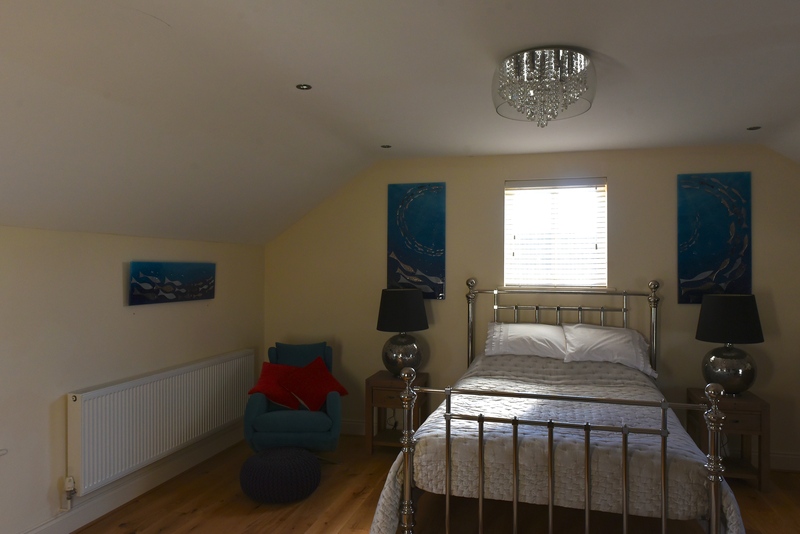 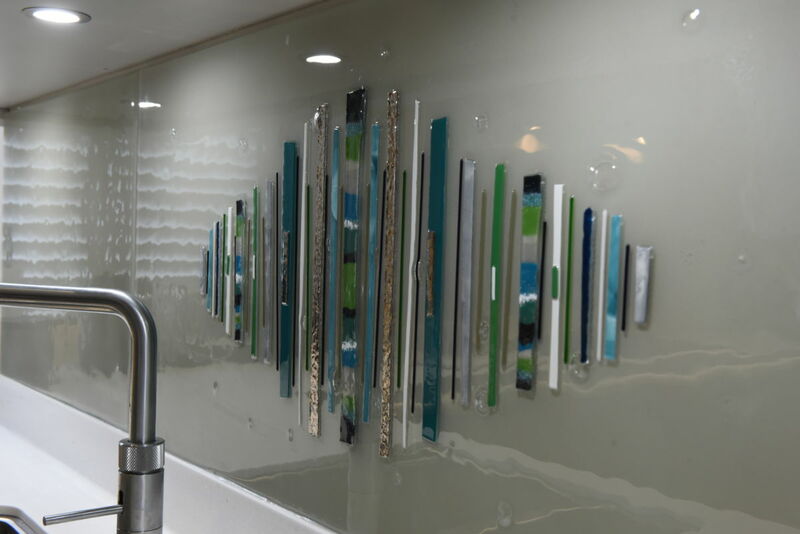 For example, coloured glass usually only comes in one single colour, with a distinct lack of texture that can be a little disappointing for anyone looking to really make their décor stand out from the rest. 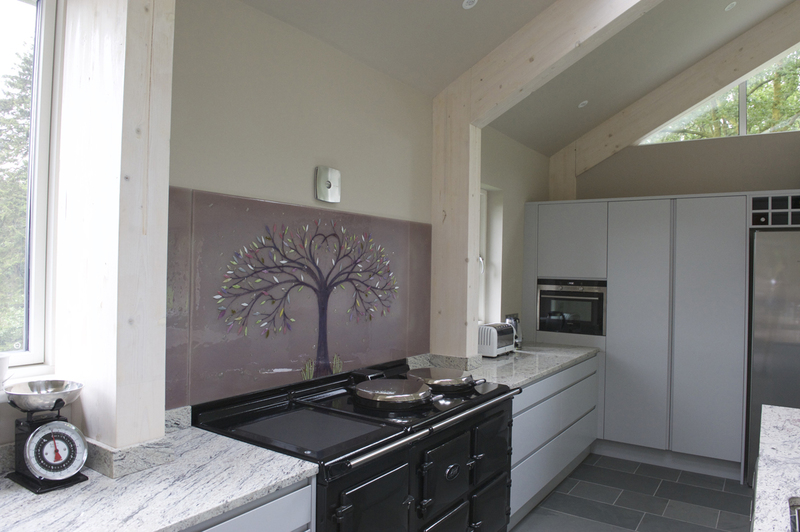 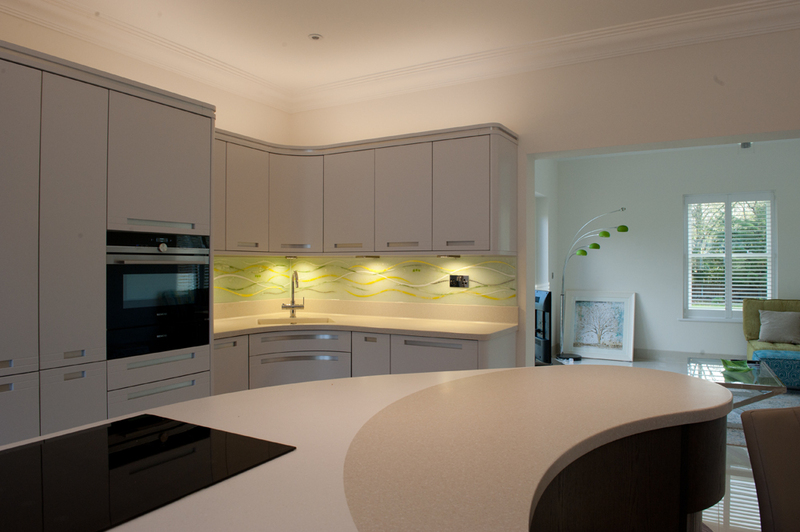 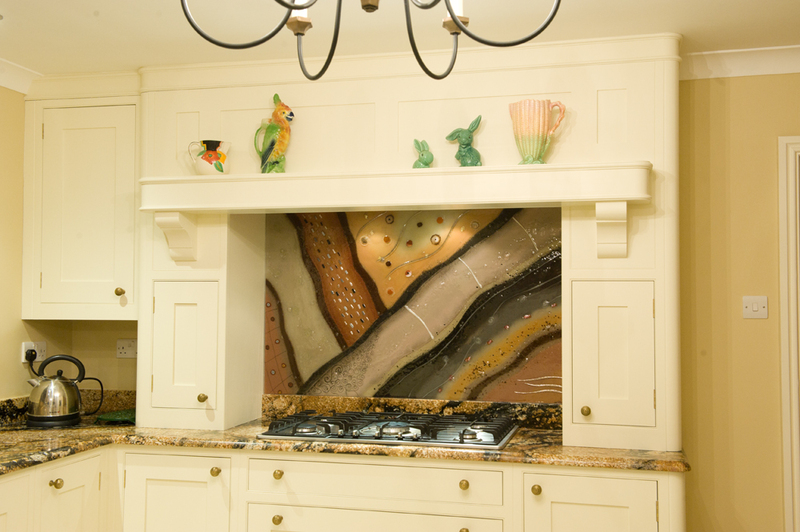 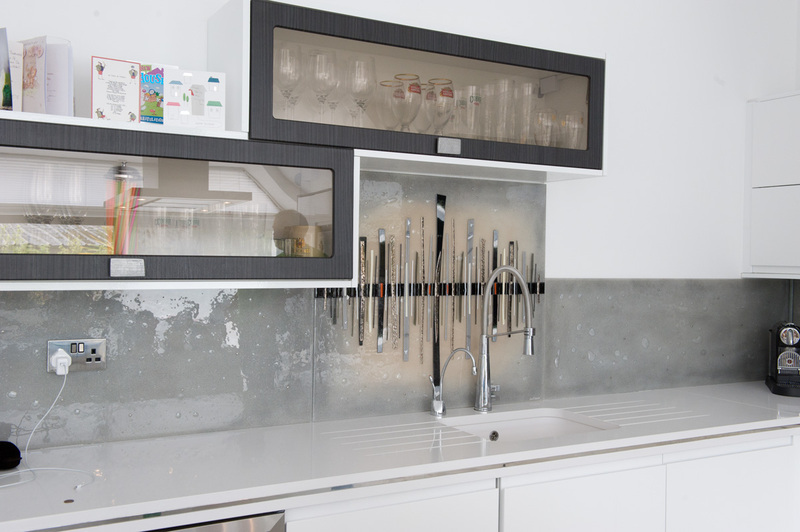 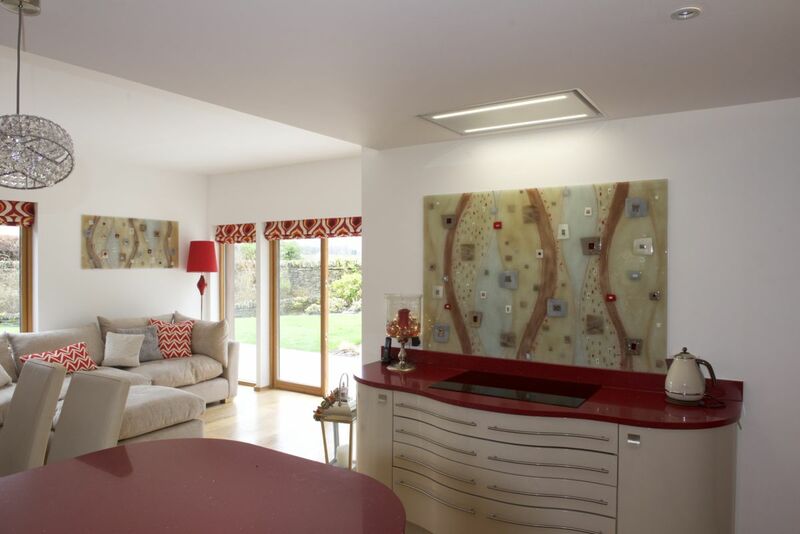 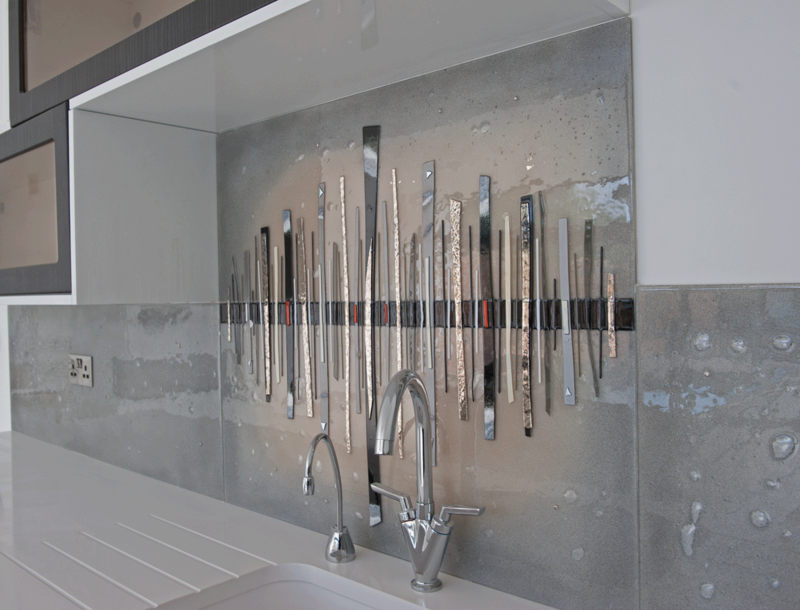 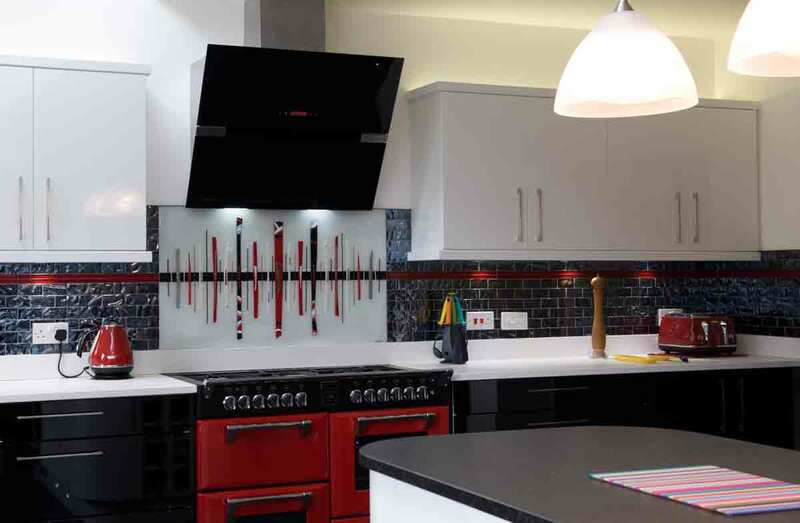 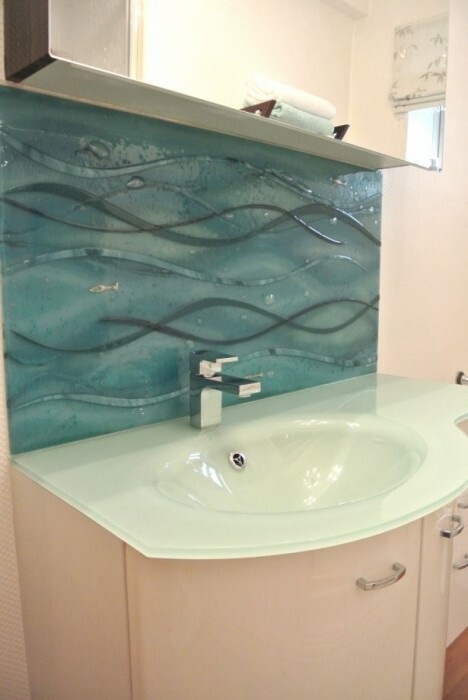 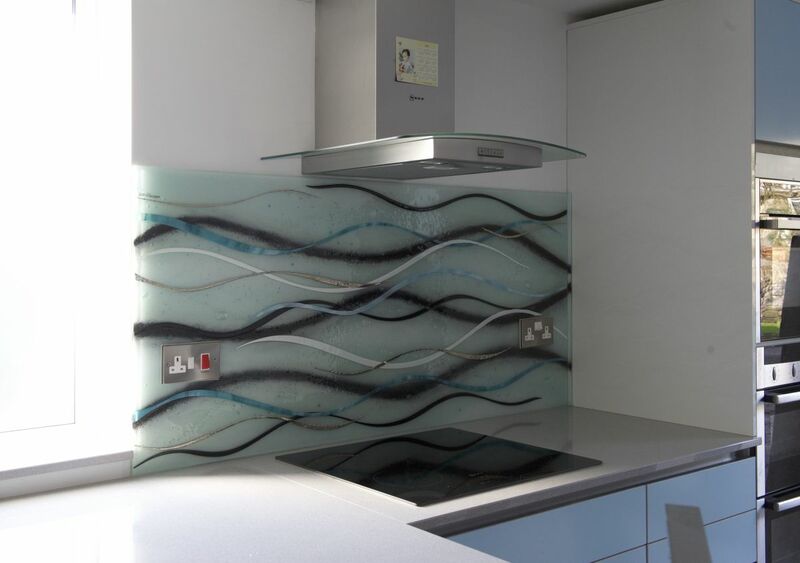 Over time, you might find yourself wishing that your splashback had more oomph! 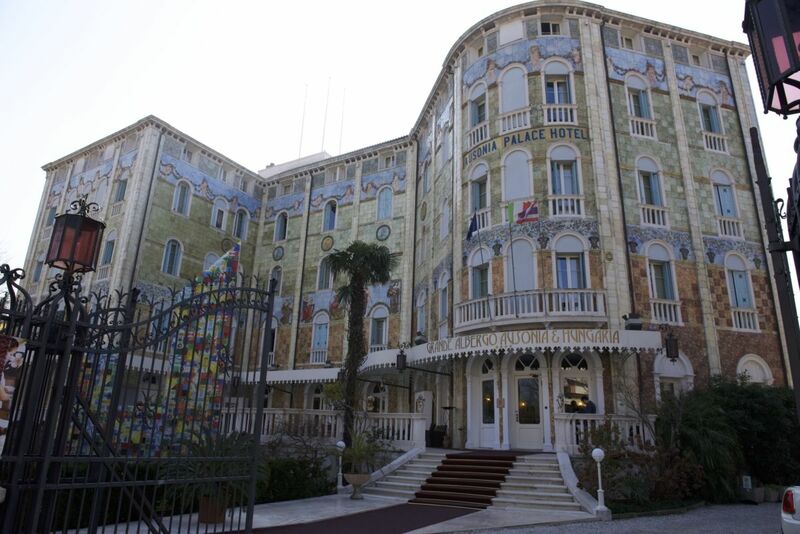 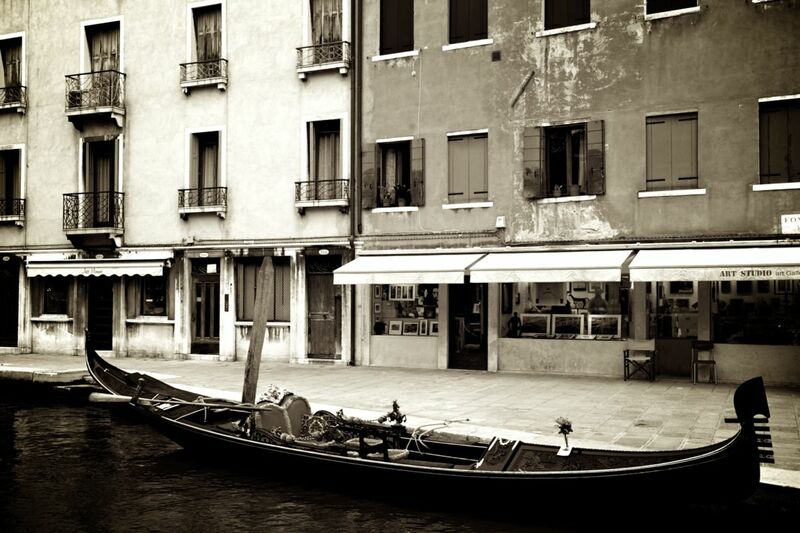 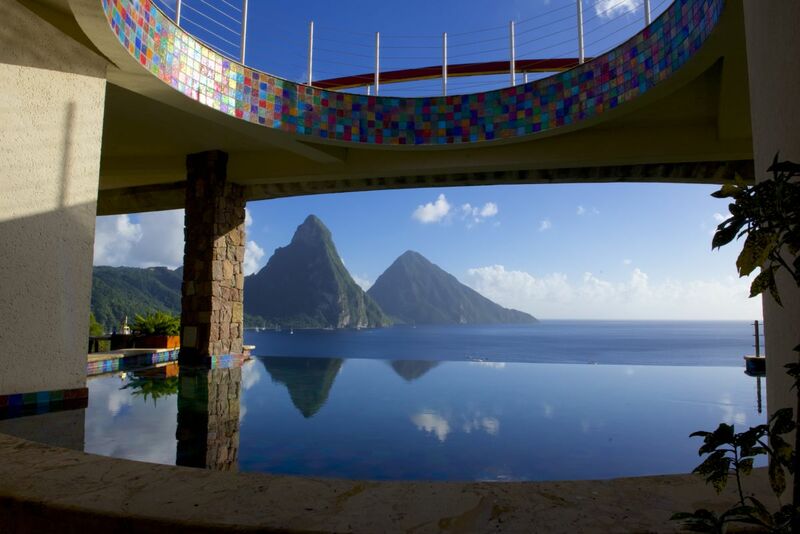 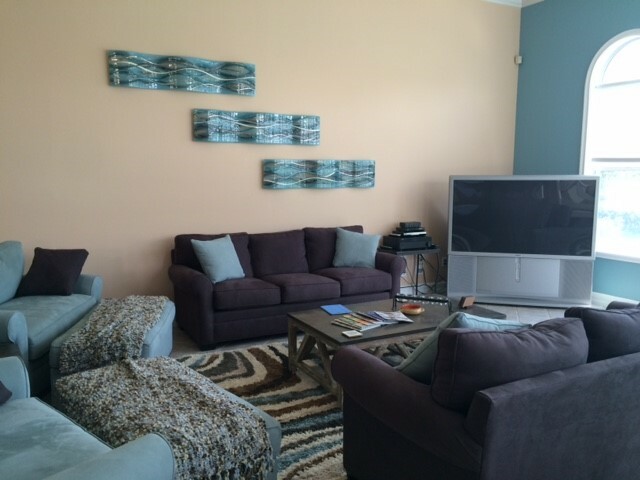 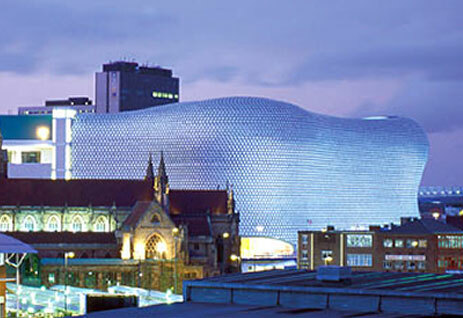 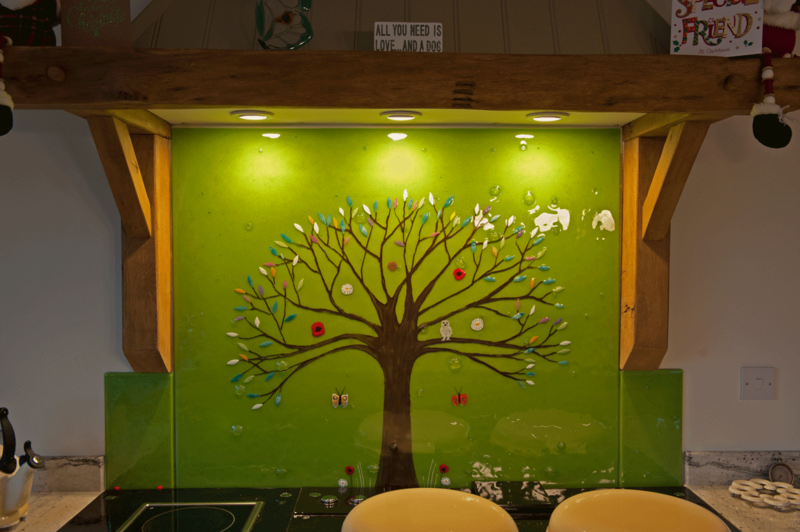 This is where we come in, naturally! 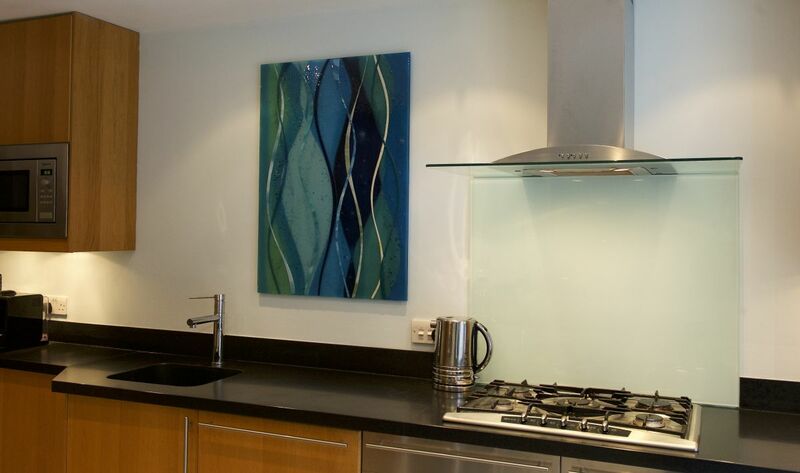 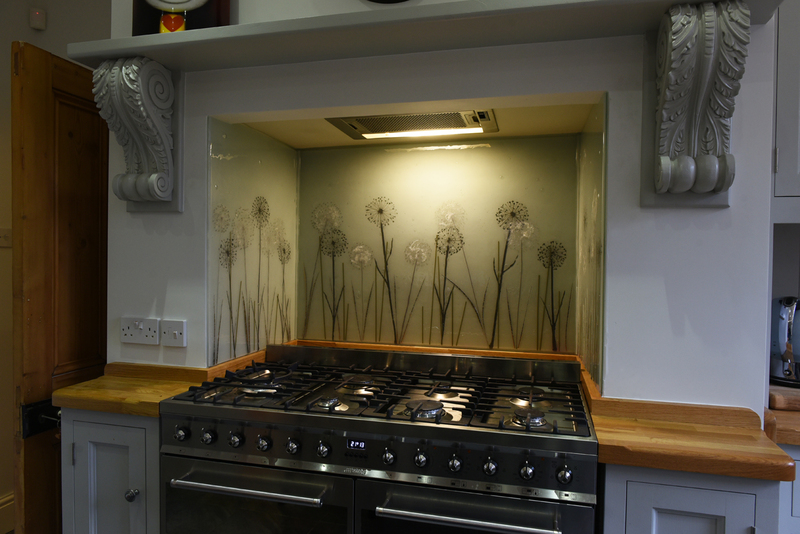 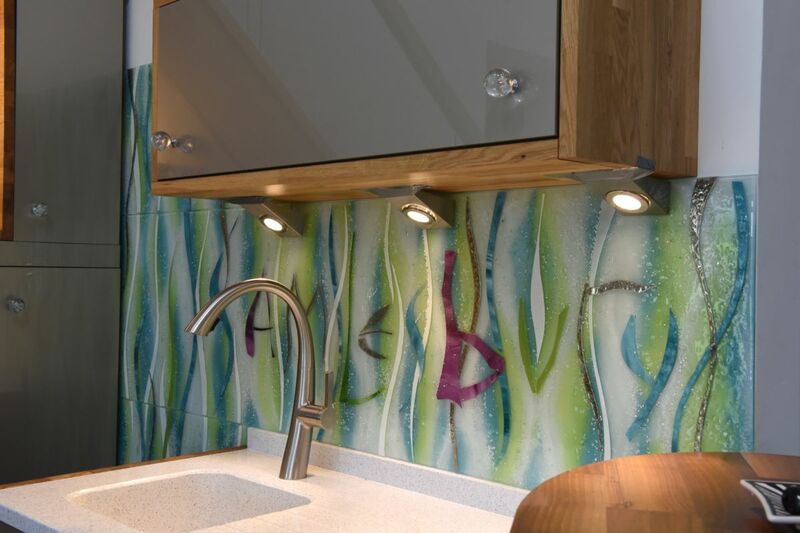 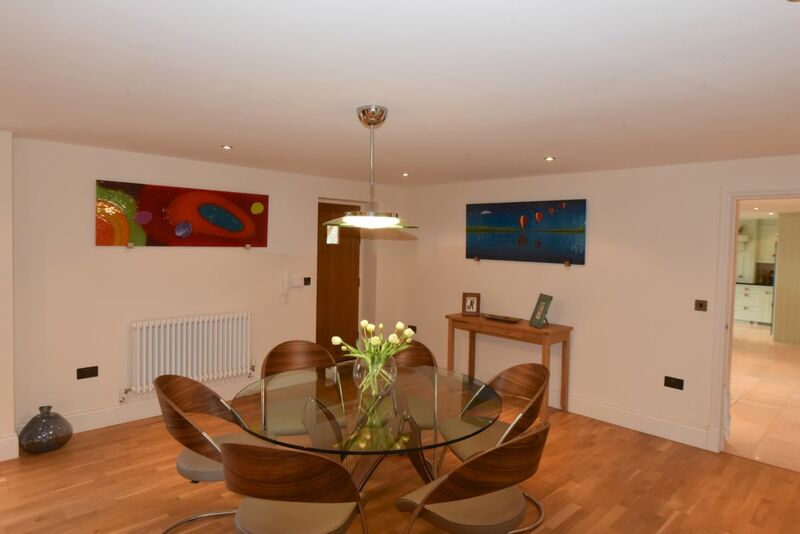 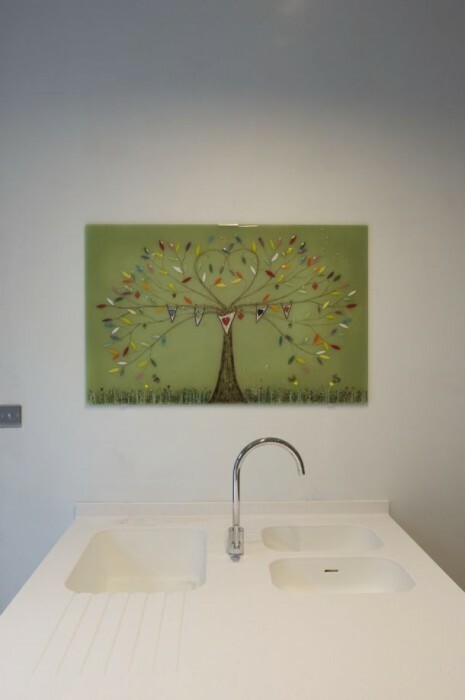 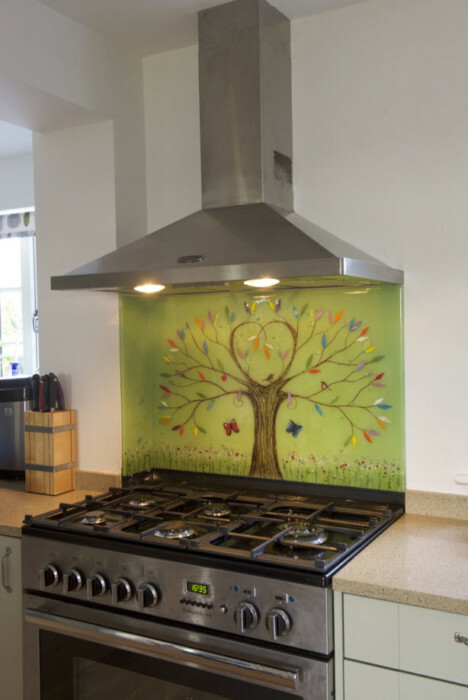 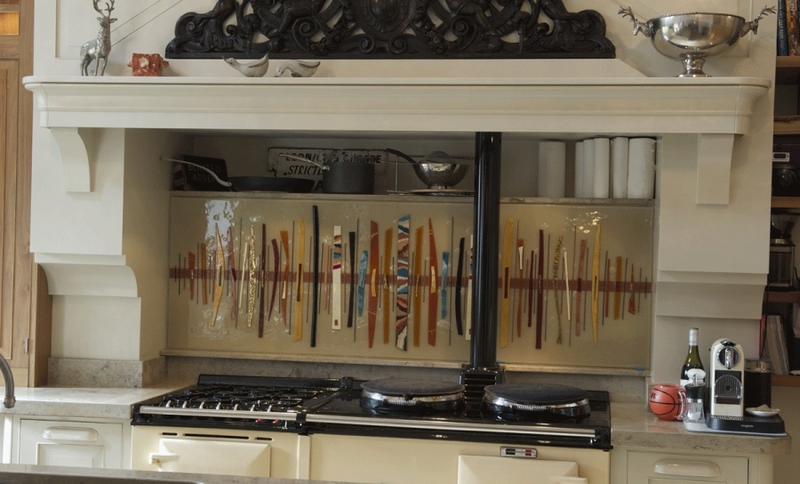 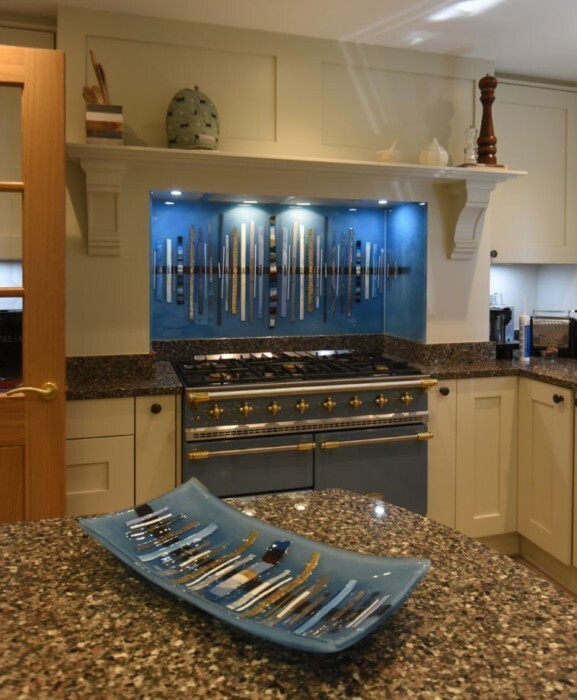 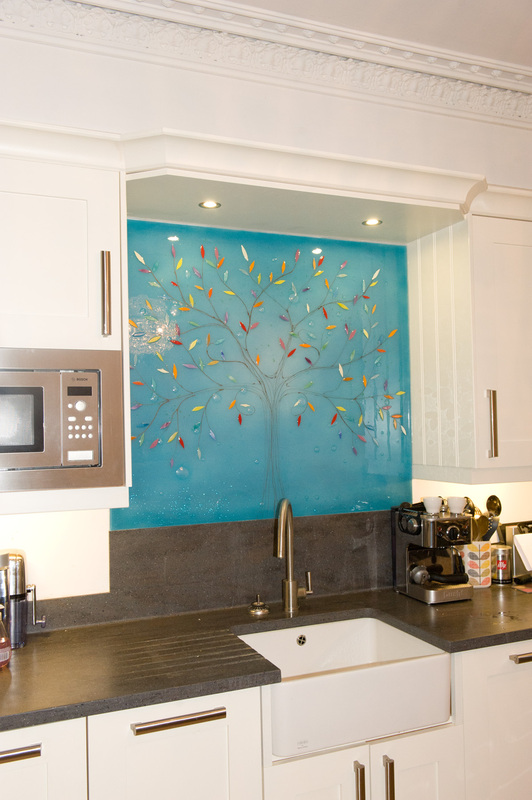 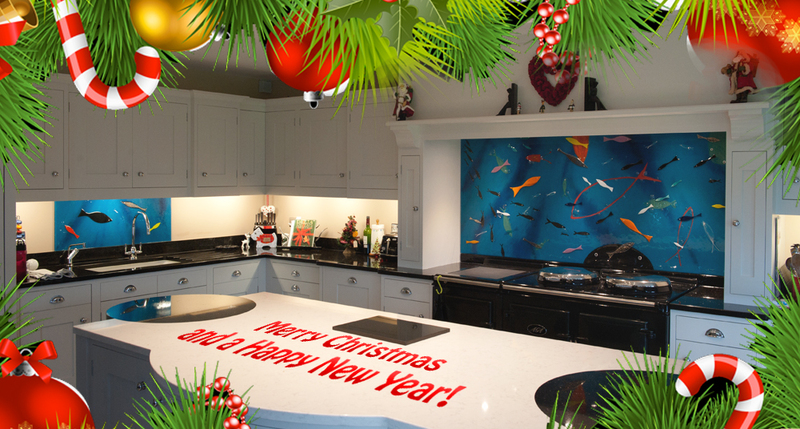 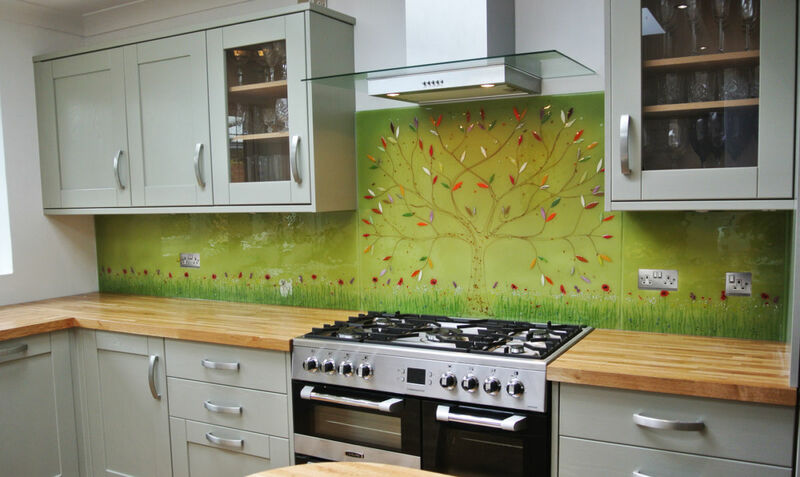 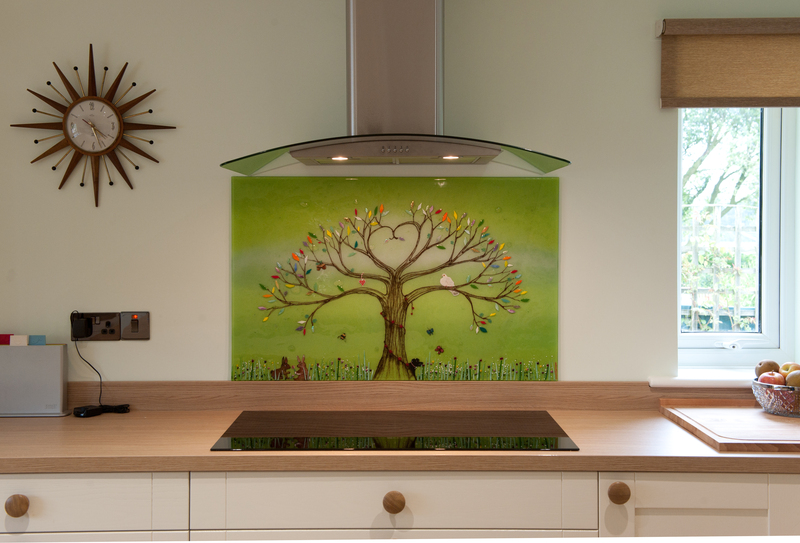 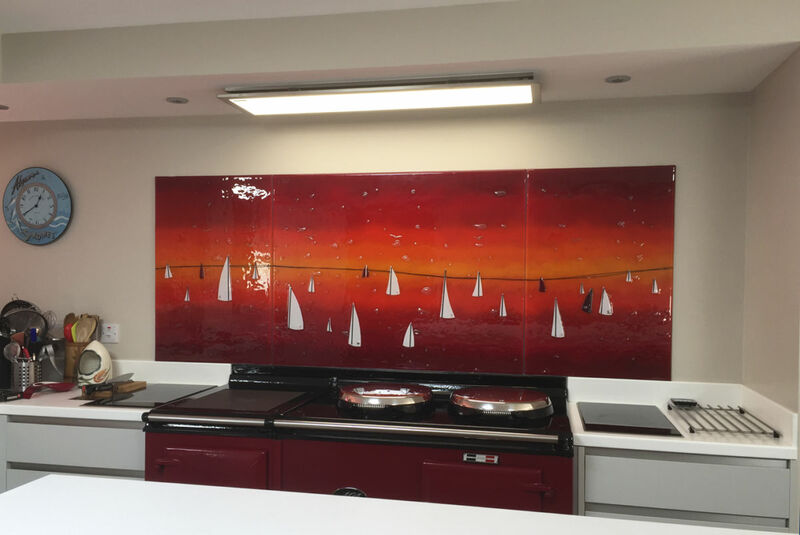 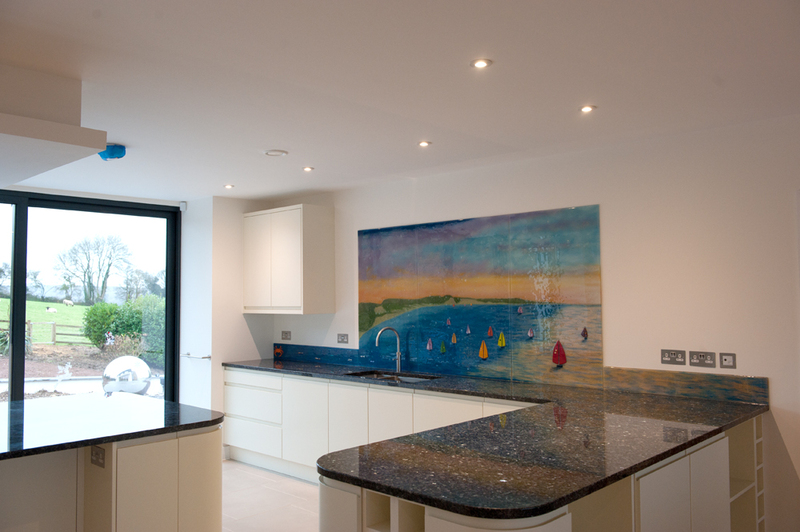 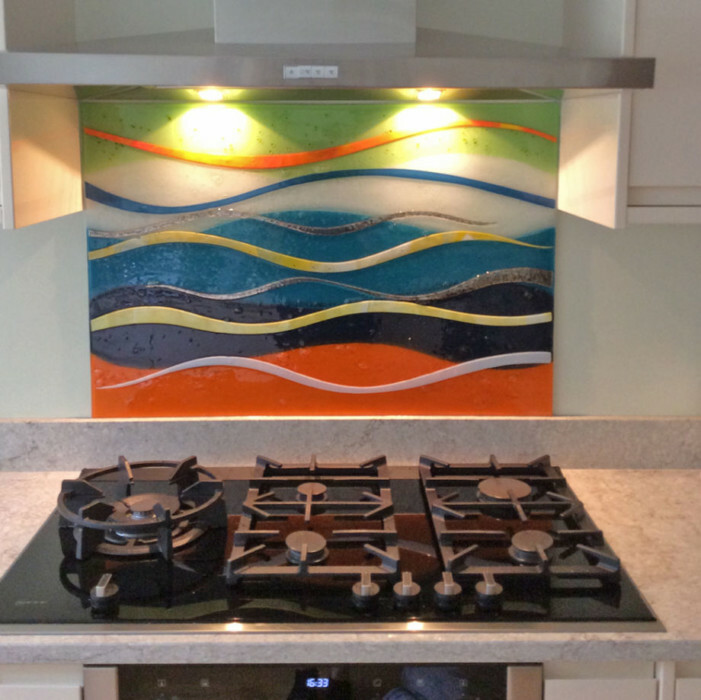 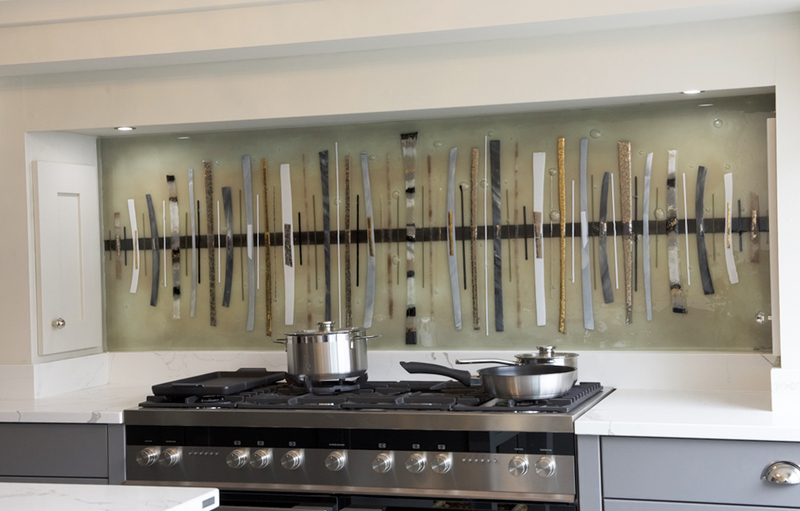 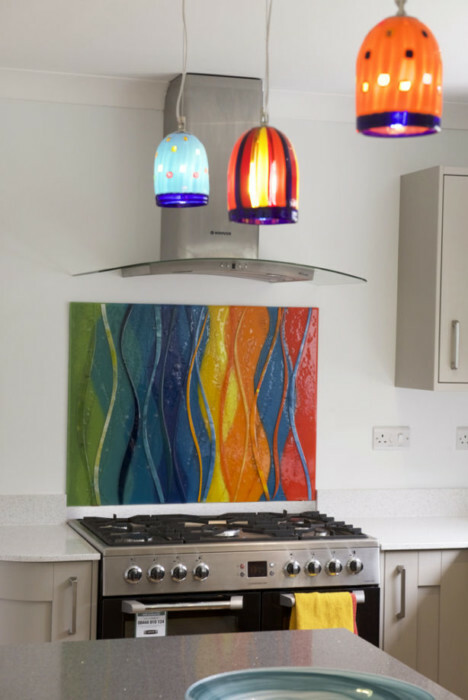 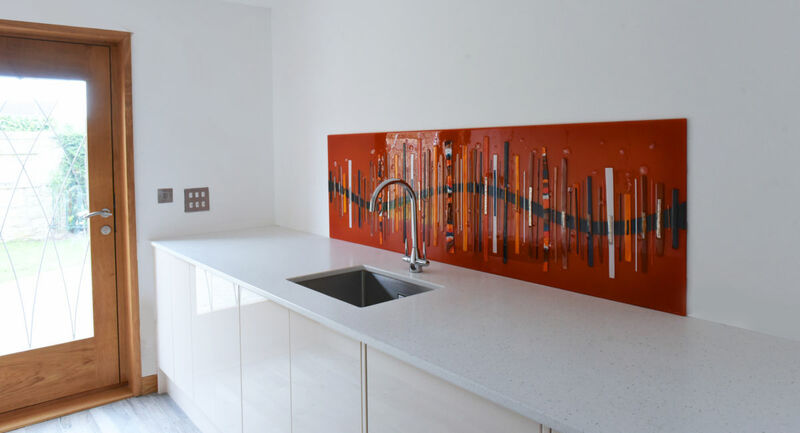 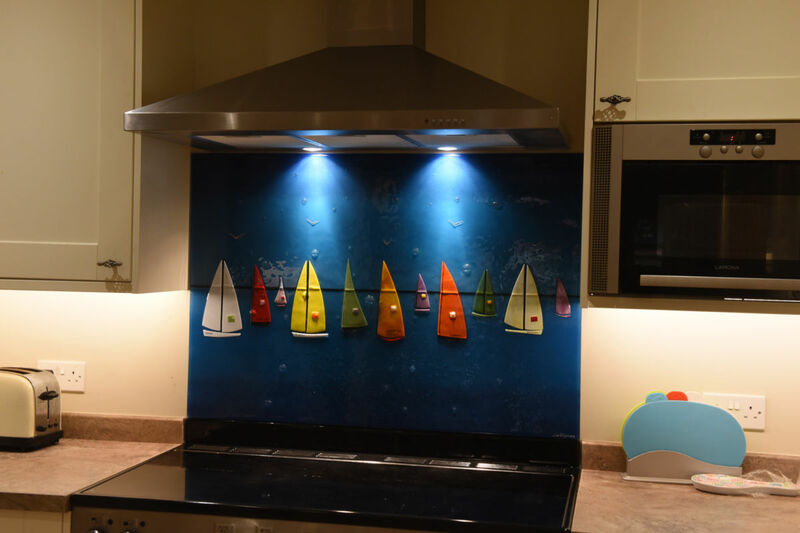 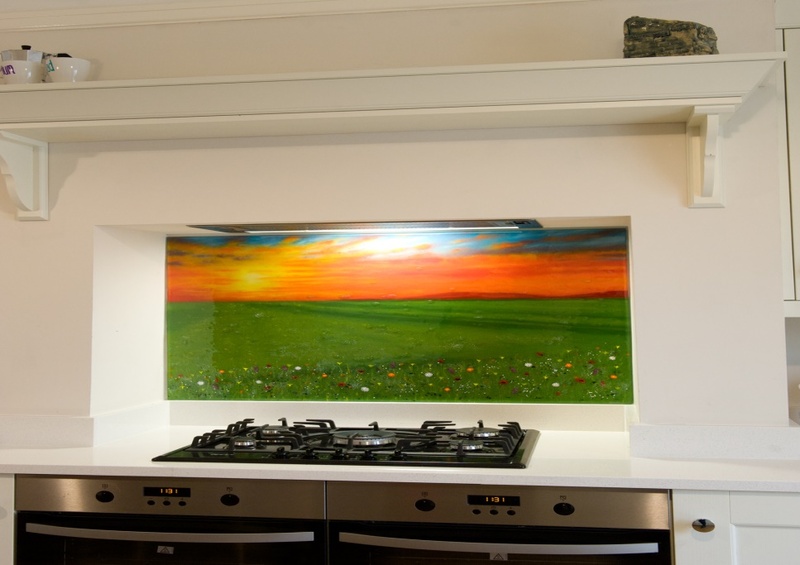 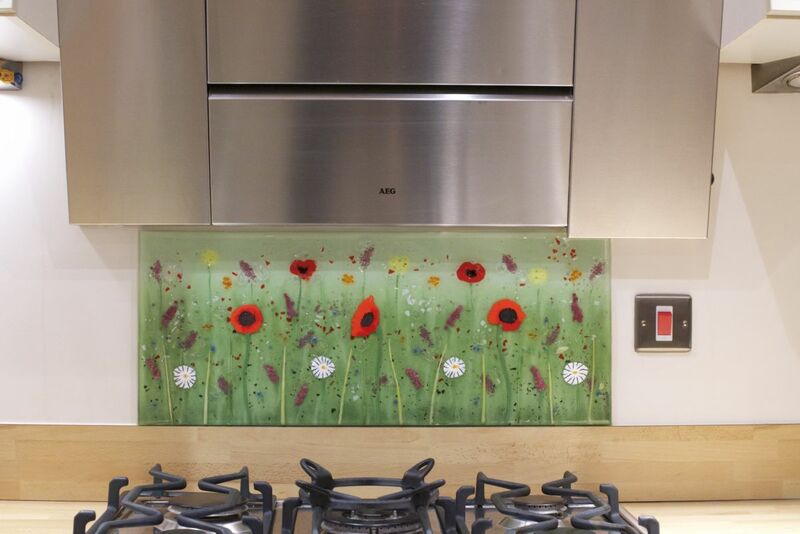 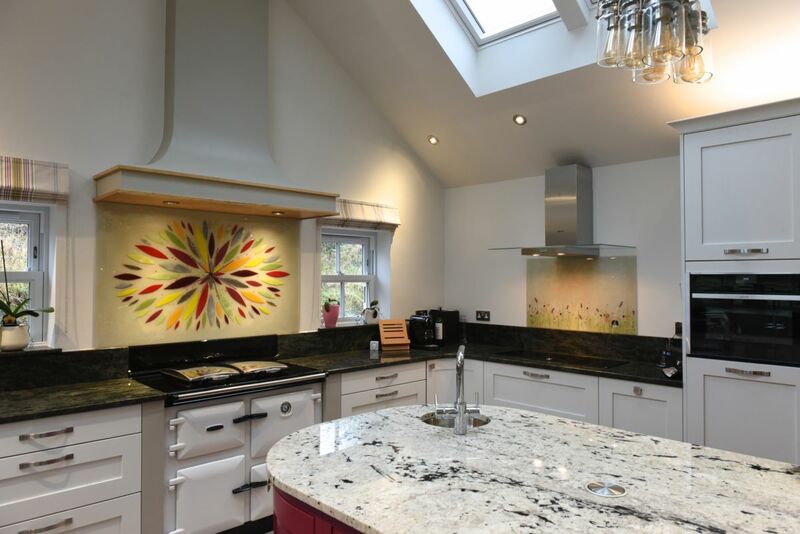 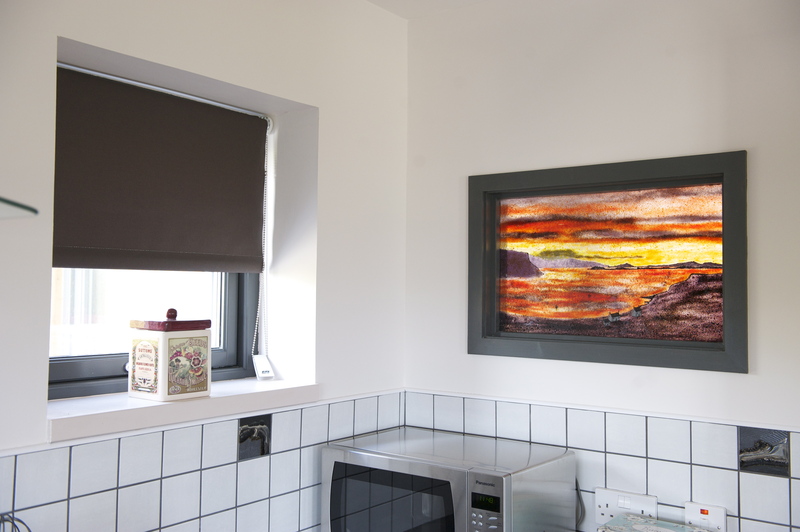 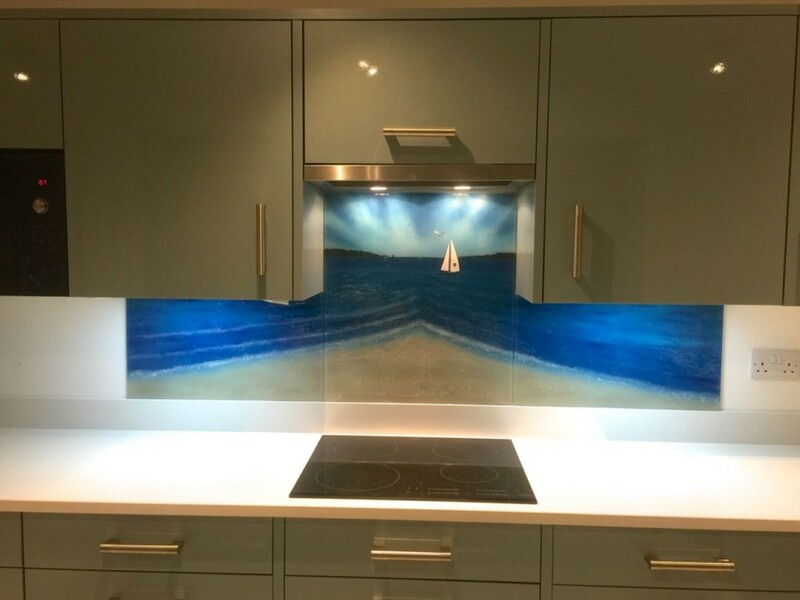 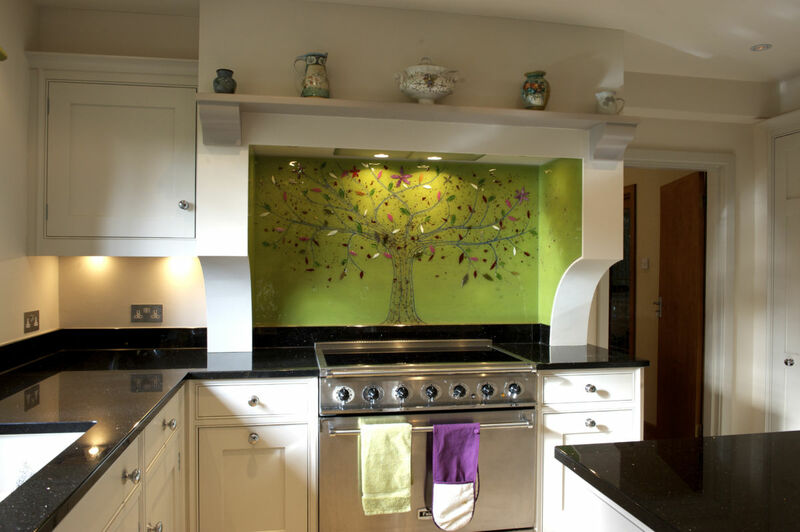 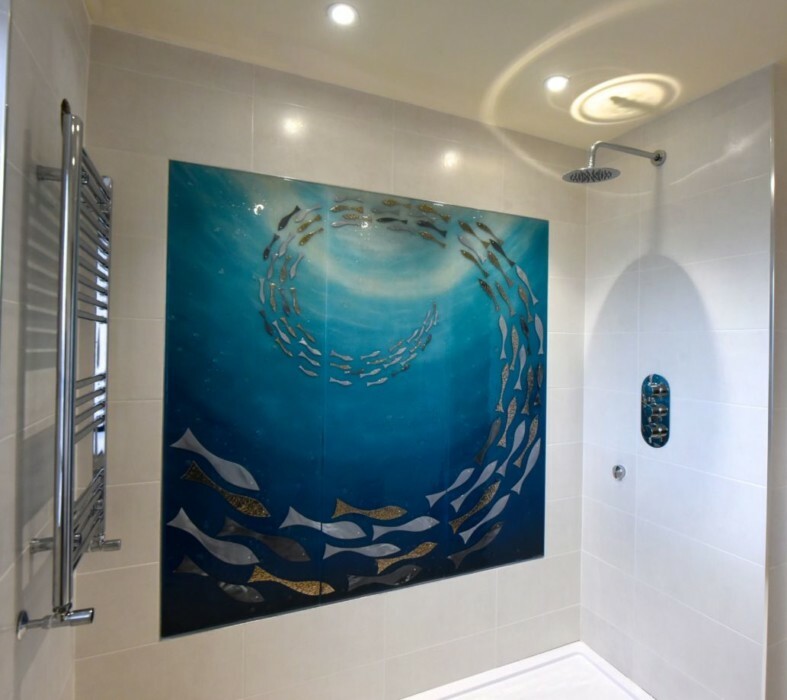 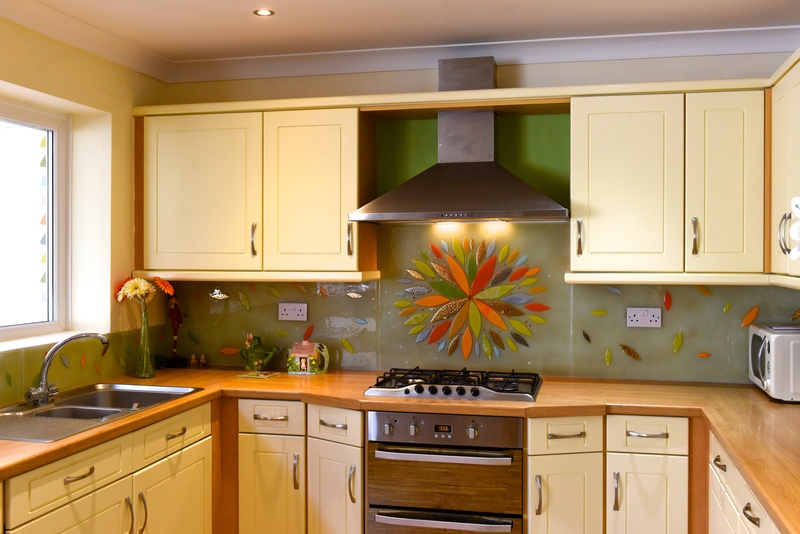 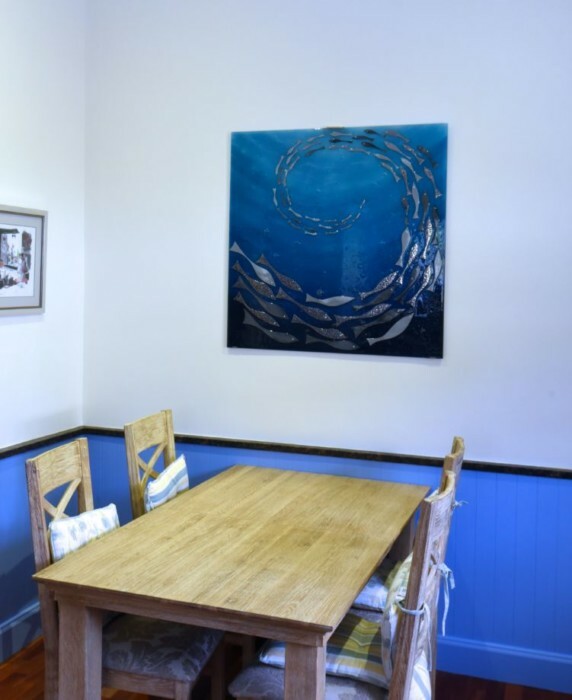 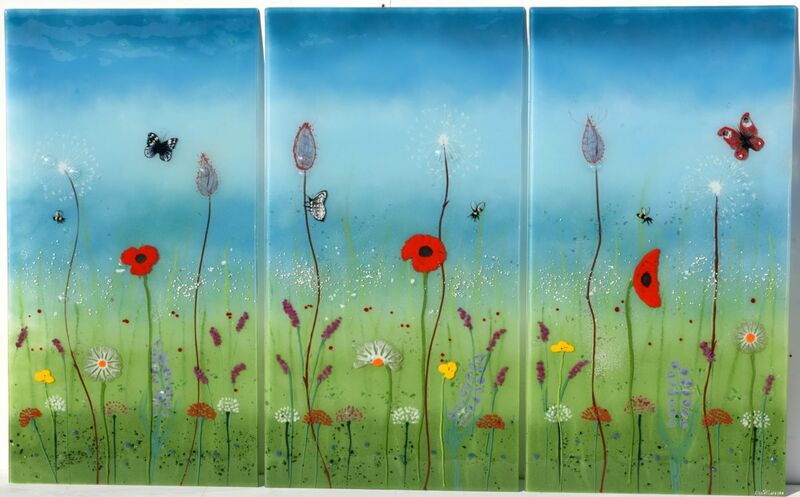 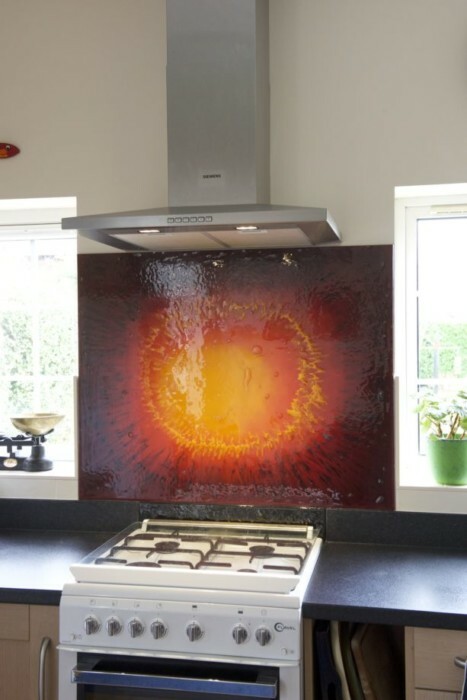 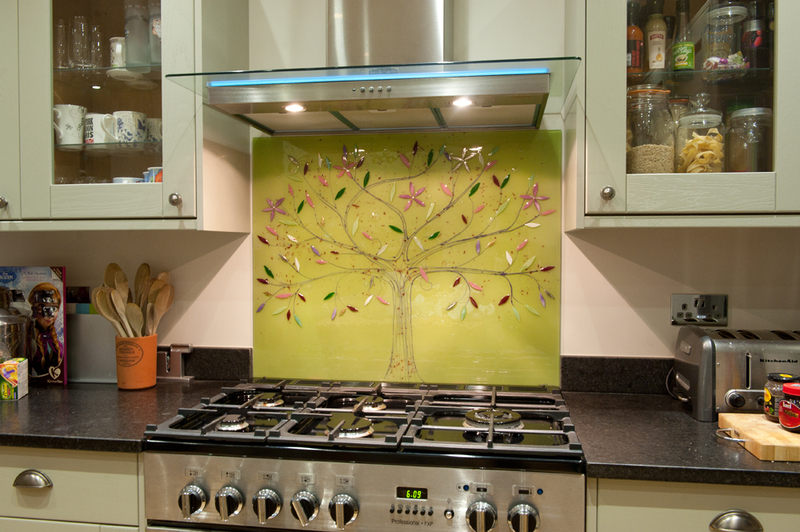 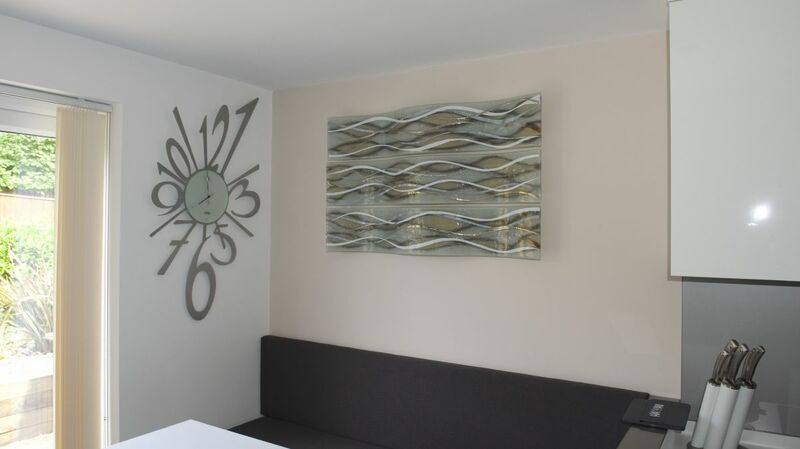 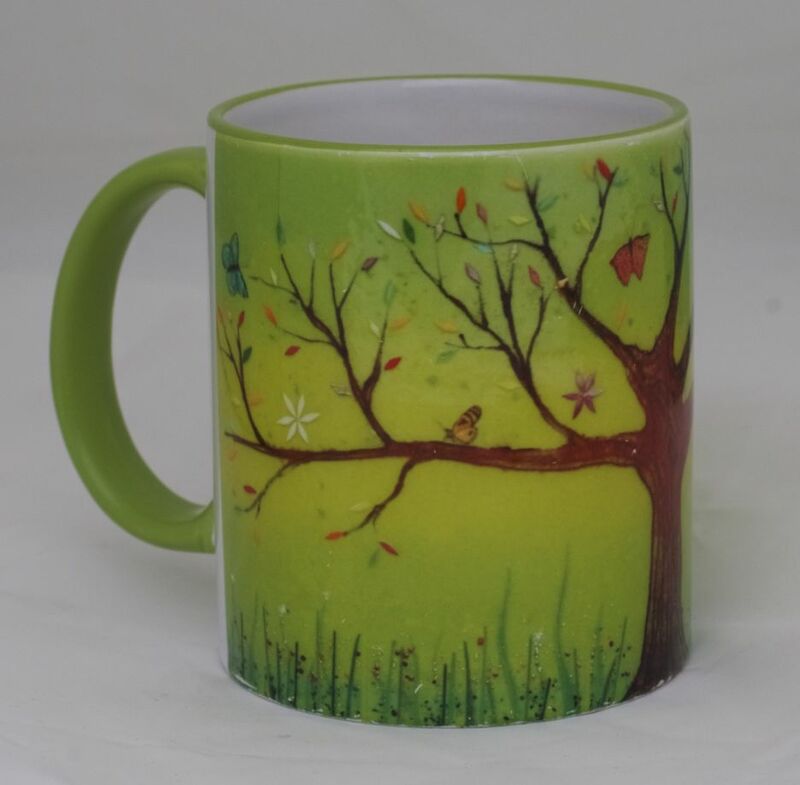 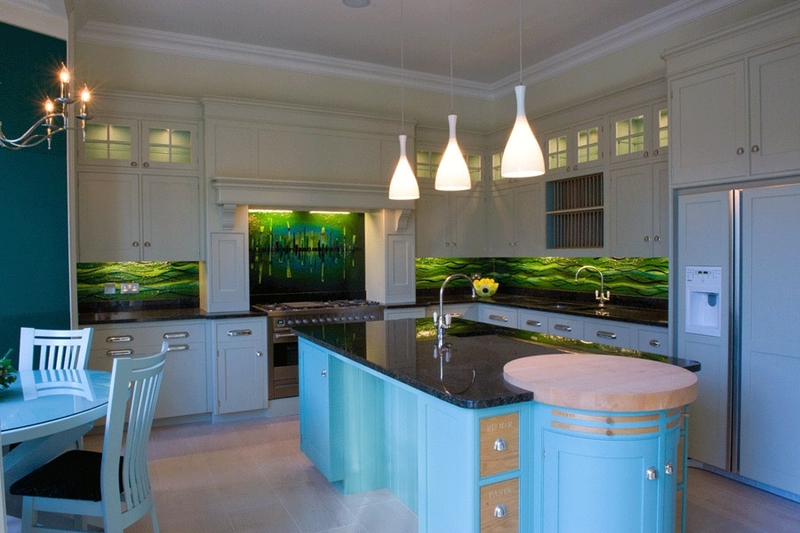 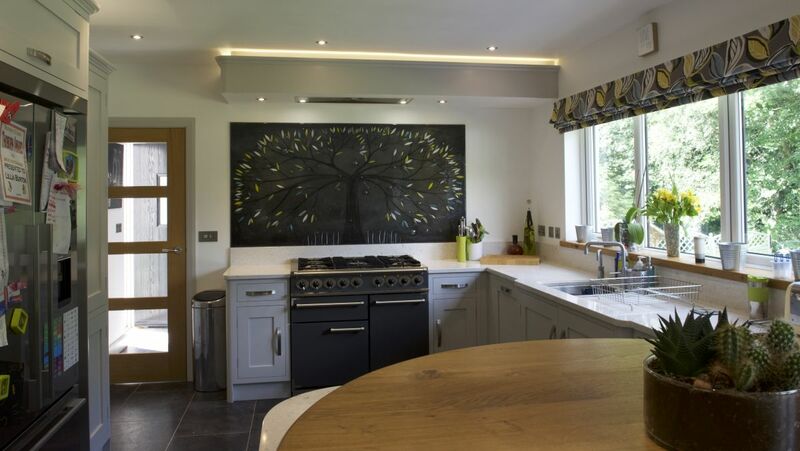 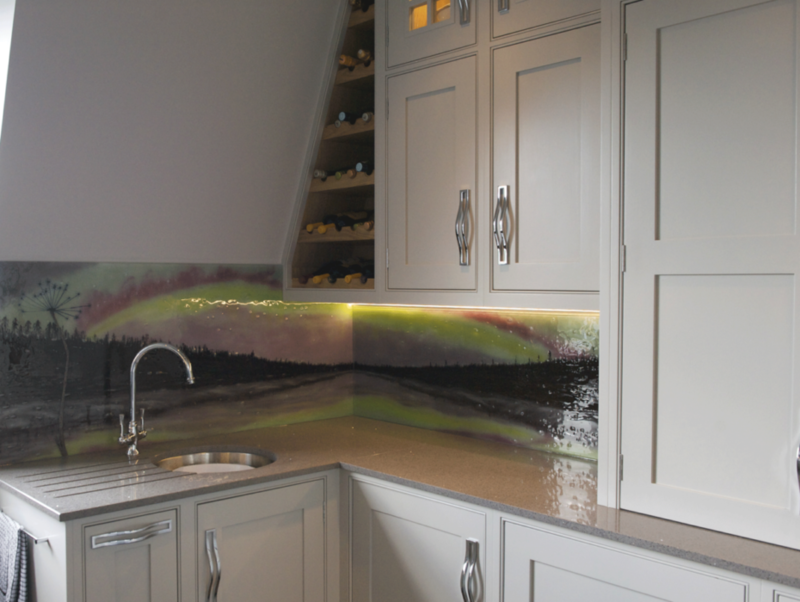 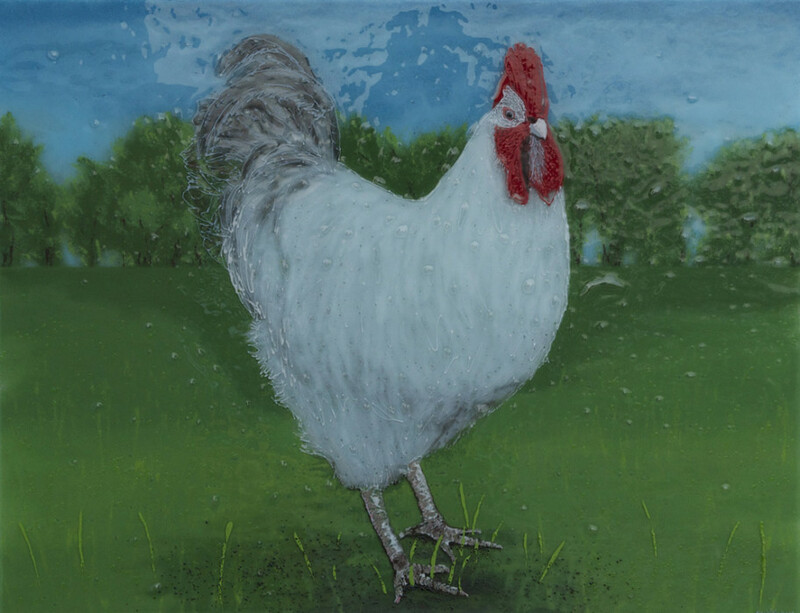 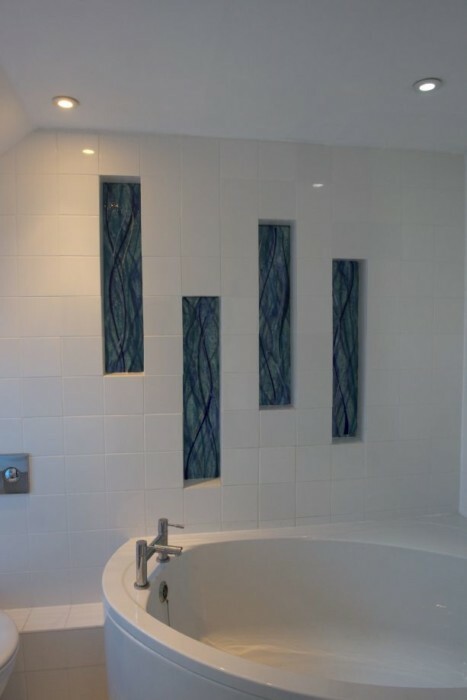 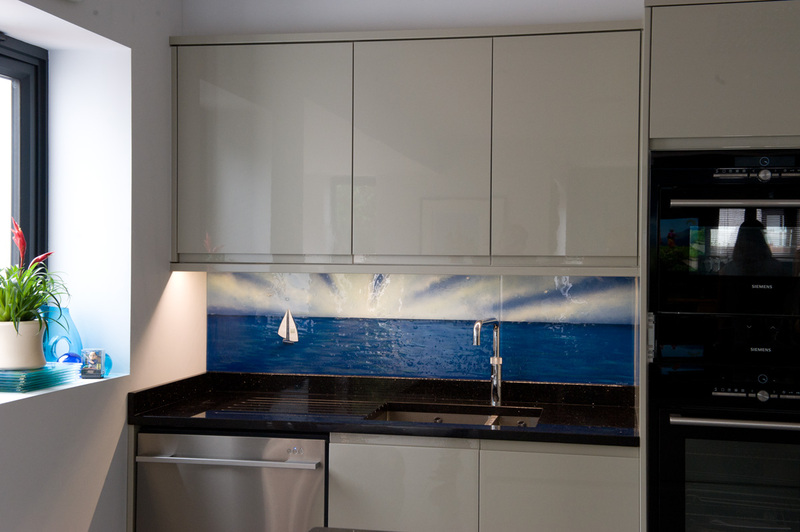 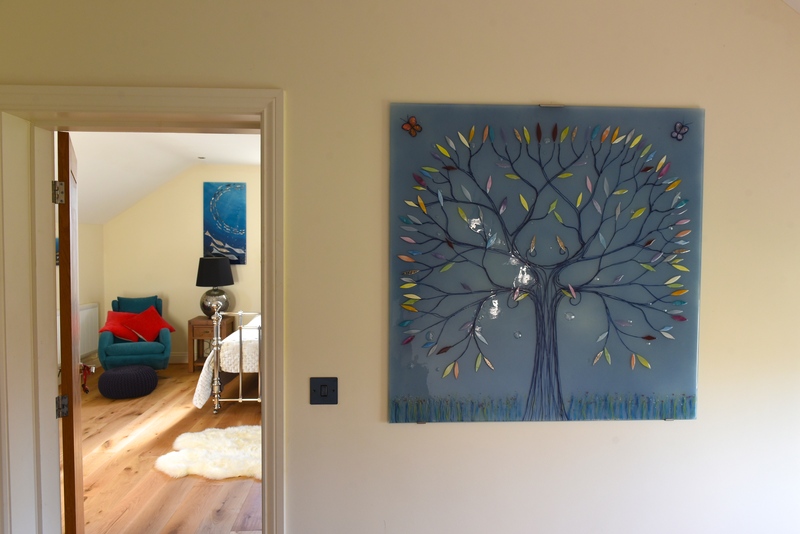 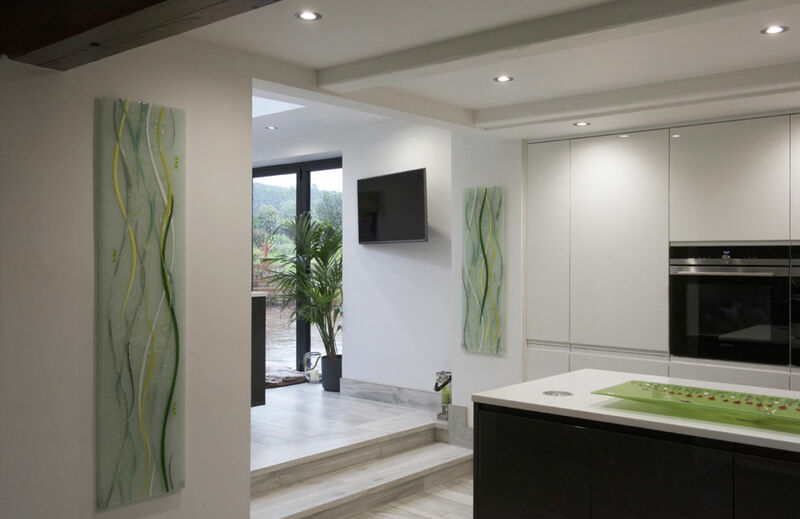 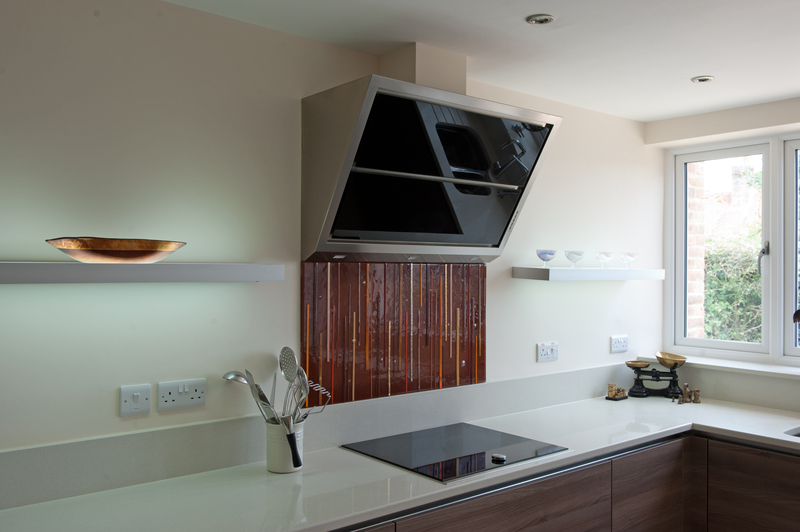 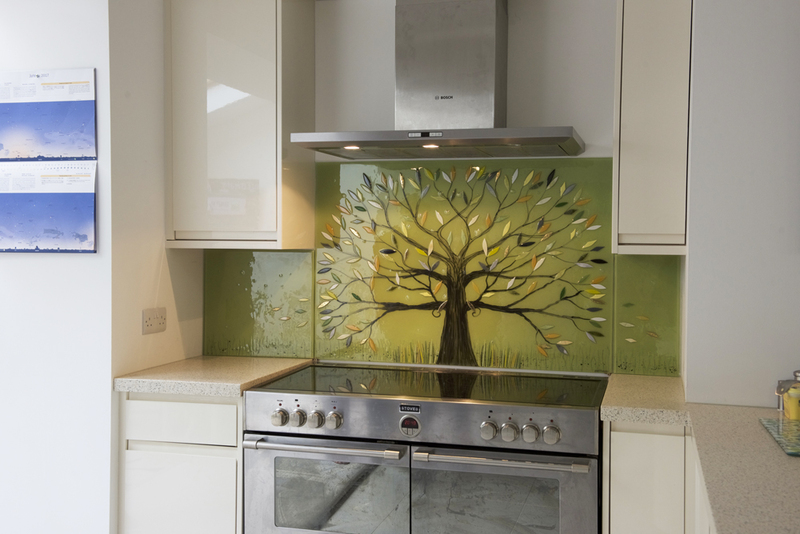 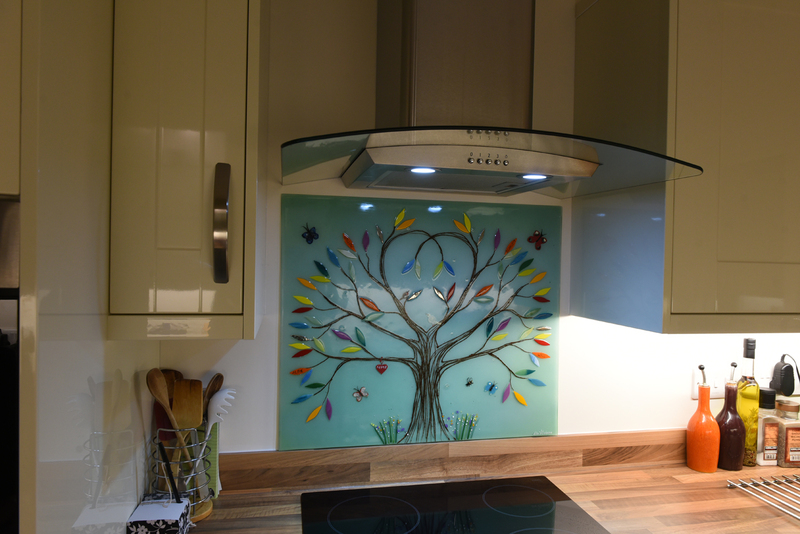 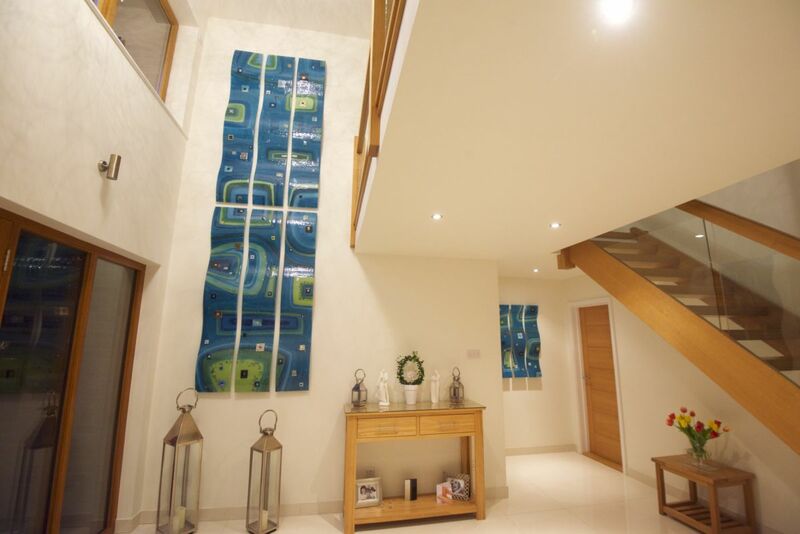 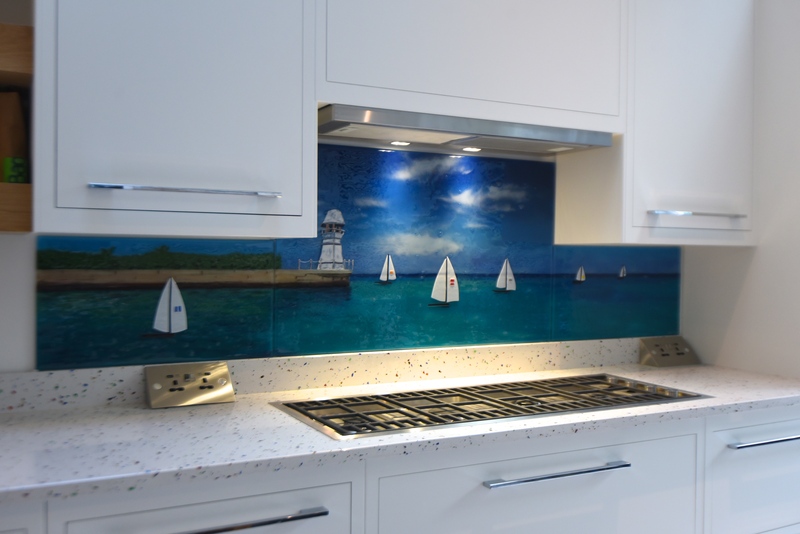 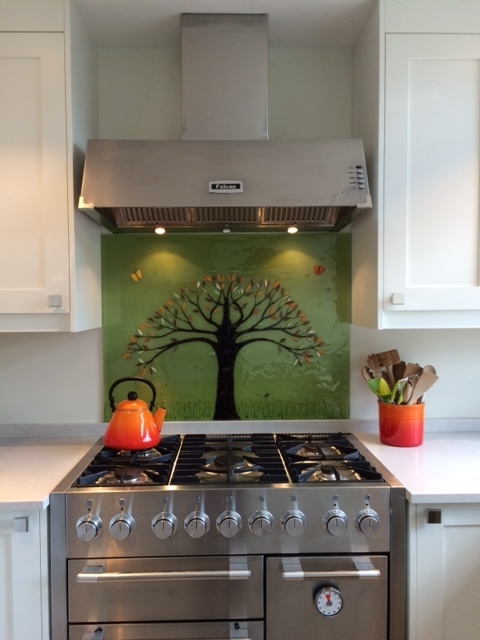 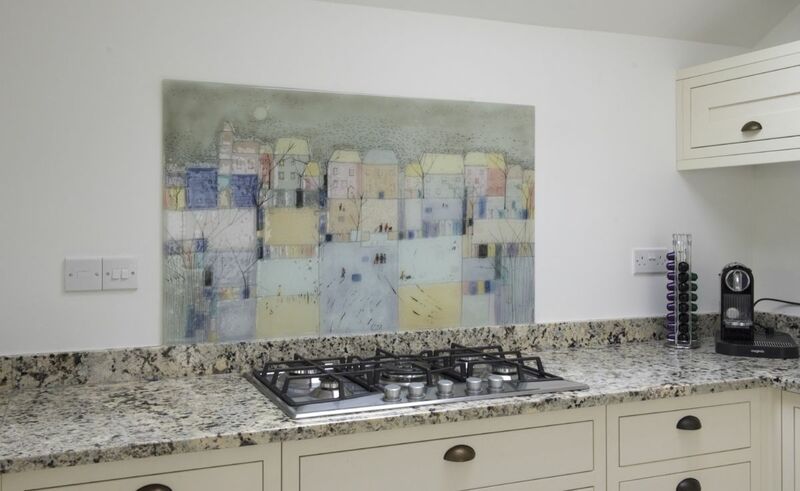 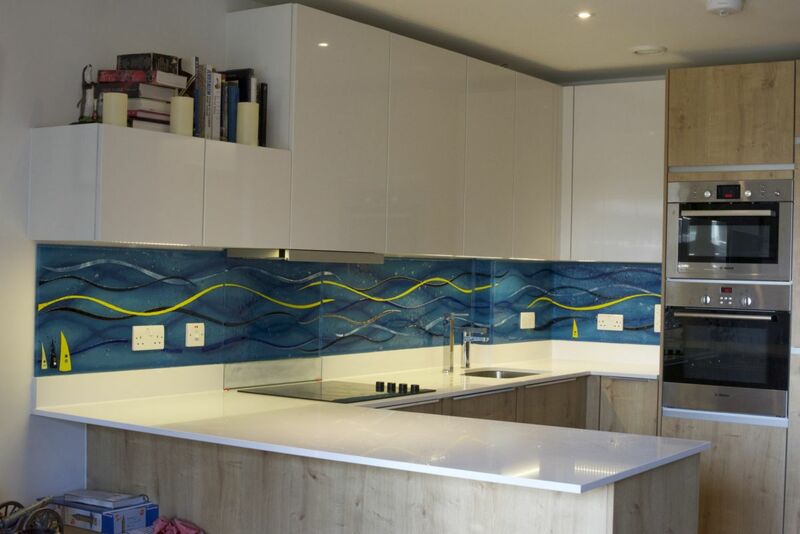 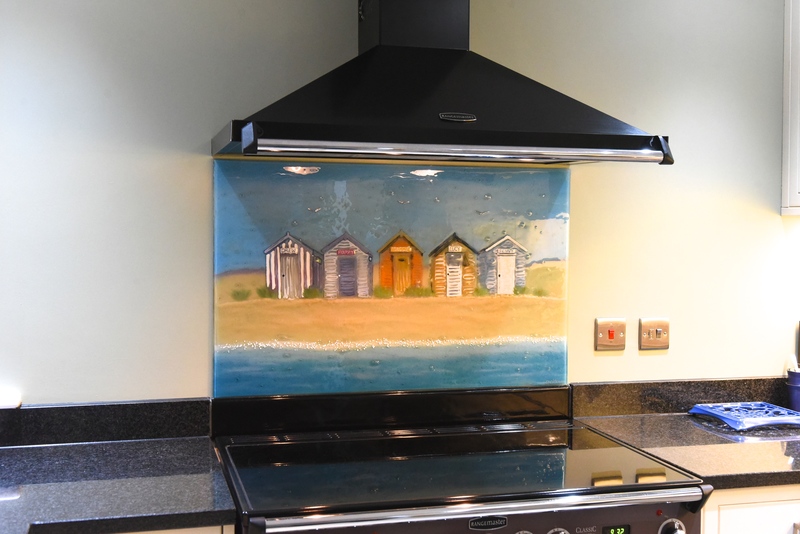 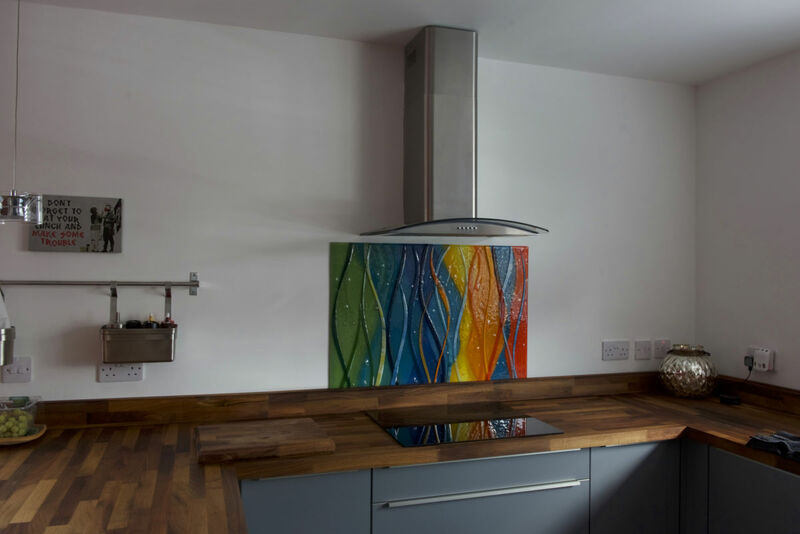 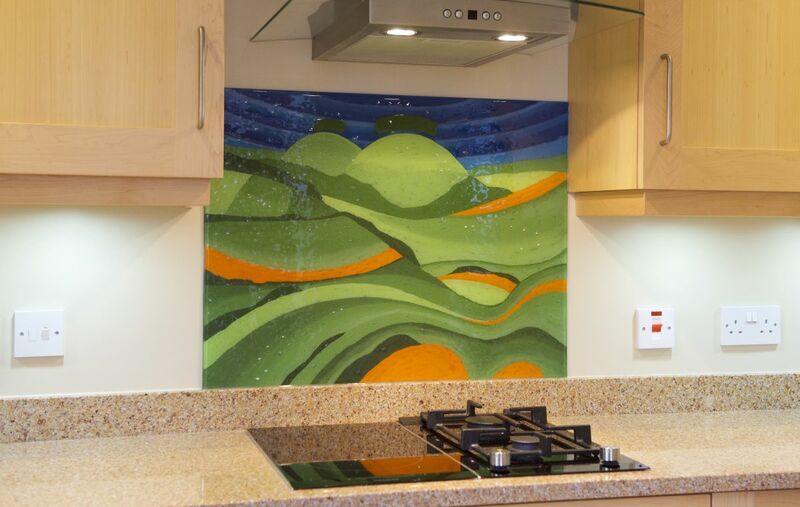 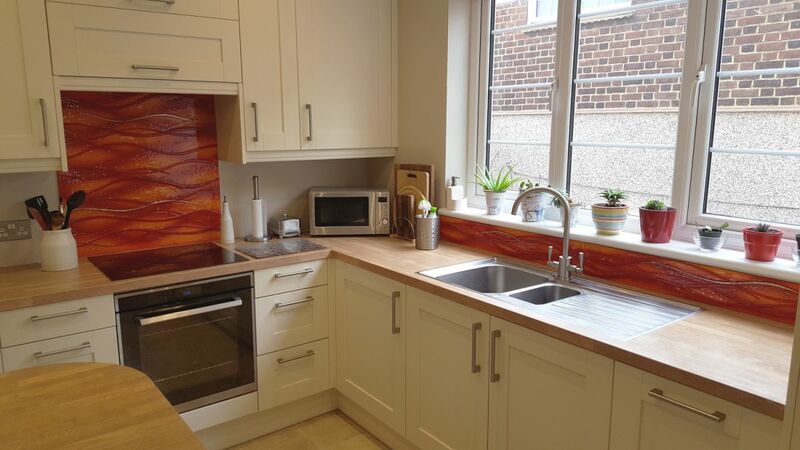 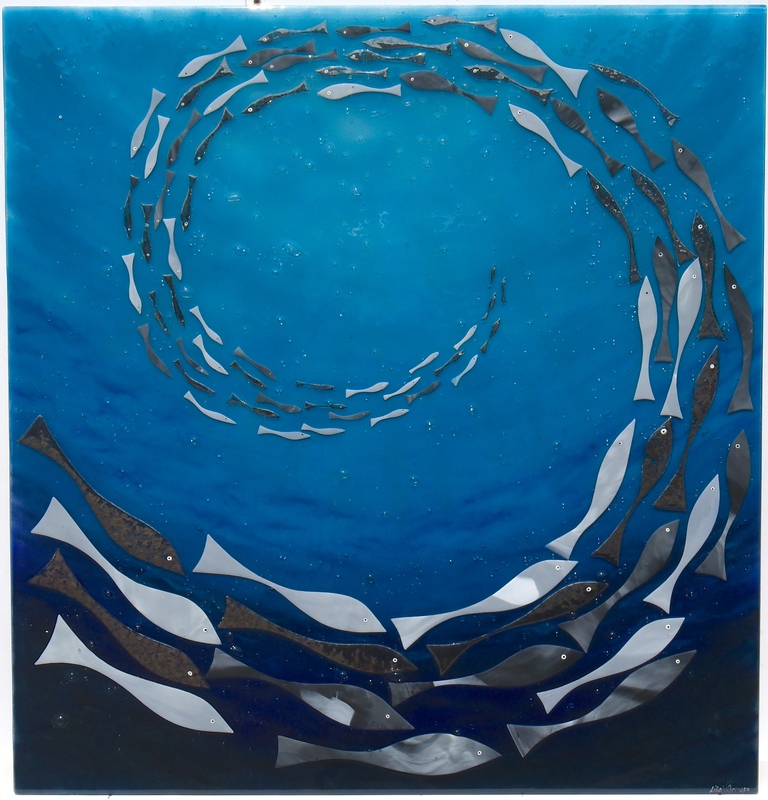 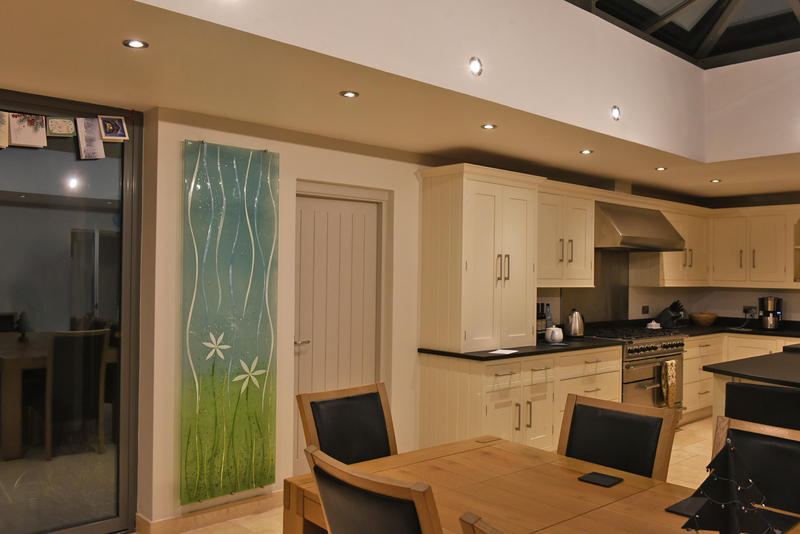 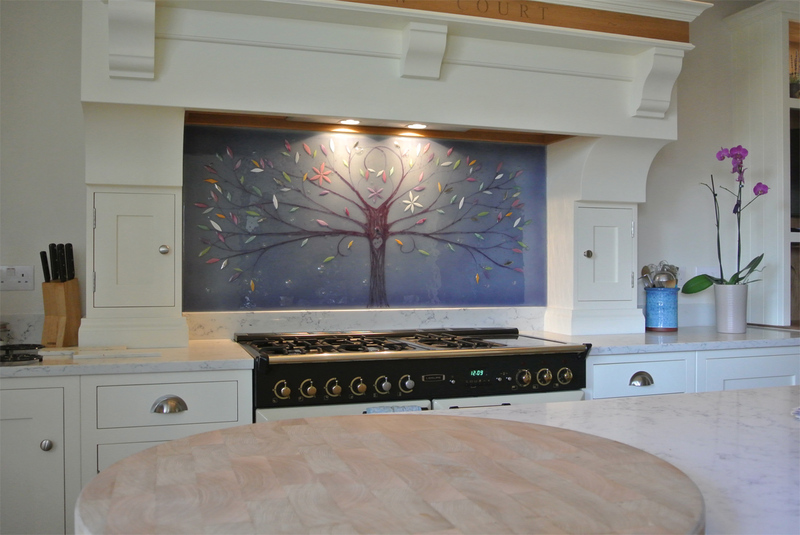 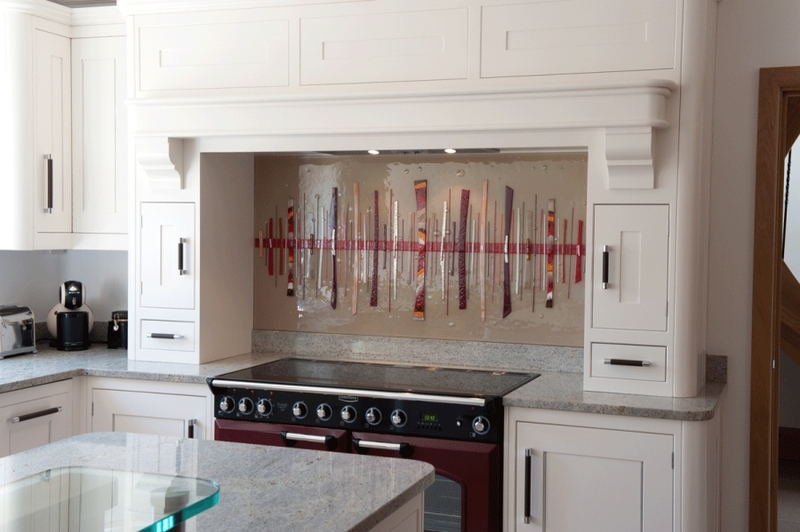 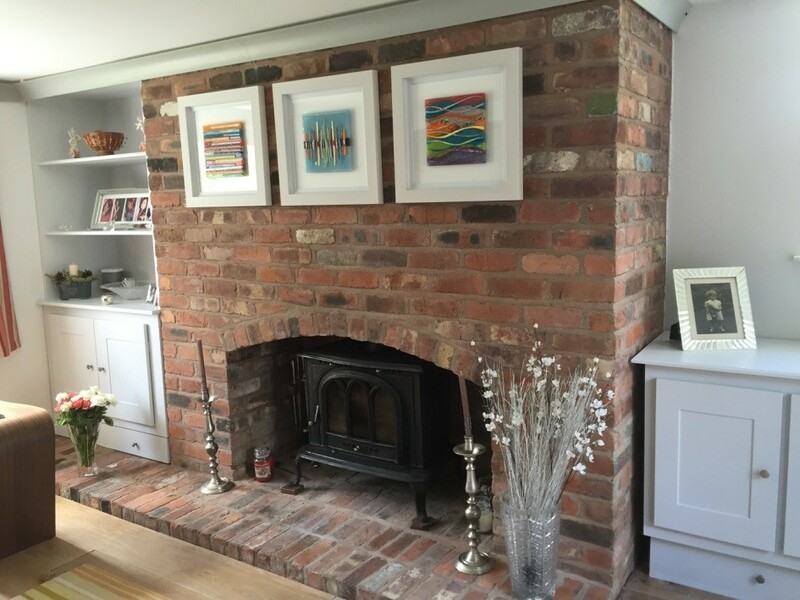 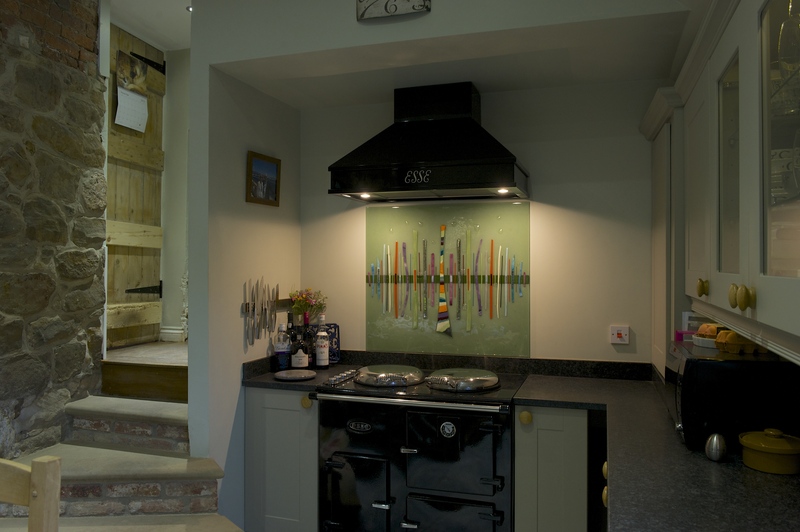 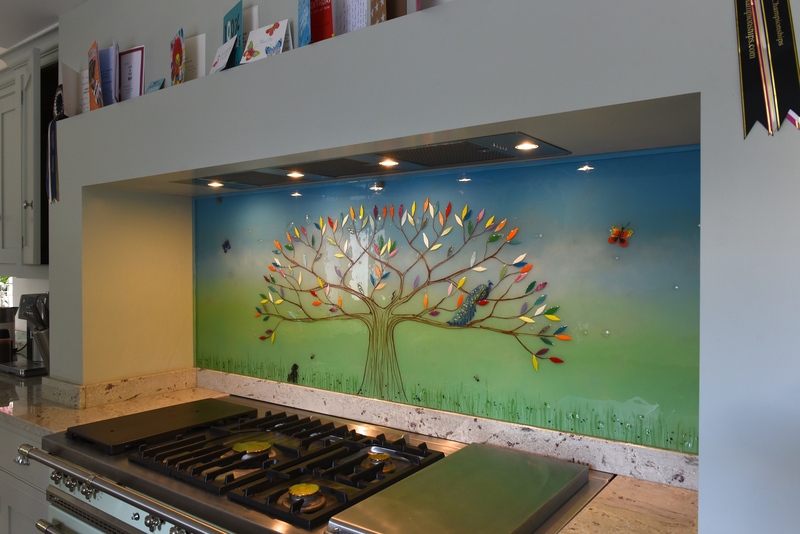 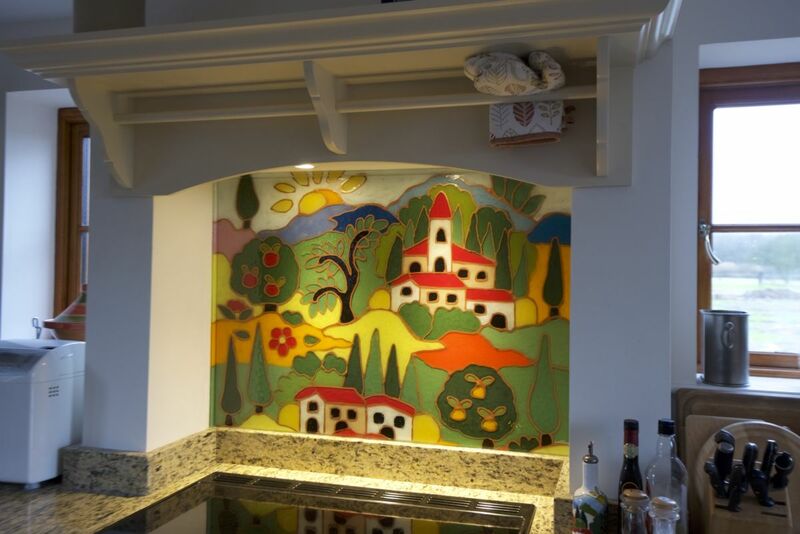 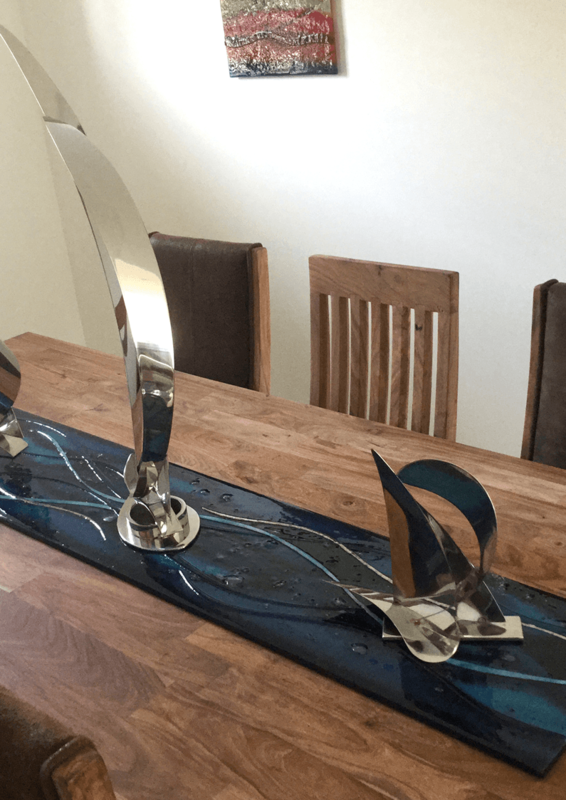 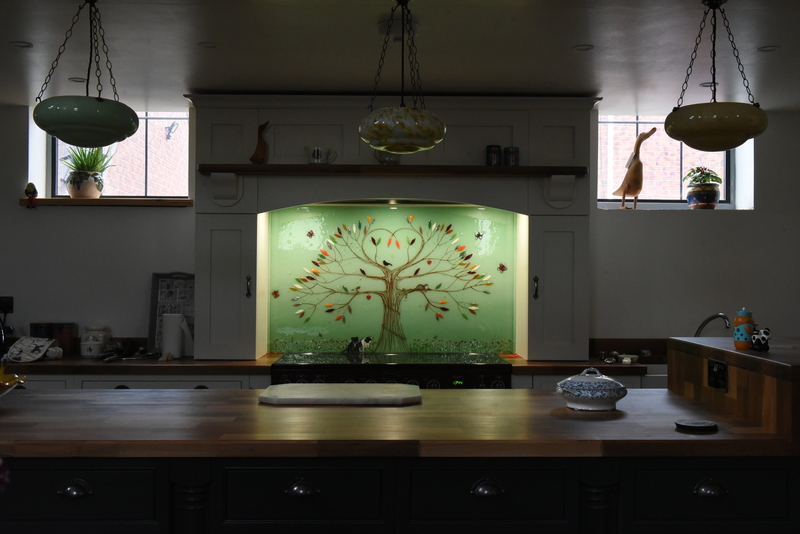 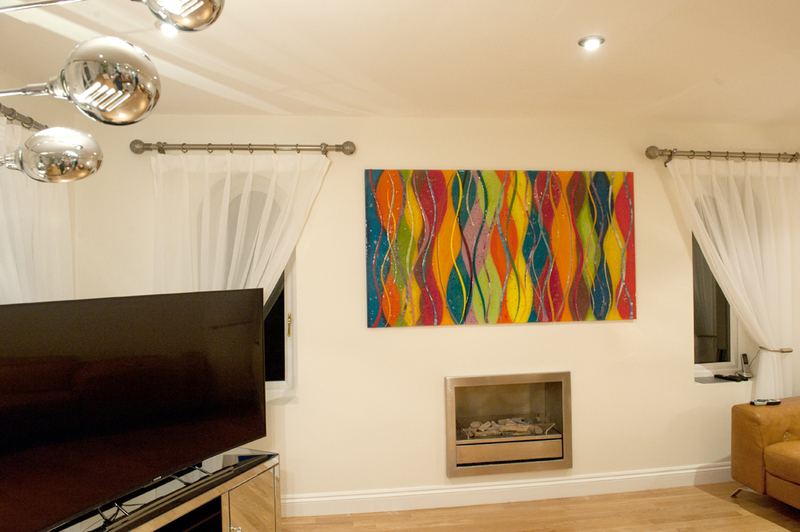 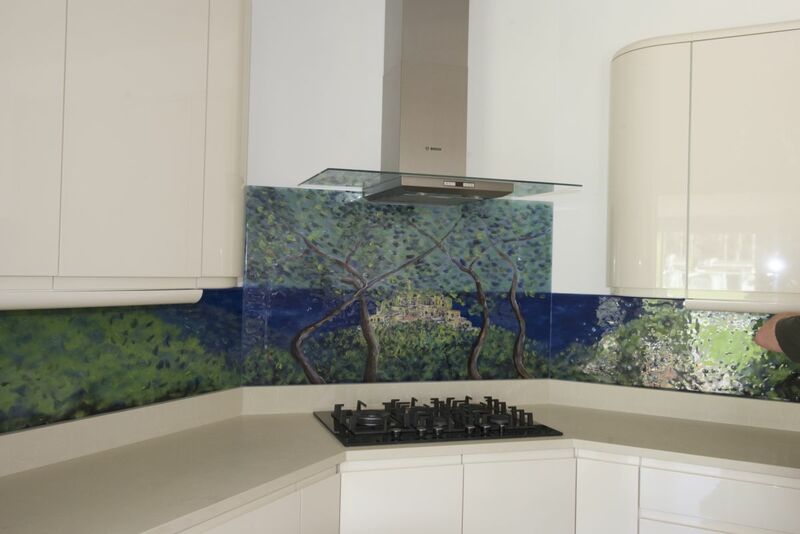 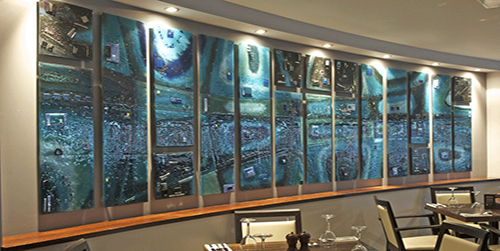 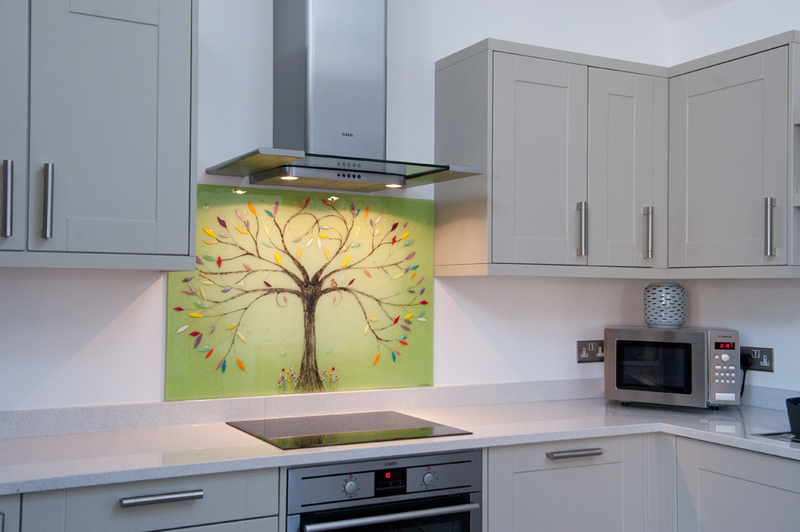 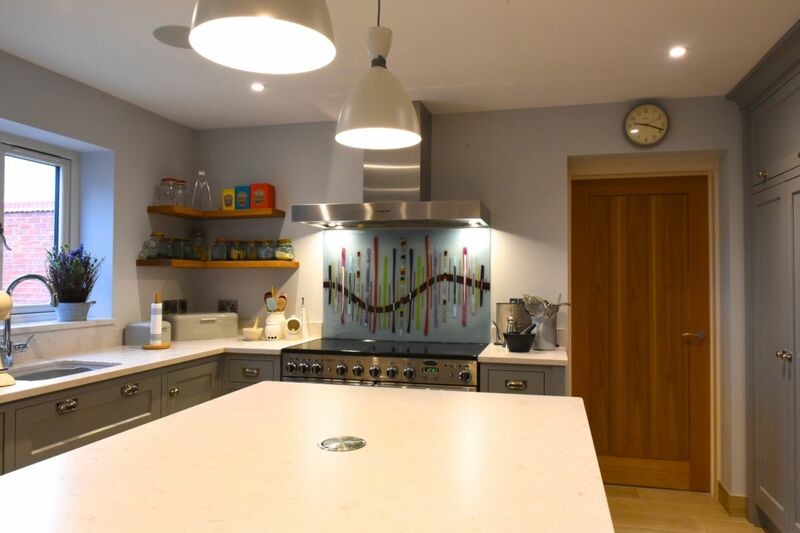 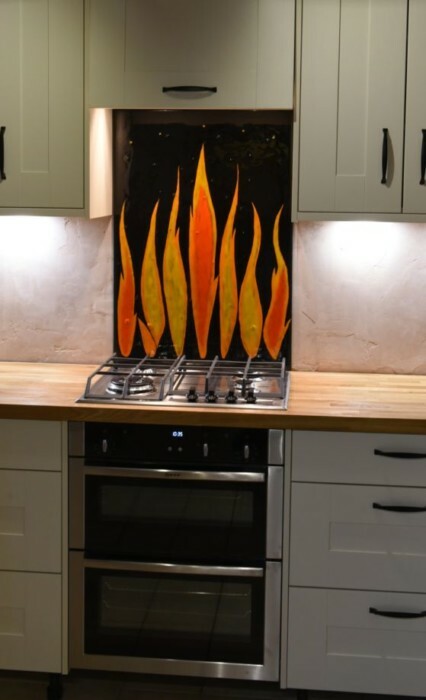 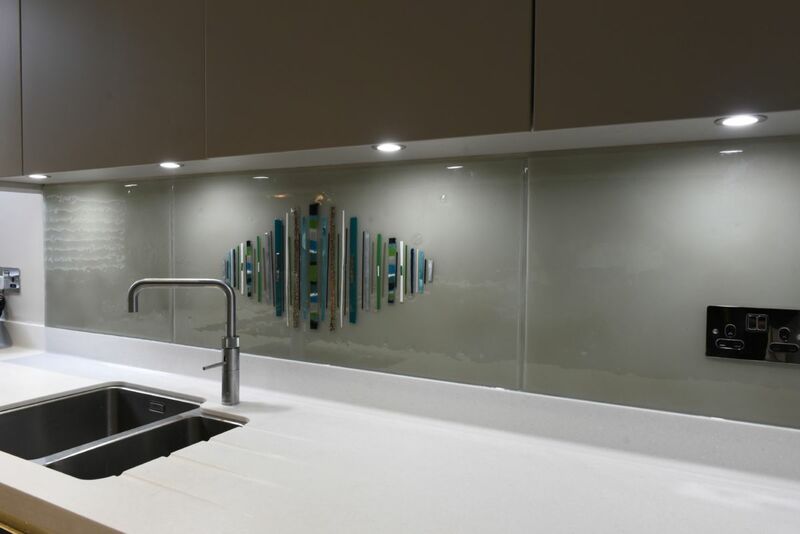 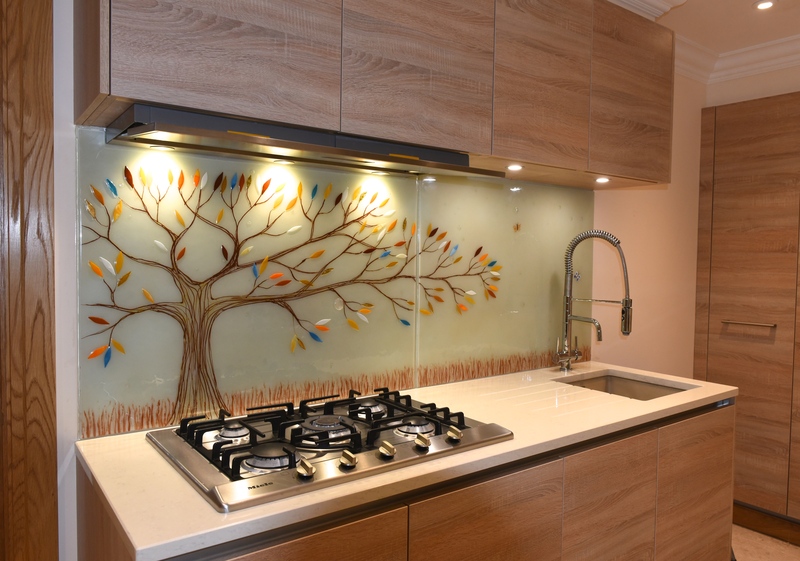 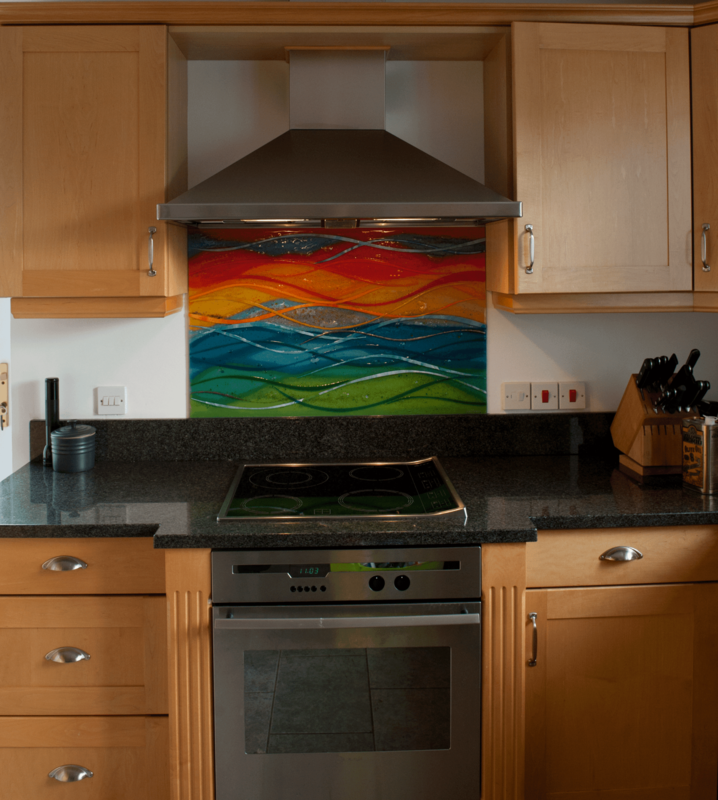 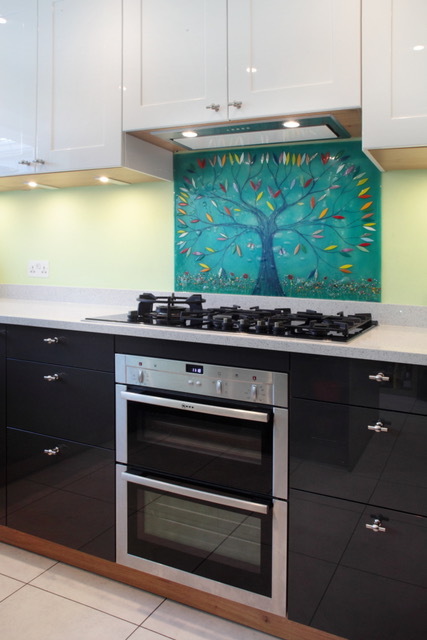 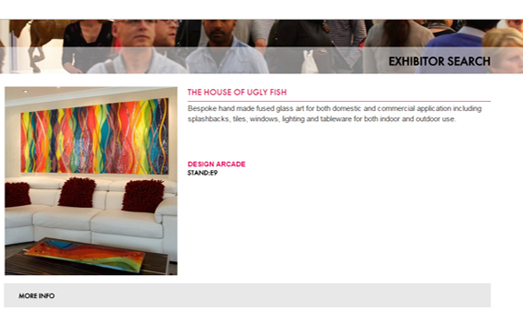 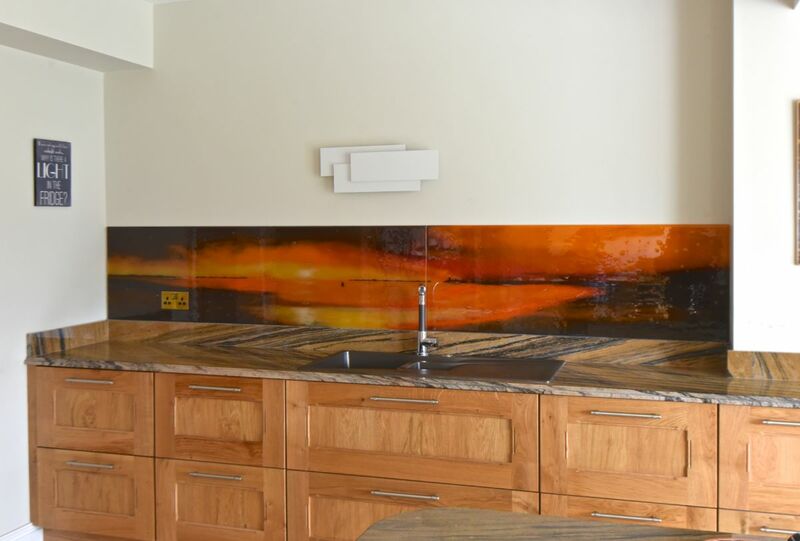 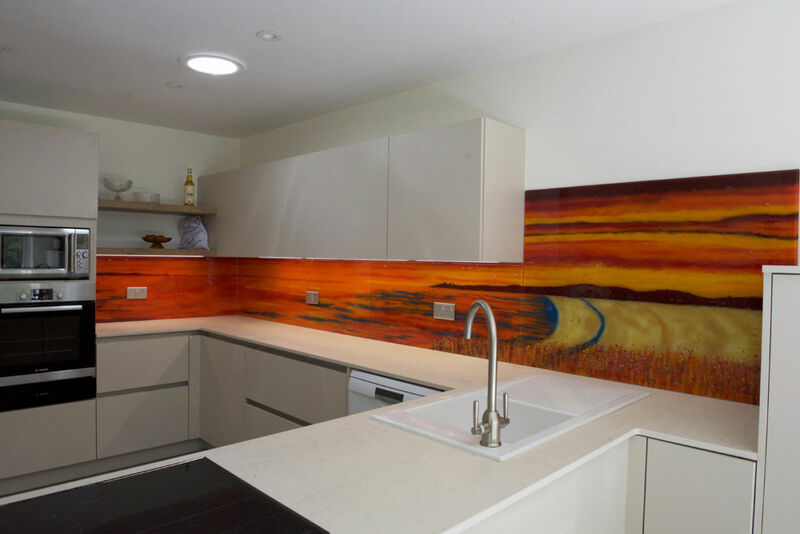 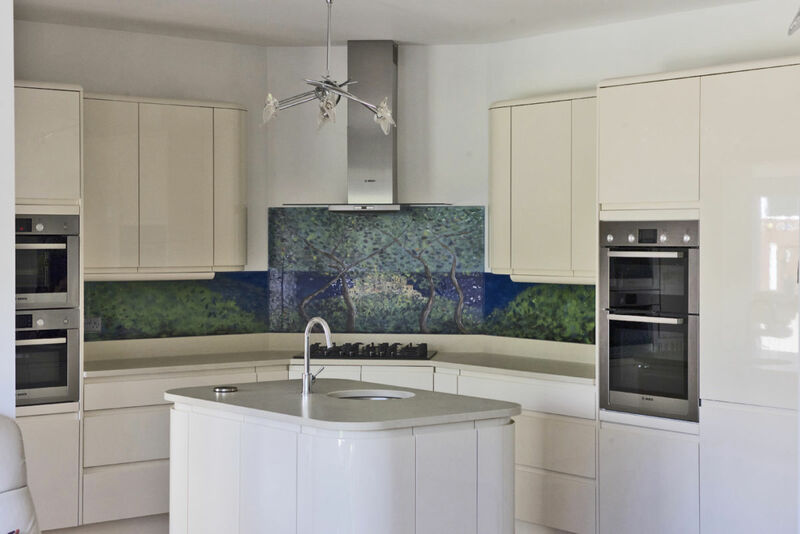 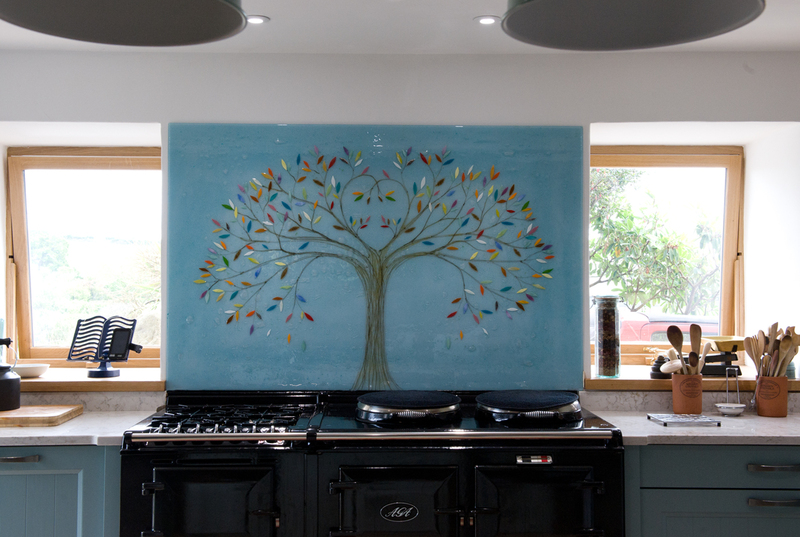 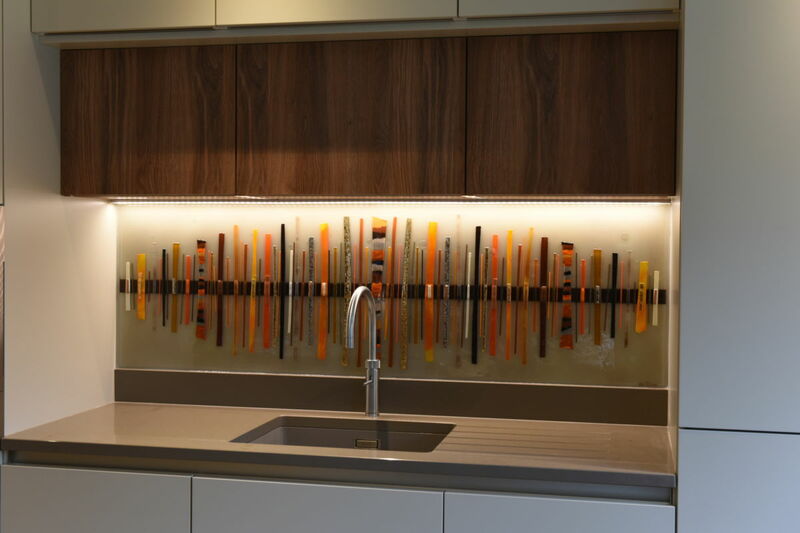 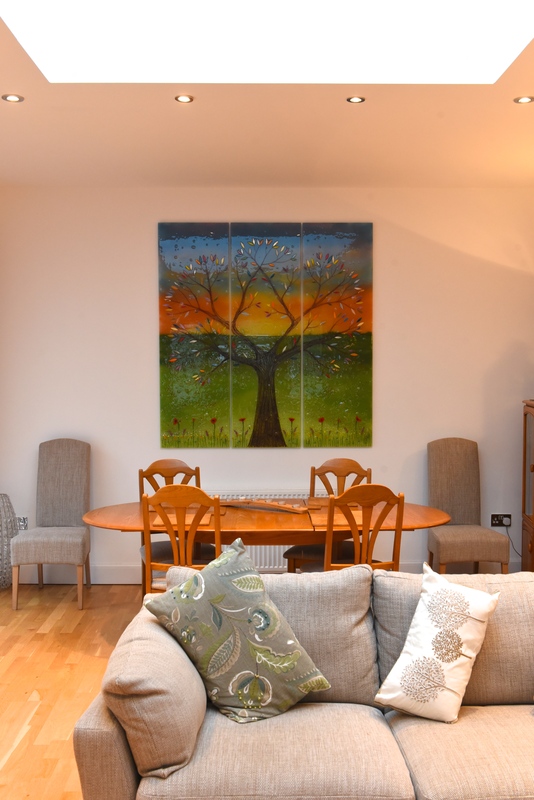 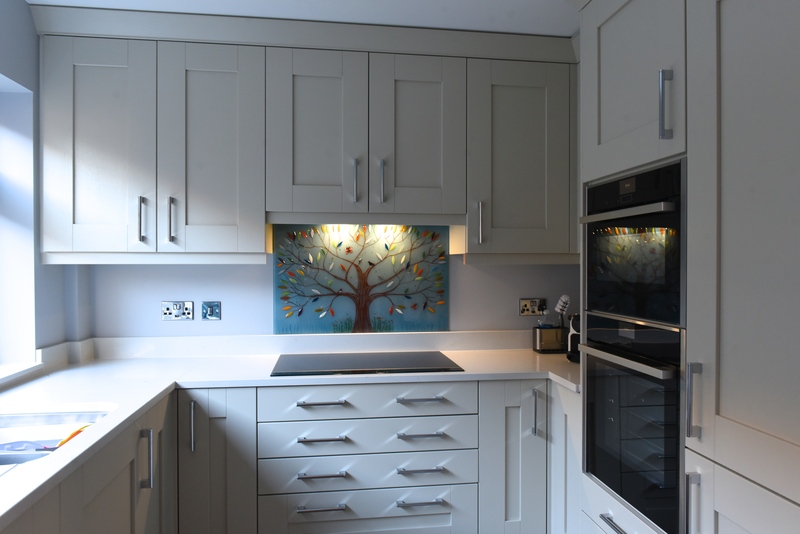 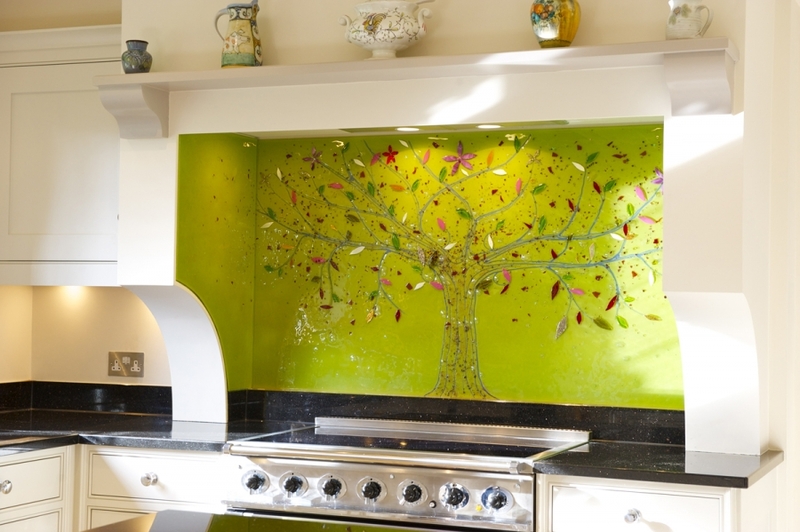 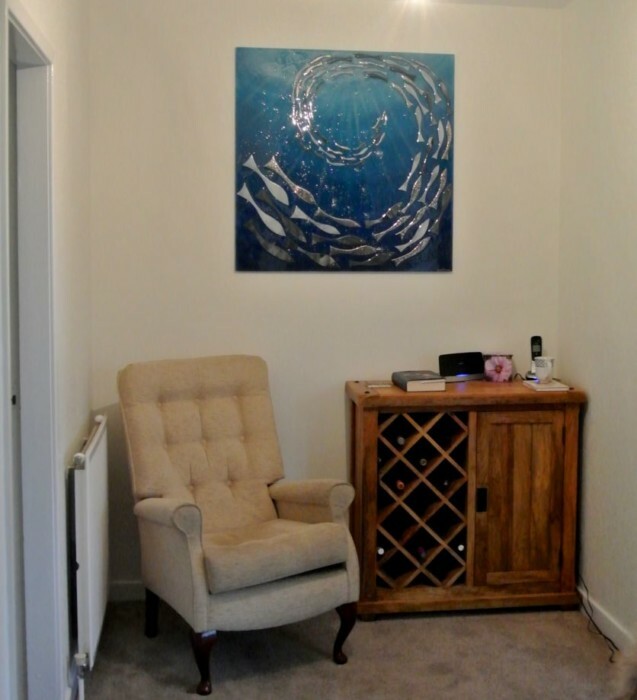 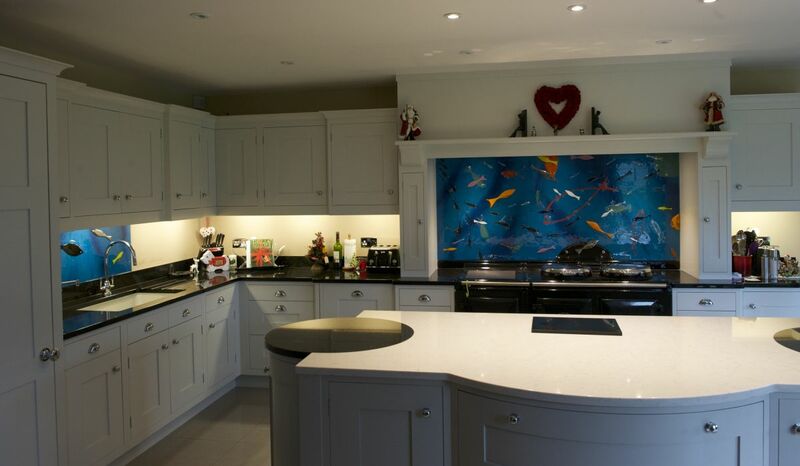 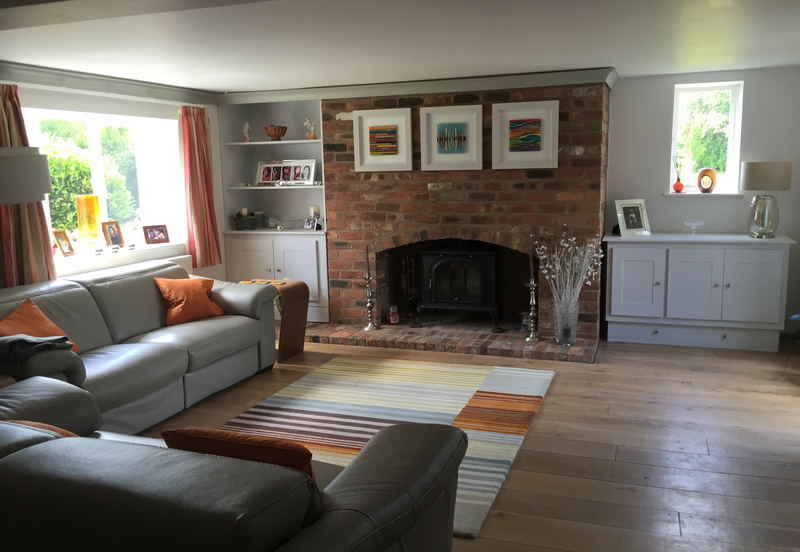 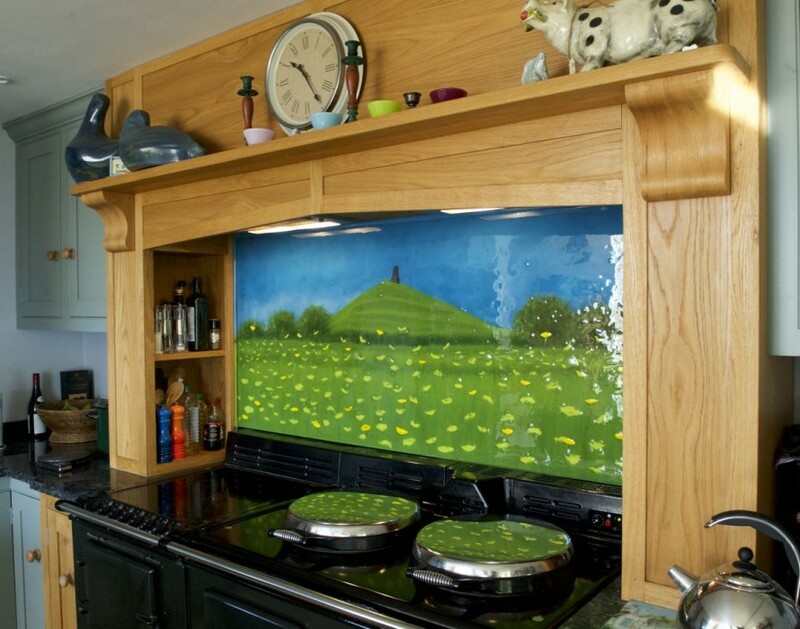 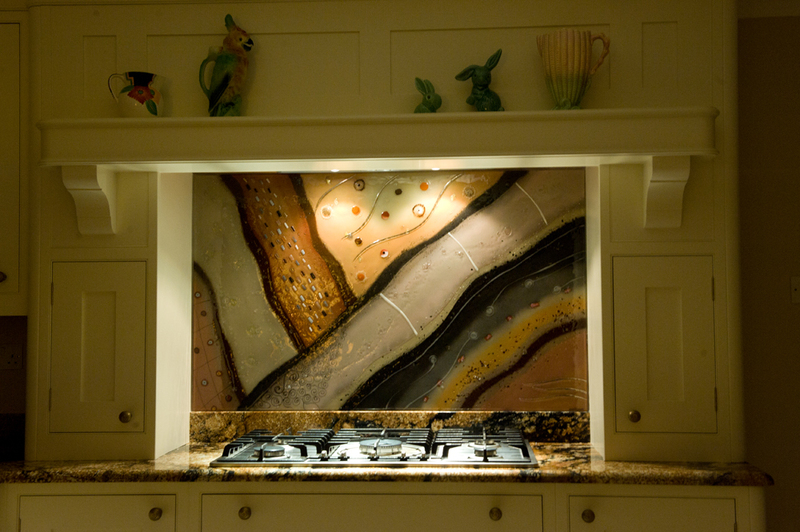 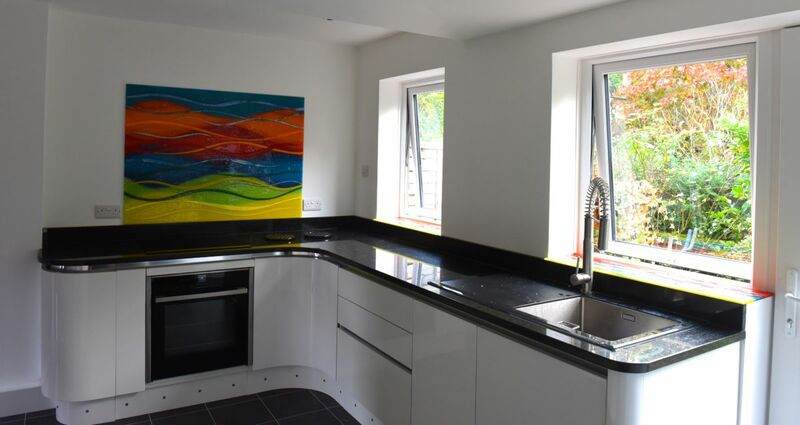 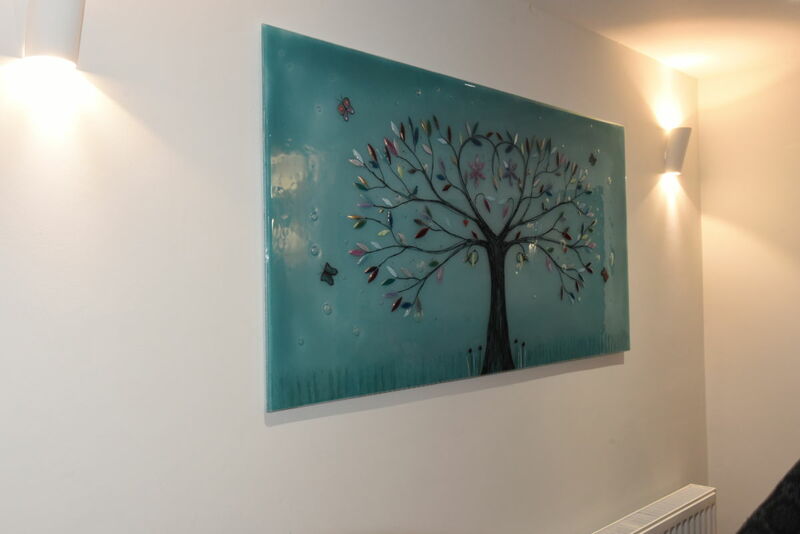 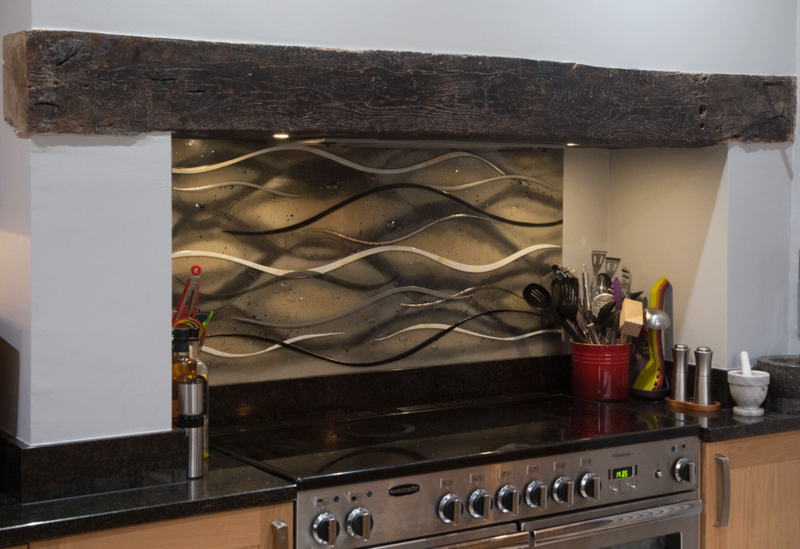 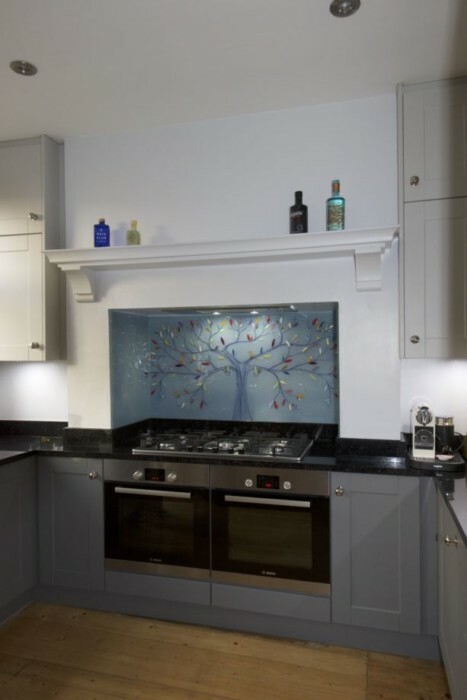 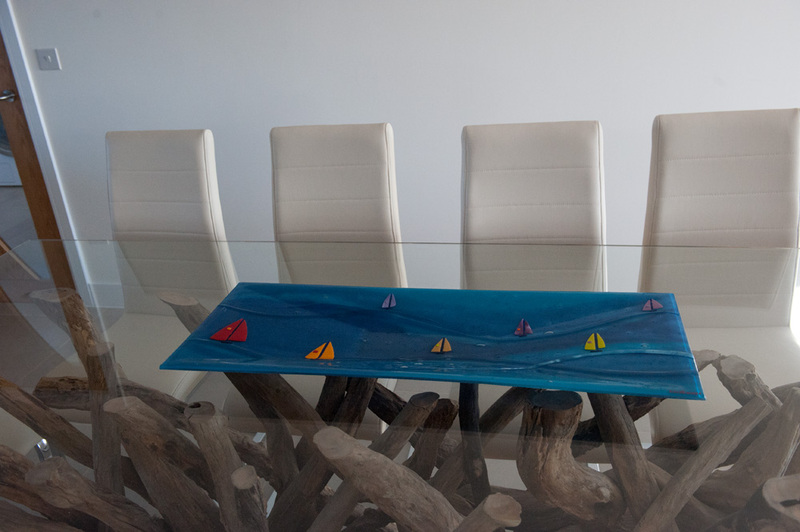 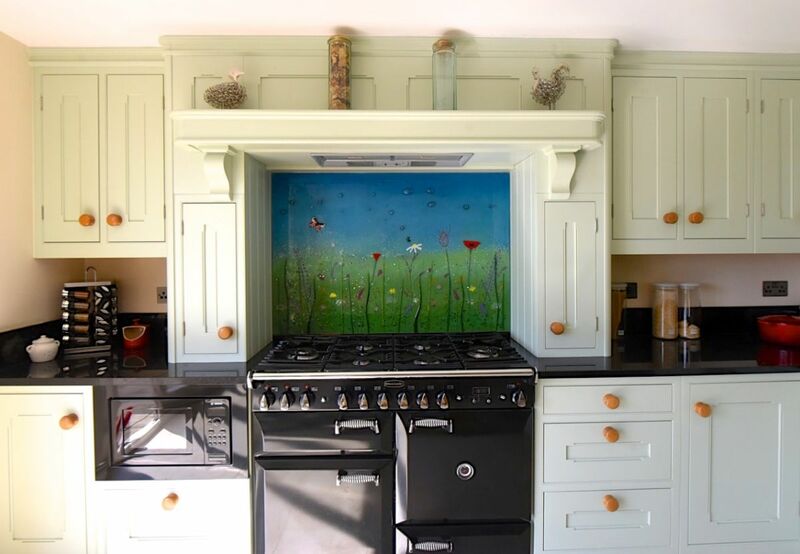 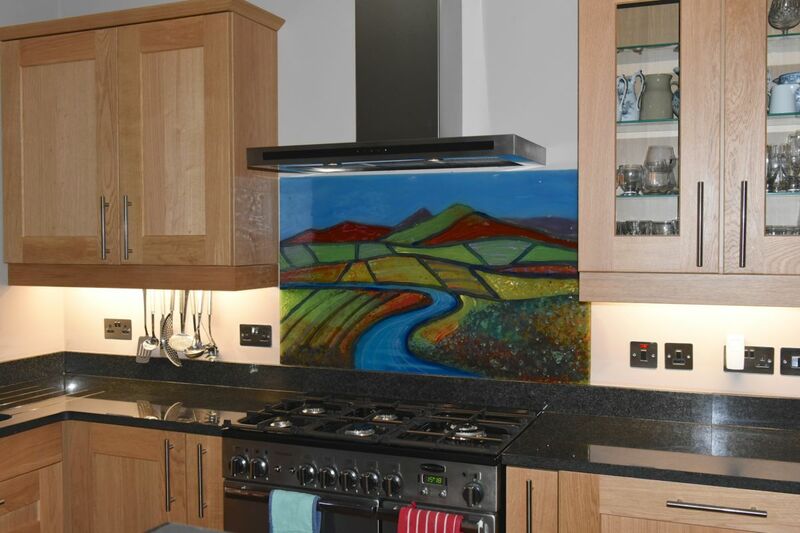 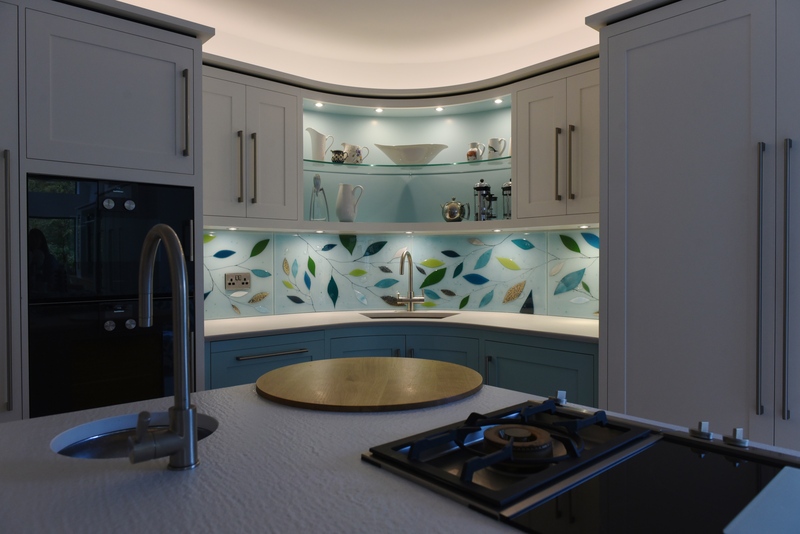 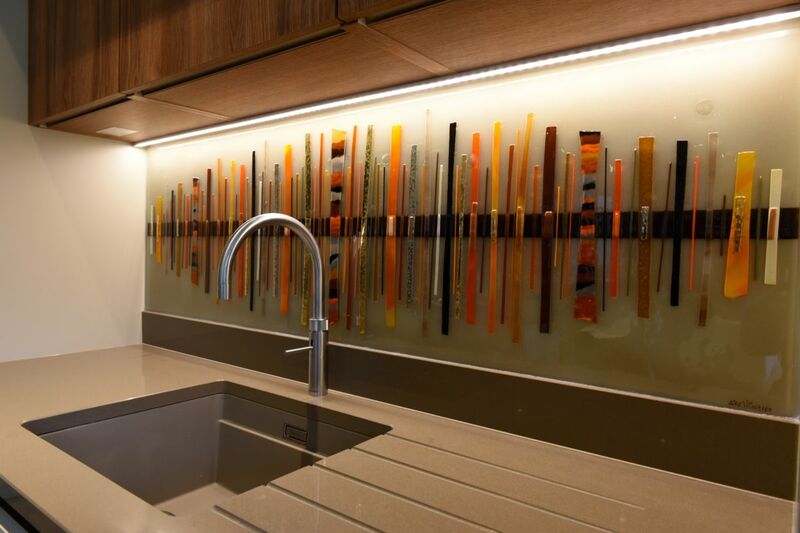 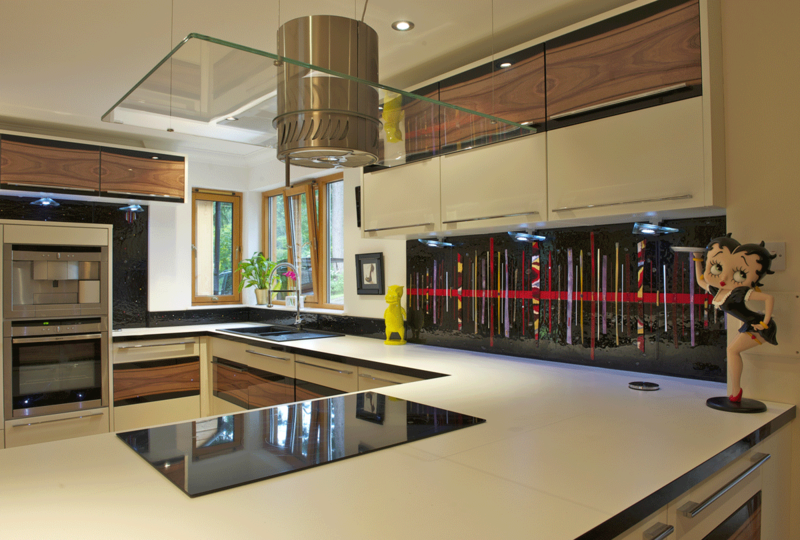 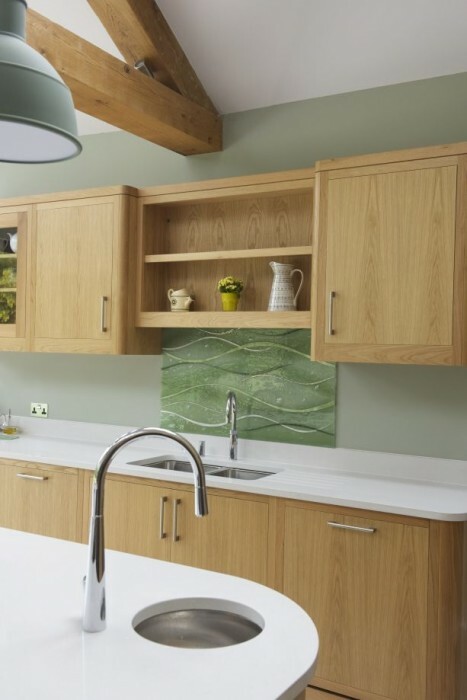 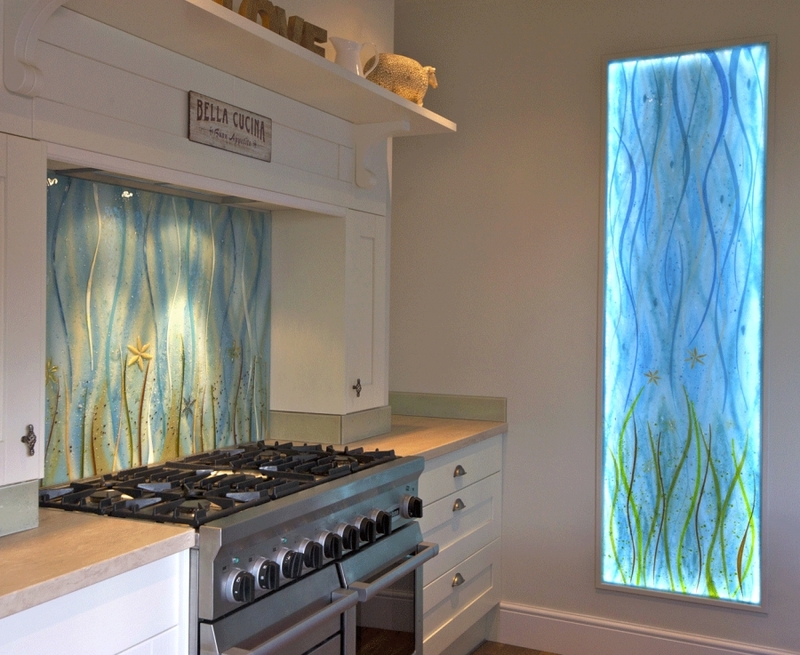 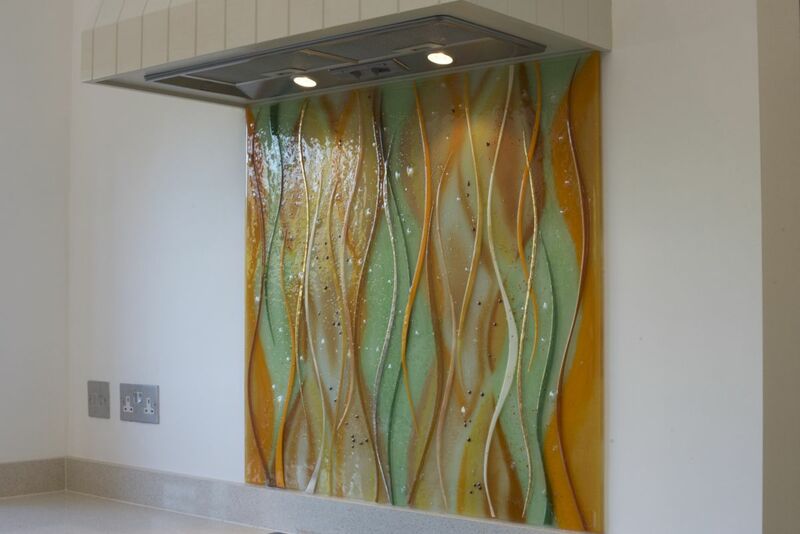 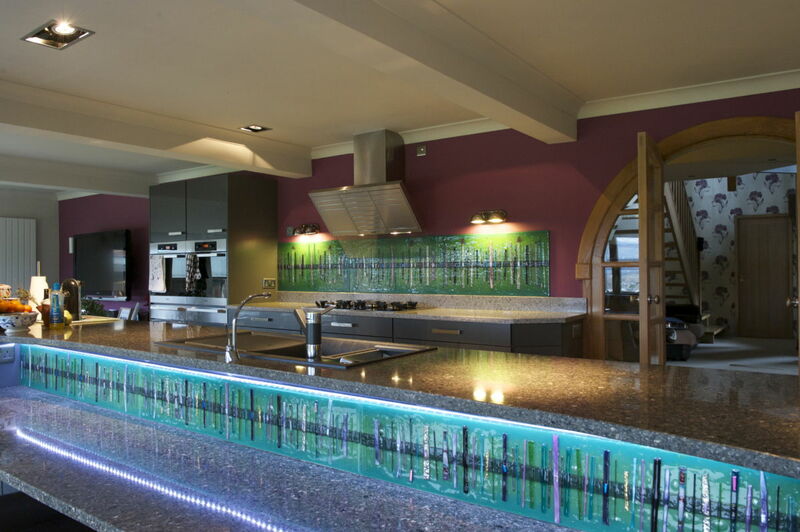 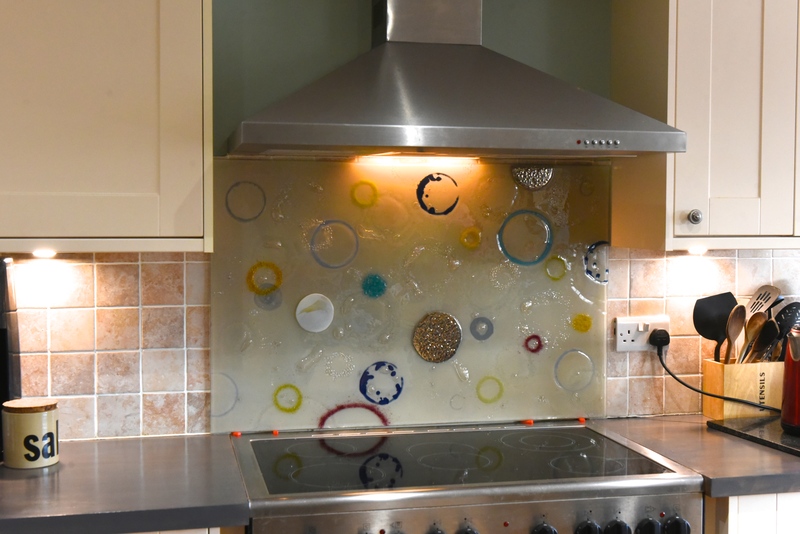 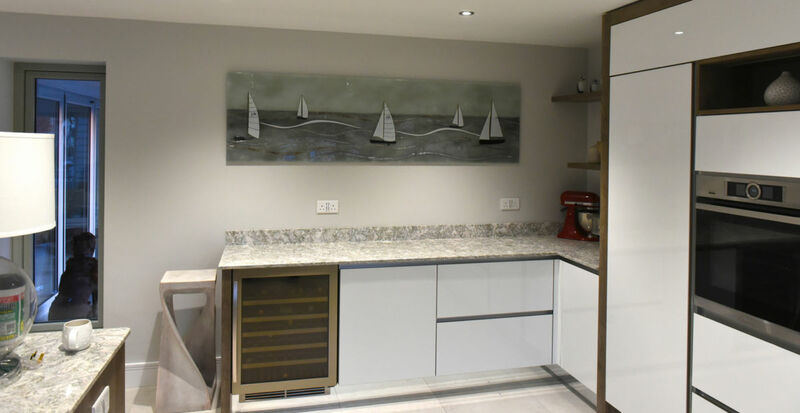 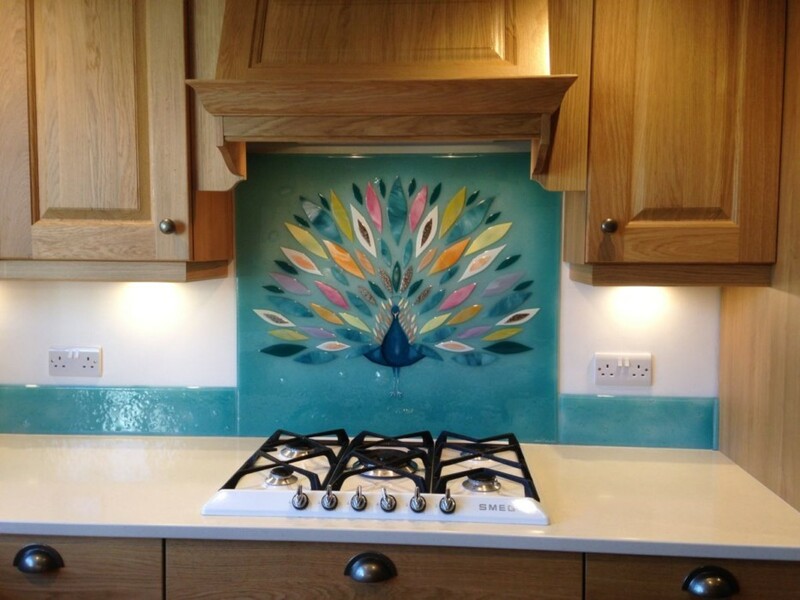 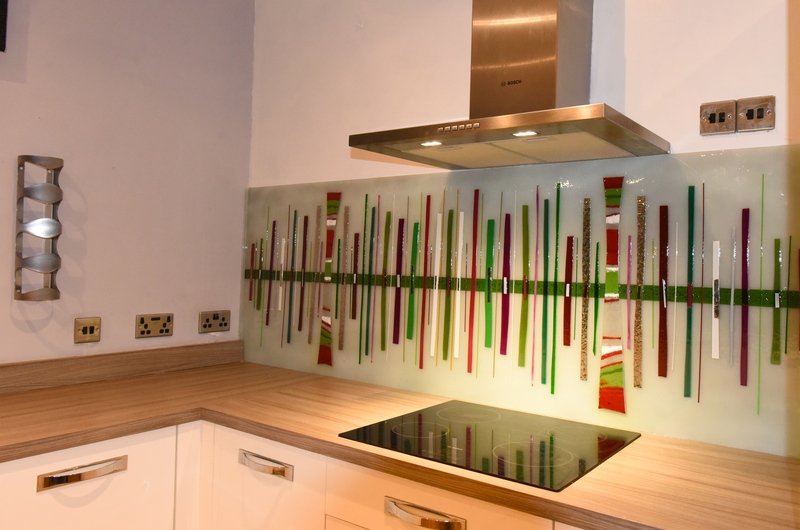 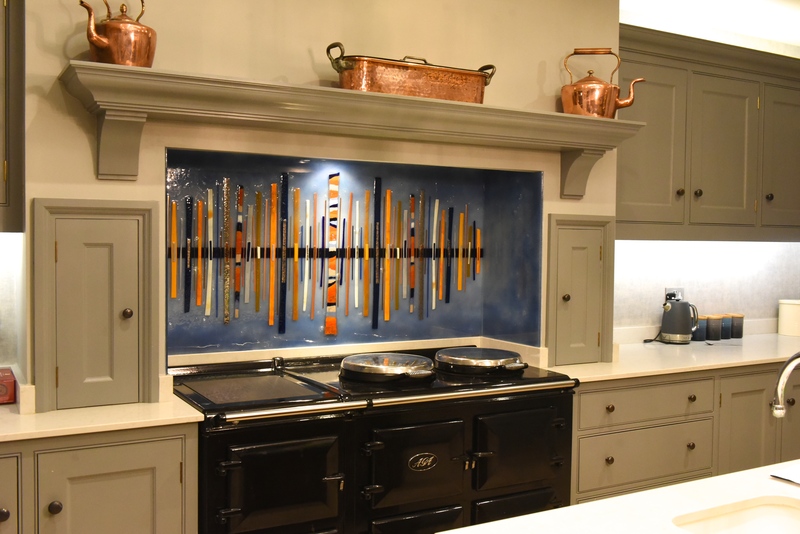 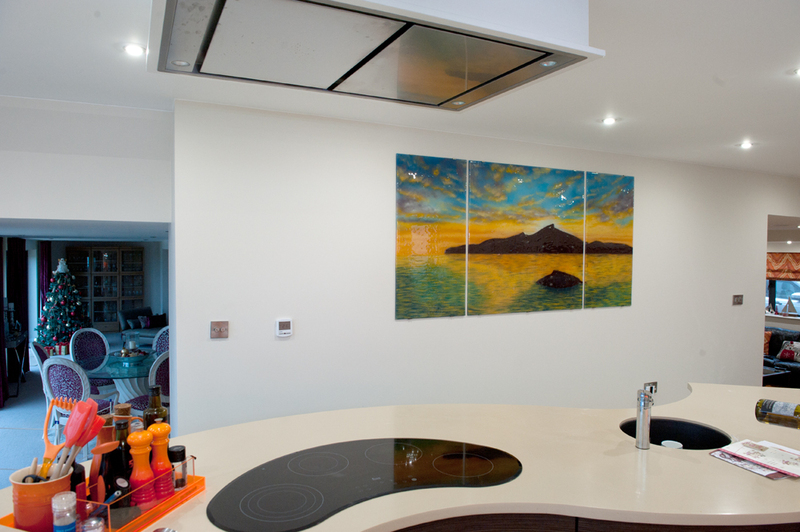 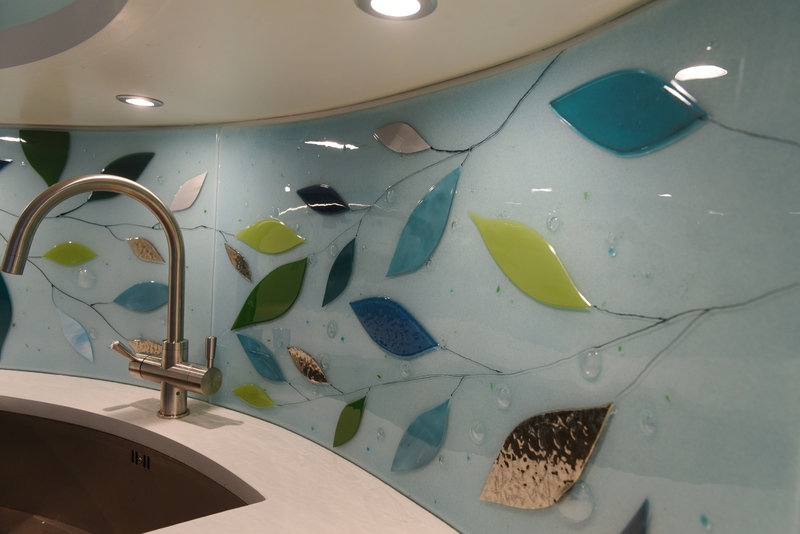 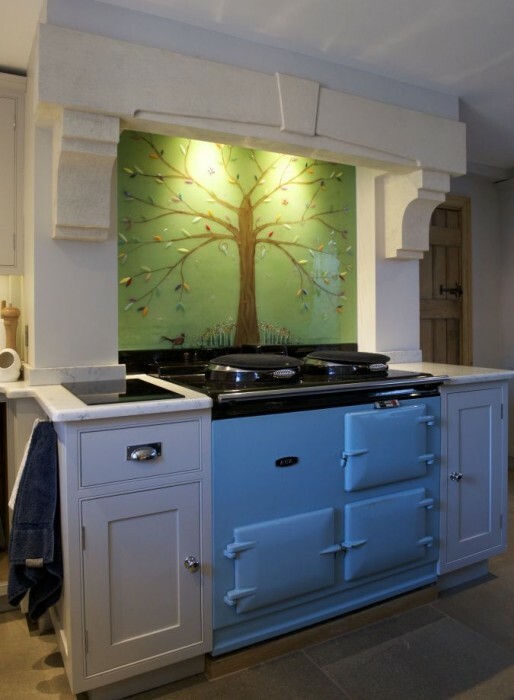 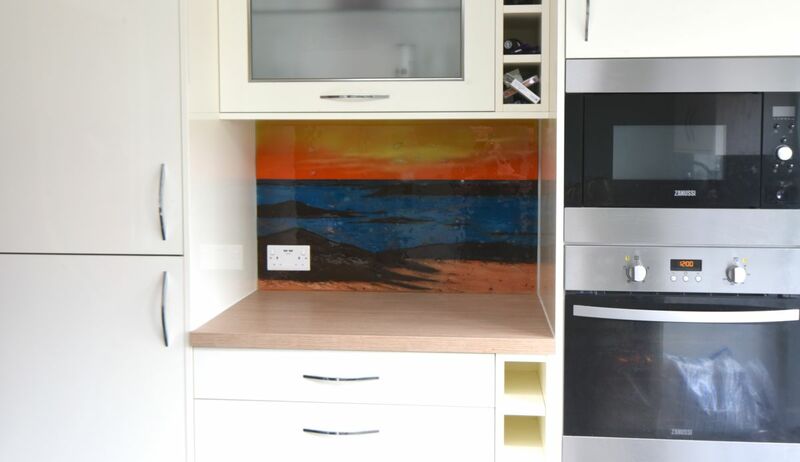 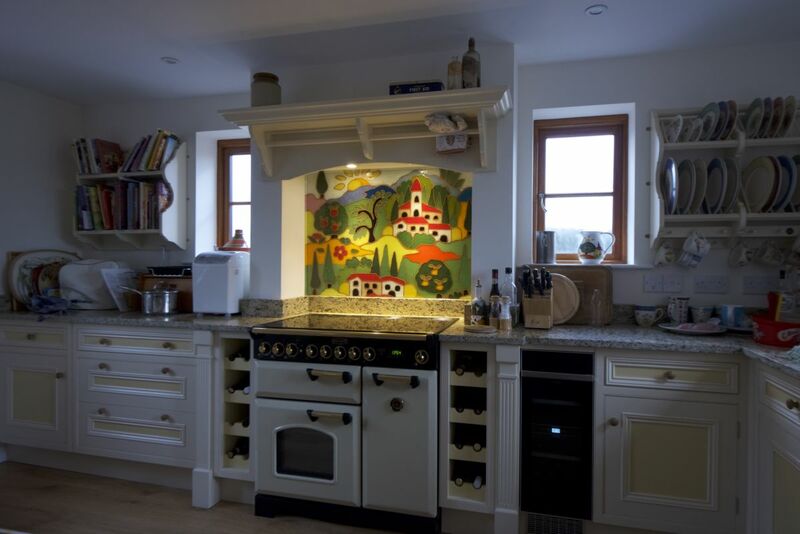 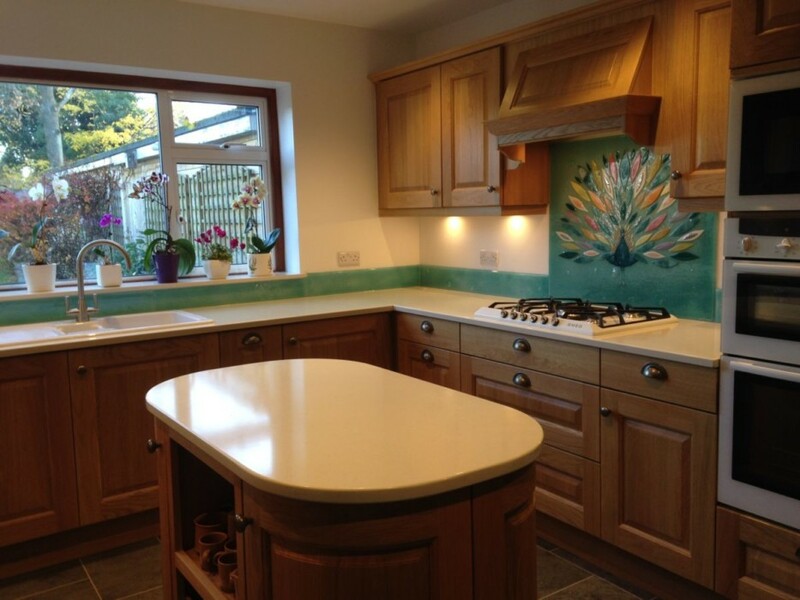 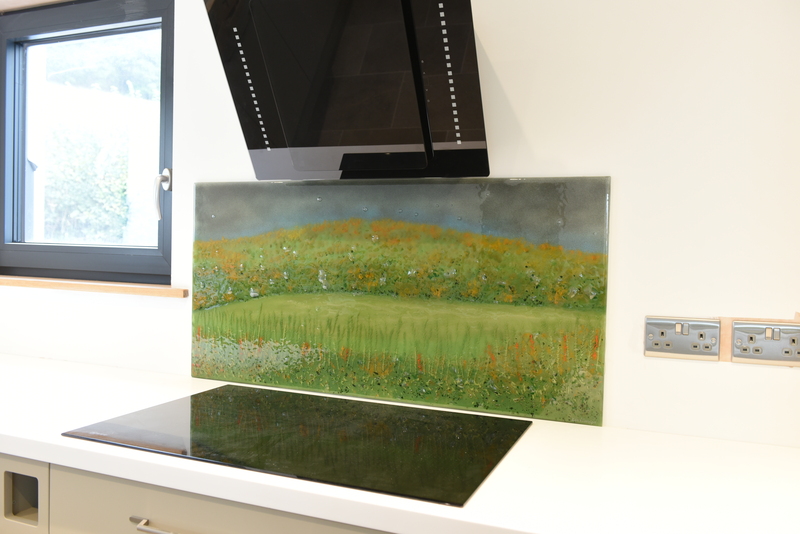 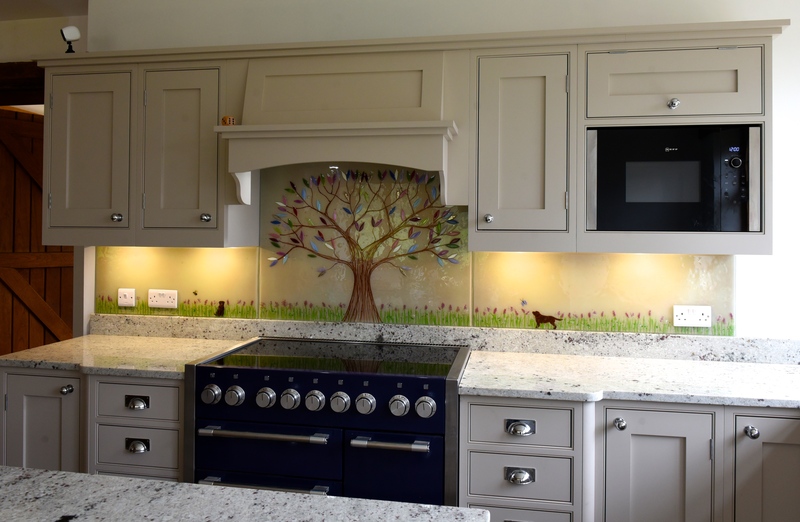 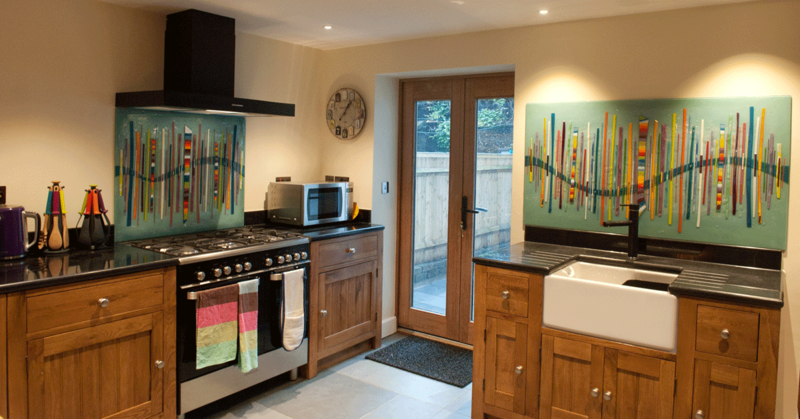 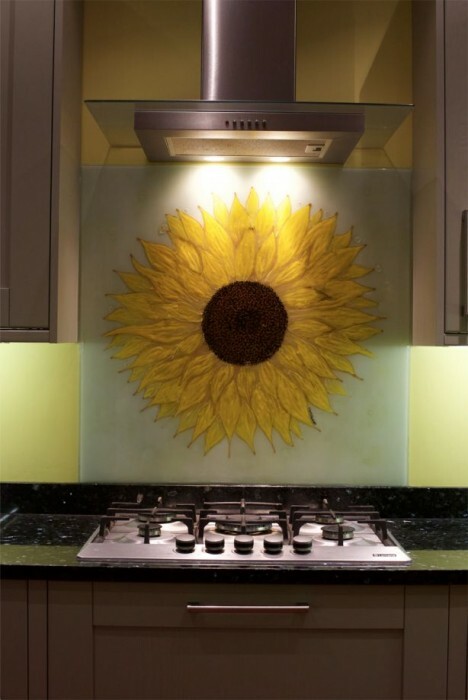 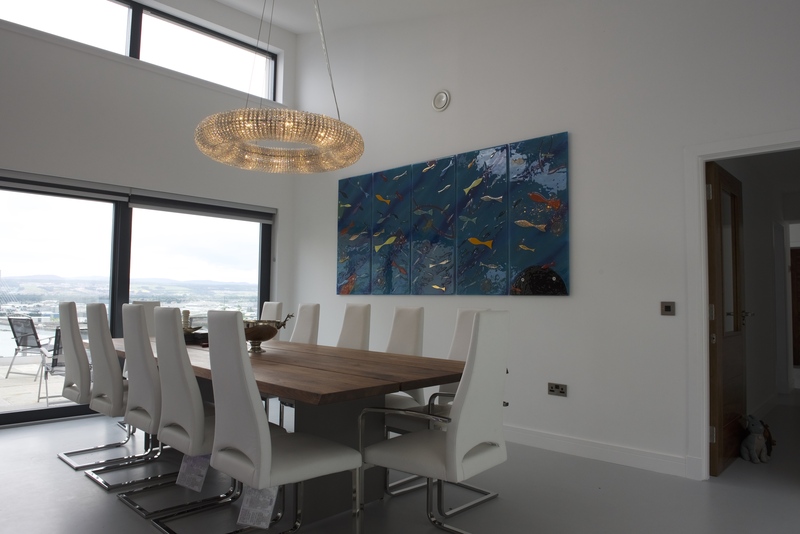 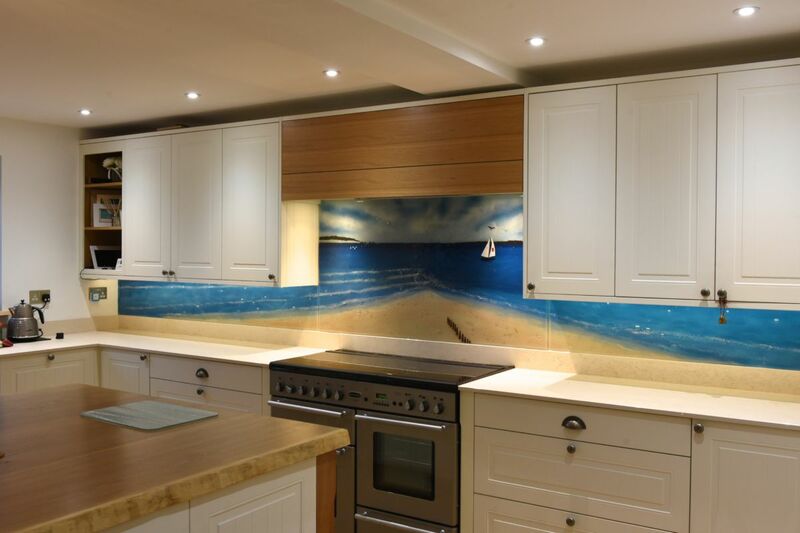 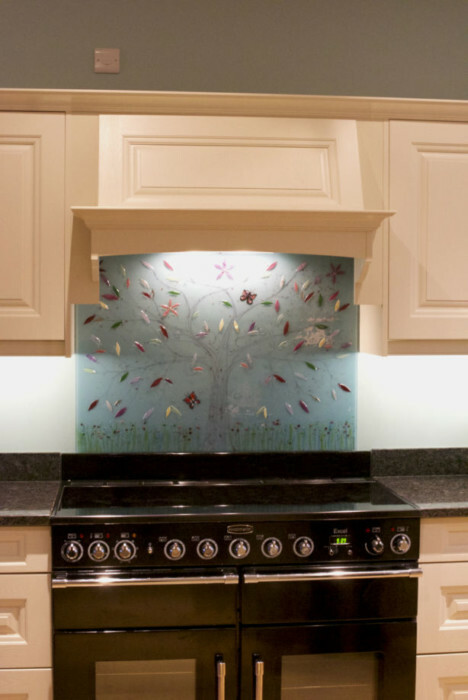 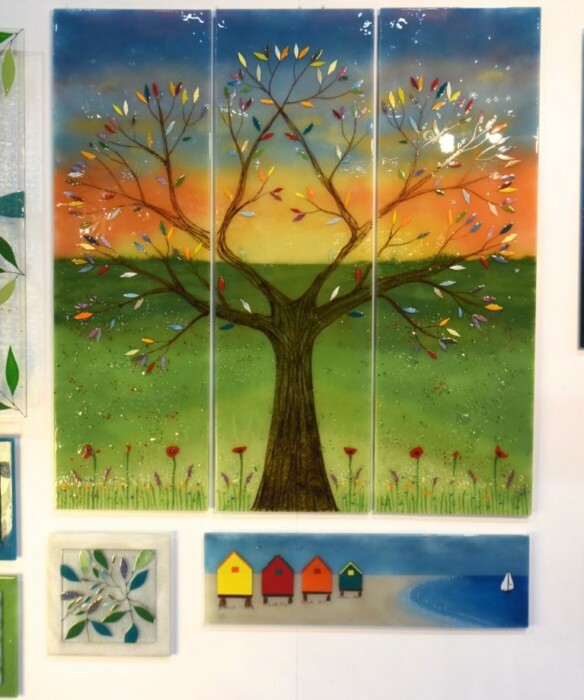 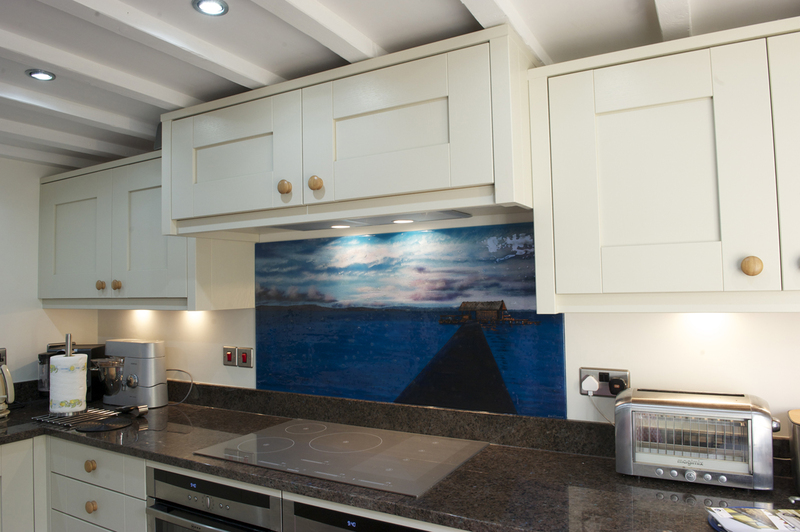 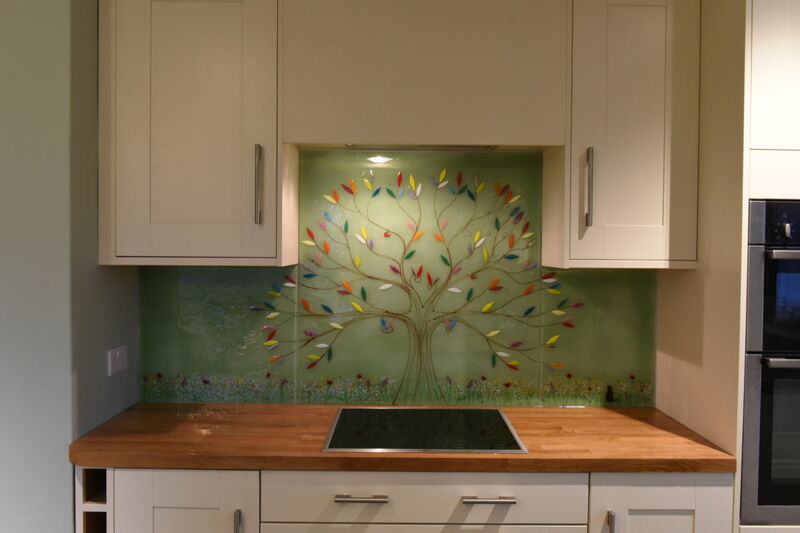 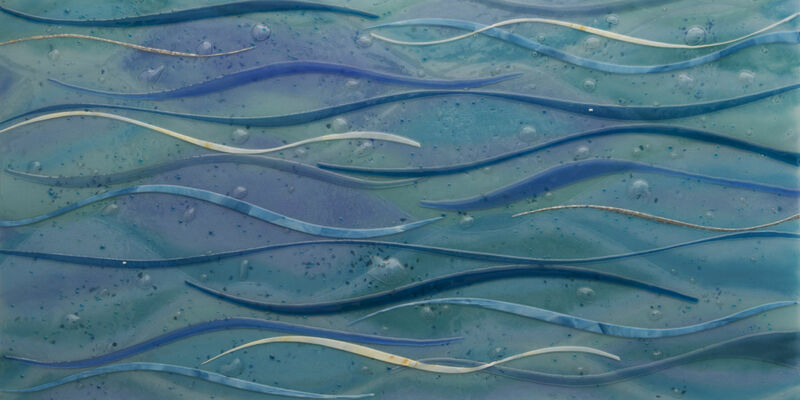 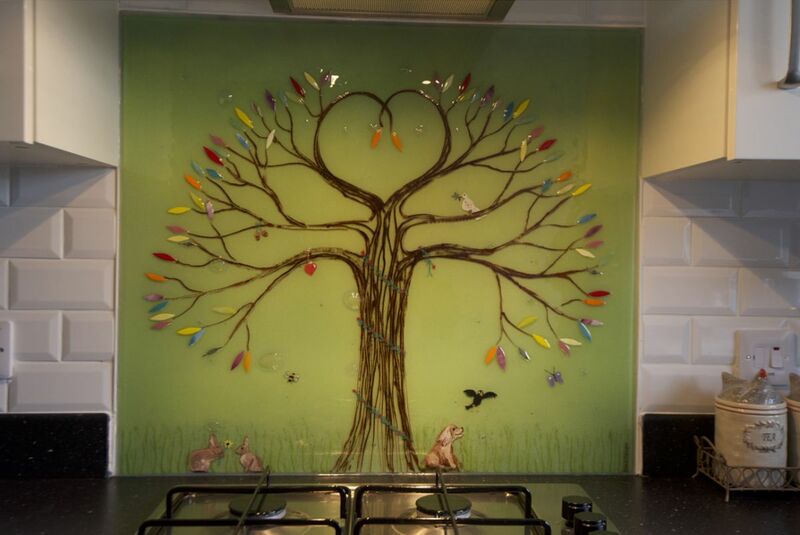 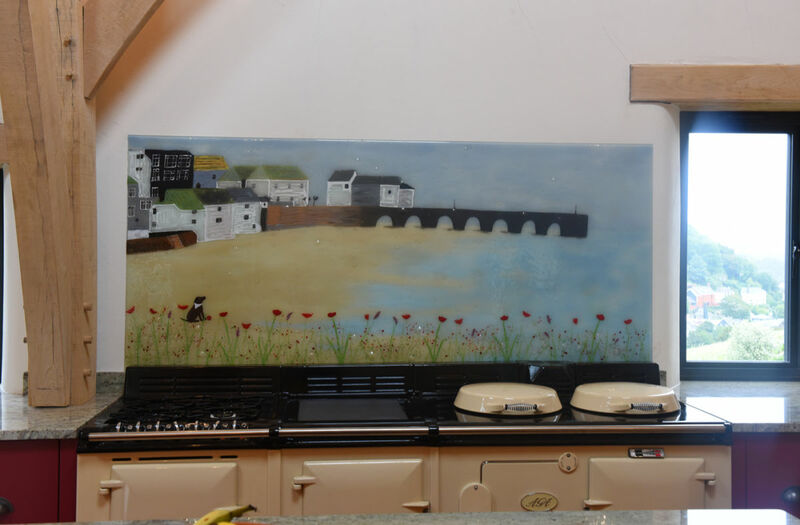 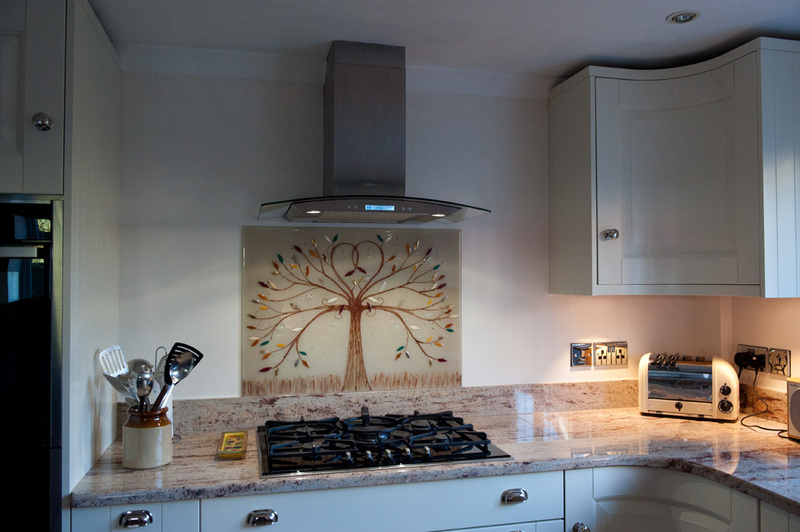 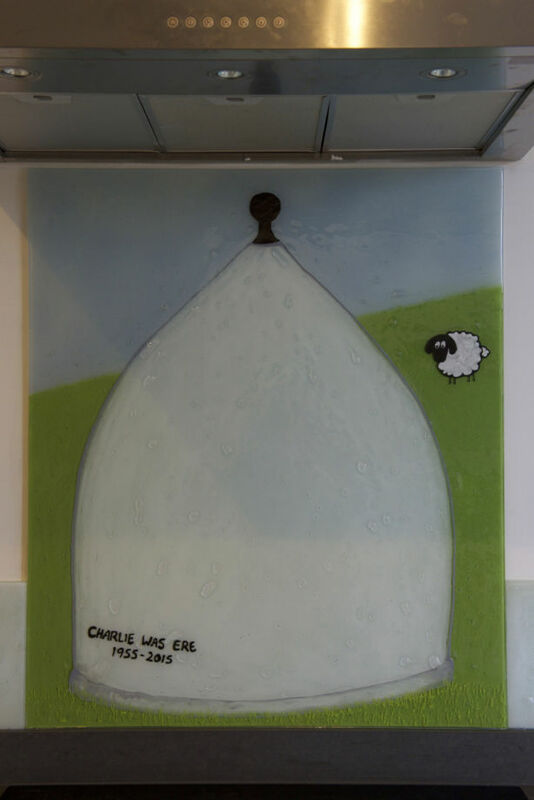 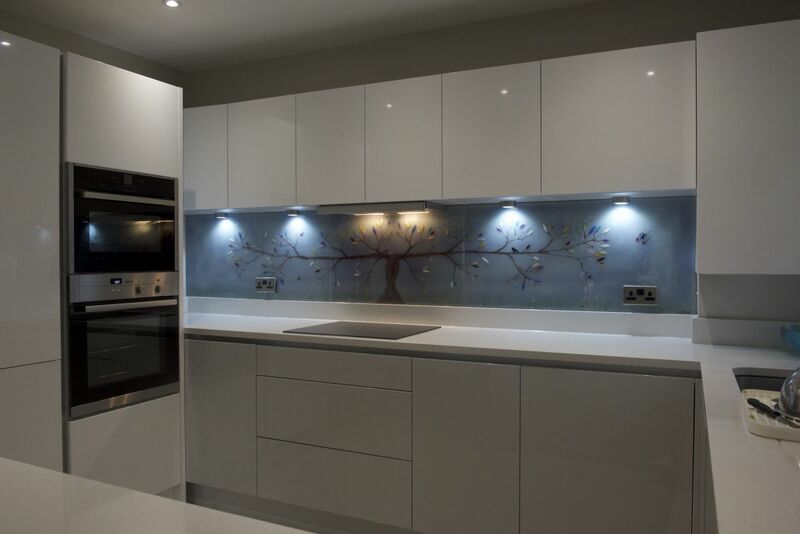 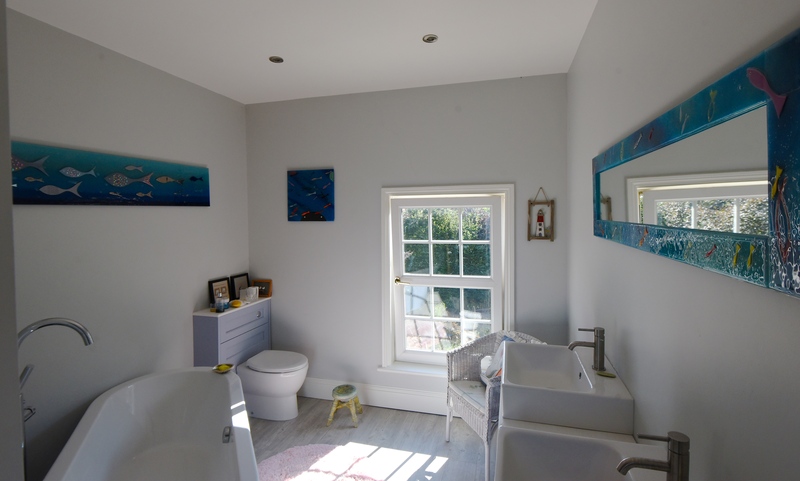 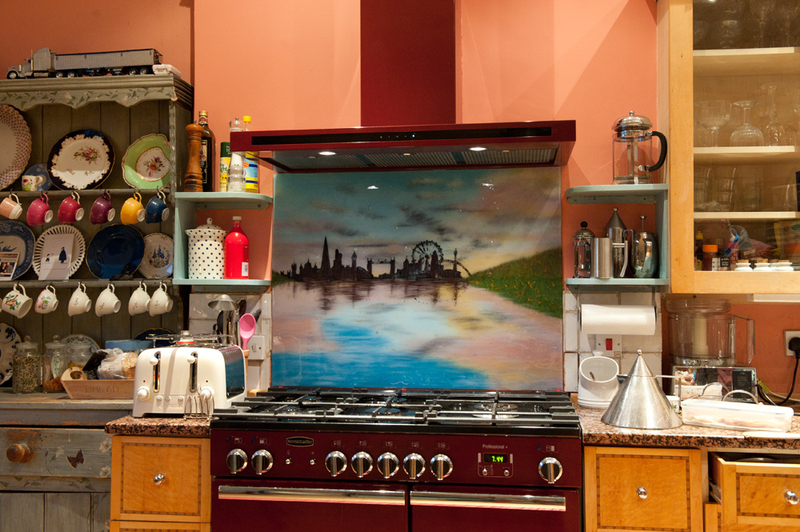 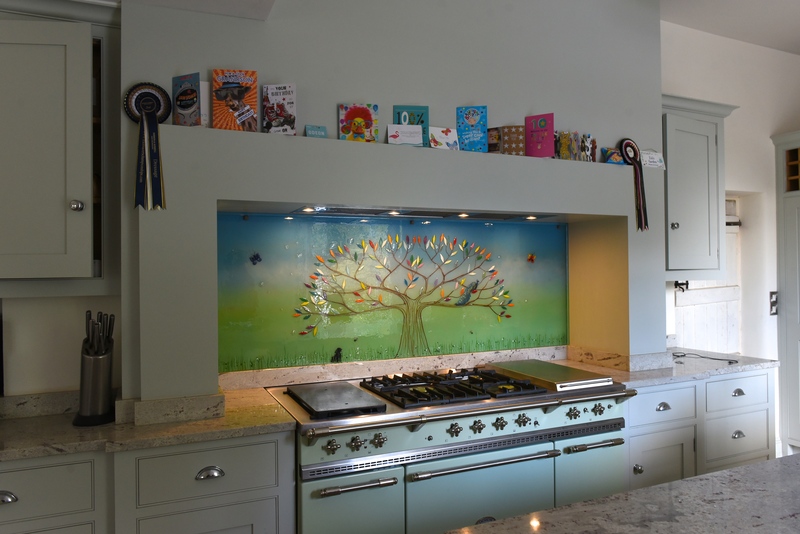 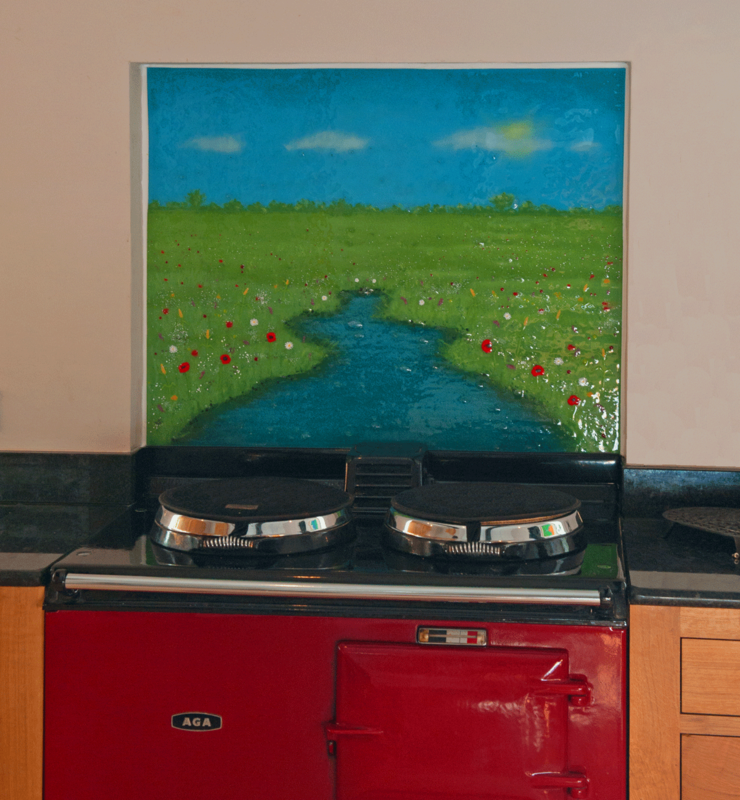 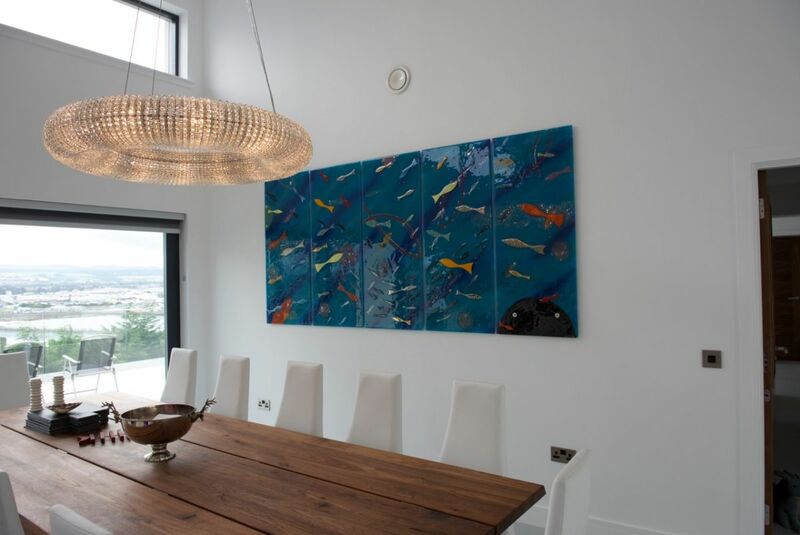 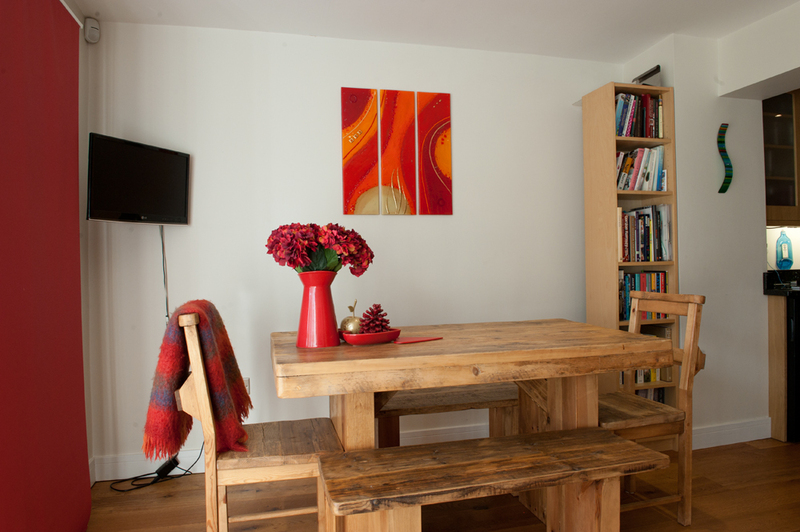 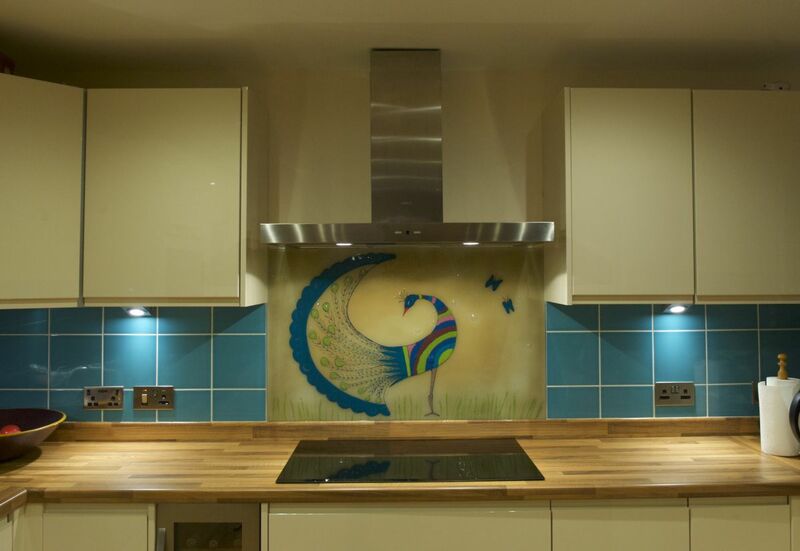 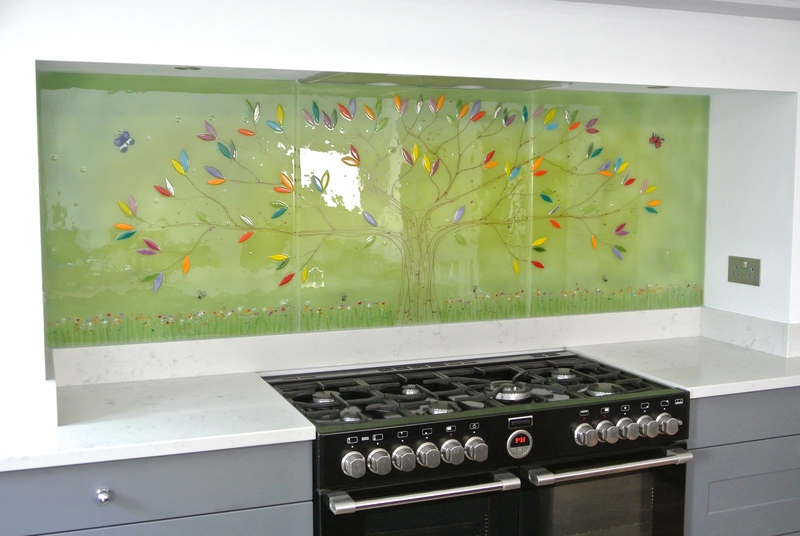 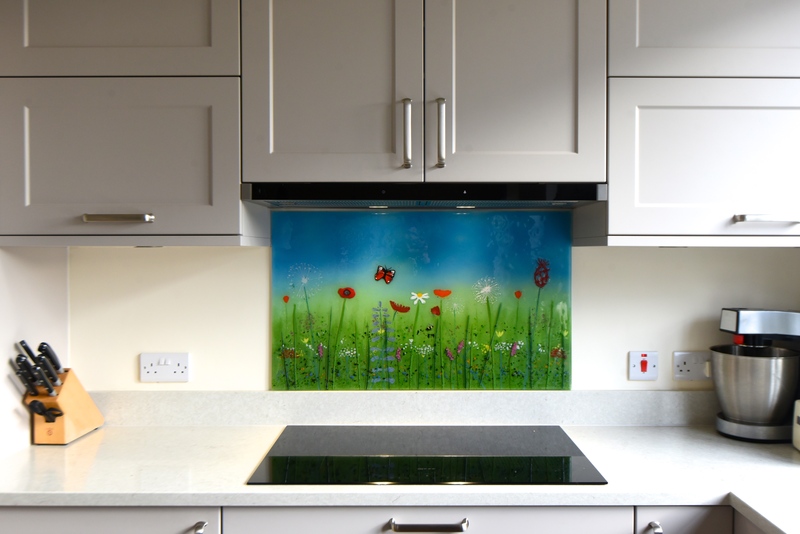 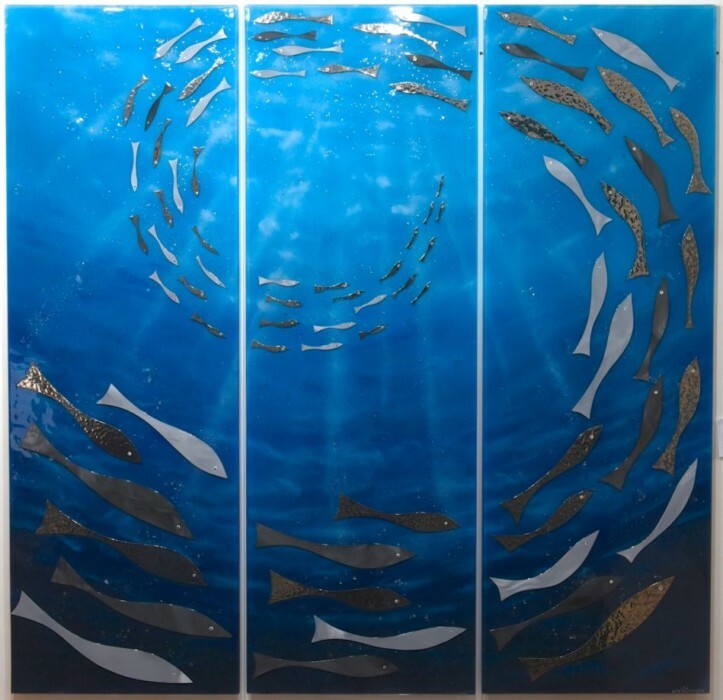 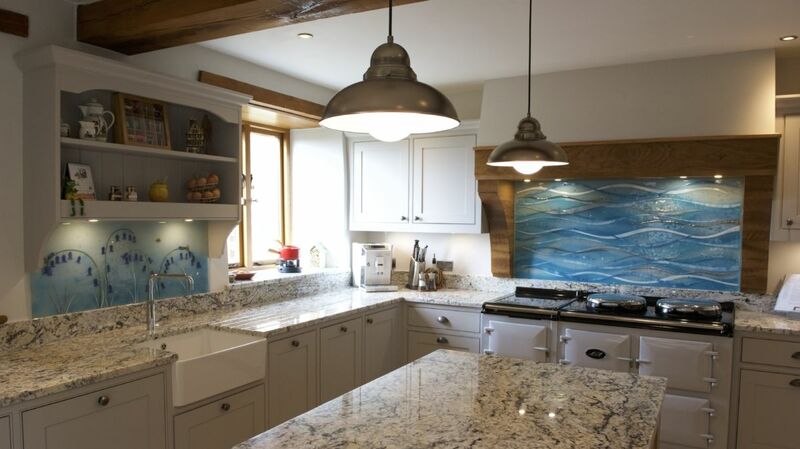 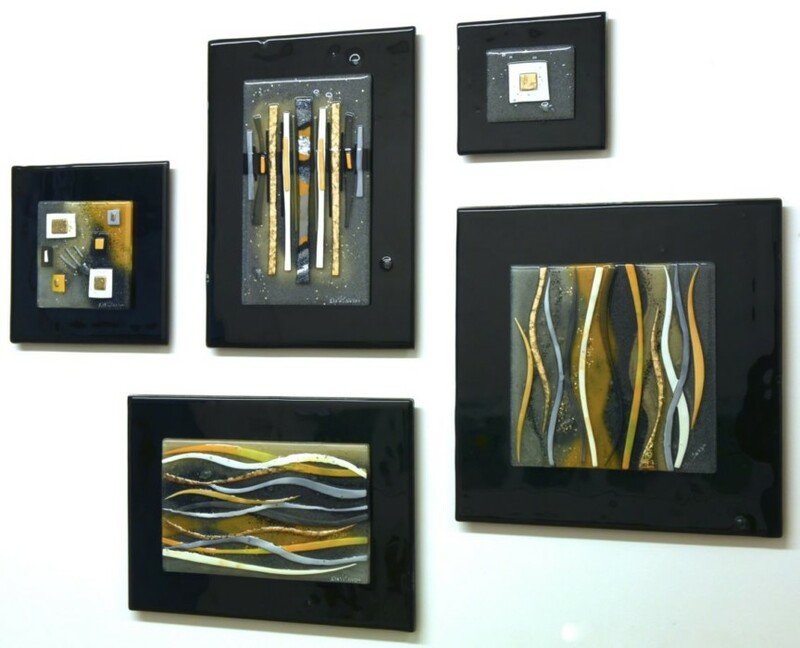 The House of Ugly Fish is a name synonymous with bespoke, handmade fused glass art splashbacks that can be every bit as personalised as you’d like, featuring more or less any design you like to put in your kitchen. 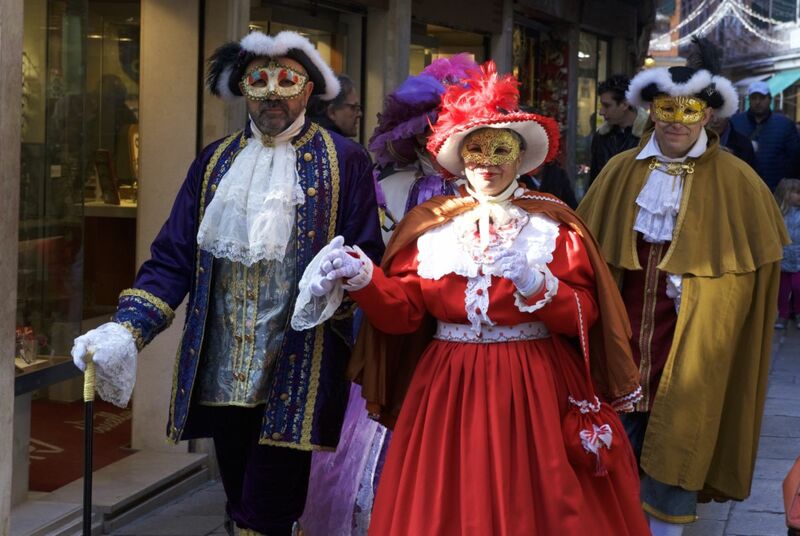 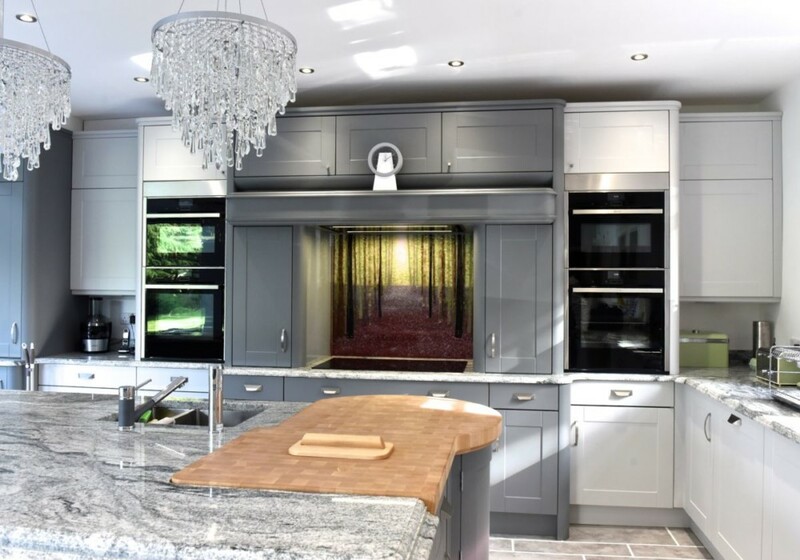 Choose one of our classic styles, come up with your very own ideas, translate a painting, or ask us to design something brand new just for you – there’s a lot we can do for you. 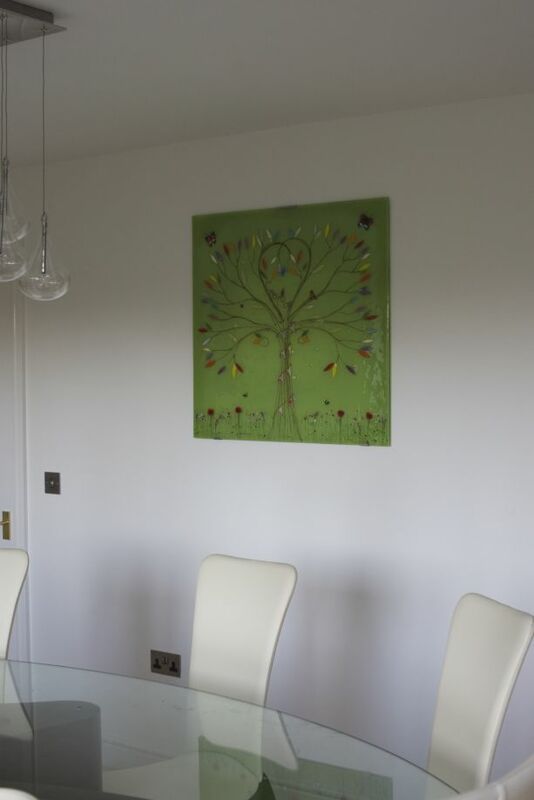 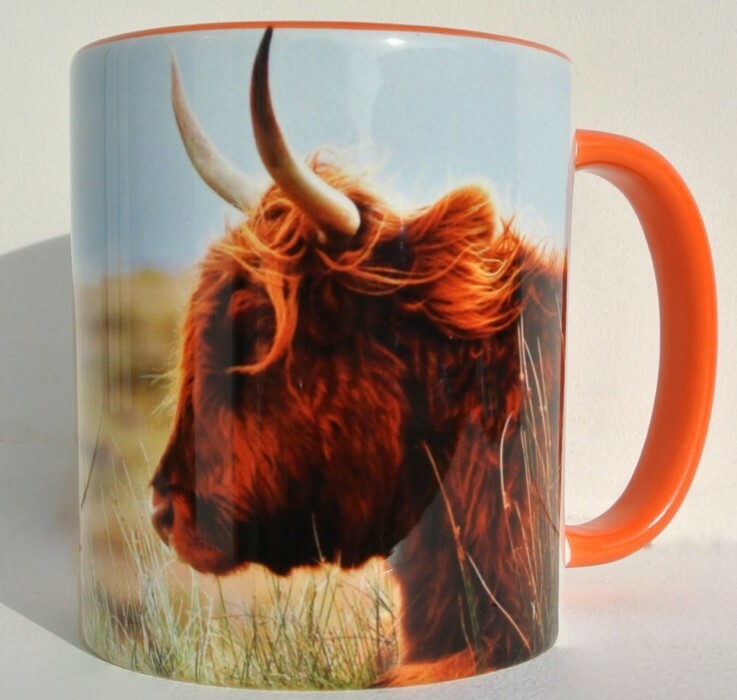 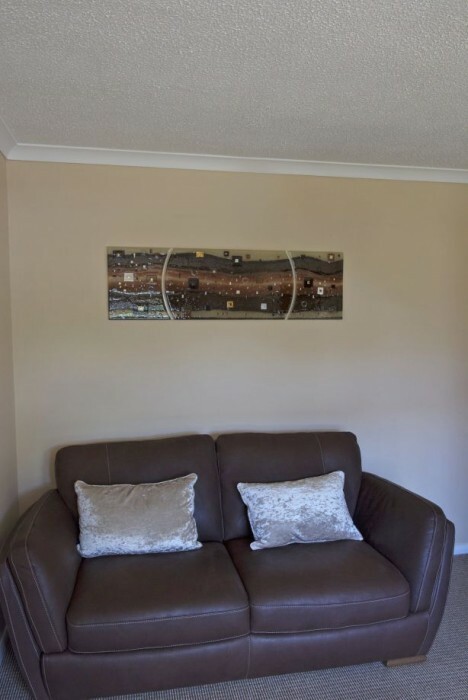 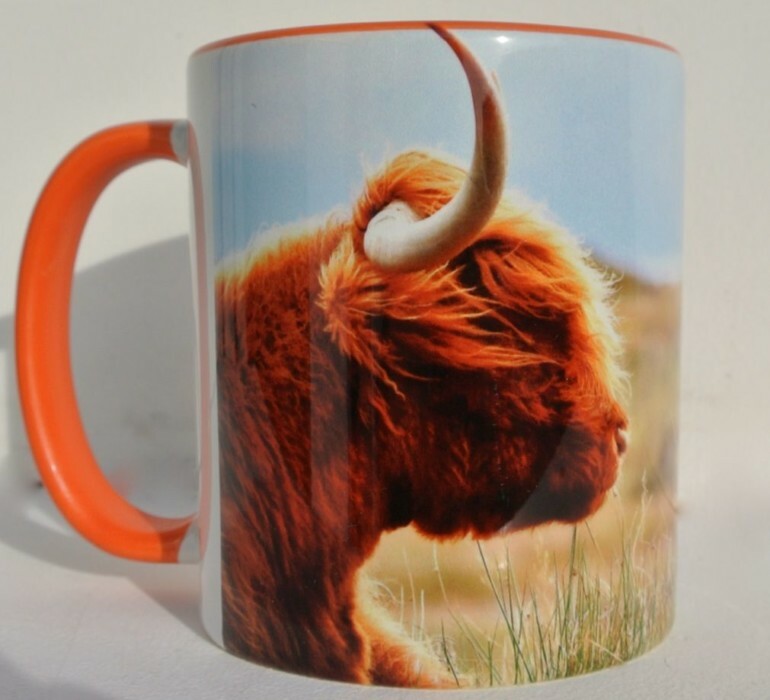 No matter what, you’re guaranteed something that no-one else will have in their home. 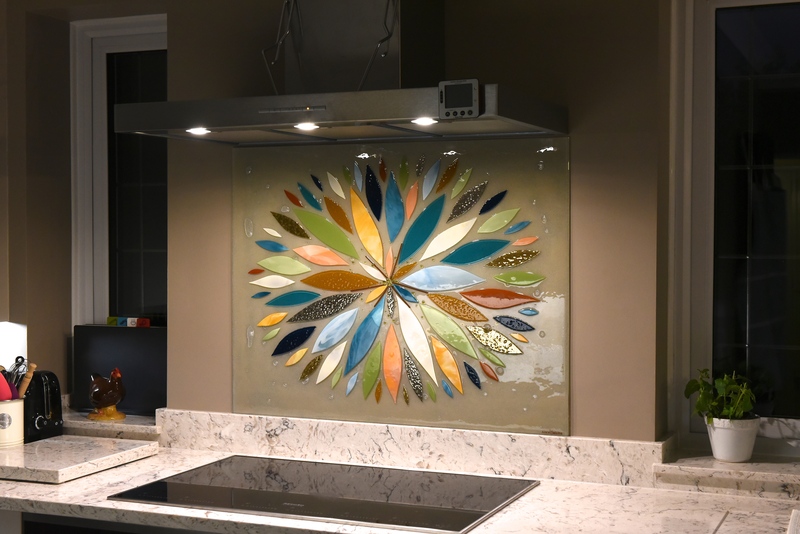 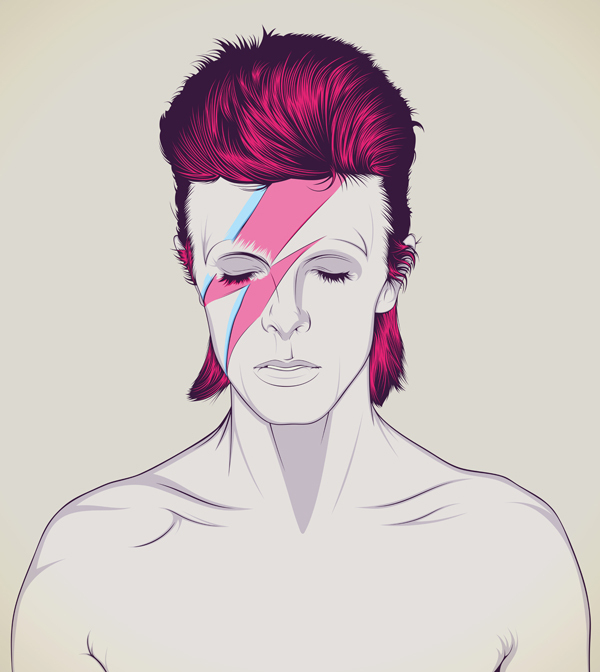 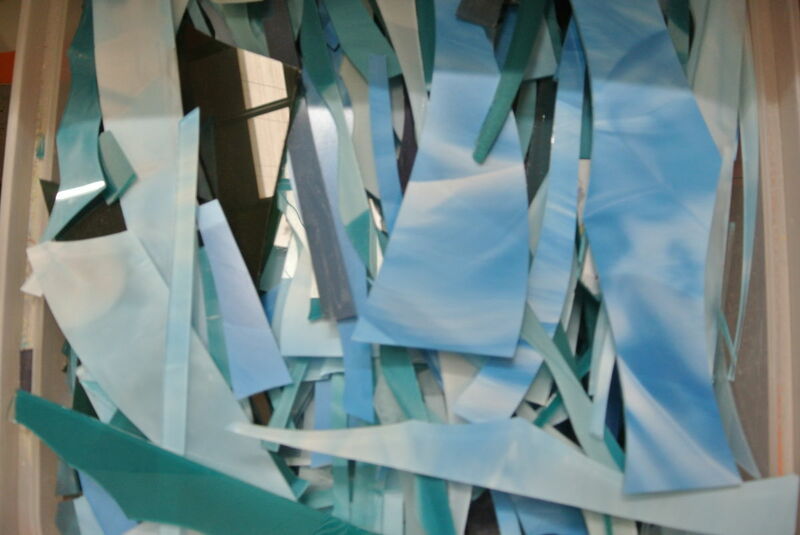 We’re always finding sources of inspiration in all walks of life and in all sorts of places, so it should make total sense that the pieces we create are always evolving. 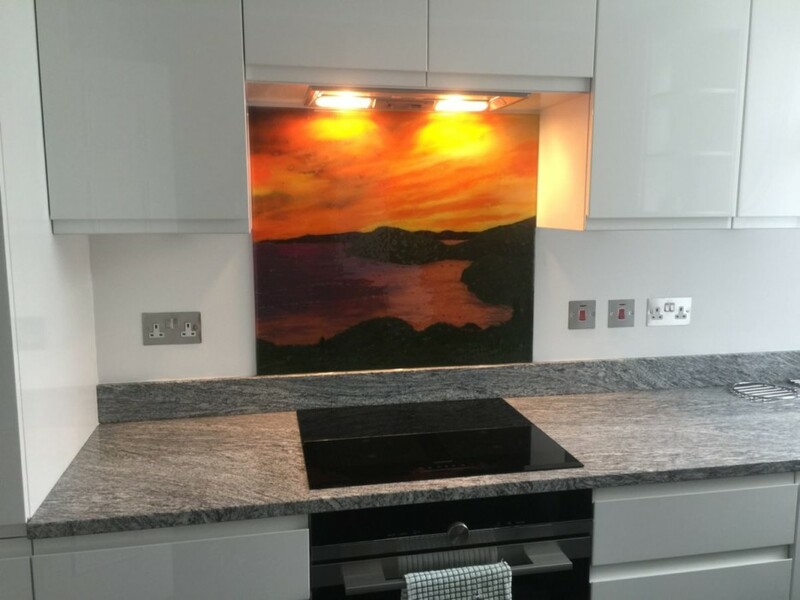 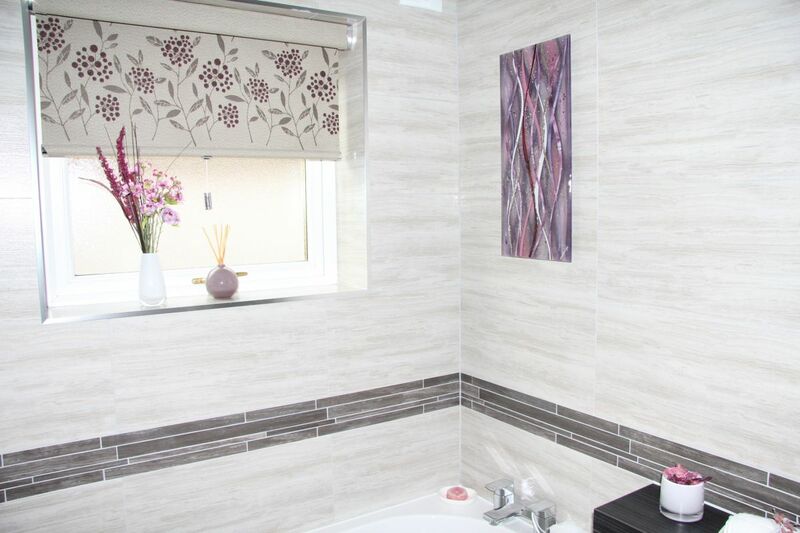 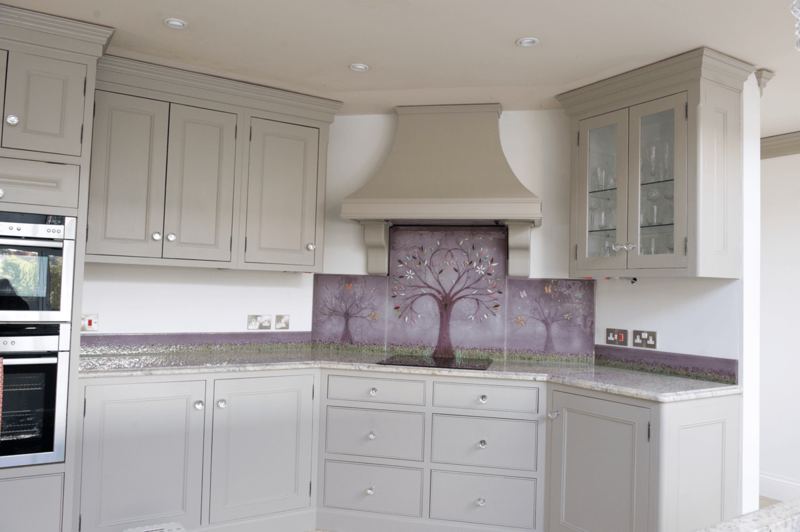 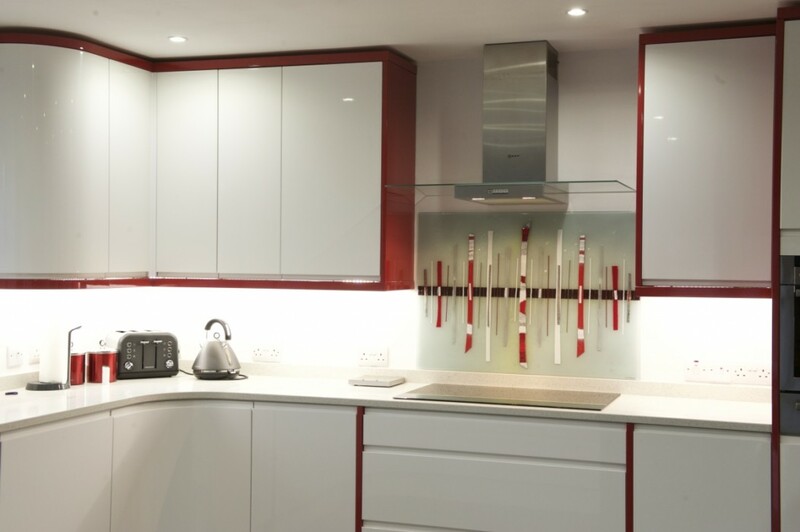 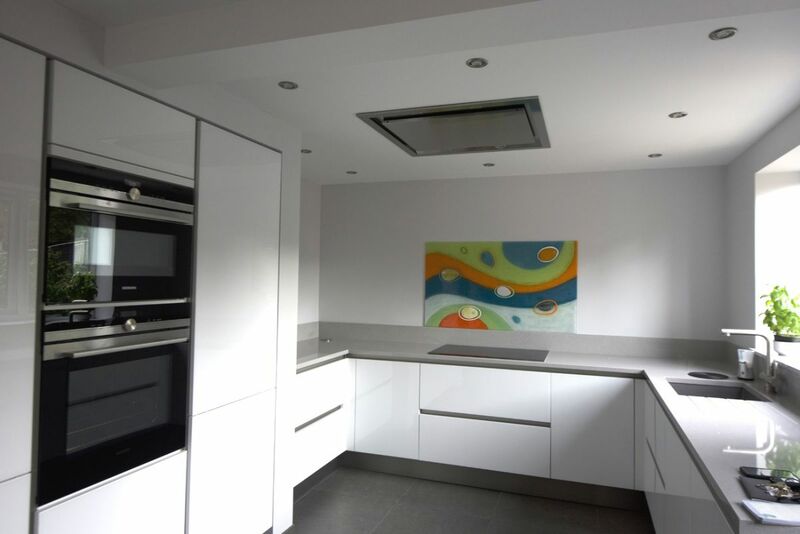 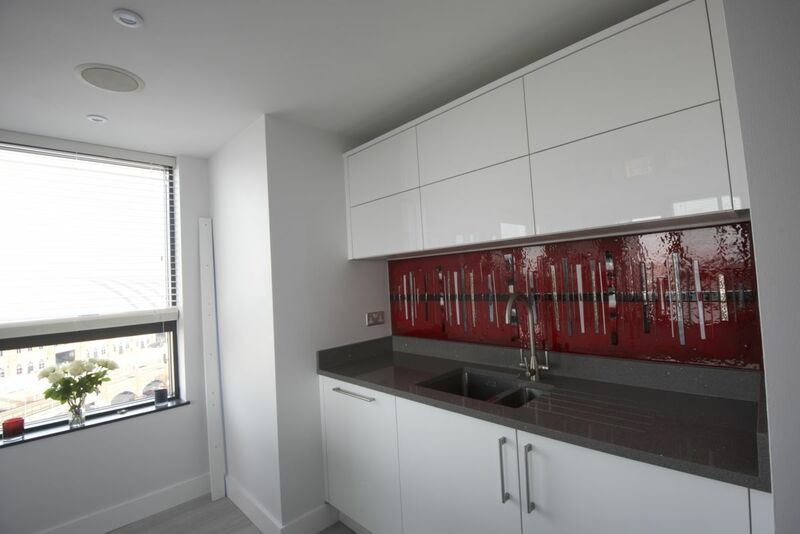 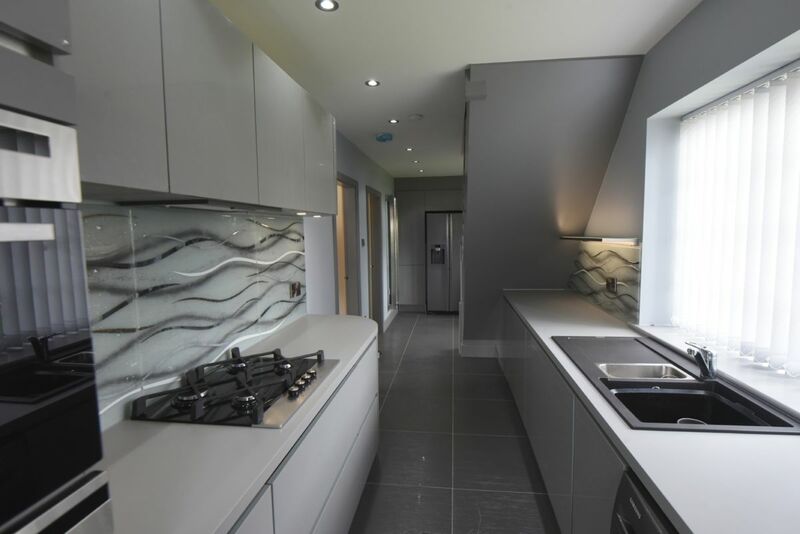 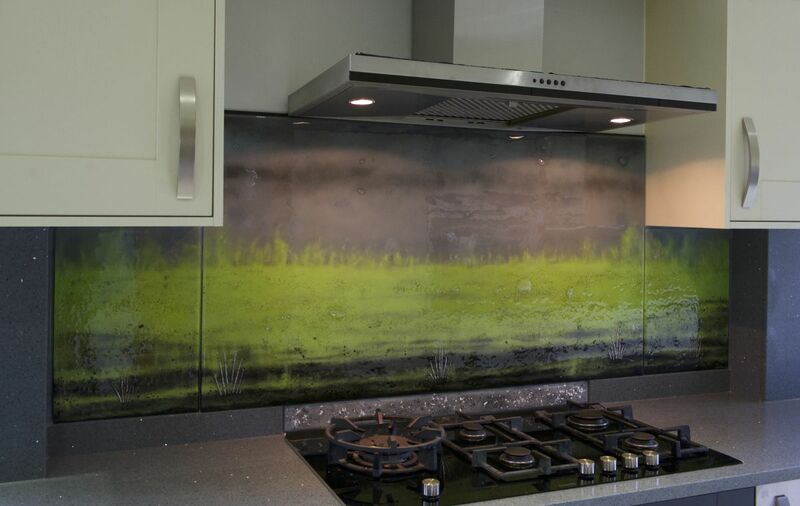 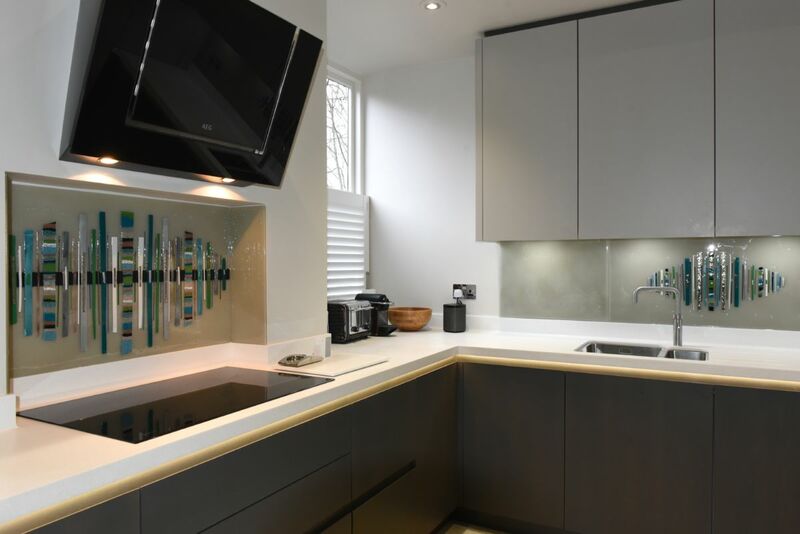 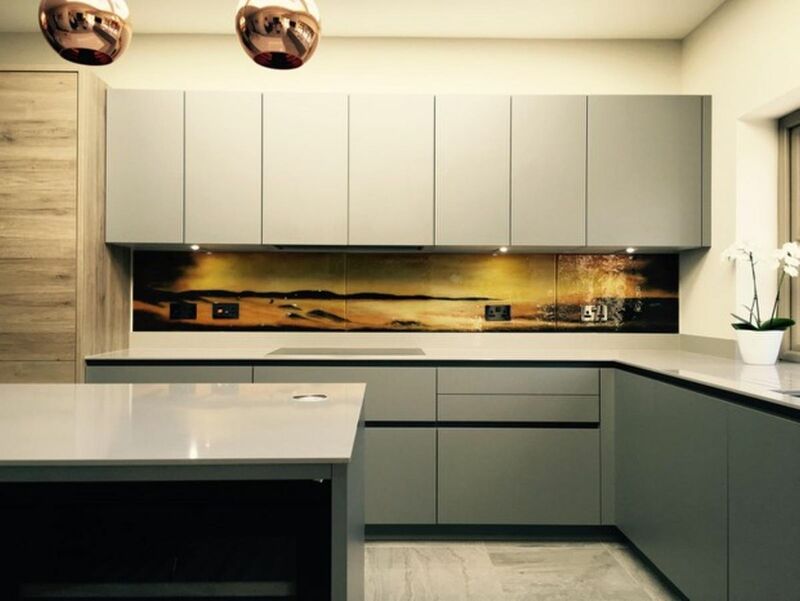 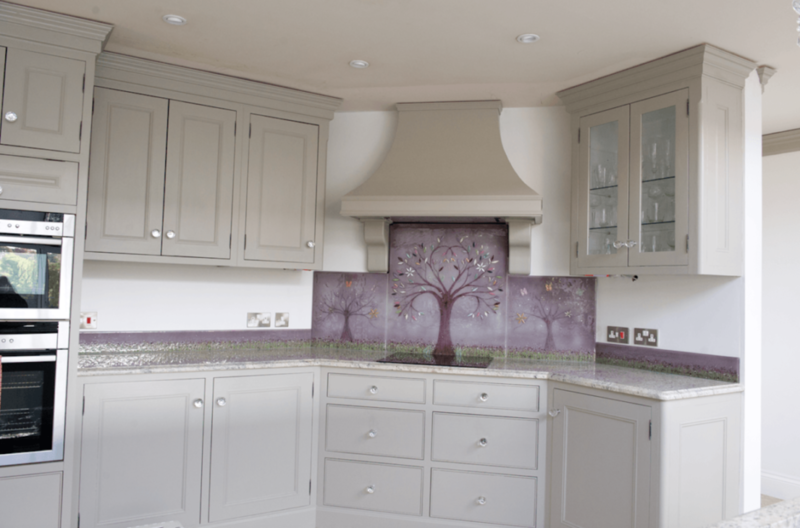 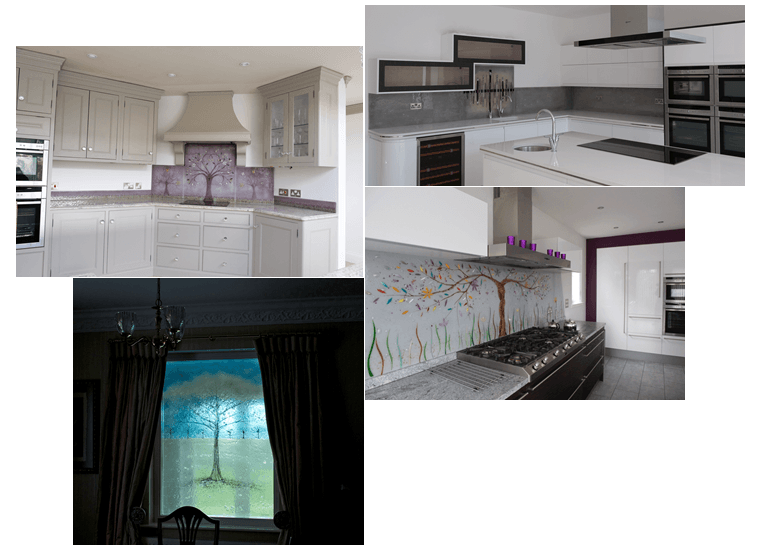 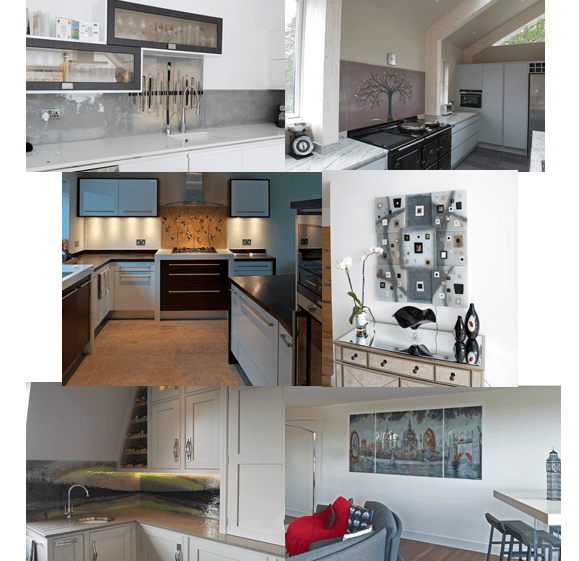 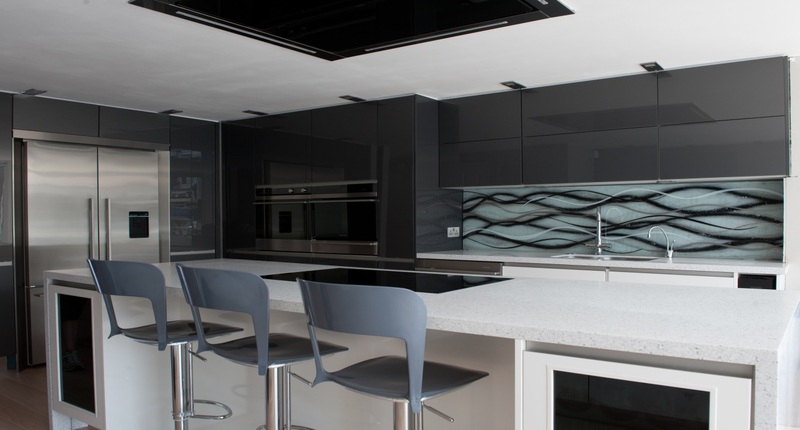 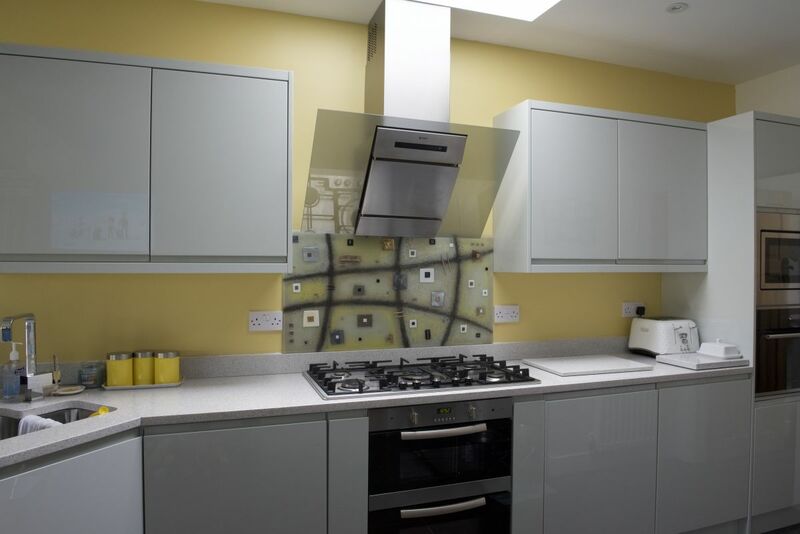 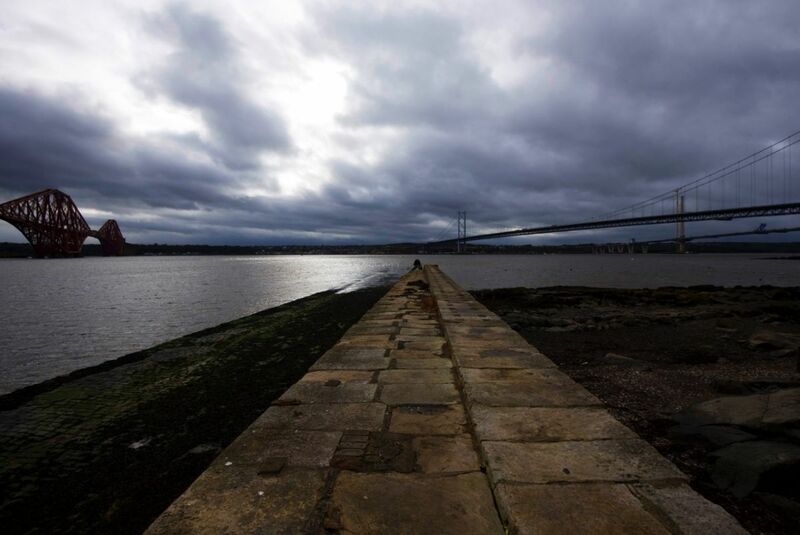 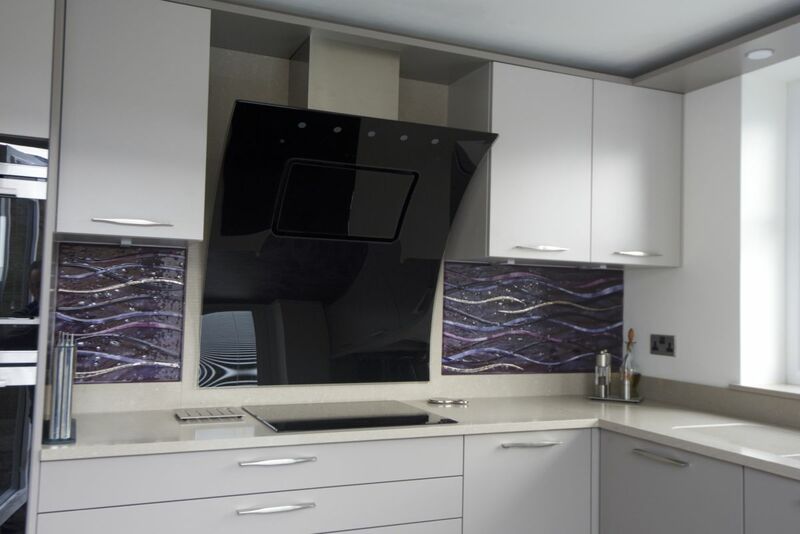 Take a look through our extensive portfolio of work and you’ll see that even our most simple splashbacks contain a world of detail yet to be discovered. 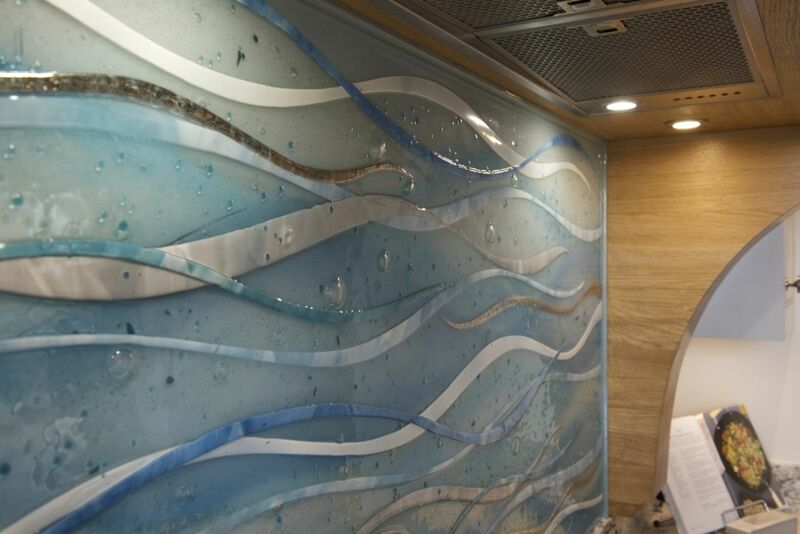 There’s endless variety to be found, too. 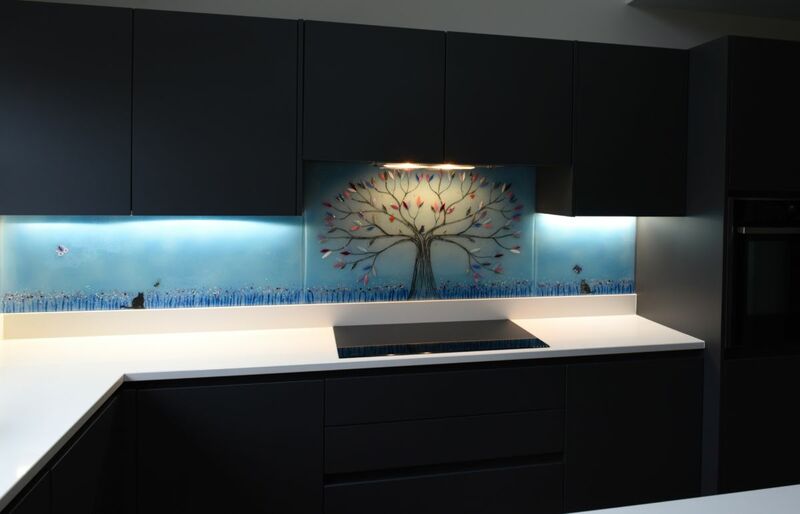 One piece might be a beautiful wave design or a colourful Tree of Life, while the next could just as easily be a black and white Dalaman using contrast to really make an impression. 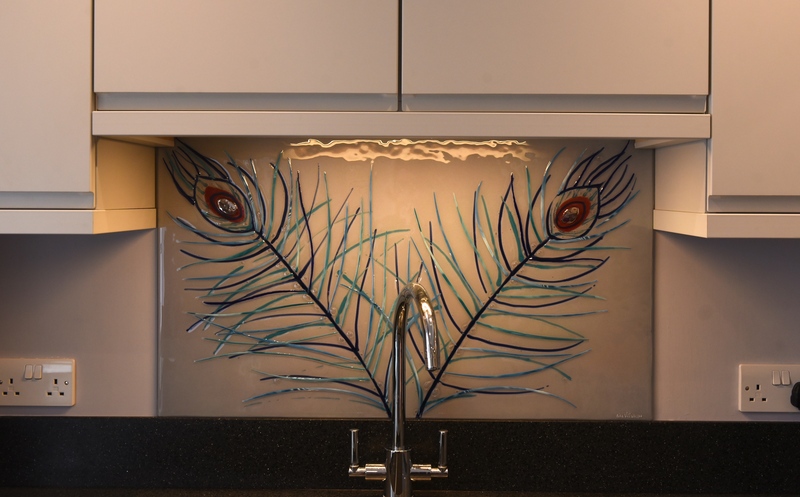 Both would no doubt be just as beautiful in their respective kitchens, as our glass is always a perfect match for the space you have in mind. 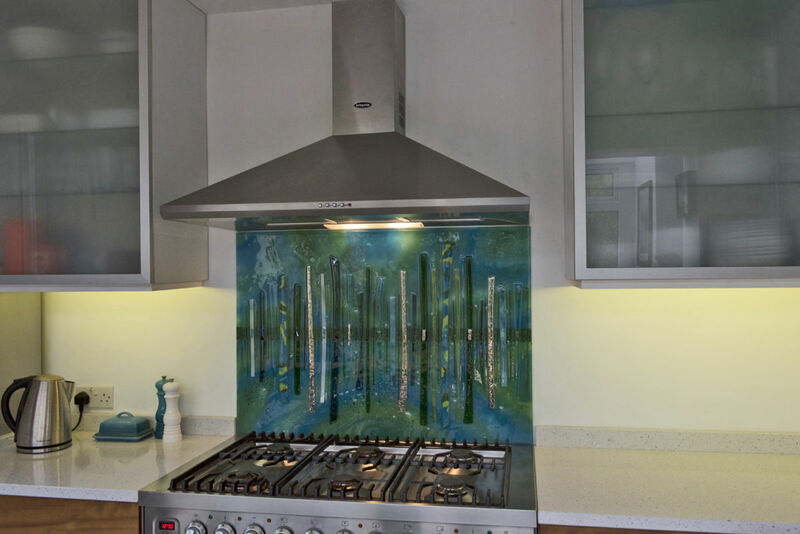 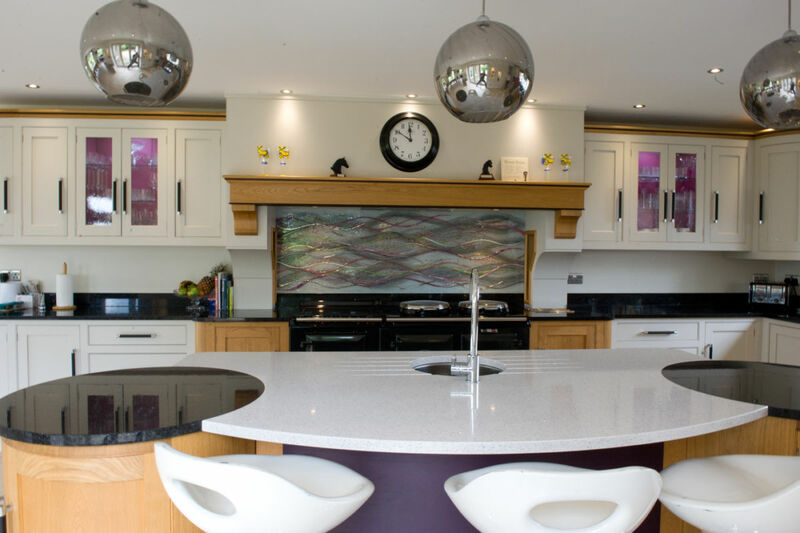 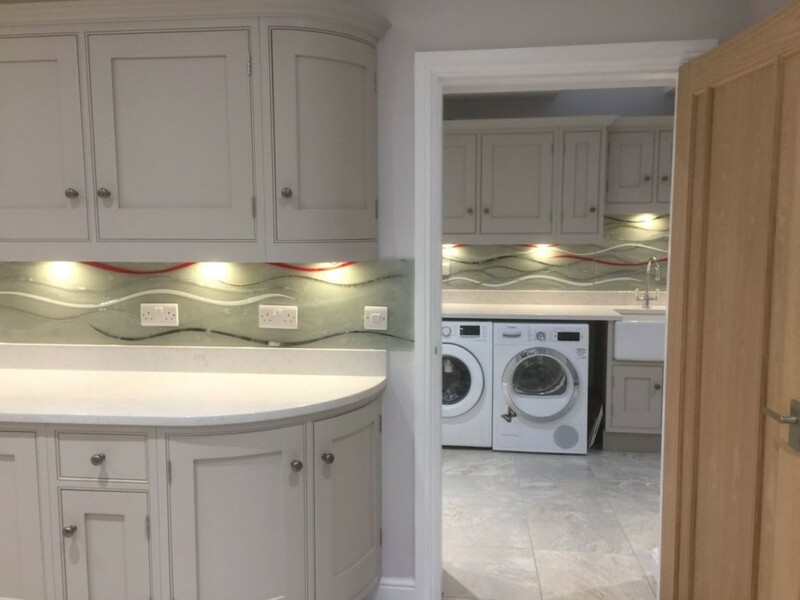 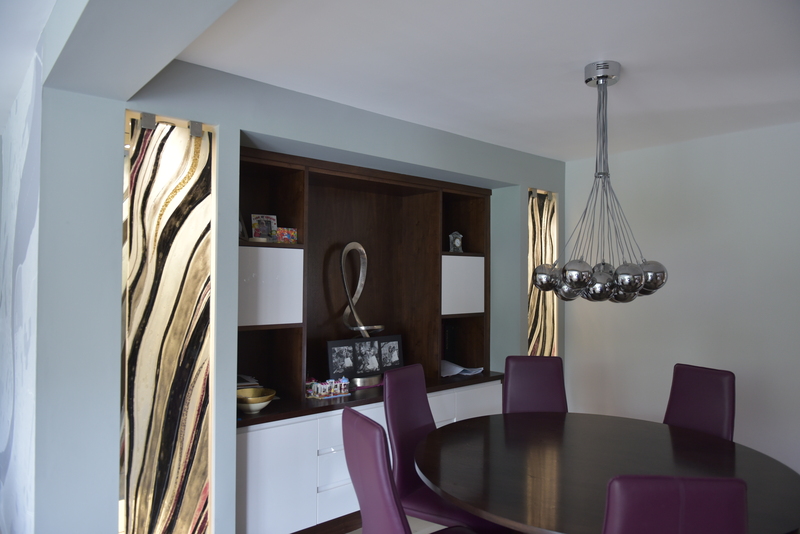 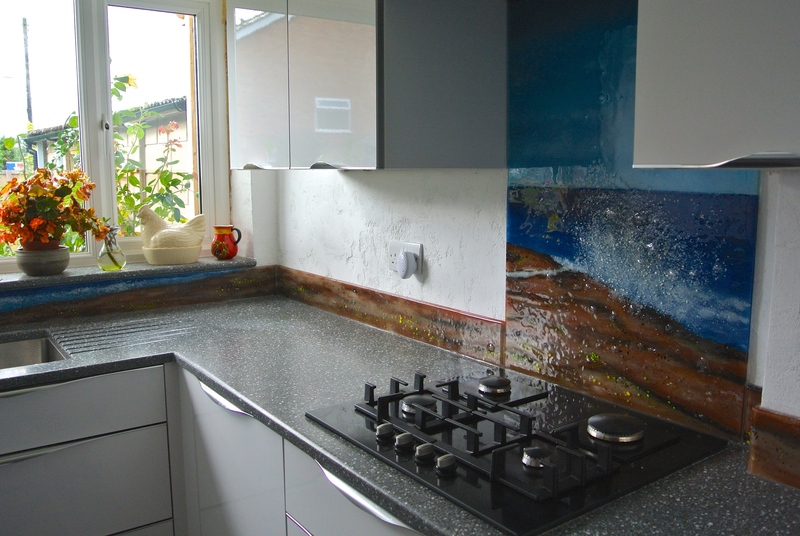 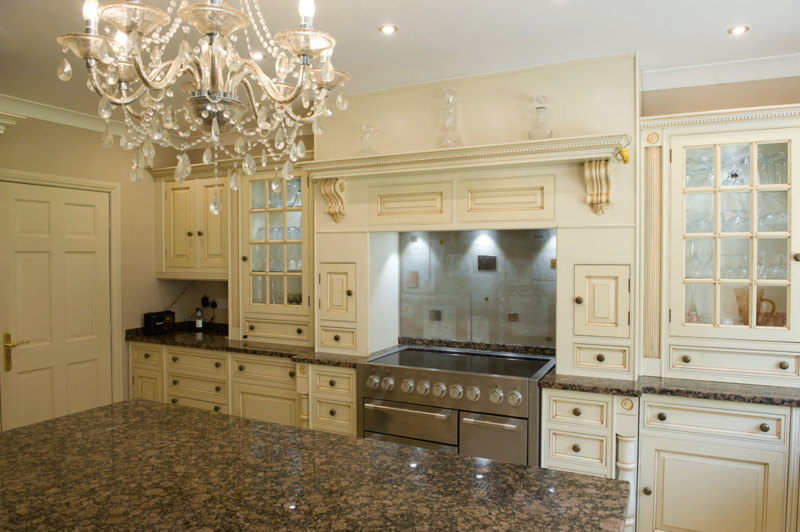 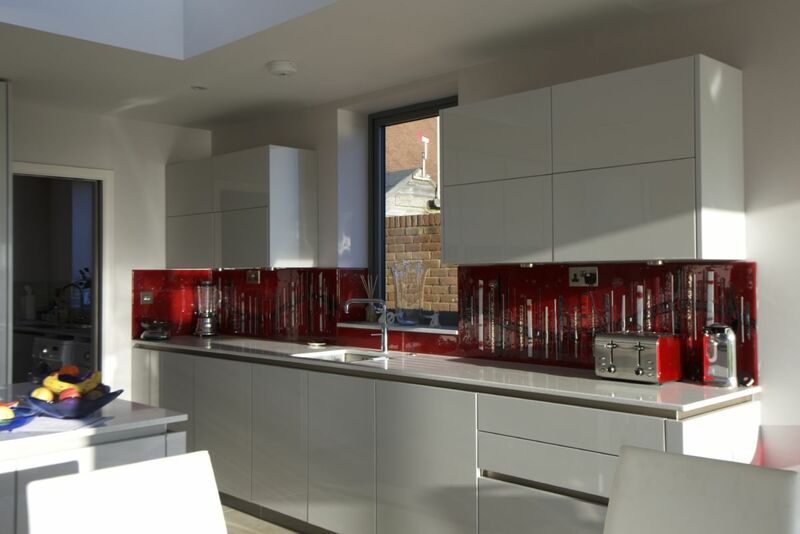 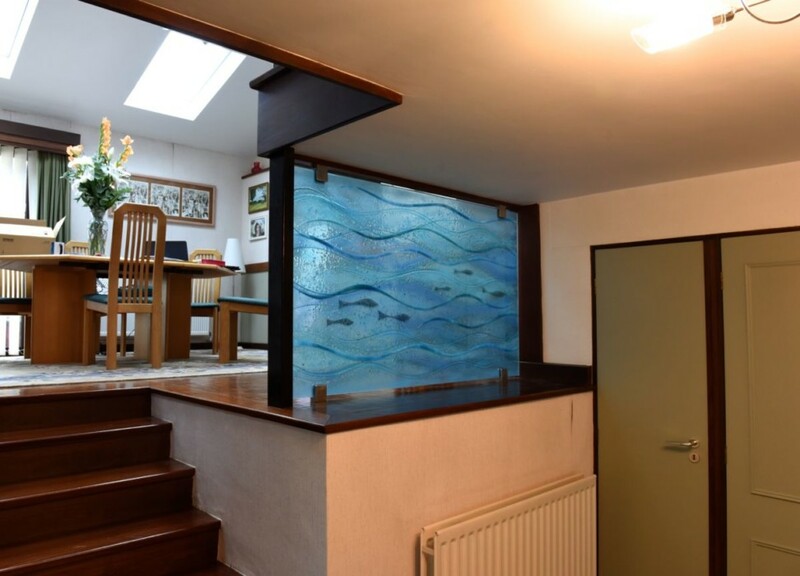 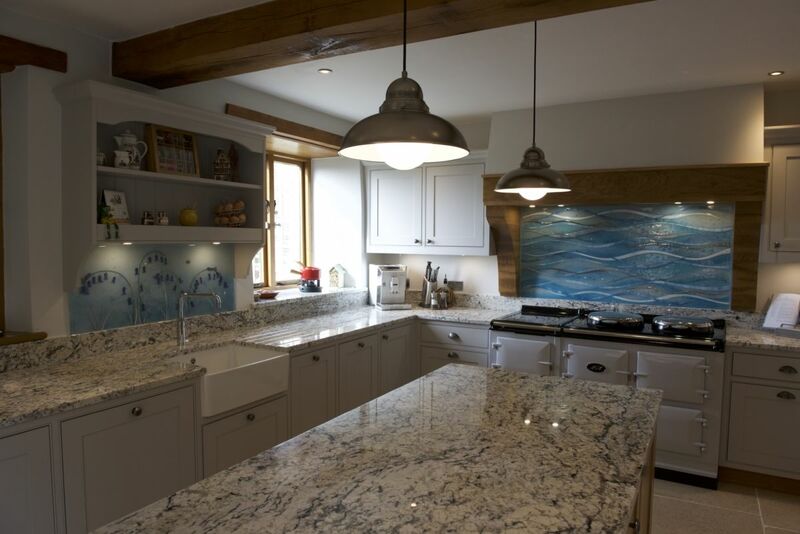 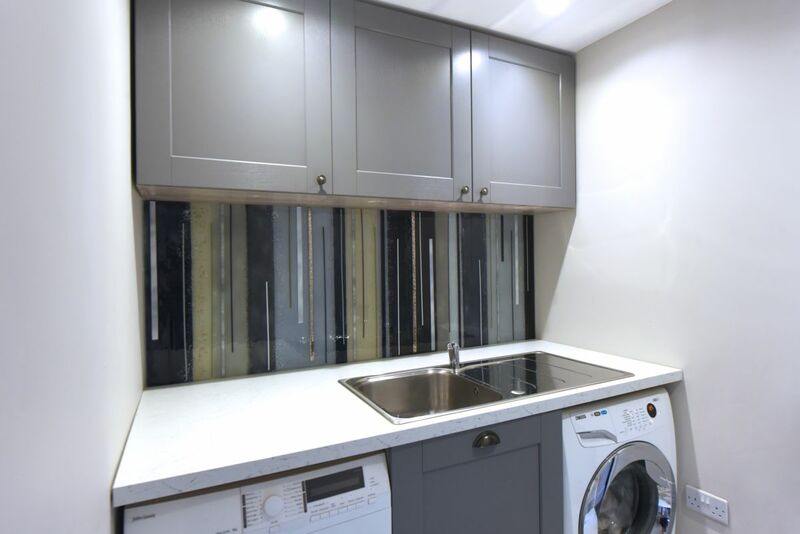 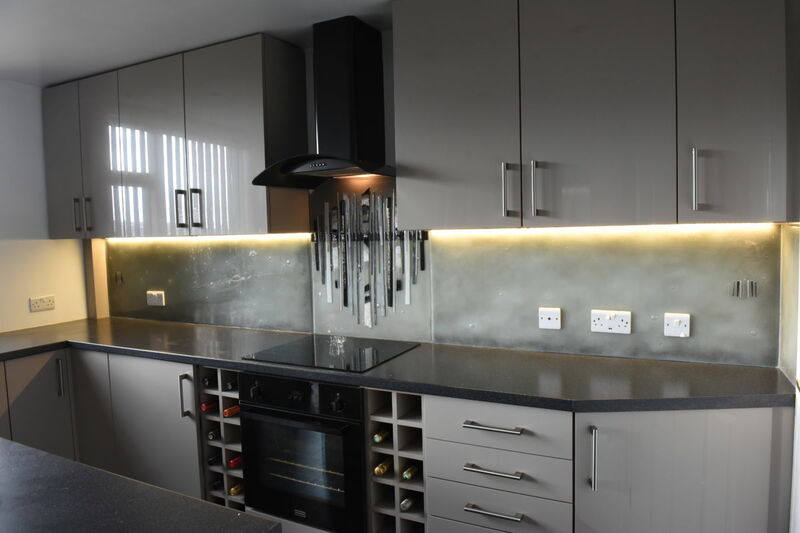 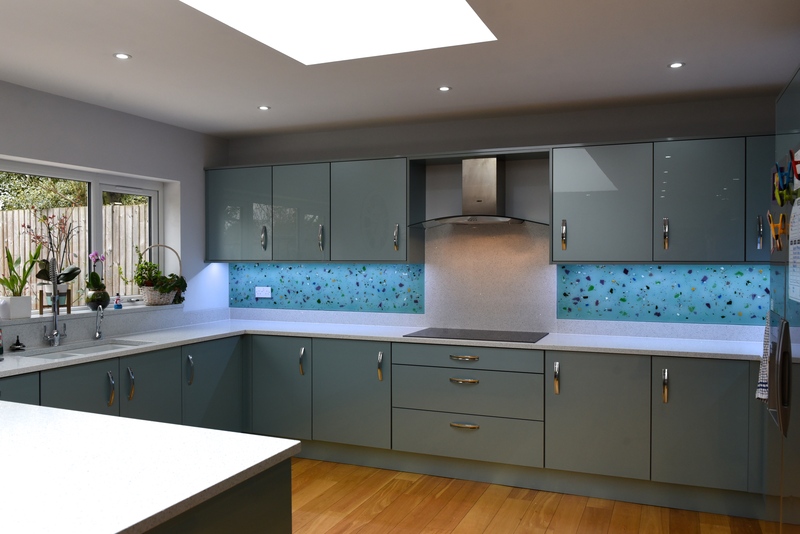 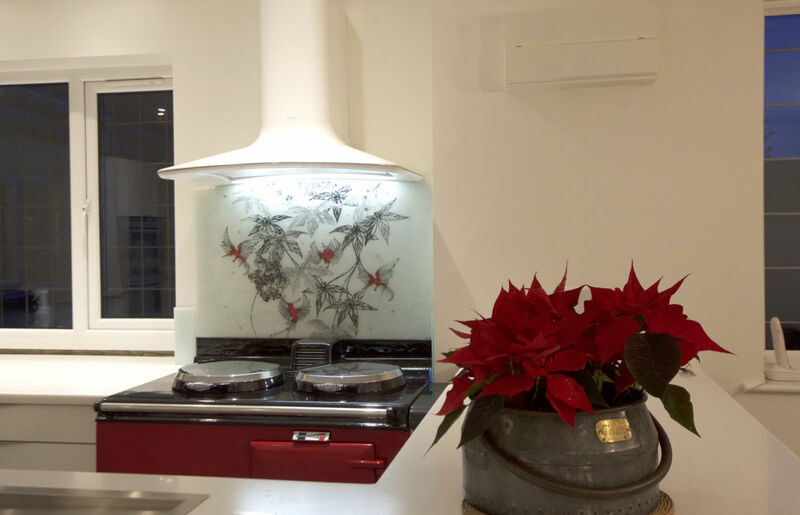 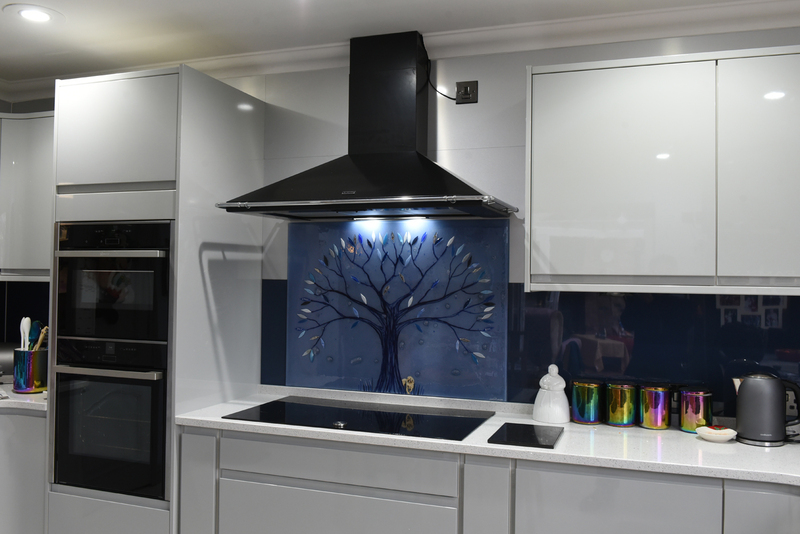 If you’re looking to bring your kitchen to life with something more exciting than traditional coloured splashbacks can offer, then The House of Ugly Fish is just the place for you. 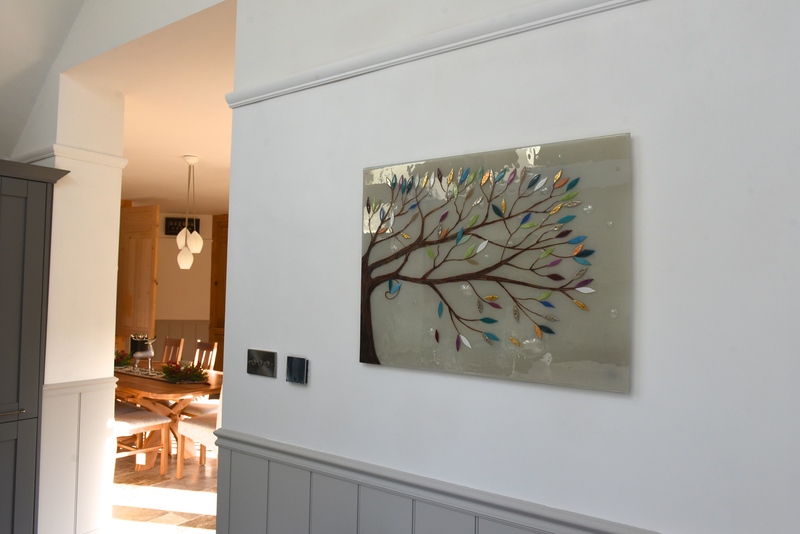 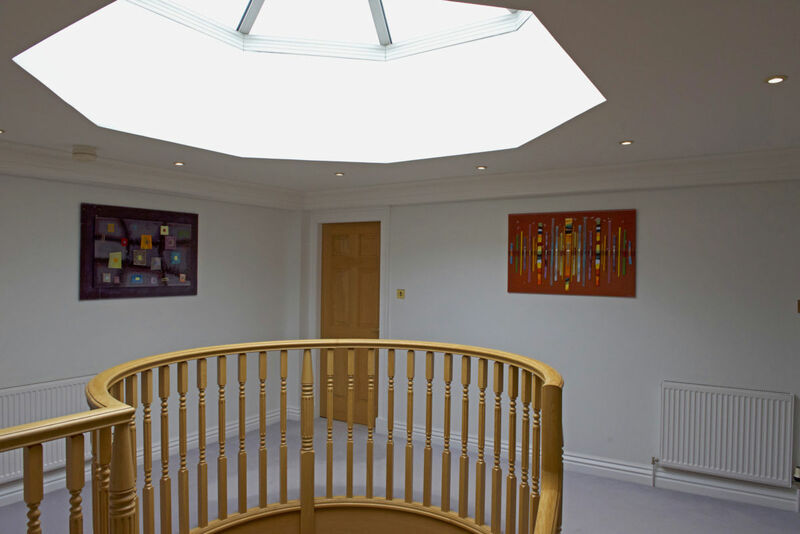 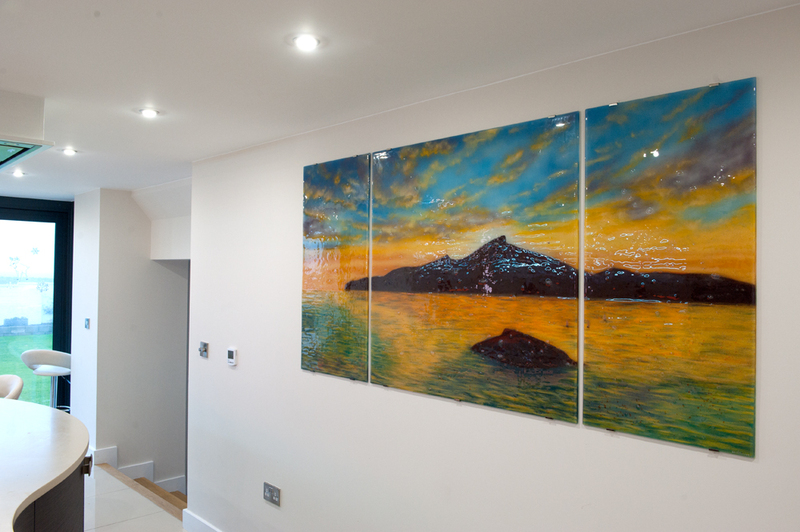 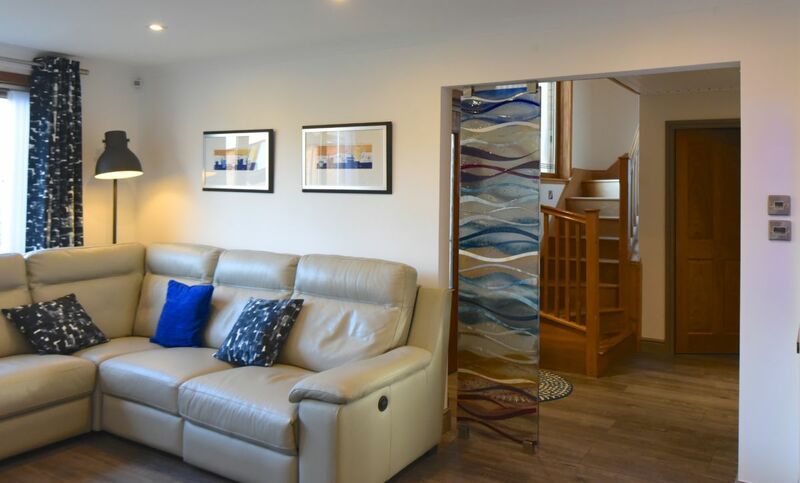 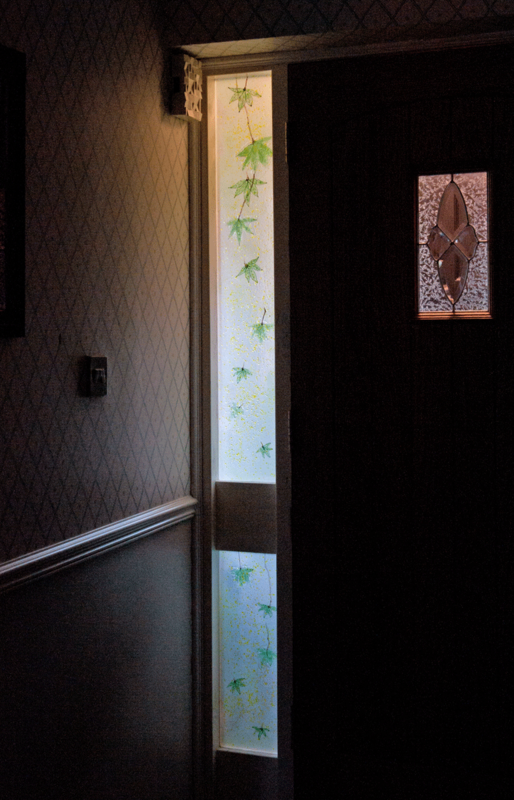 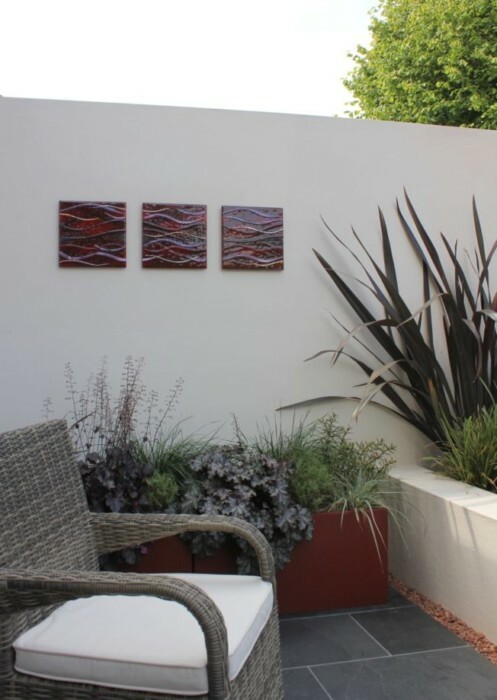 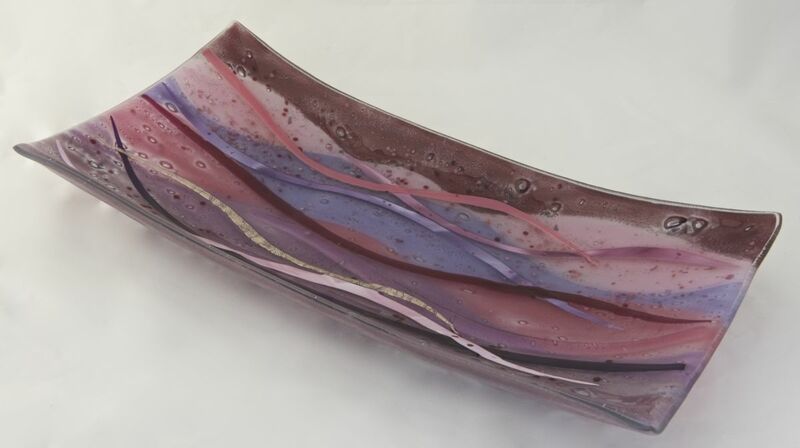 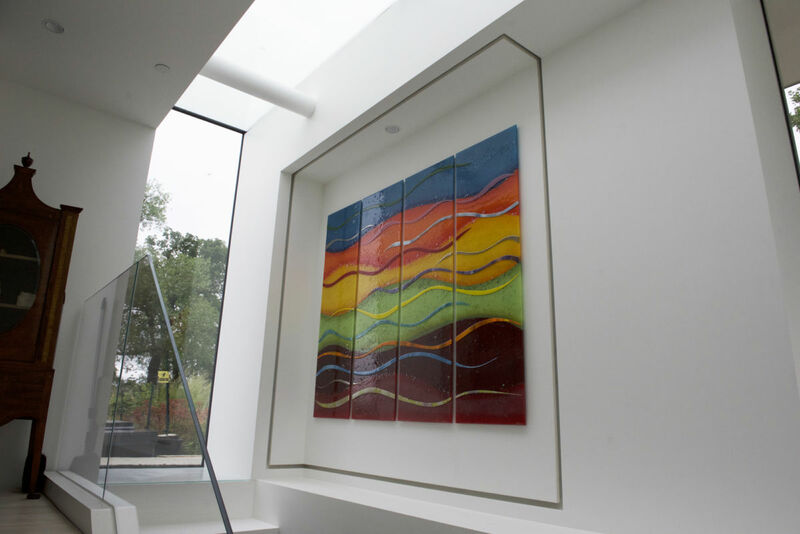 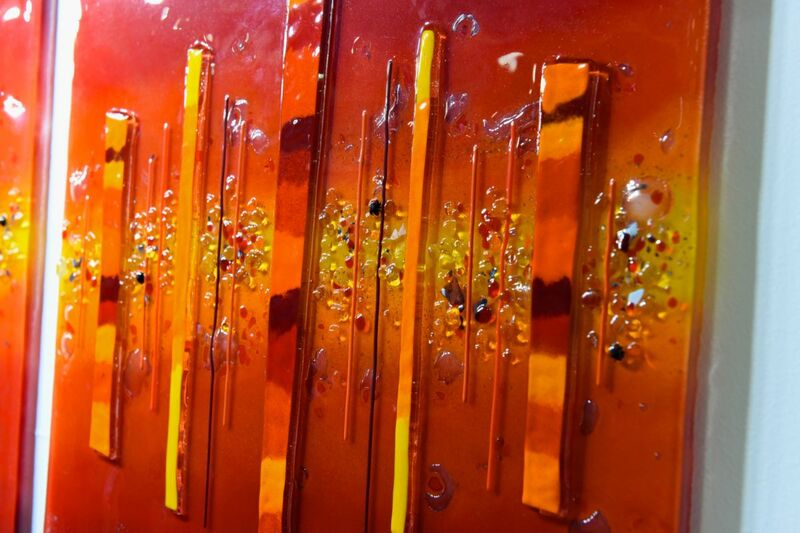 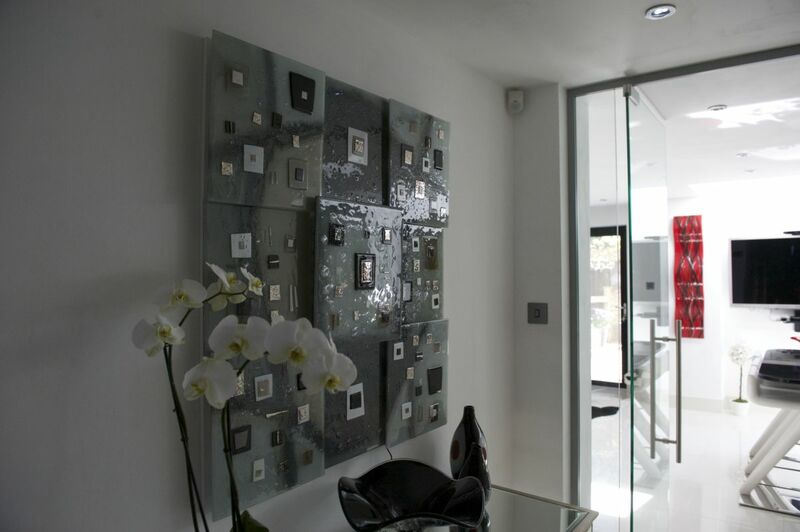 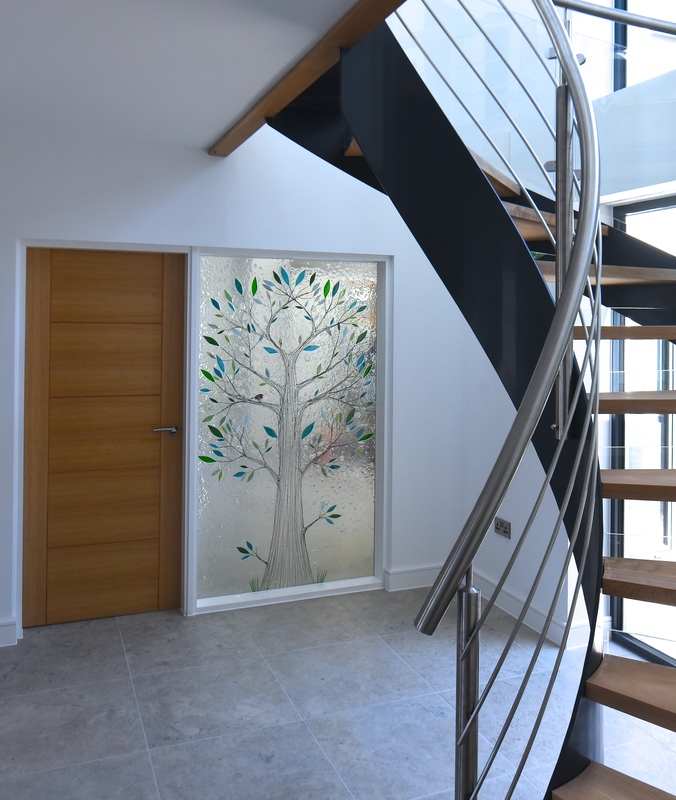 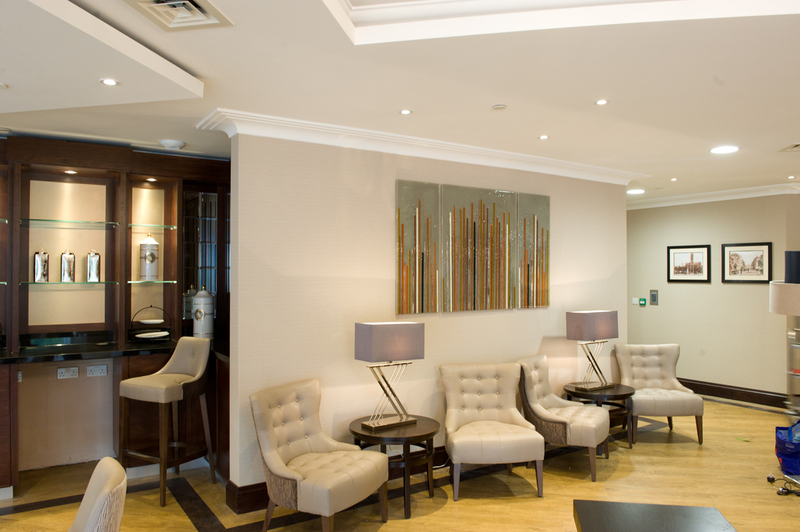 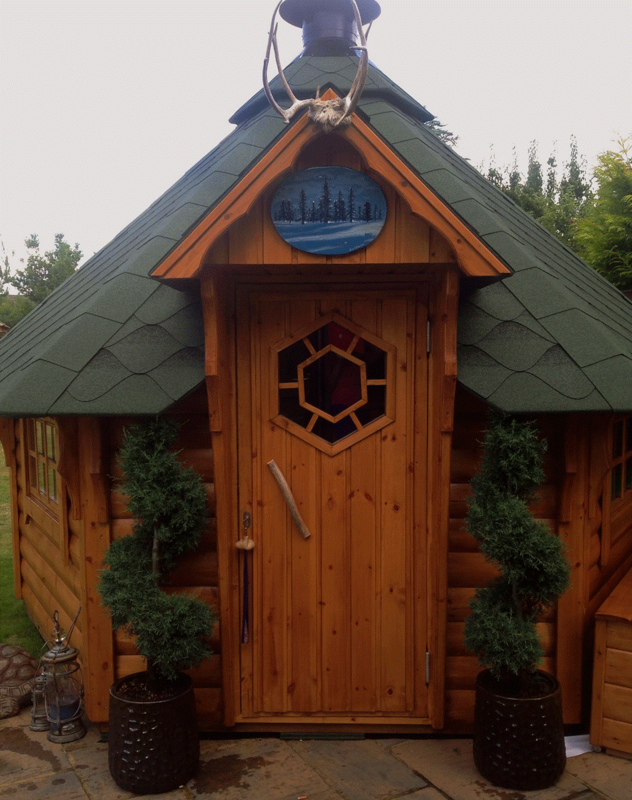 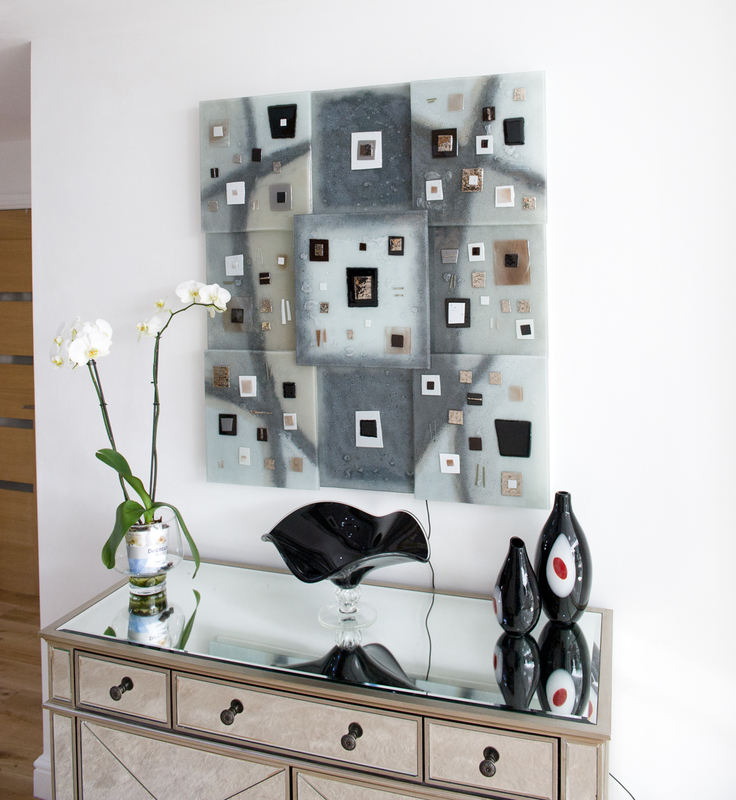 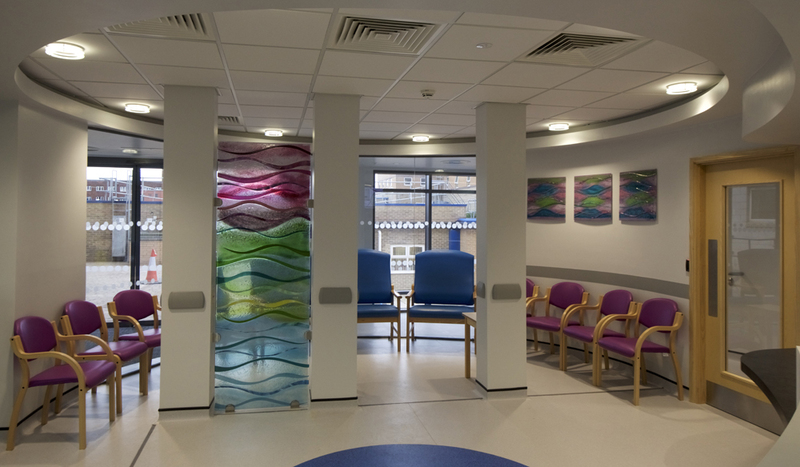 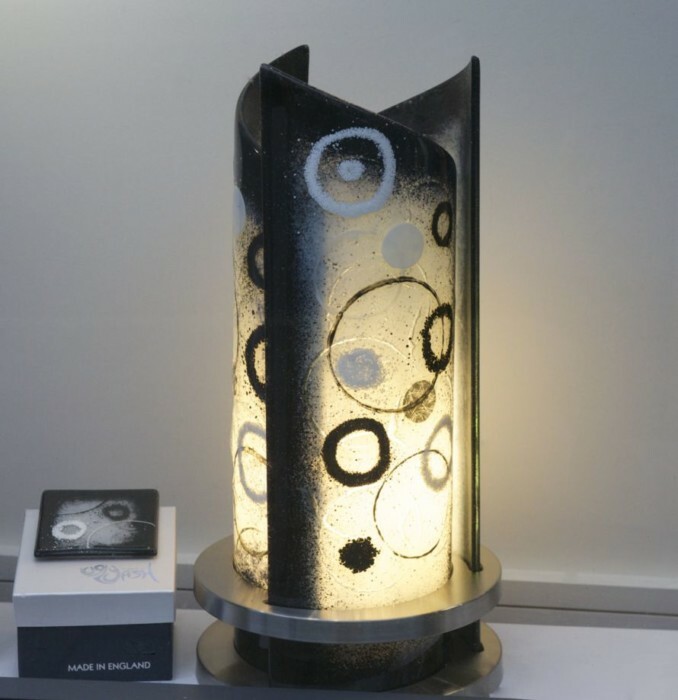 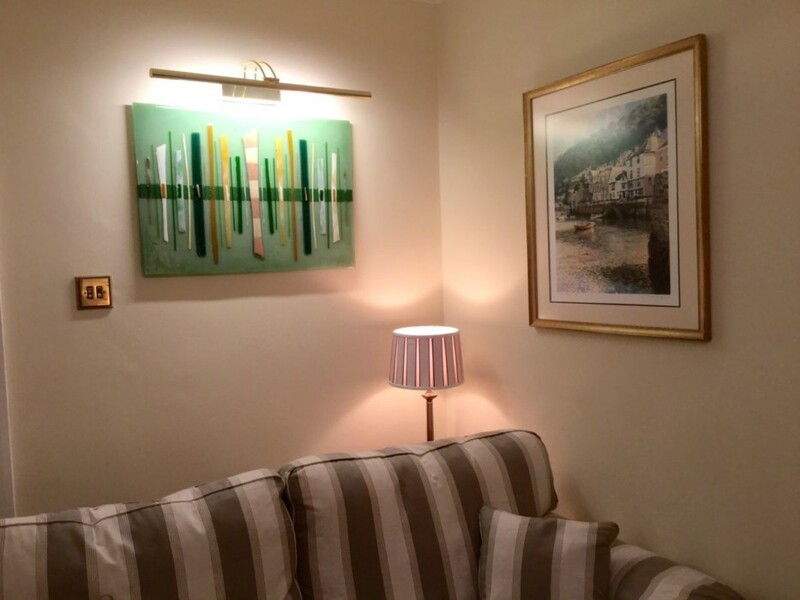 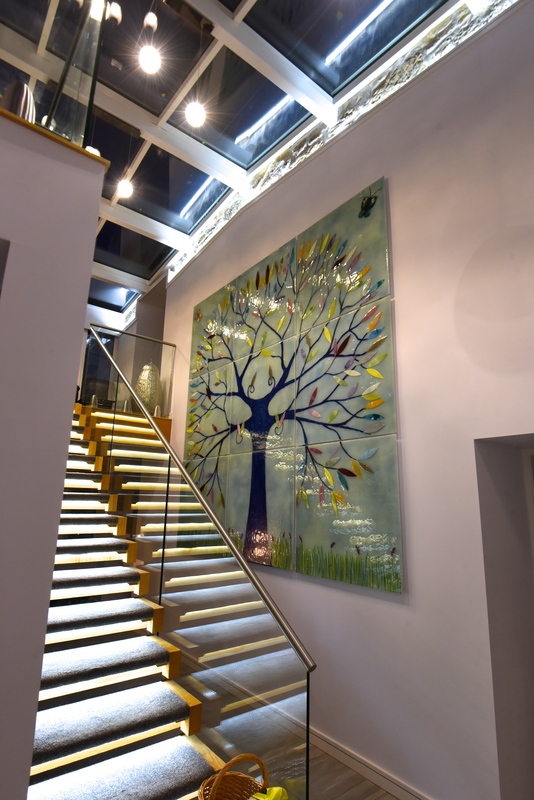 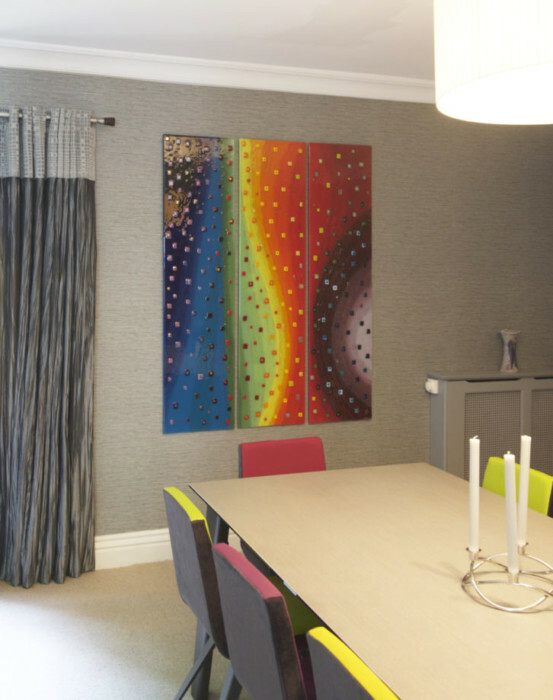 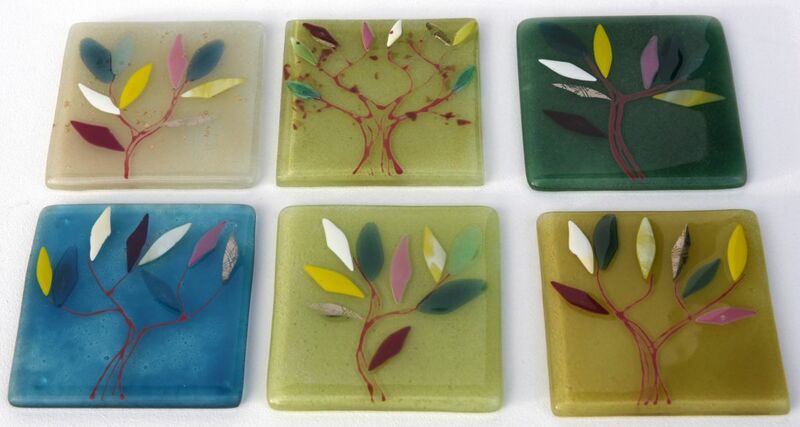 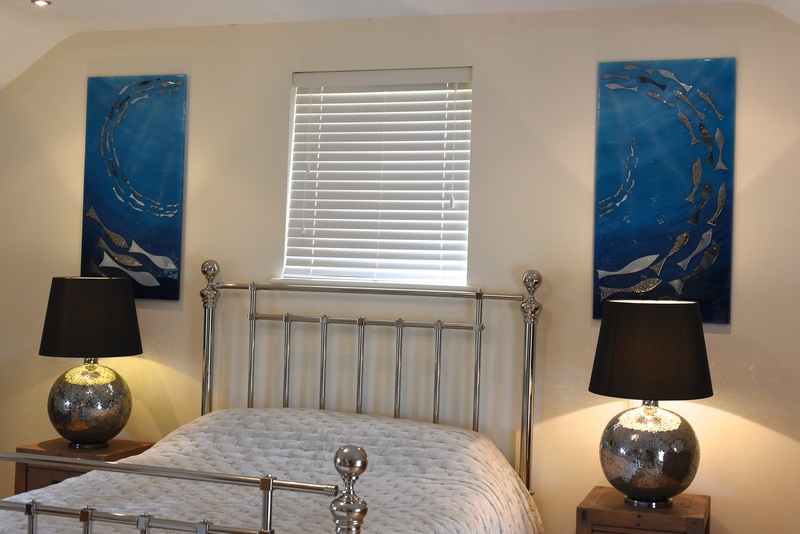 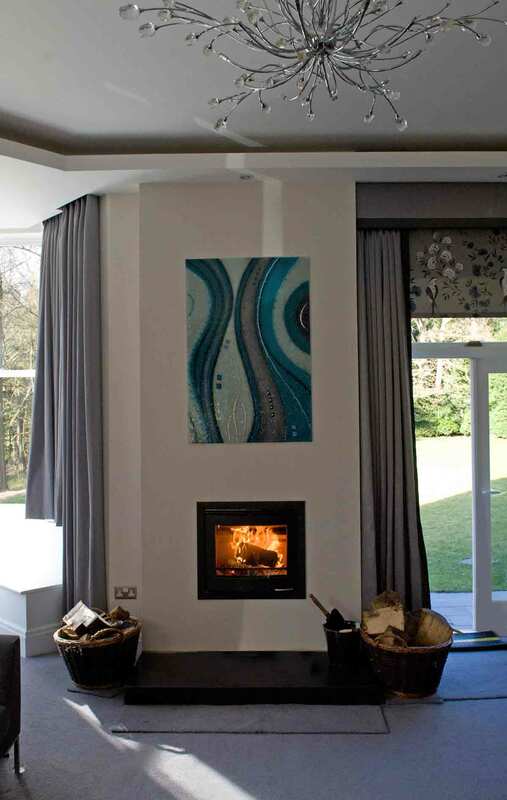 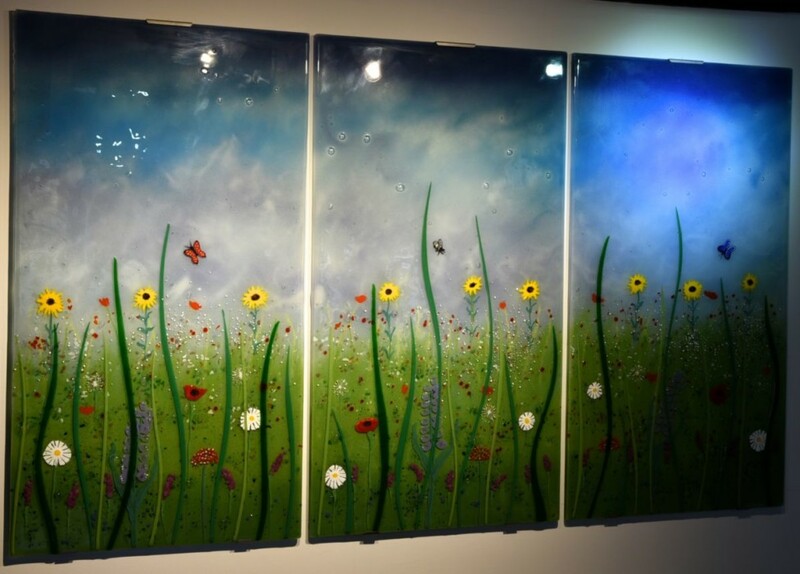 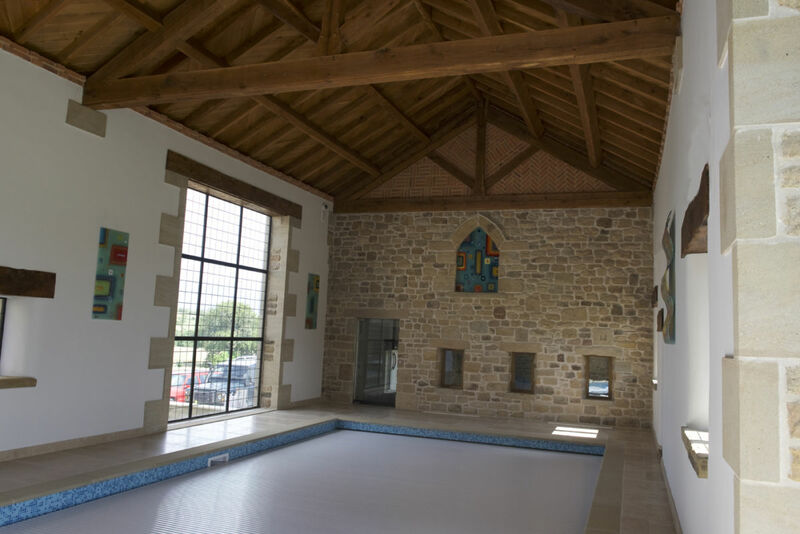 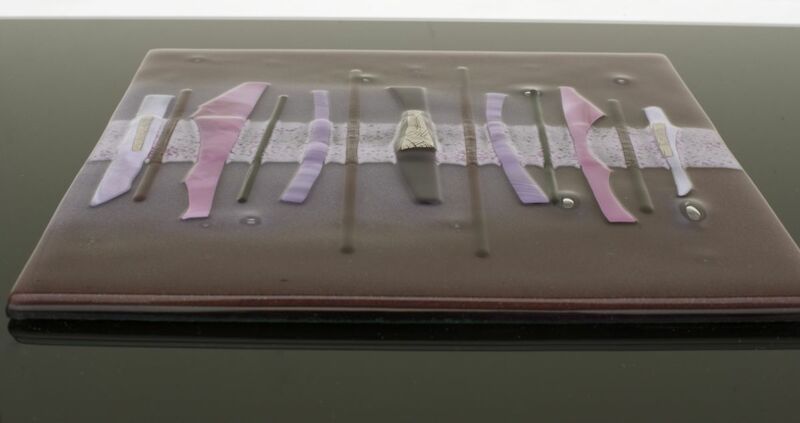 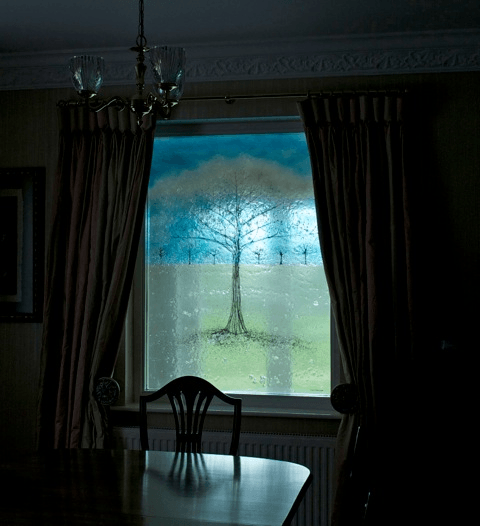 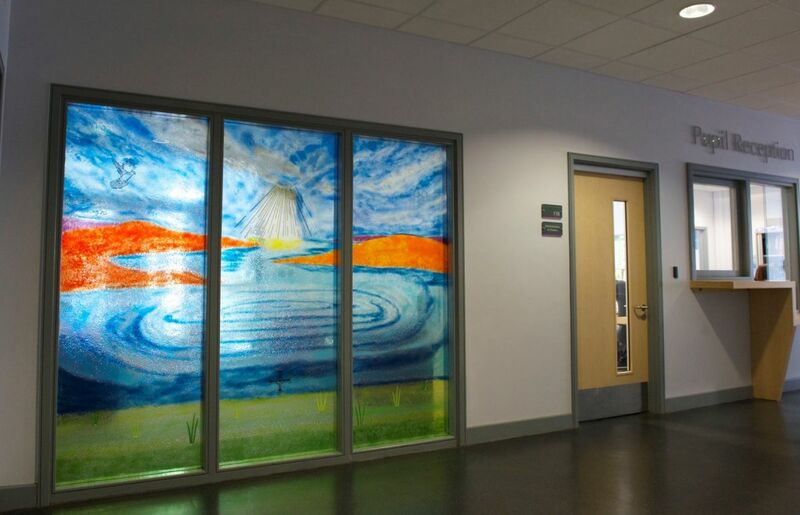 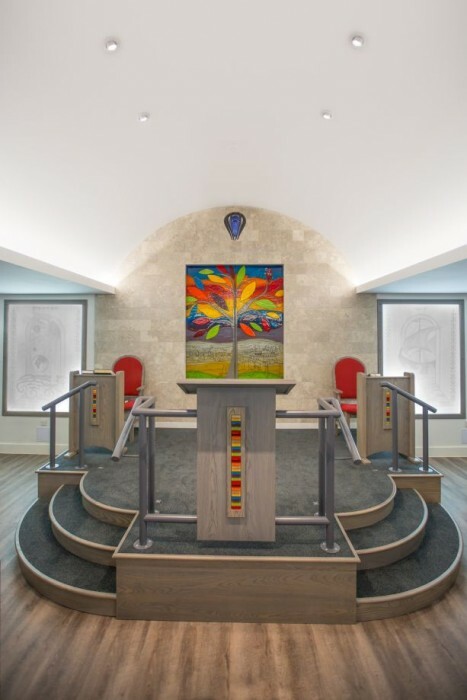 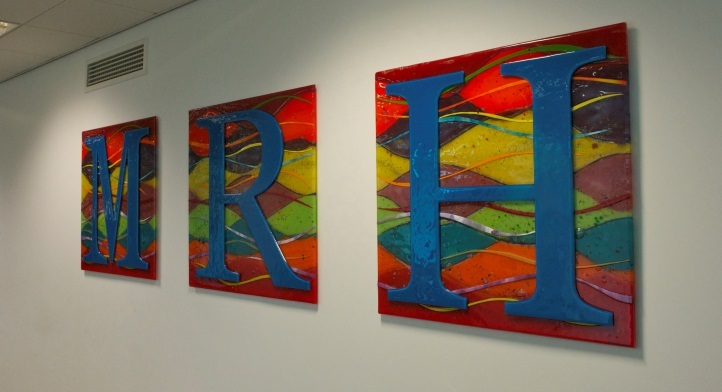 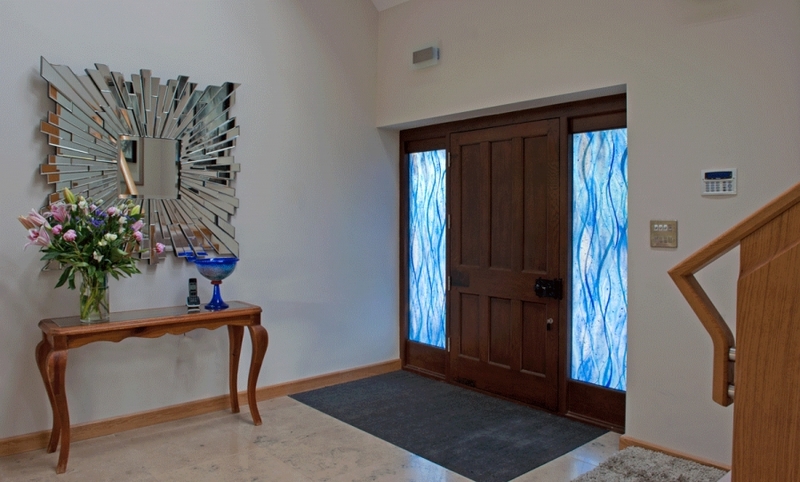 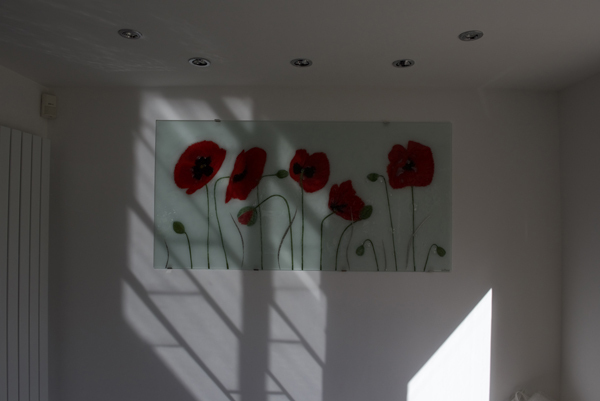 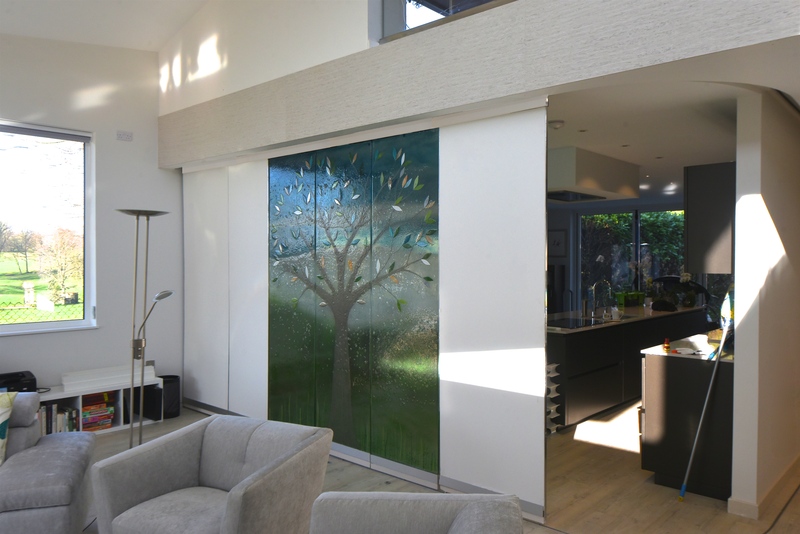 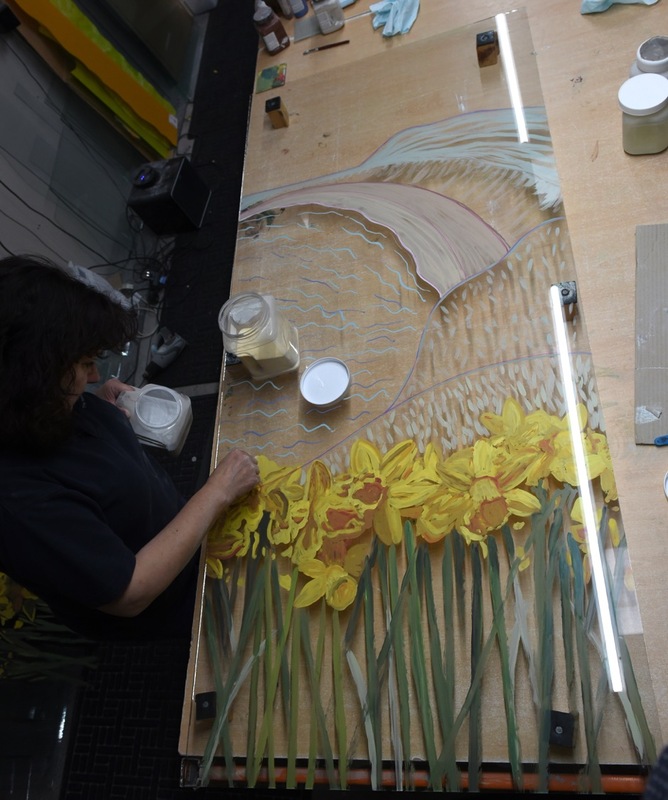 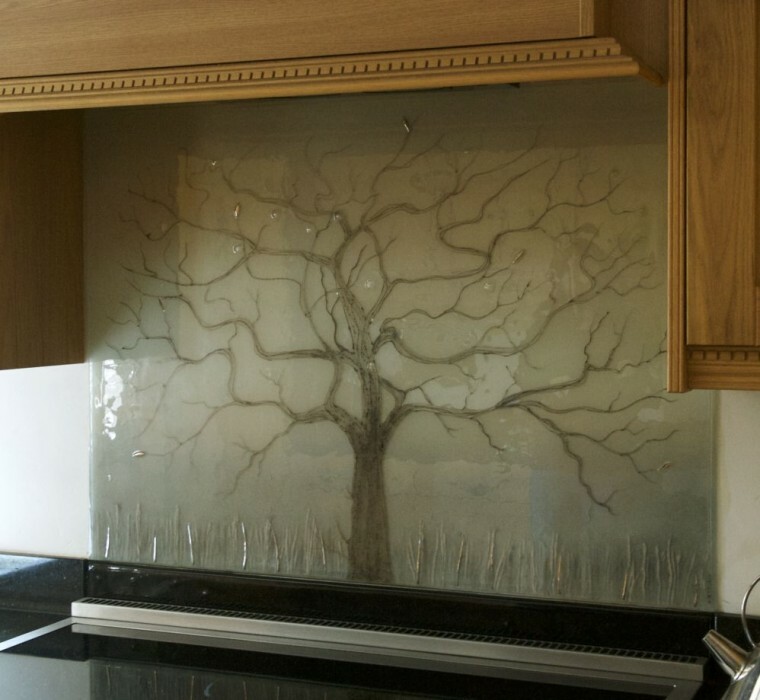 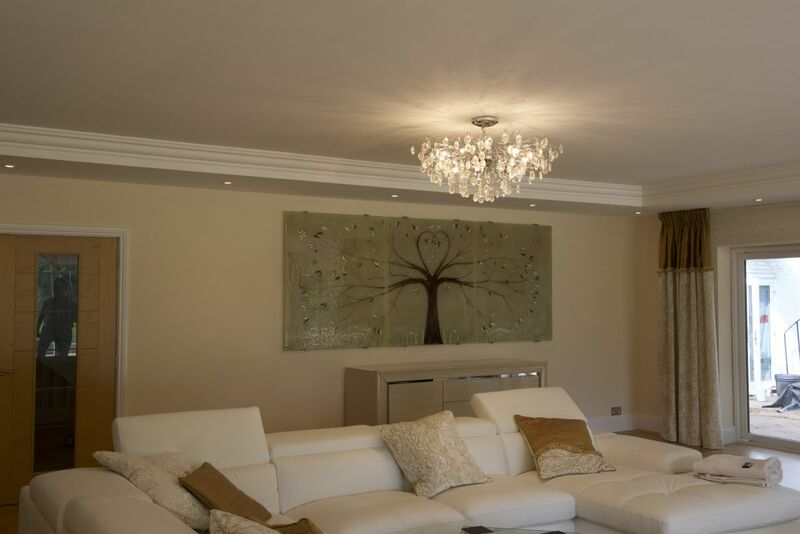 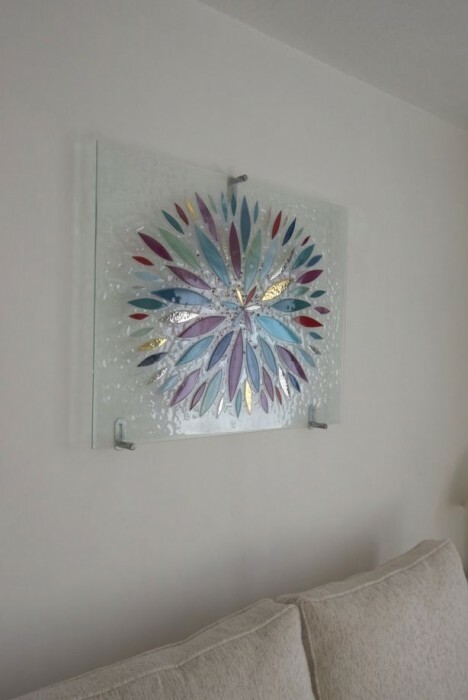 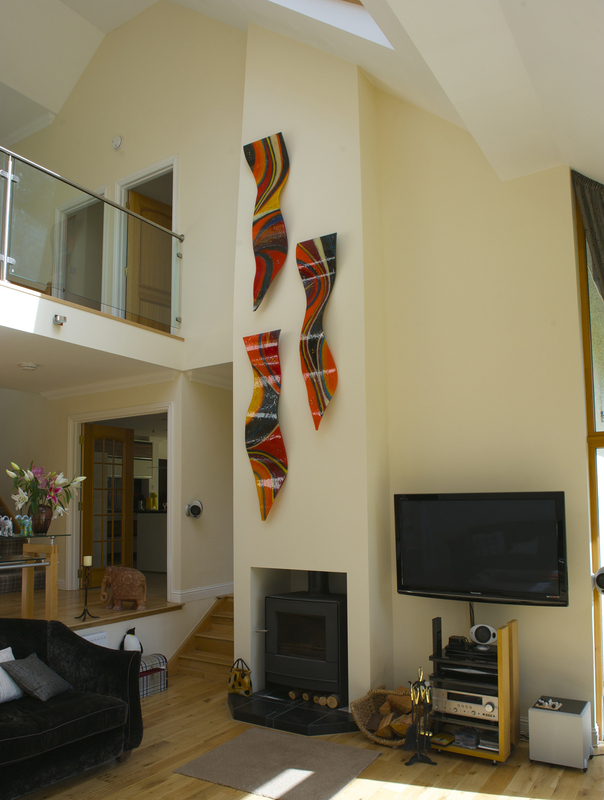 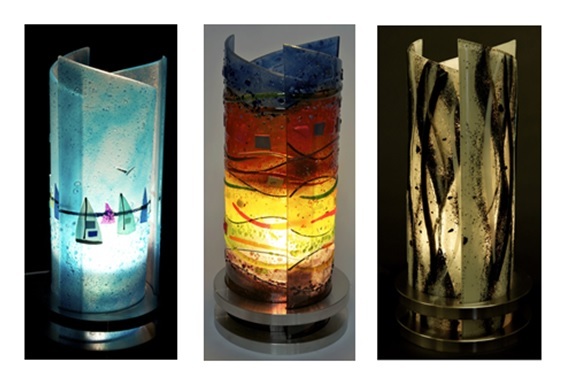 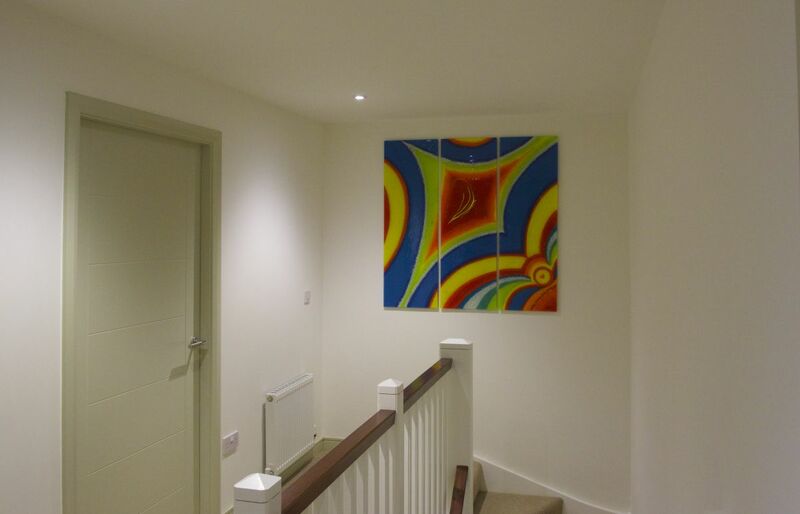 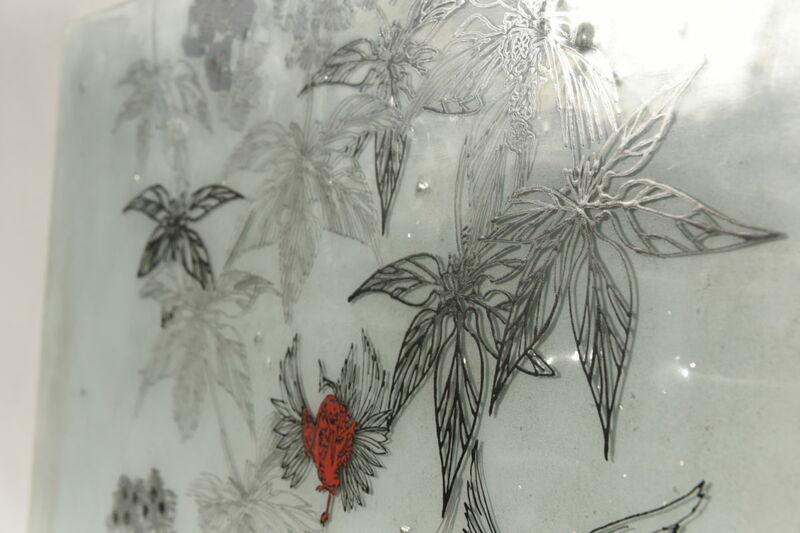 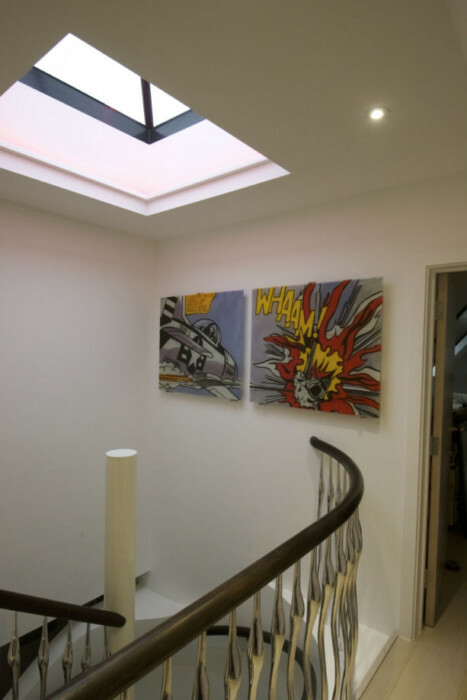 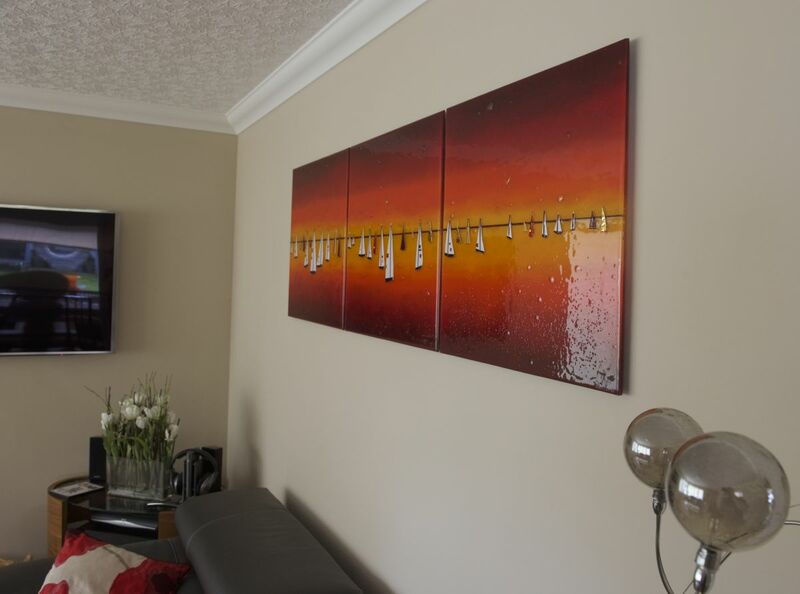 Every piece of glass we create is handmade and can be as bespoke as you’d like it to be, allowing you to have a work of art that’s completely personalised just for you. 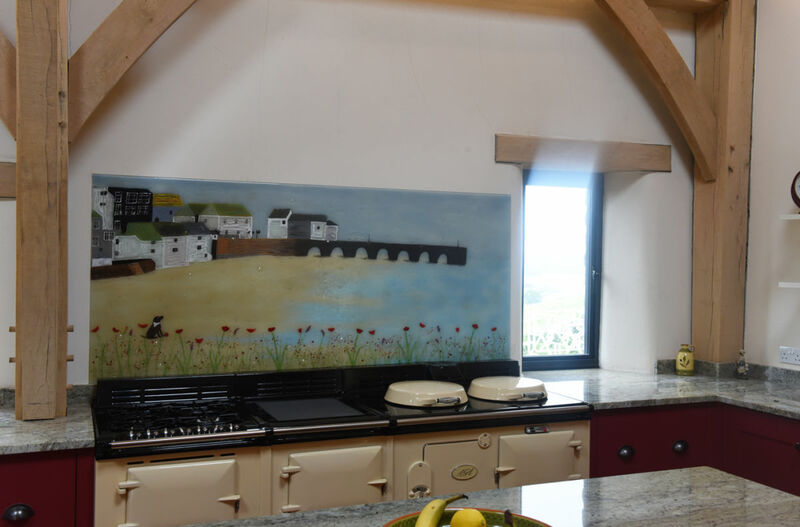 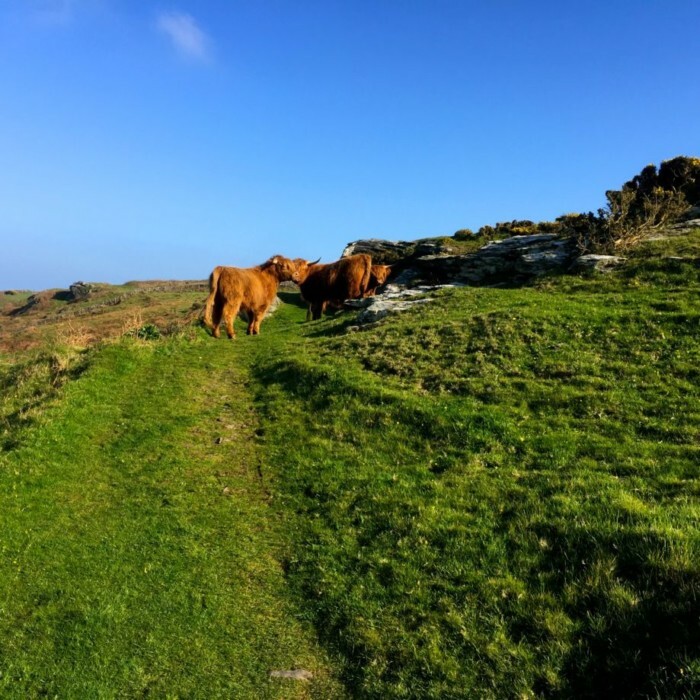 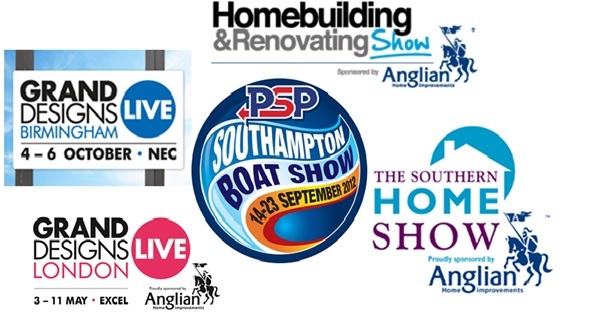 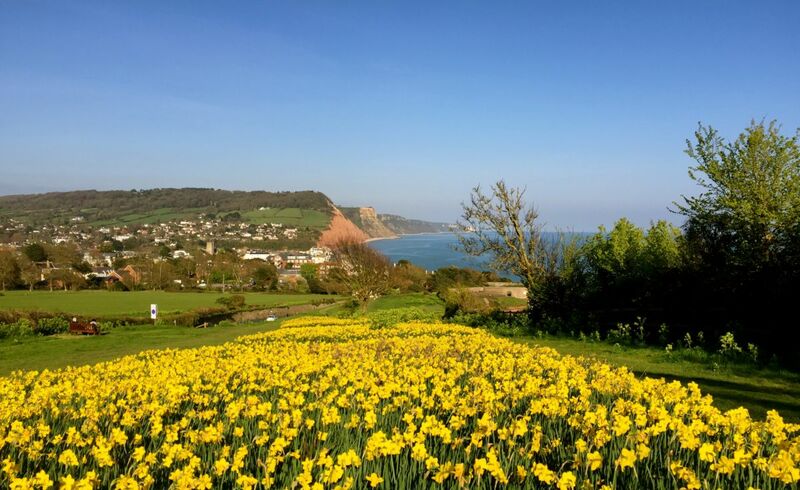 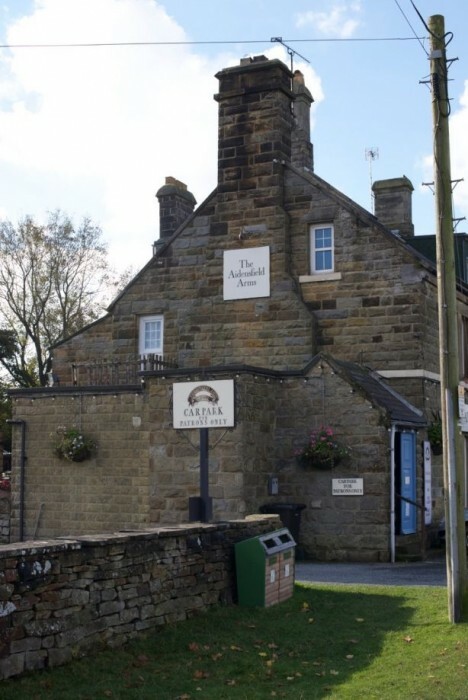 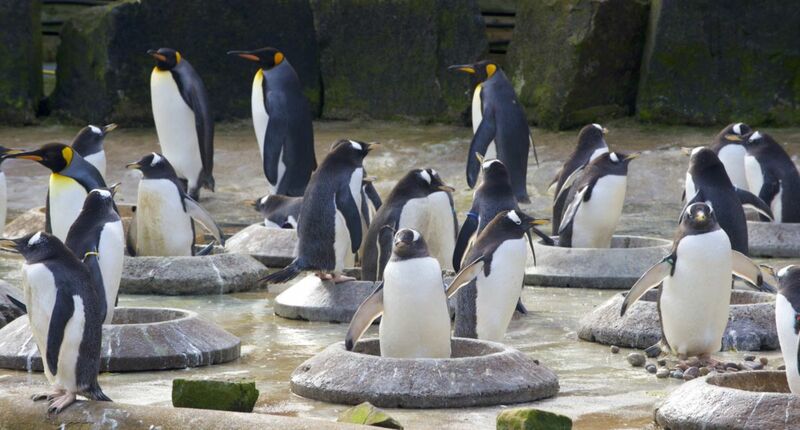 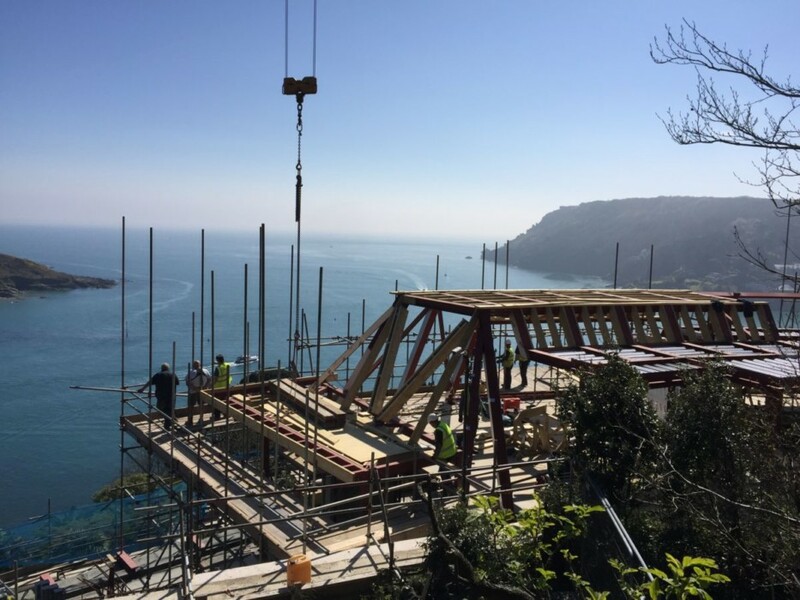 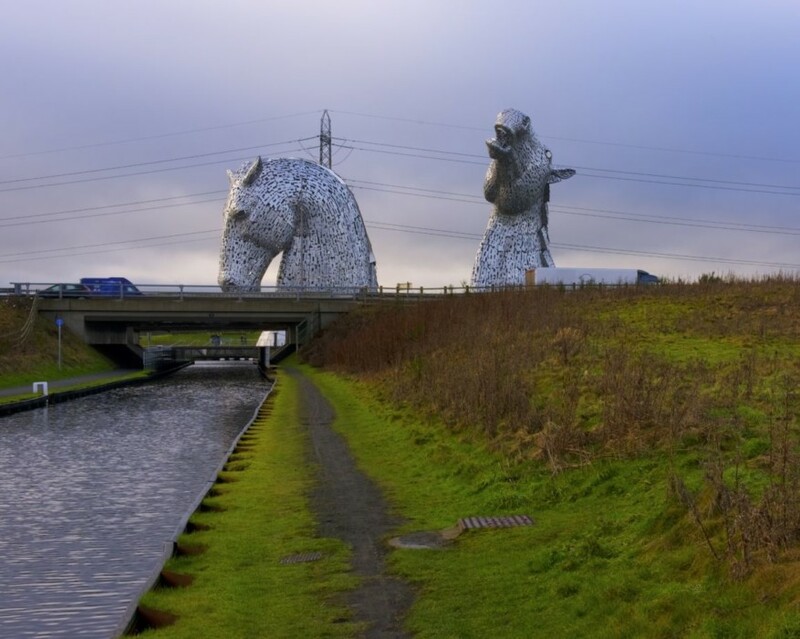 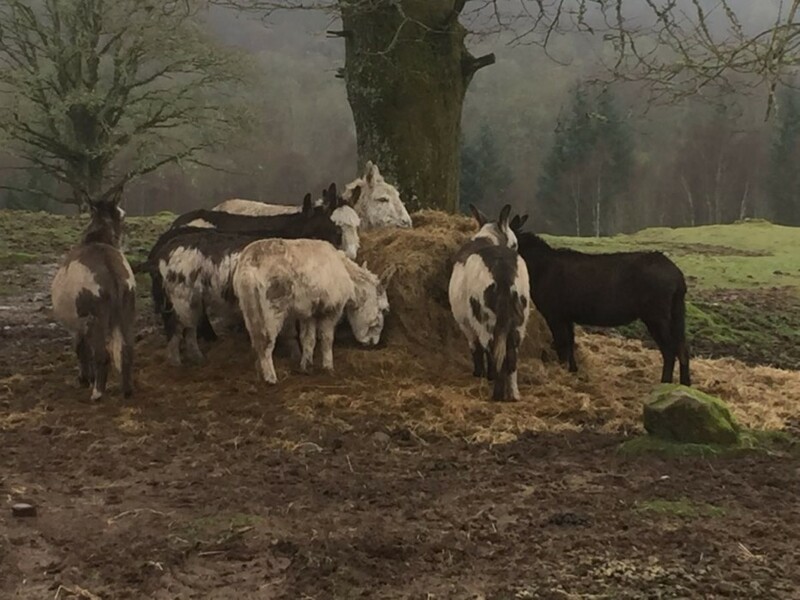 You can find our contact details right here on our website, so getting in touch really is as simple as you may hope. 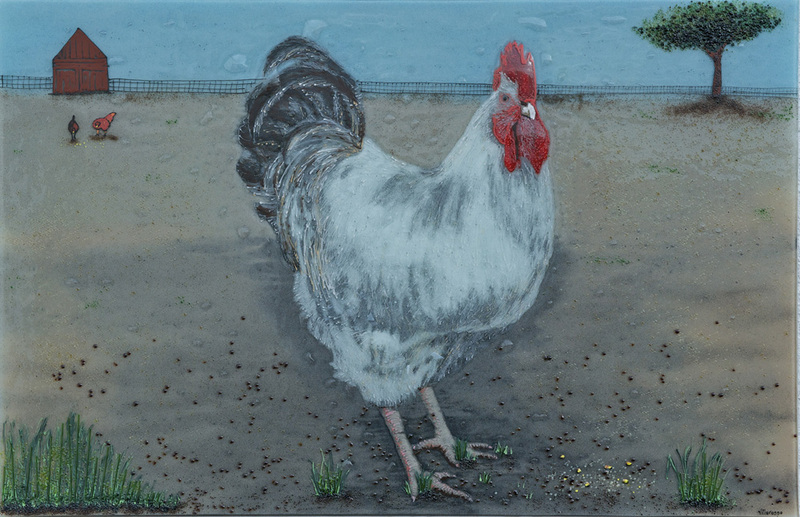 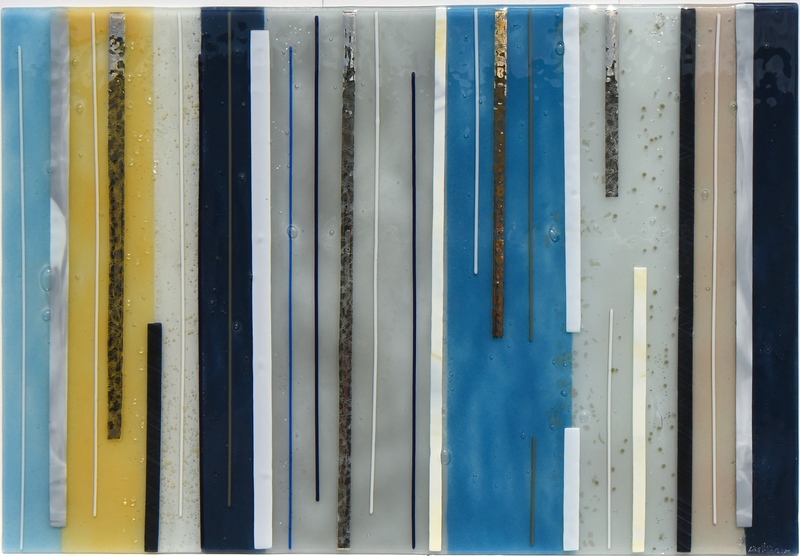 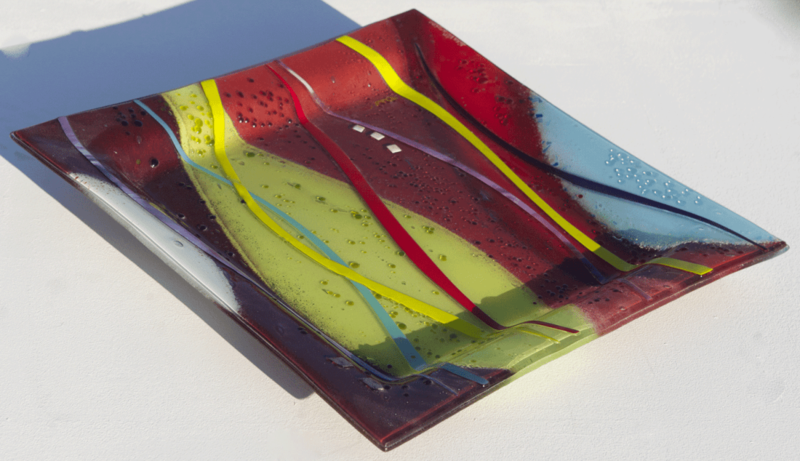 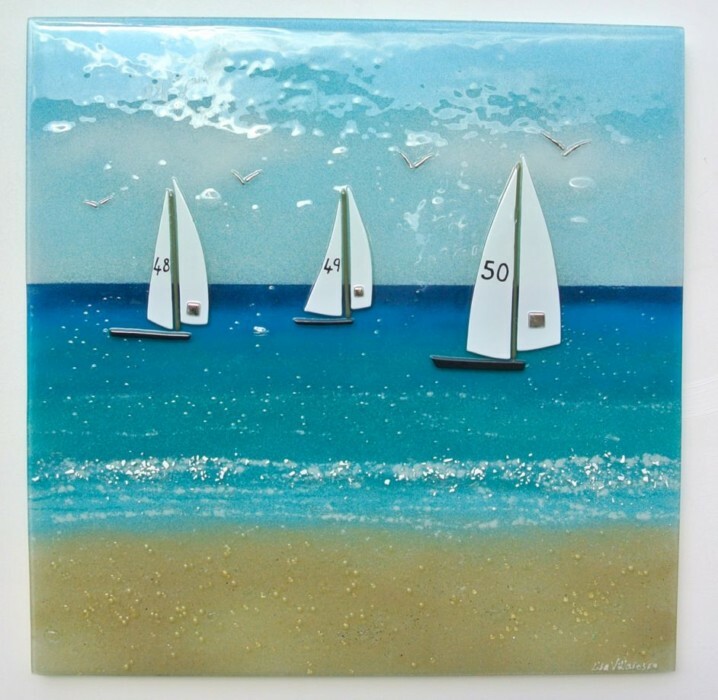 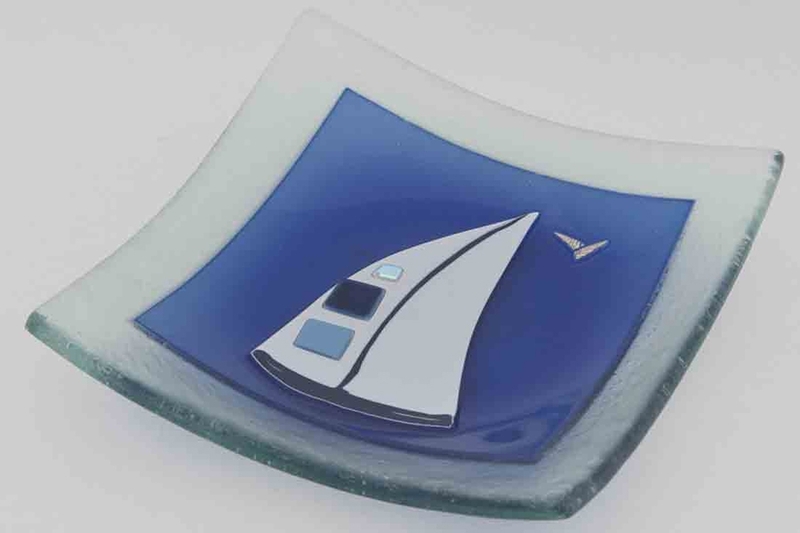 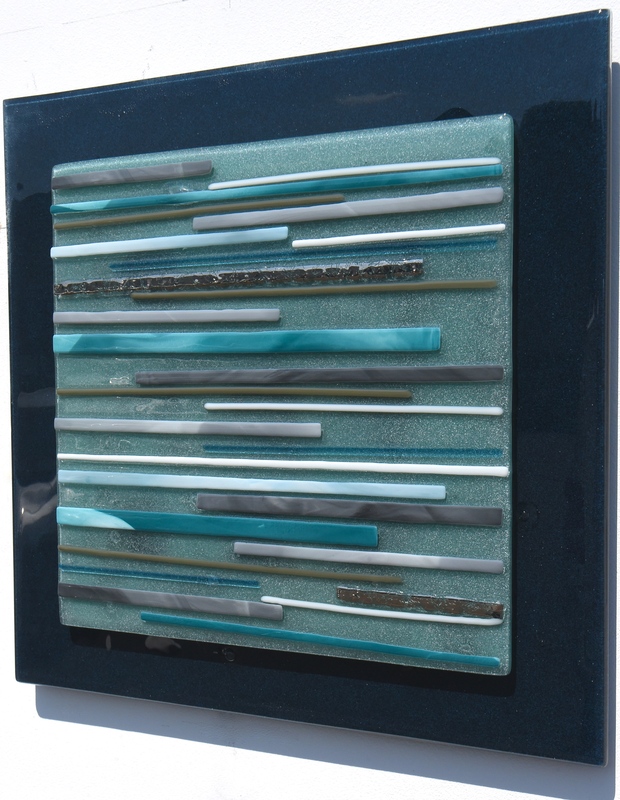 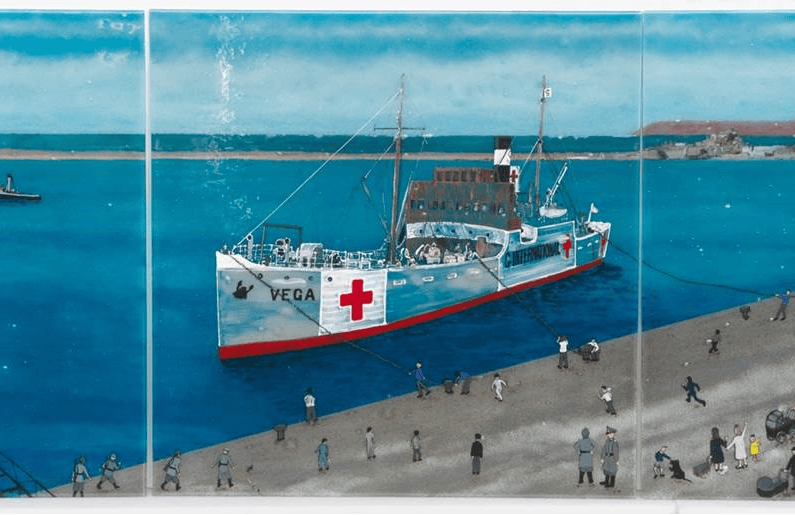 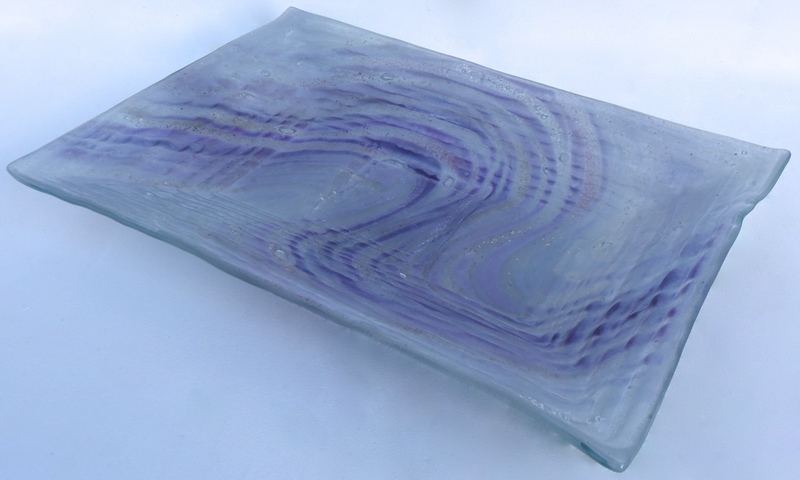 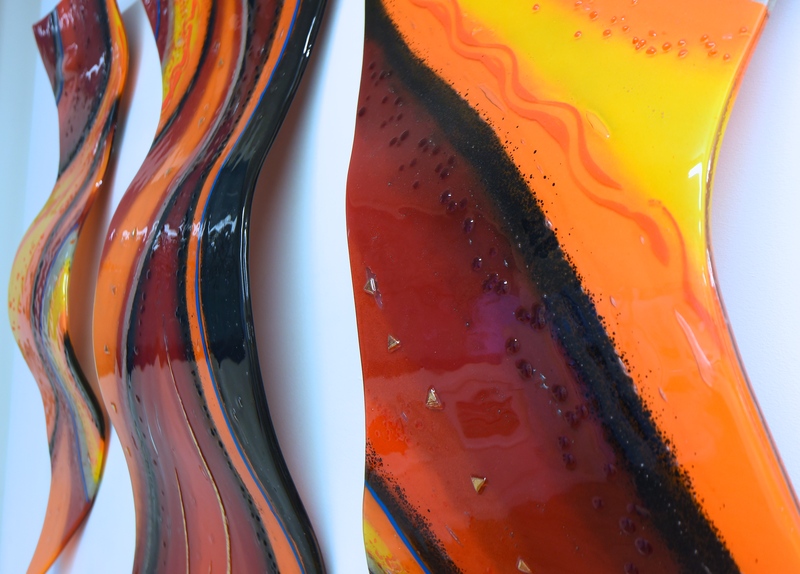 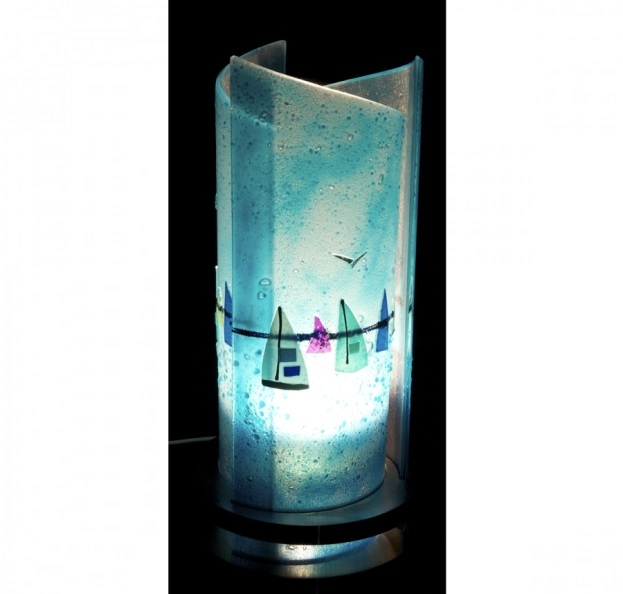 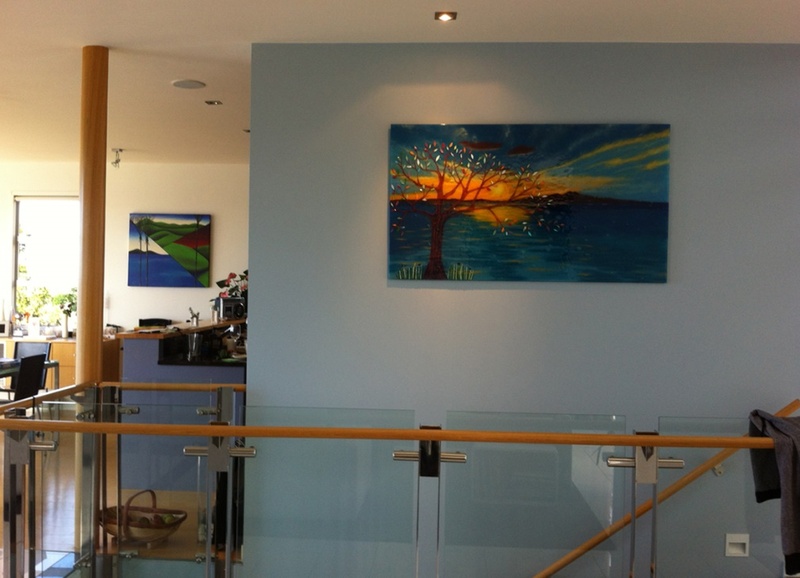 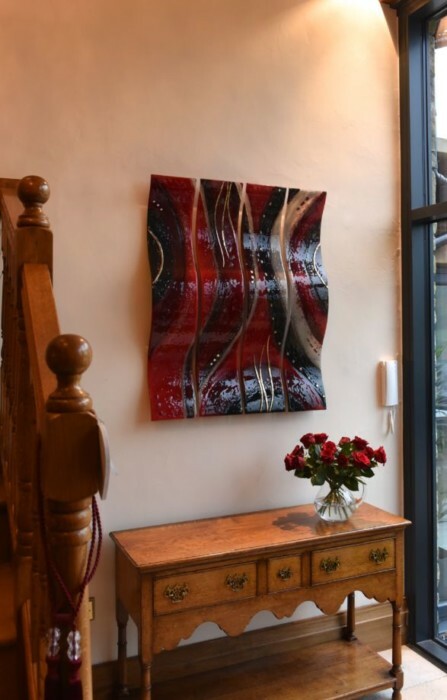 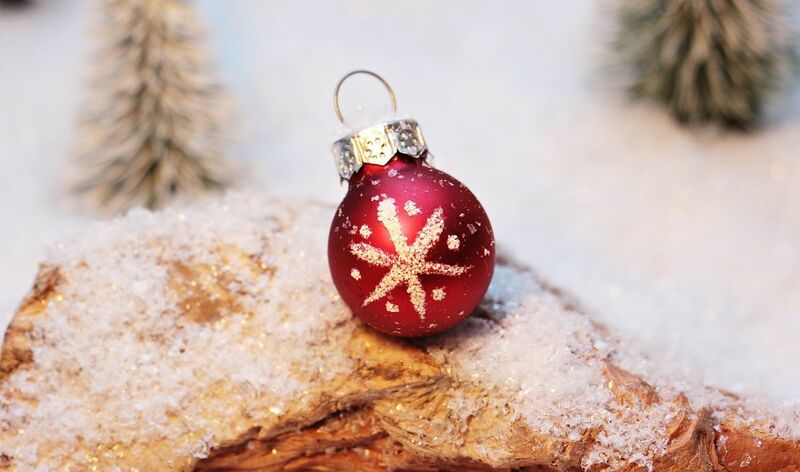 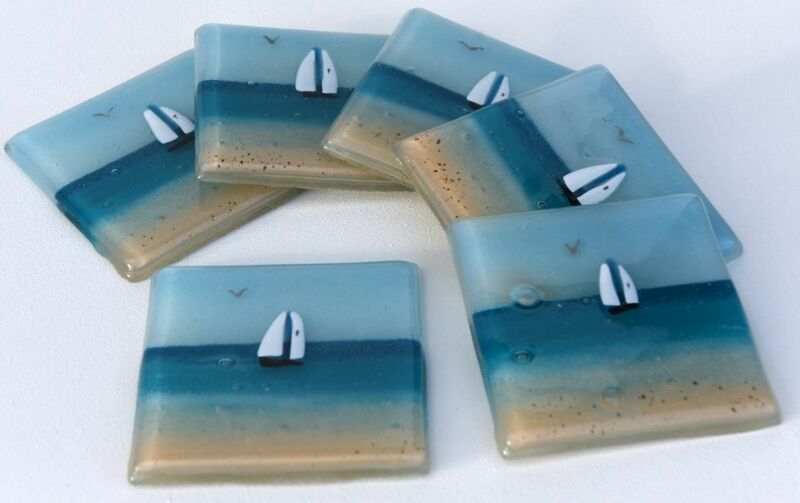 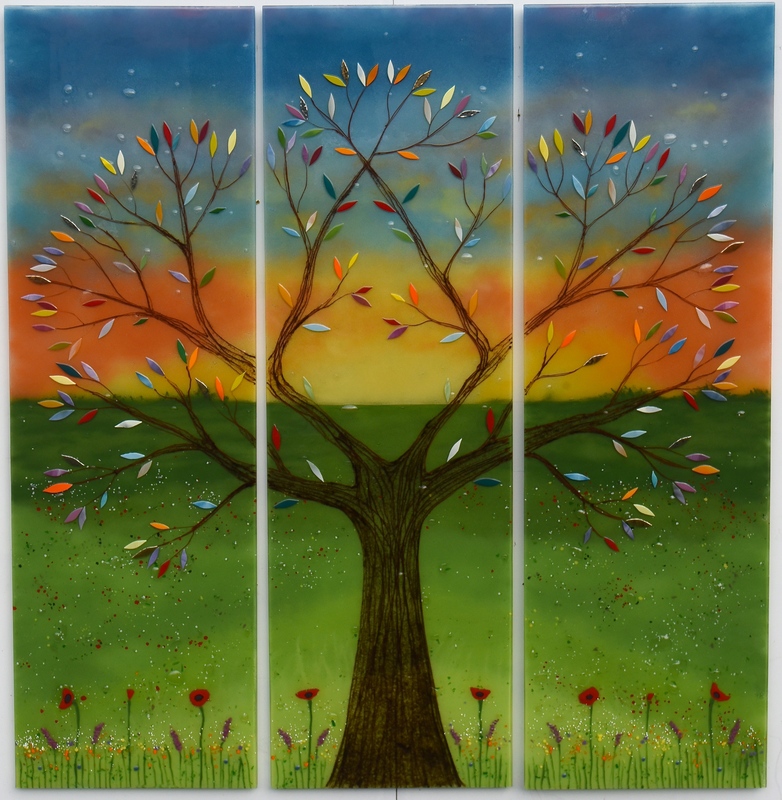 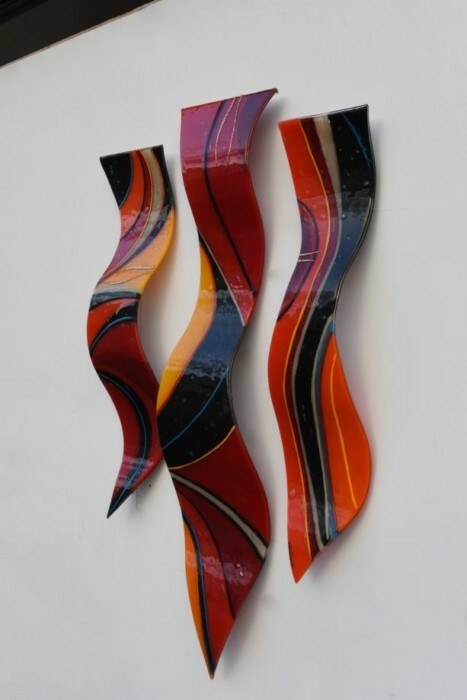 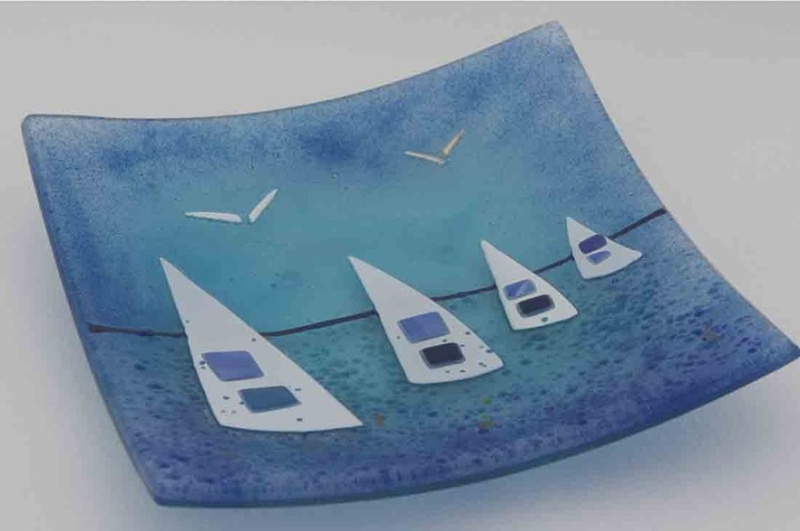 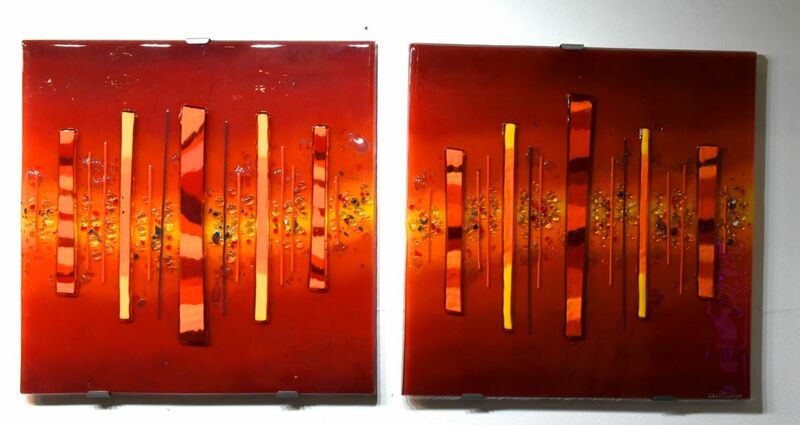 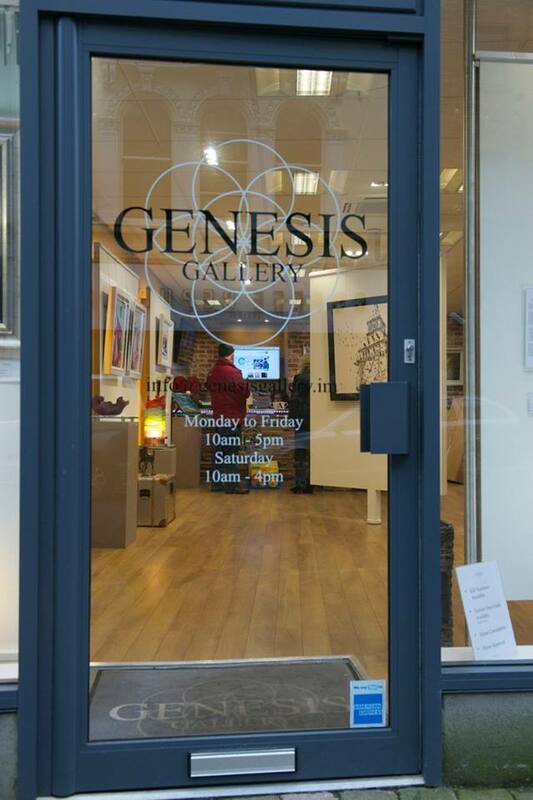 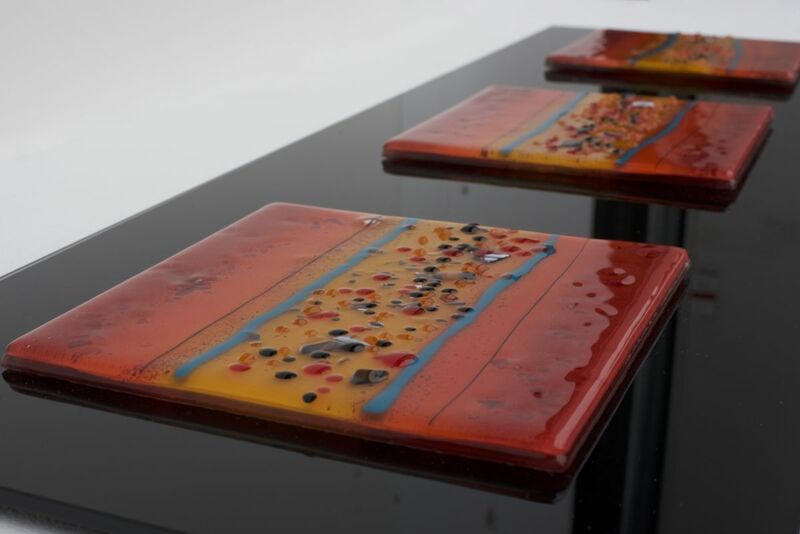 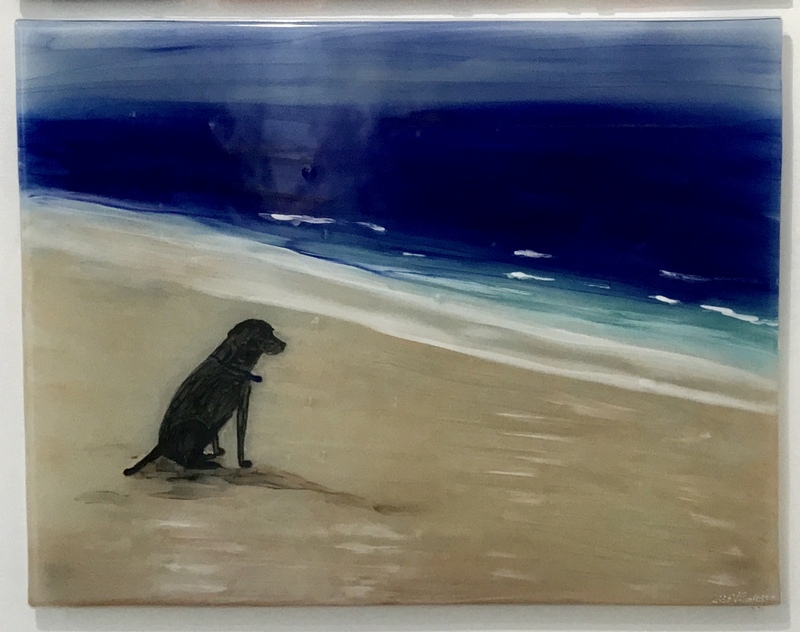 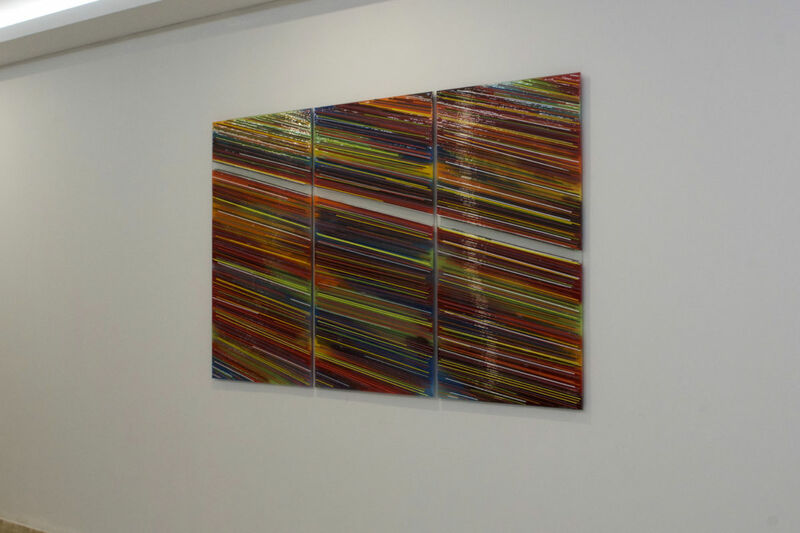 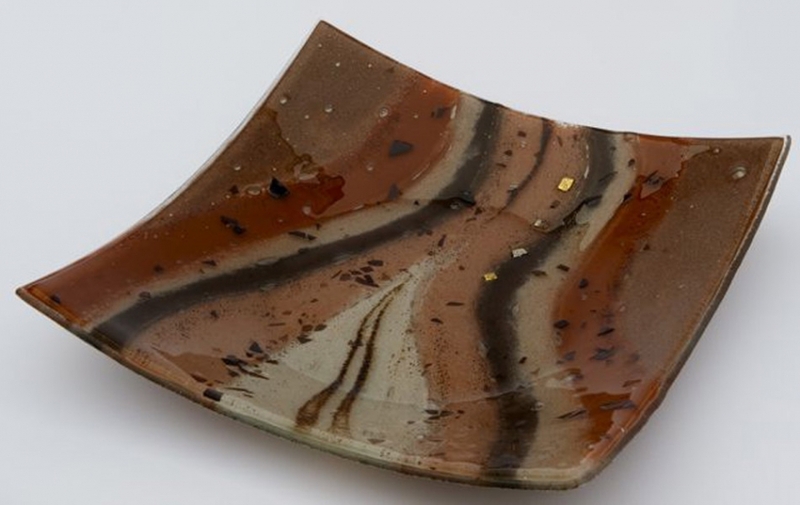 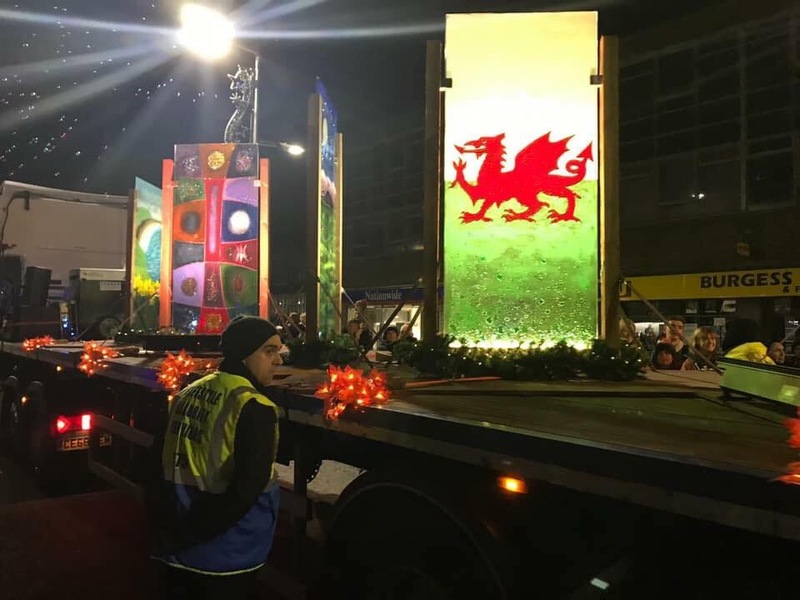 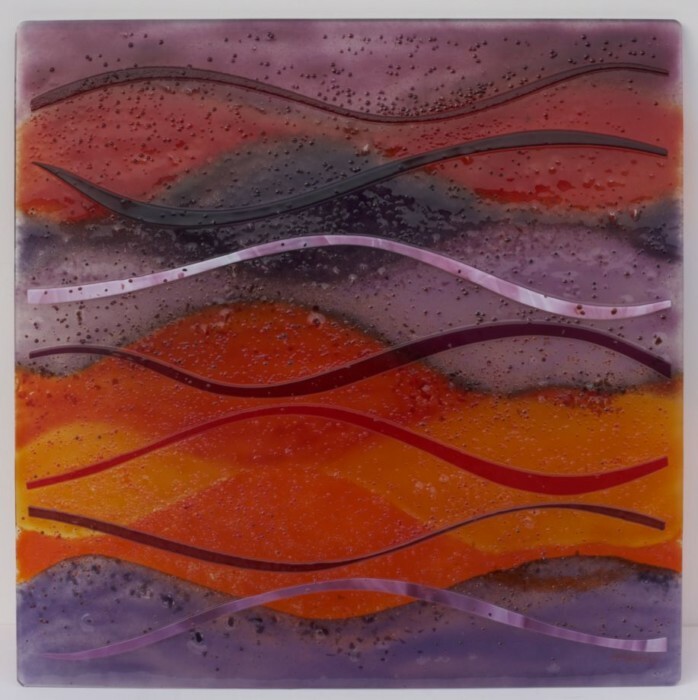 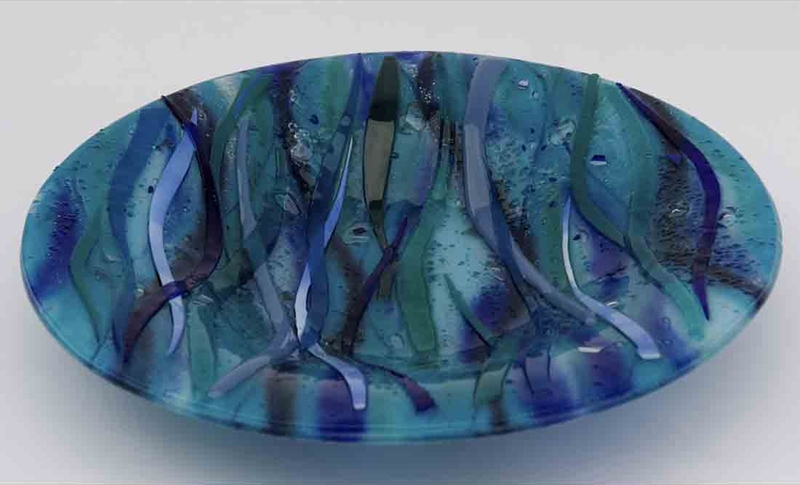 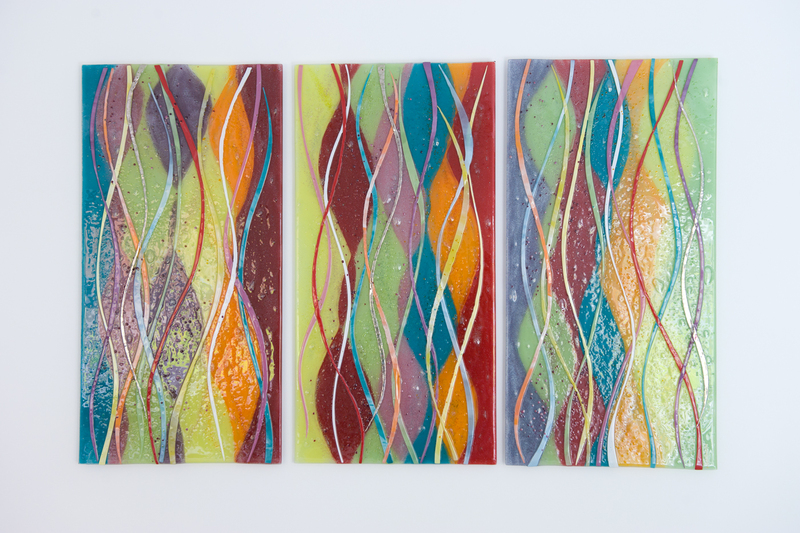 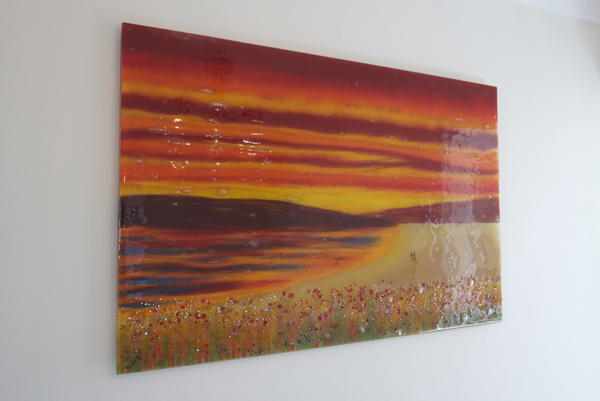 Just pick up the phone or drop us an email as soon as you can, and you’ll be well on your way to getting your hands on your very own piece of fused glass art.